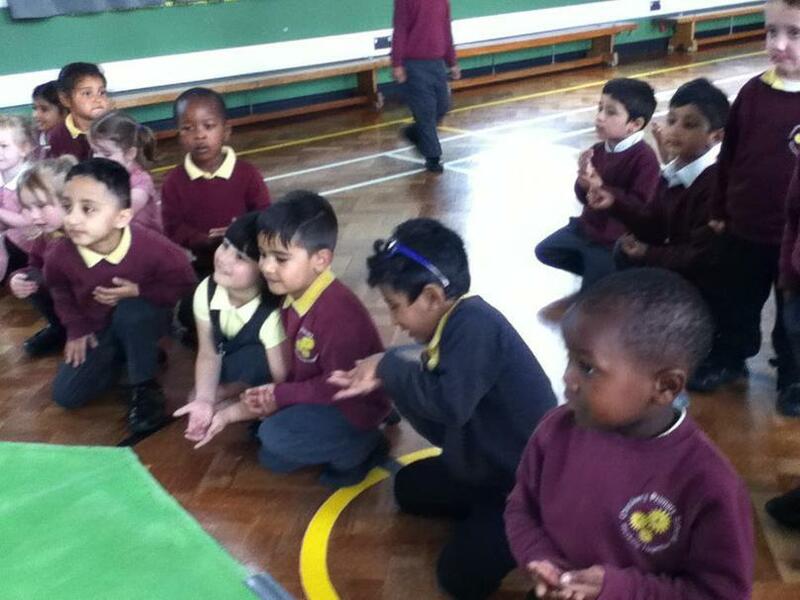 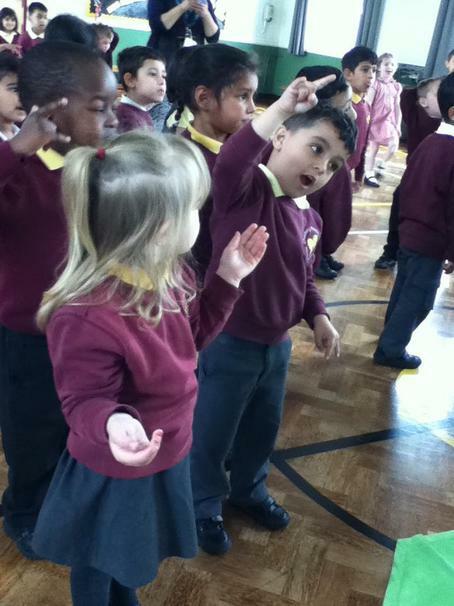 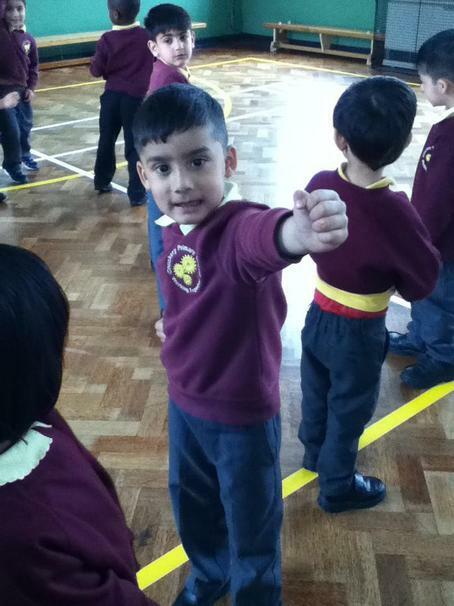 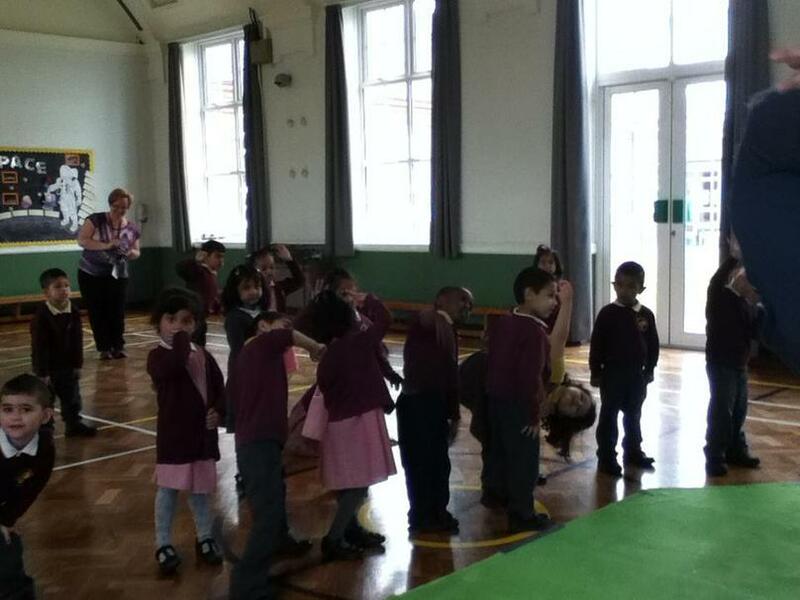 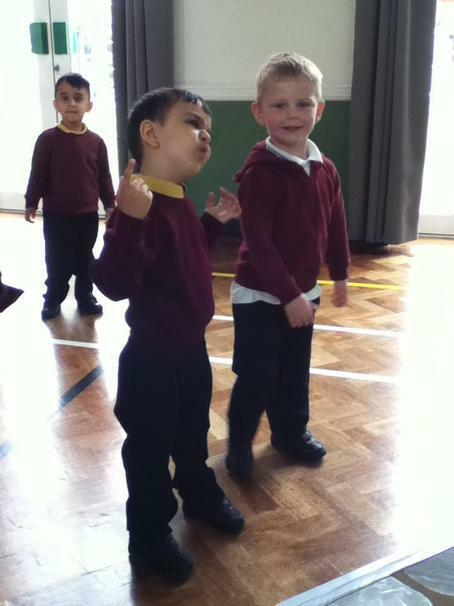 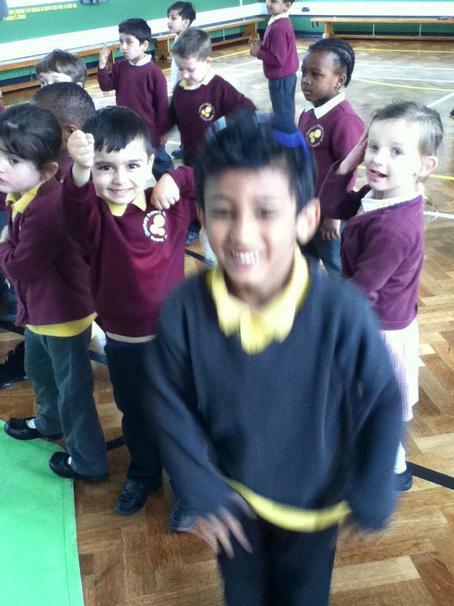 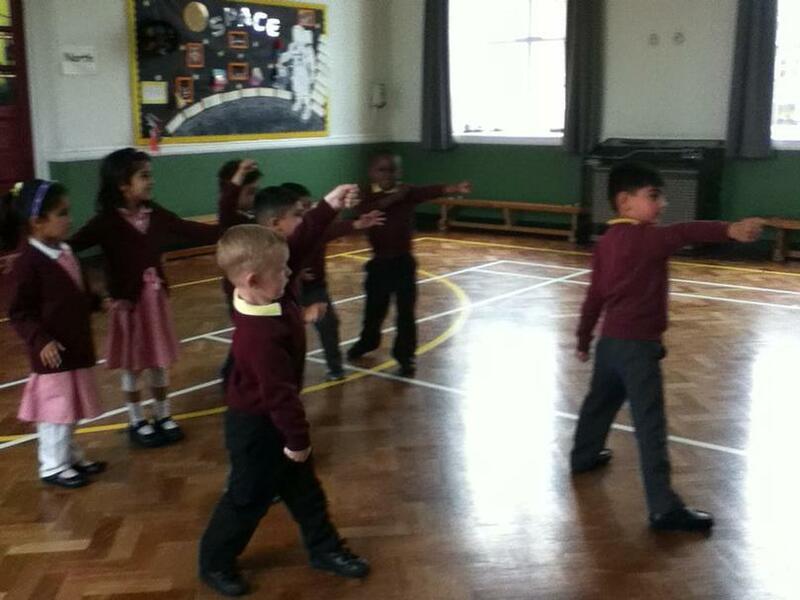 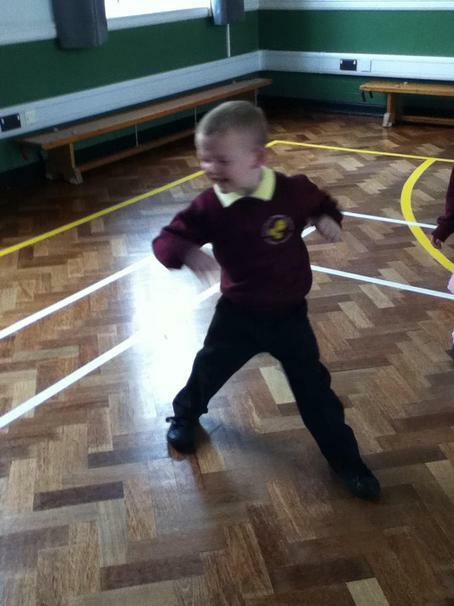 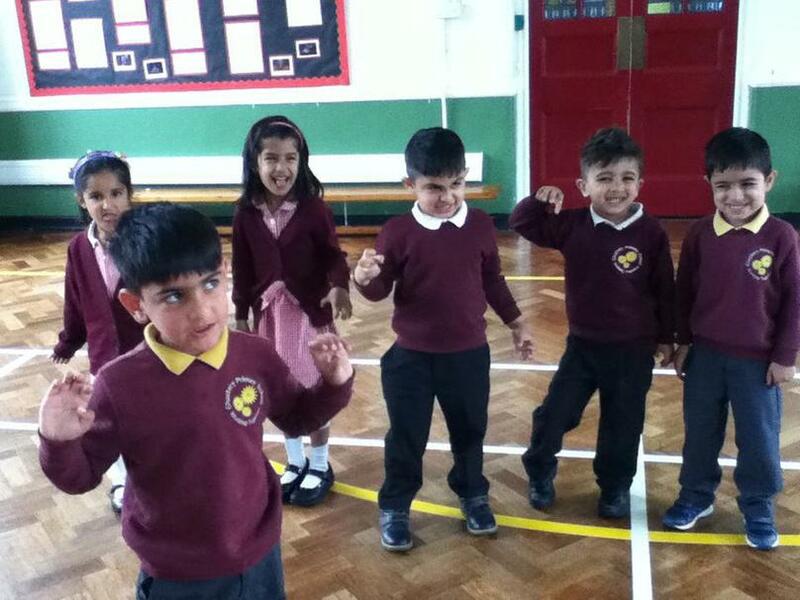 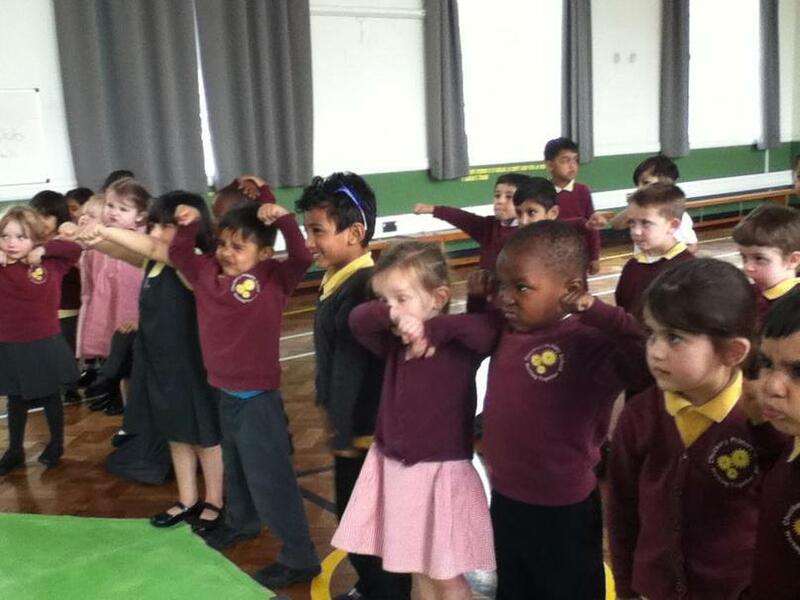 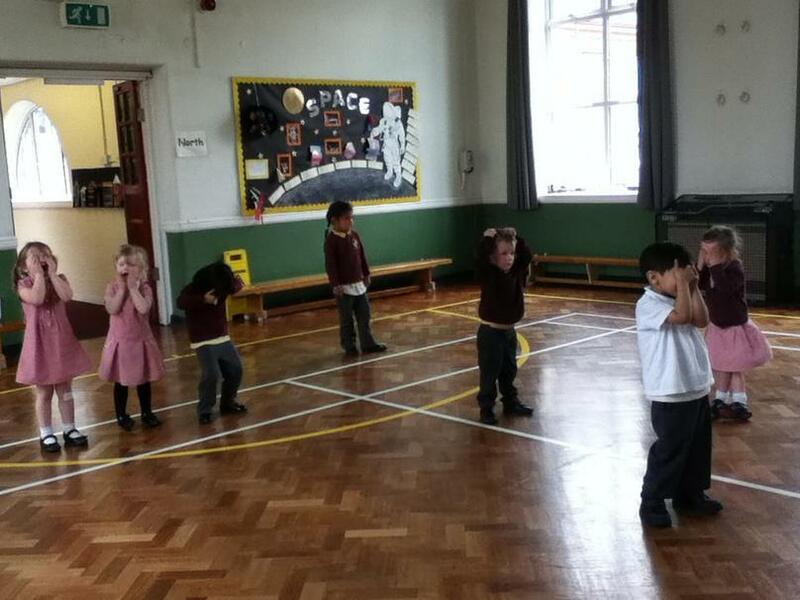 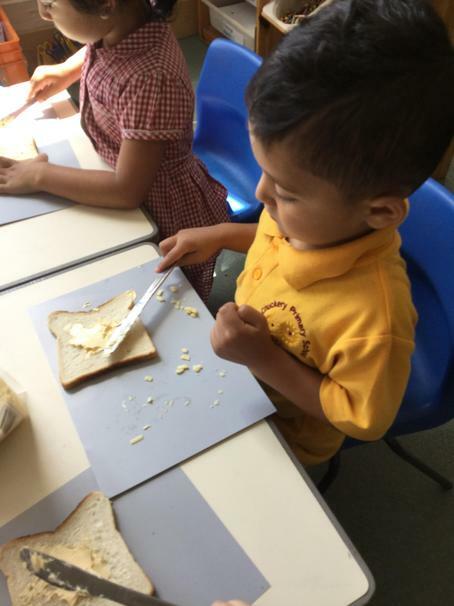 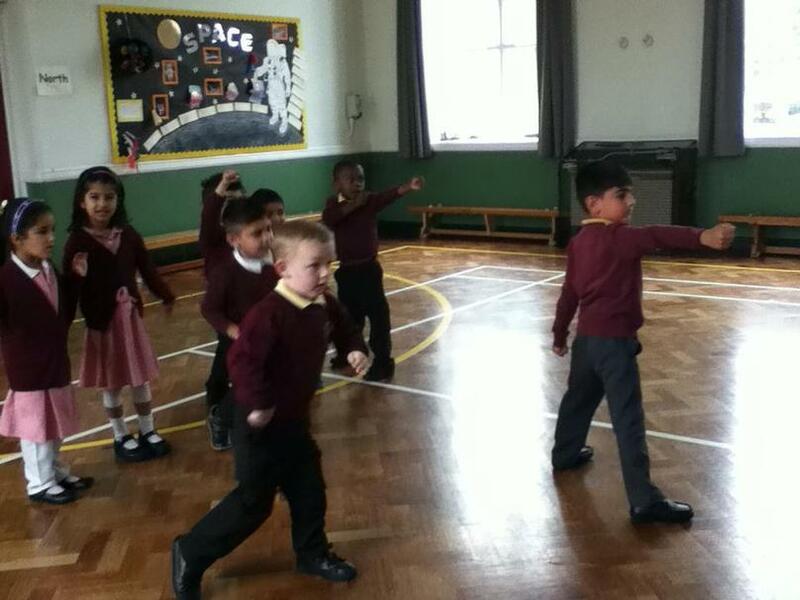 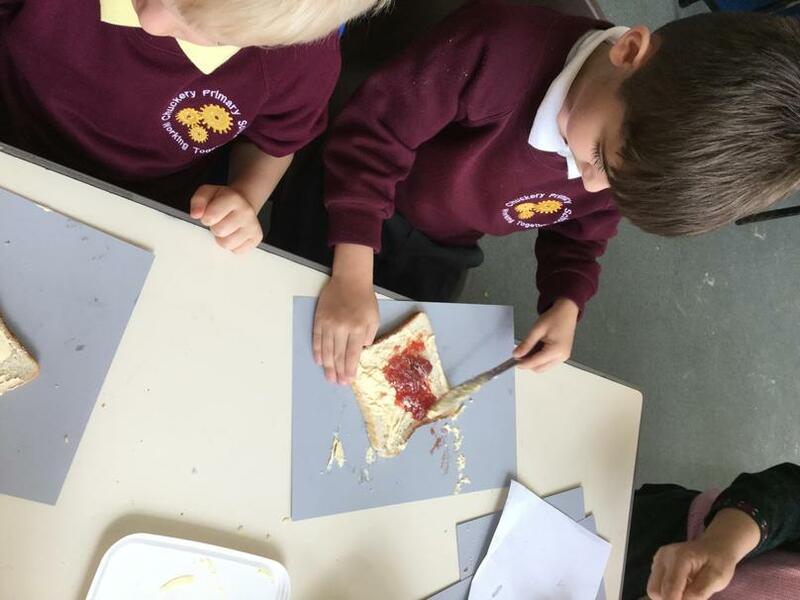 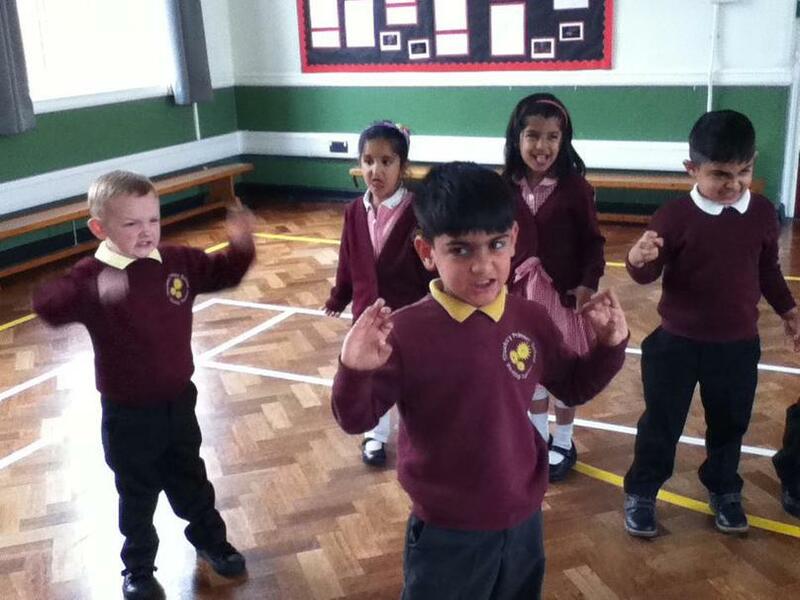 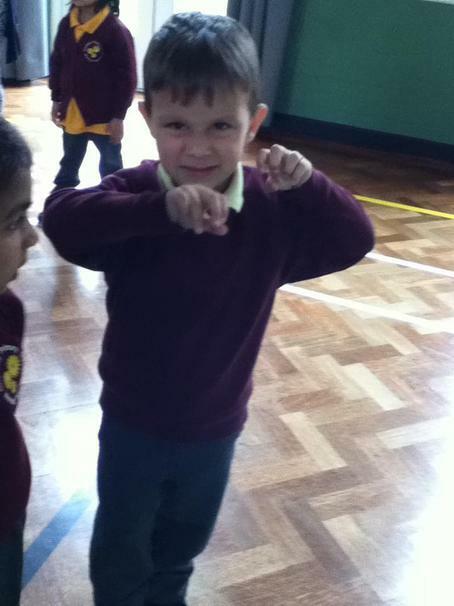 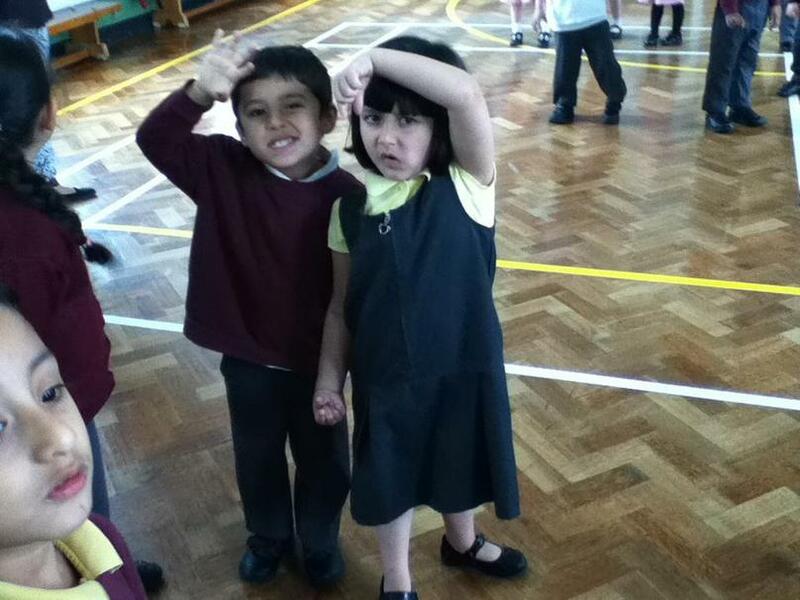 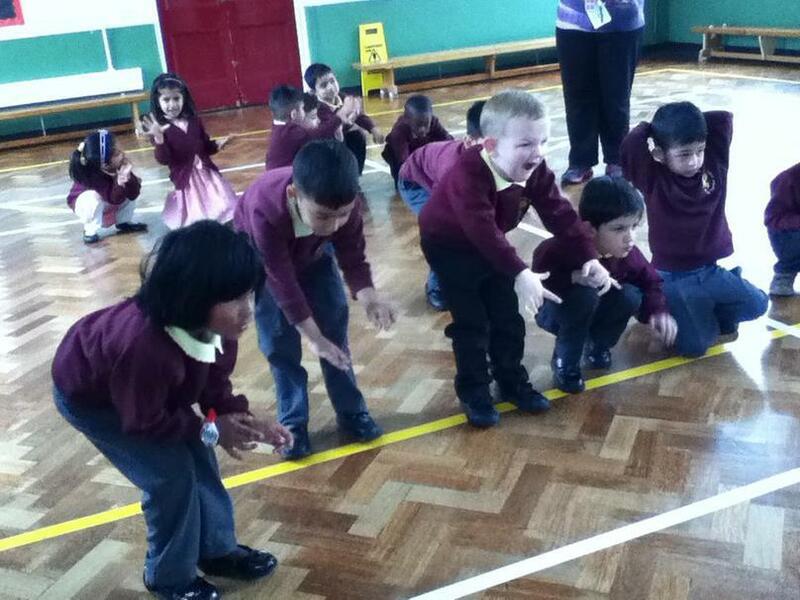 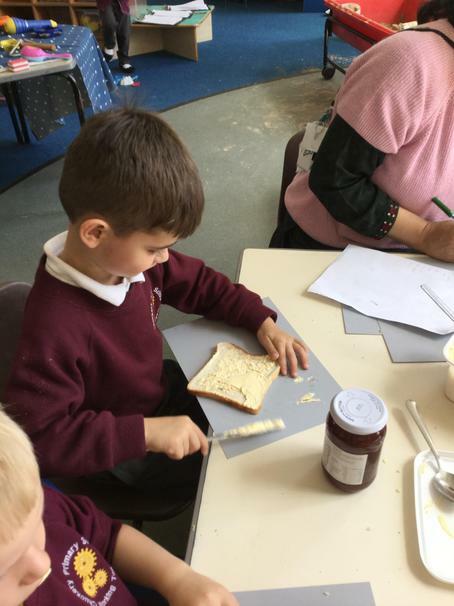 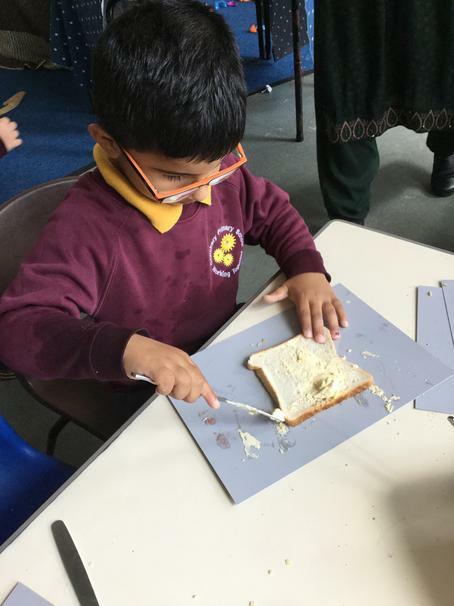 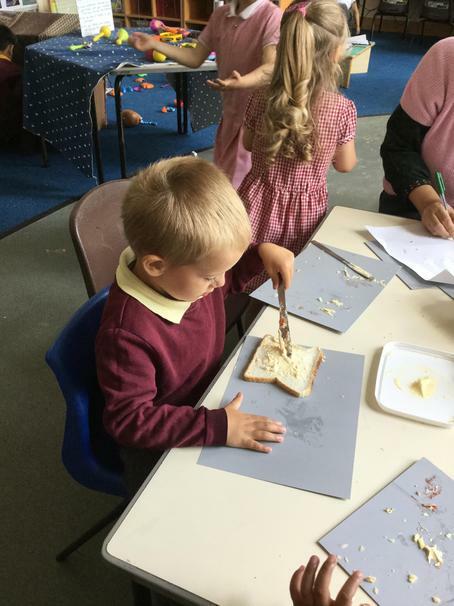 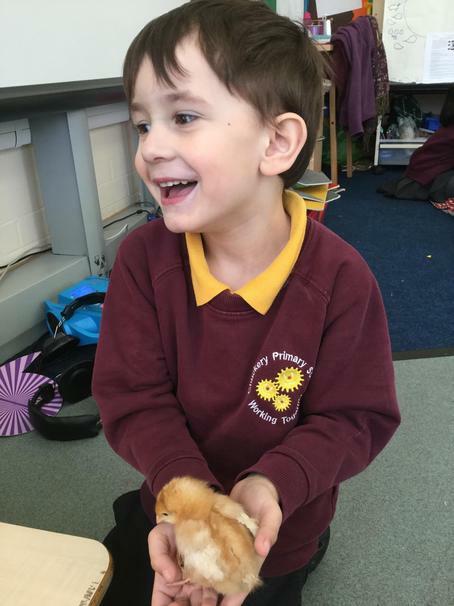 "Nursery have been learning about "The Lighthouse Keeper's Lunch"; a story where the seagulls keep eating his lunch! 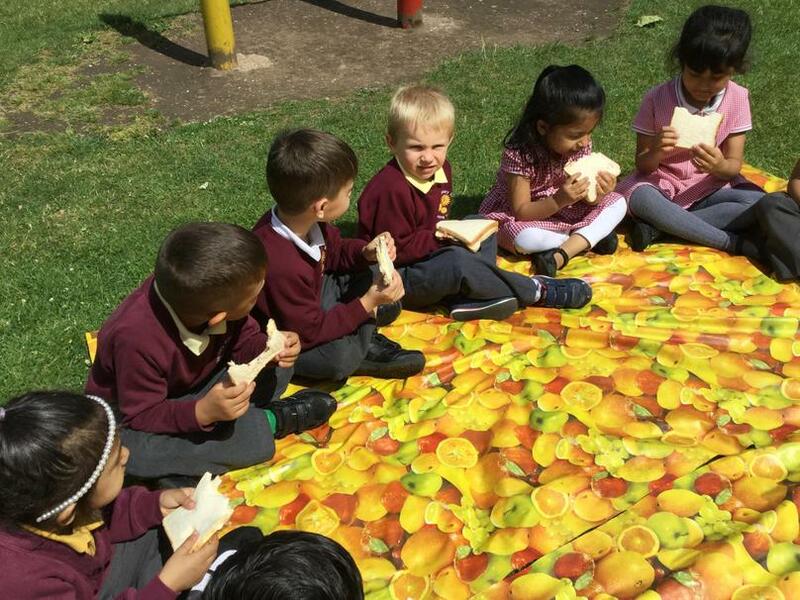 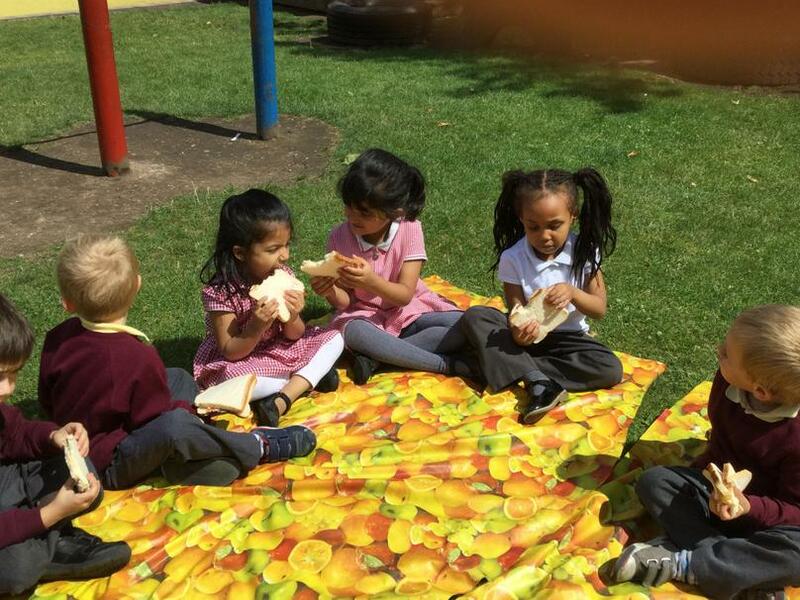 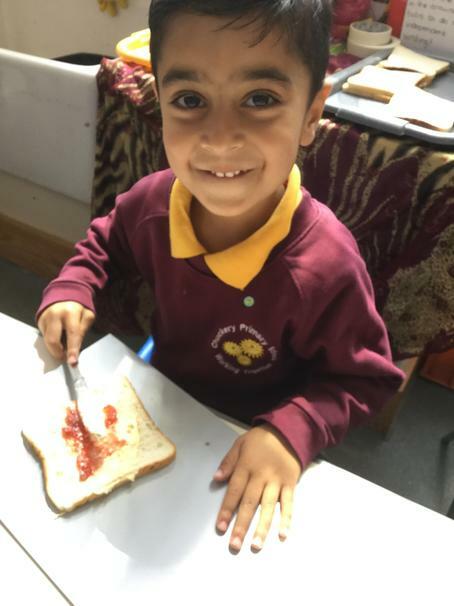 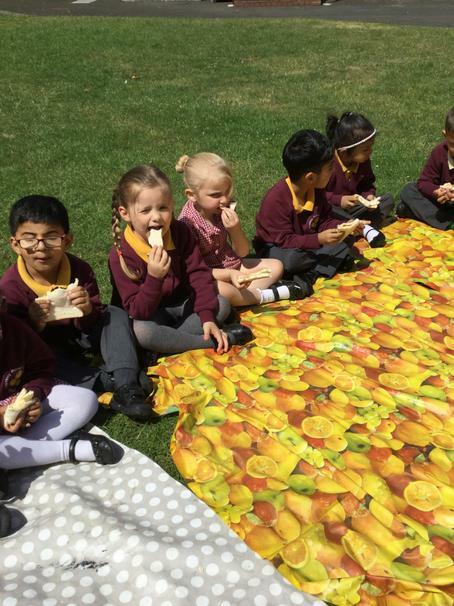 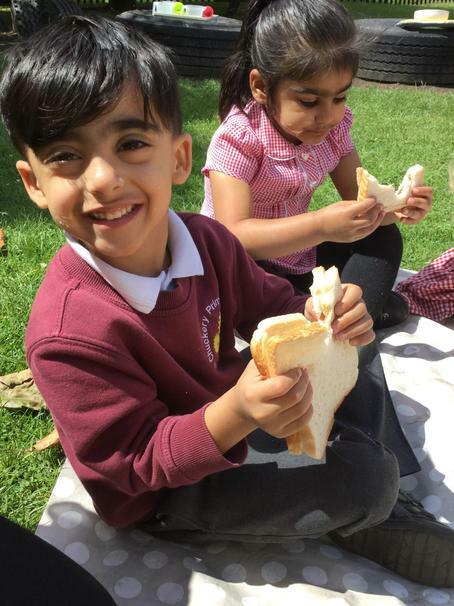 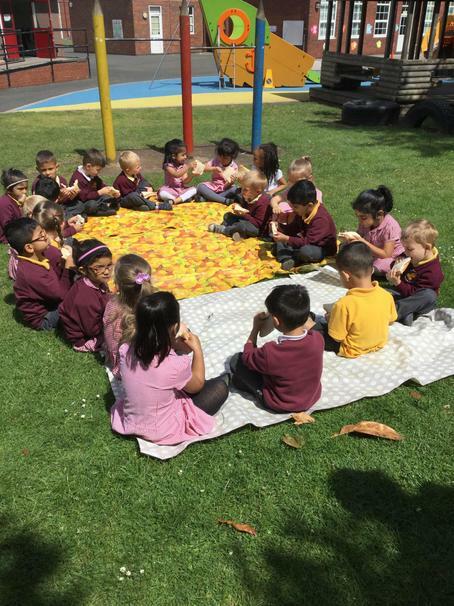 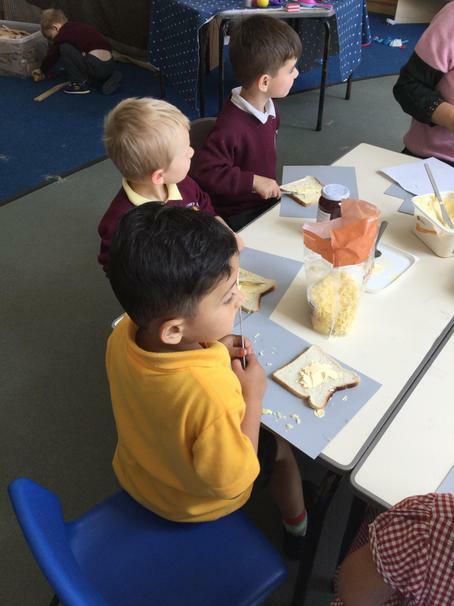 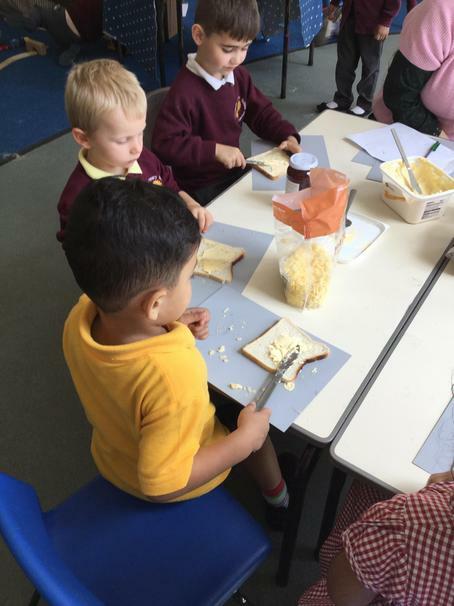 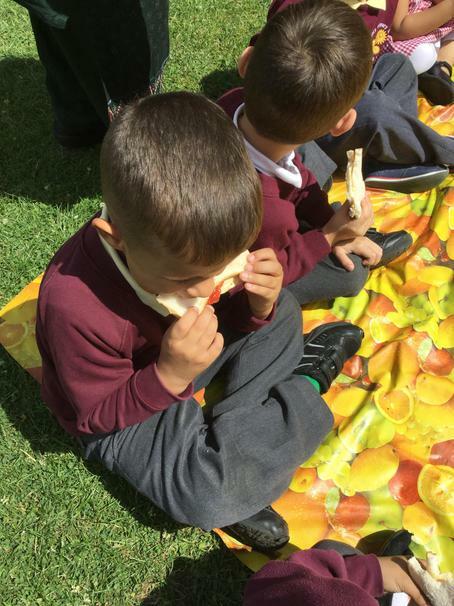 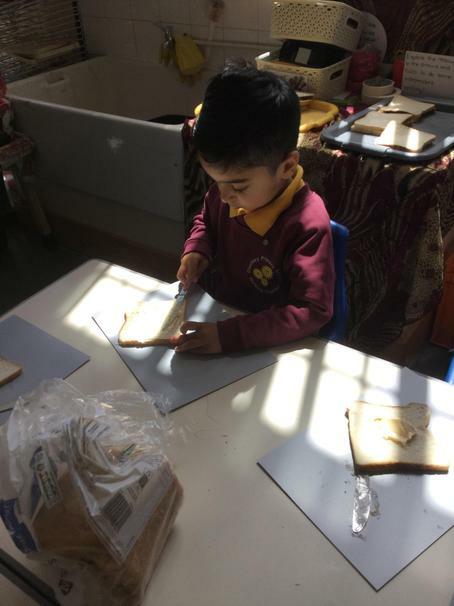 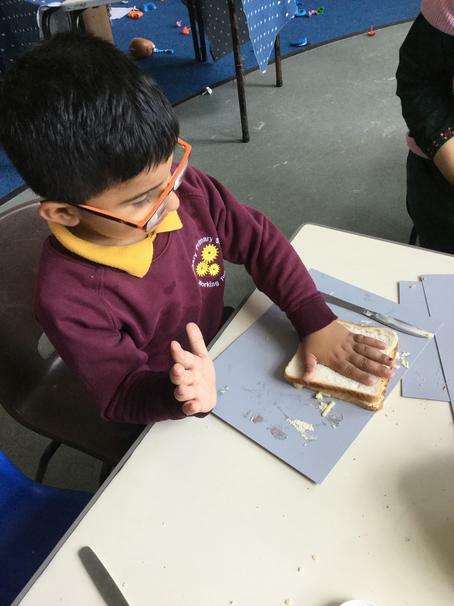 We enjoyed making our own sandwiches and having a picnic today...thankfully no seagulls stole our lunch!" 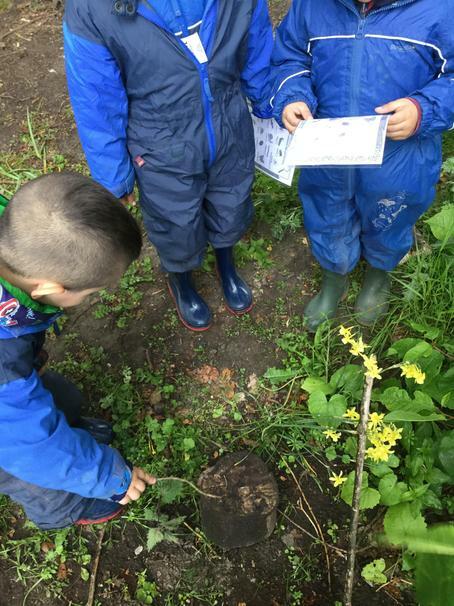 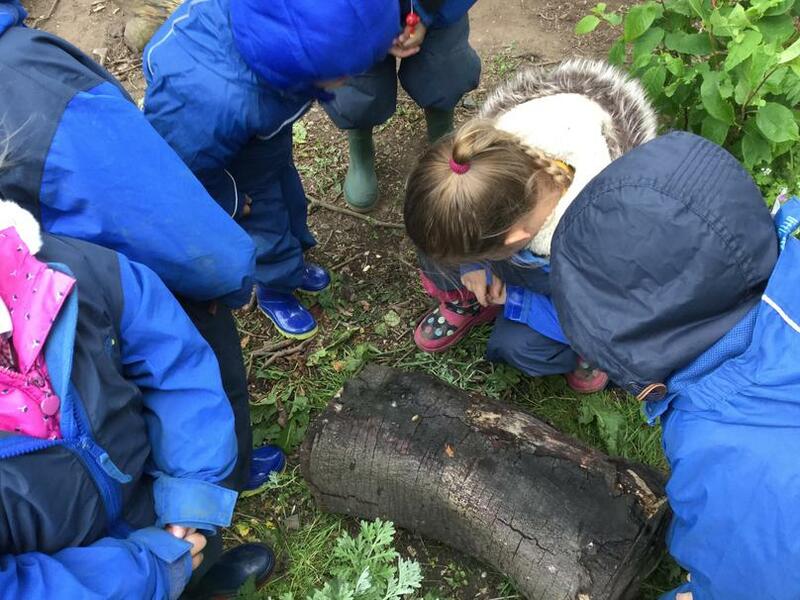 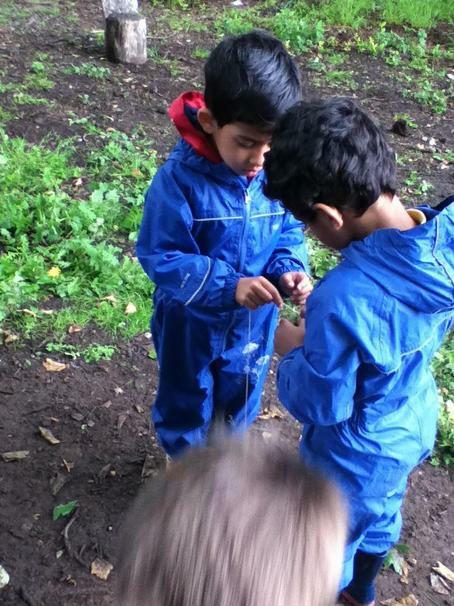 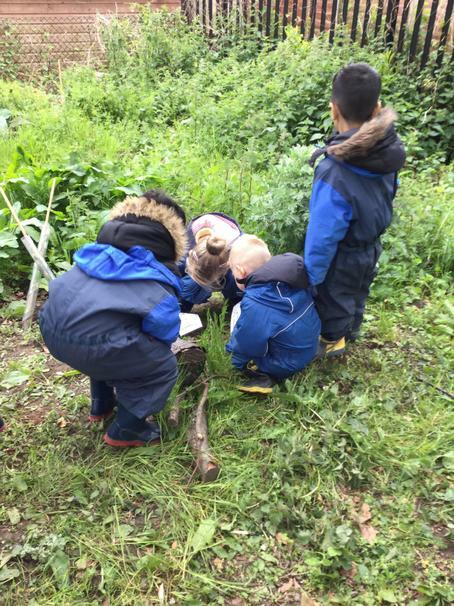 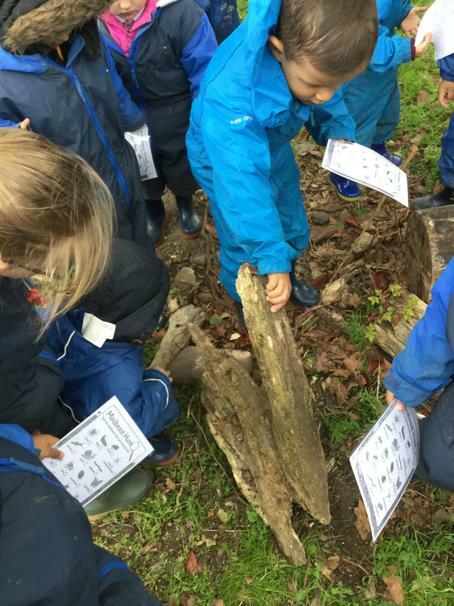 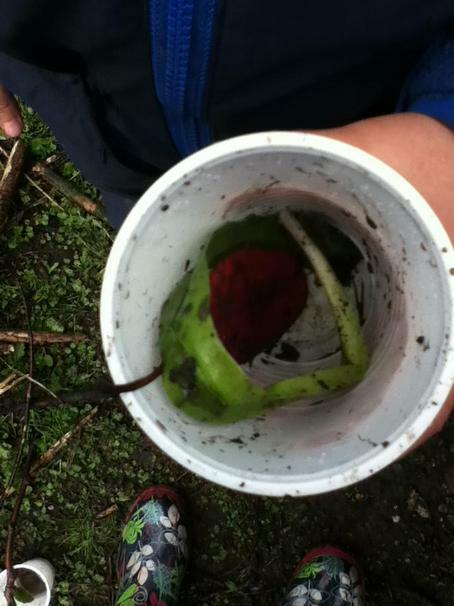 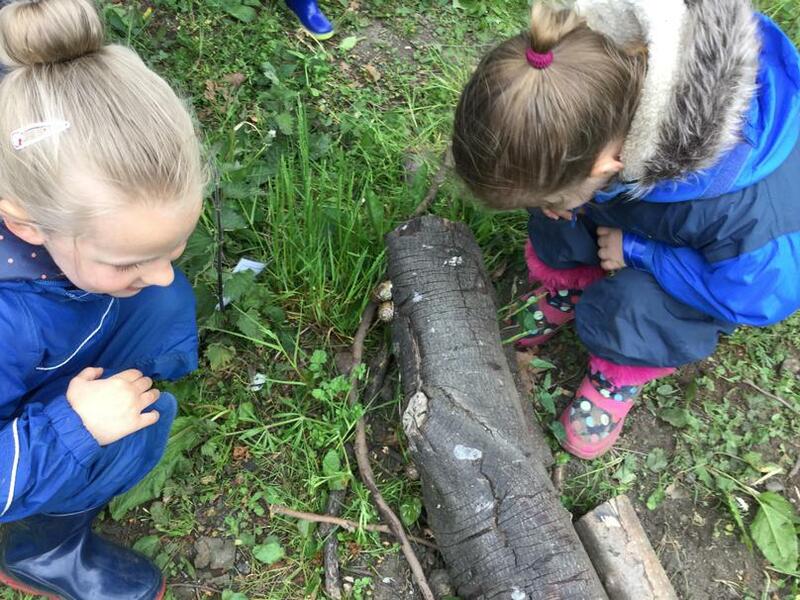 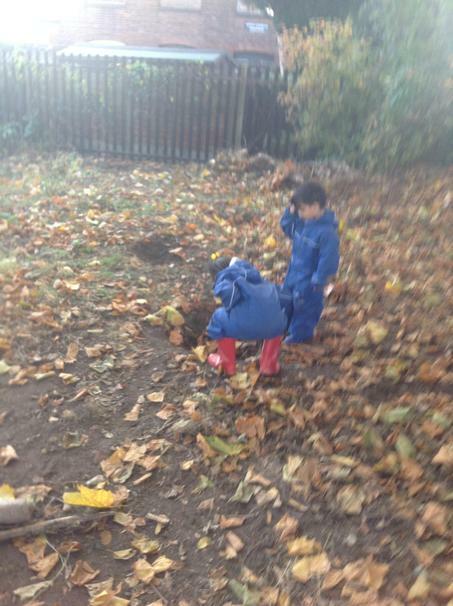 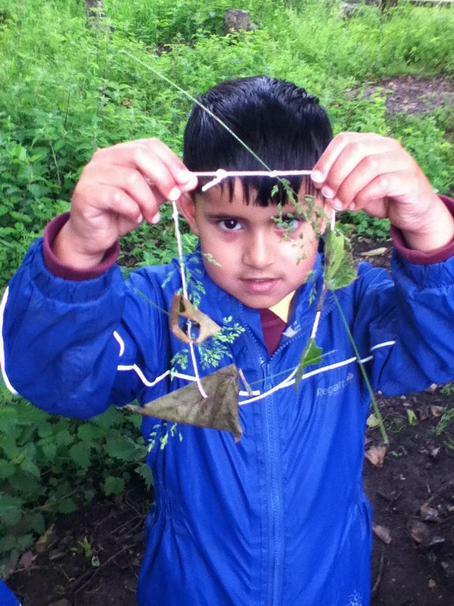 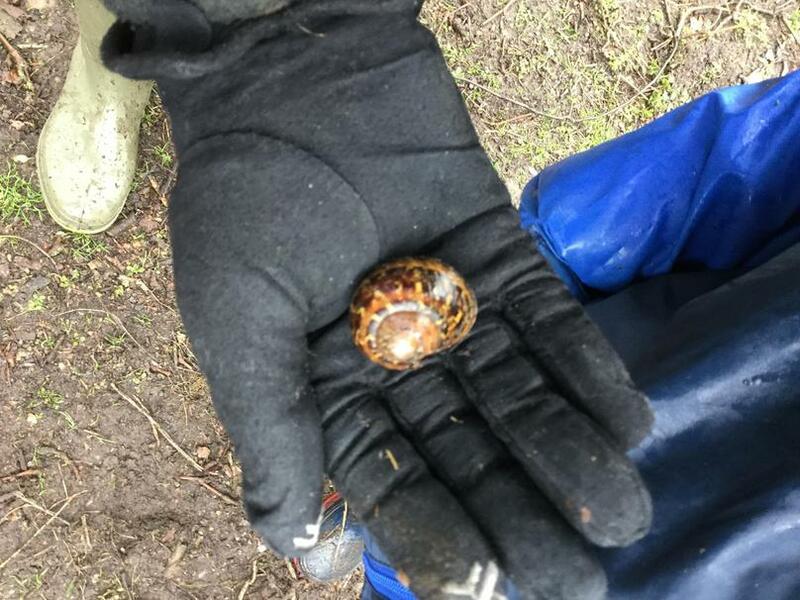 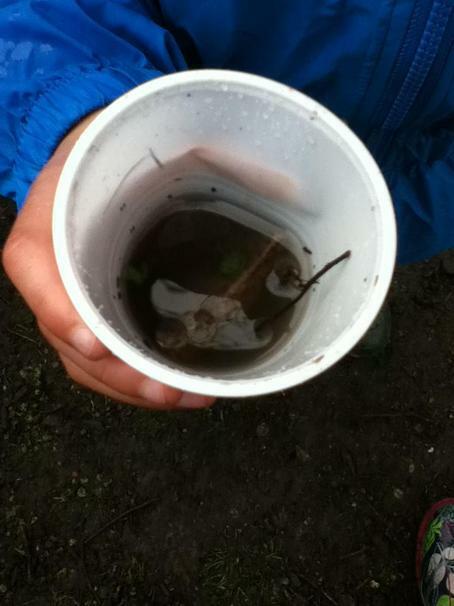 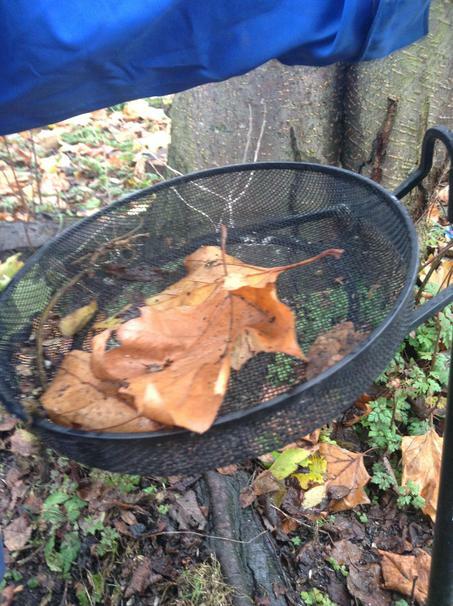 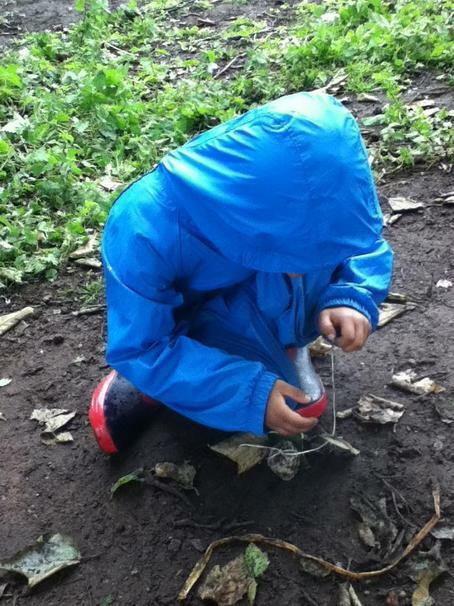 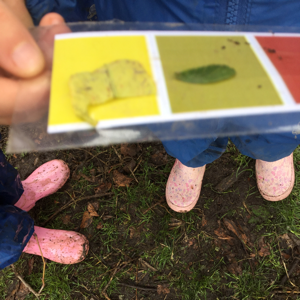 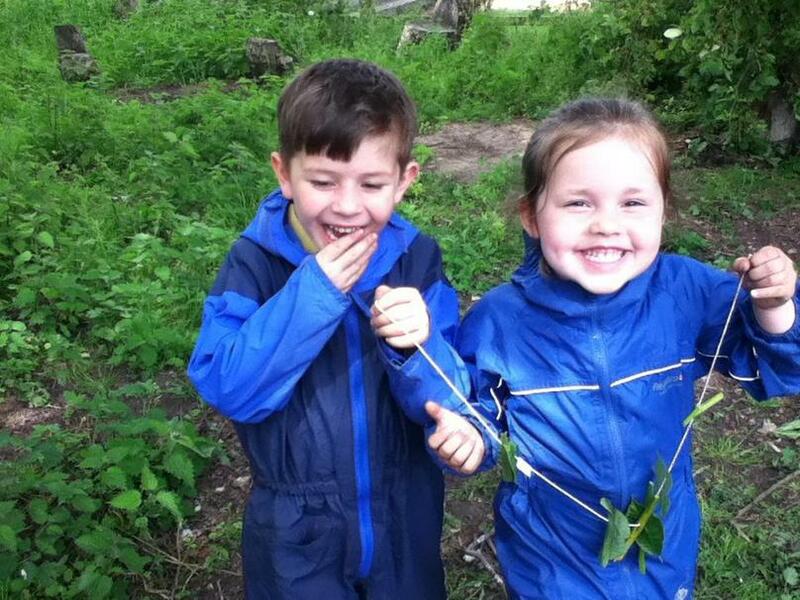 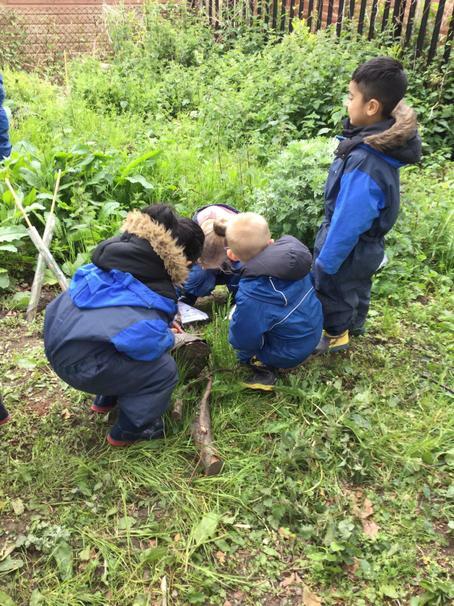 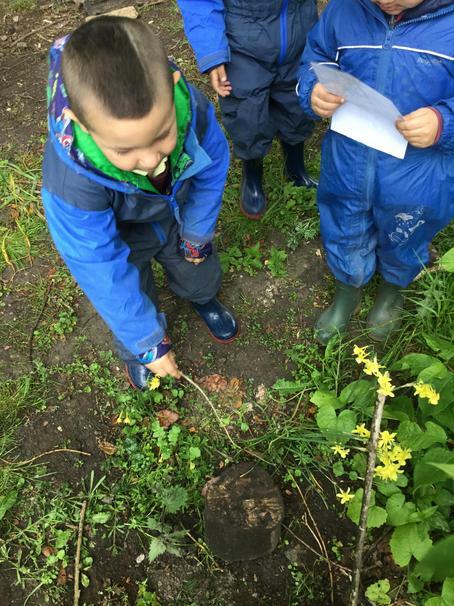 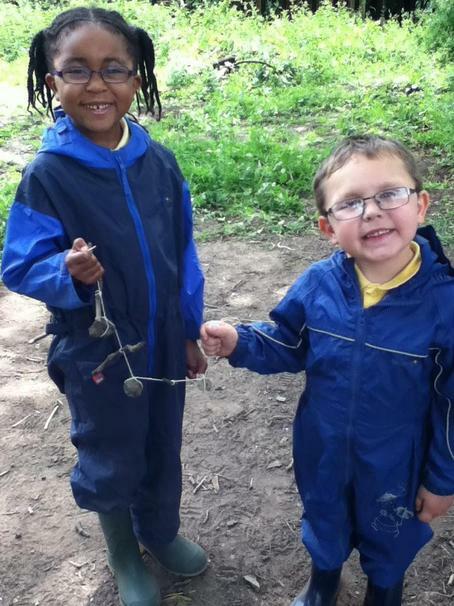 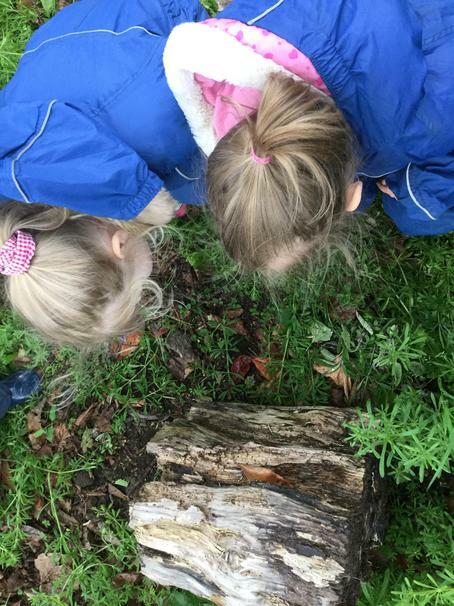 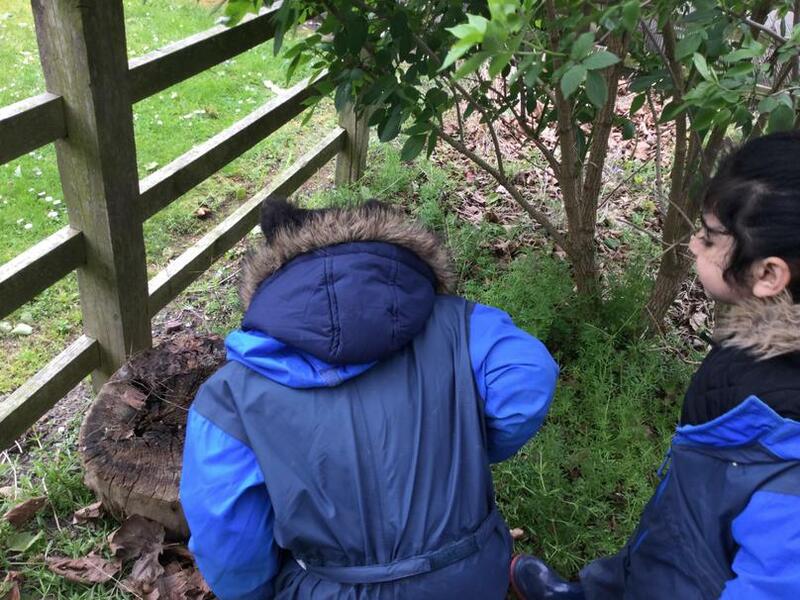 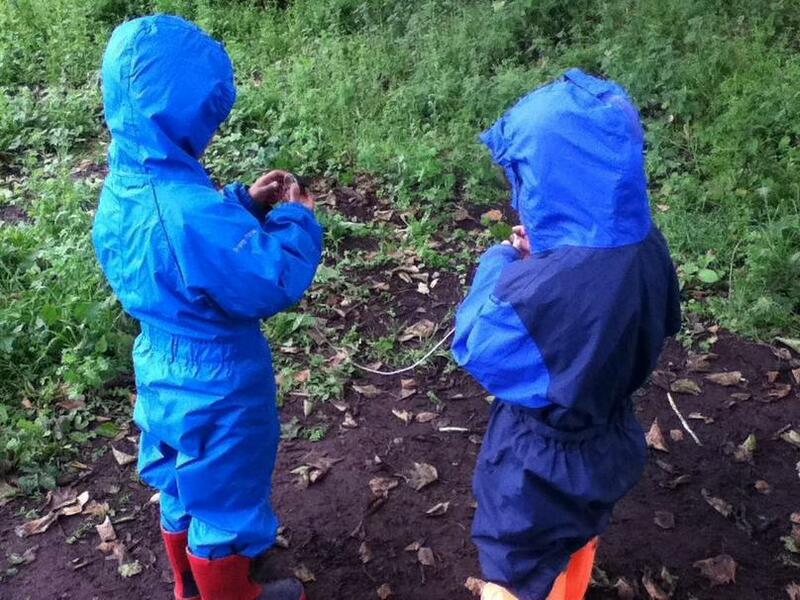 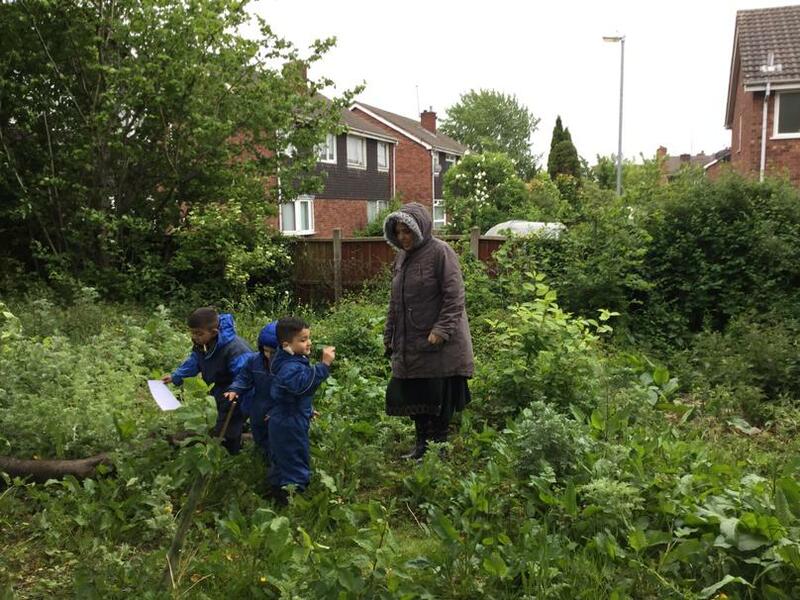 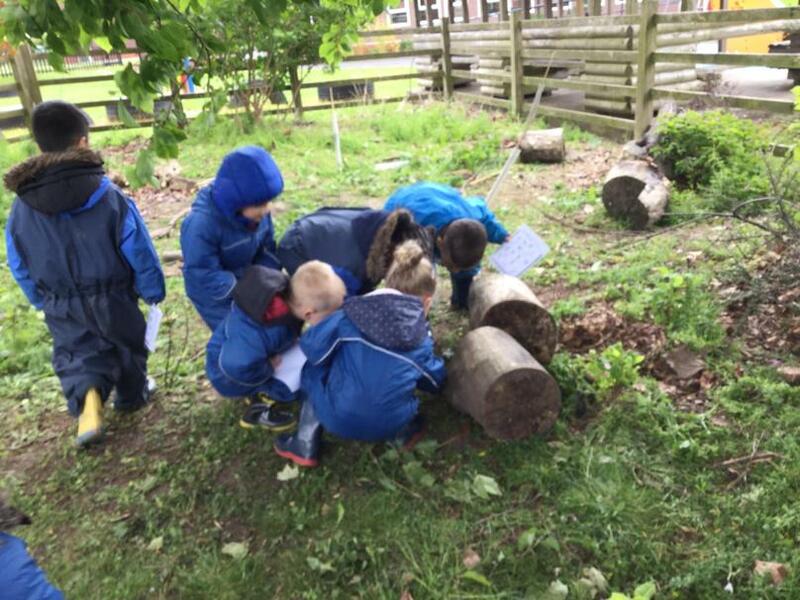 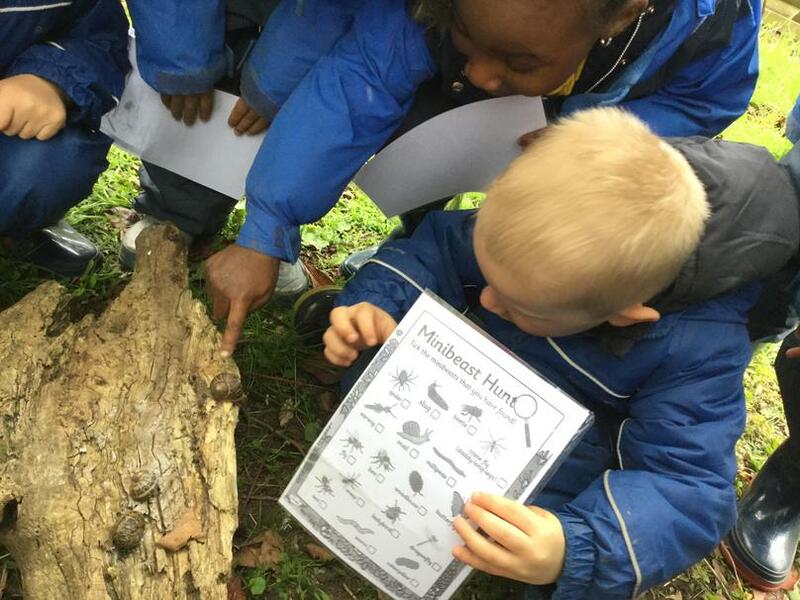 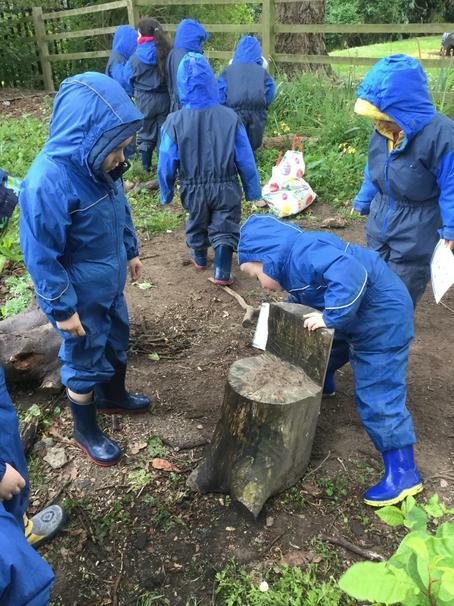 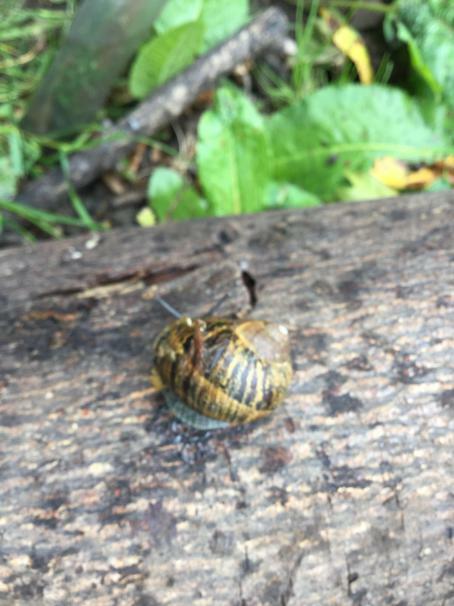 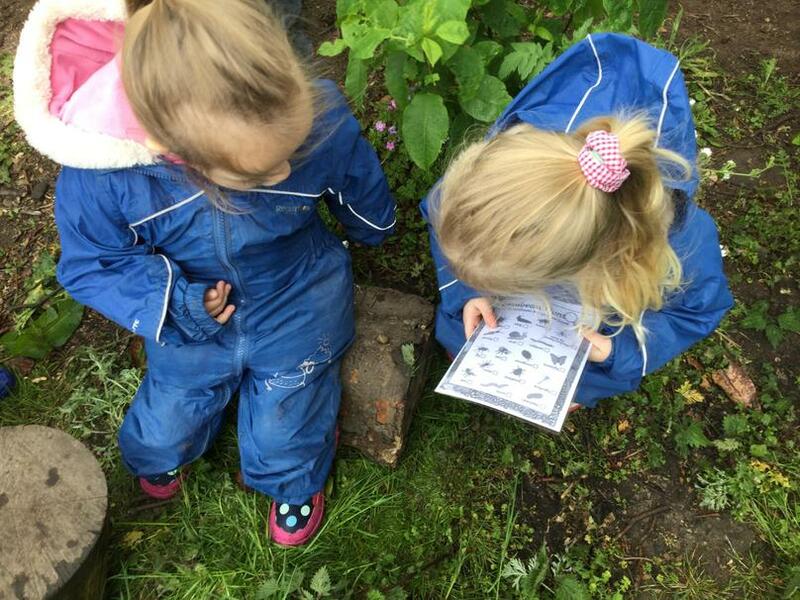 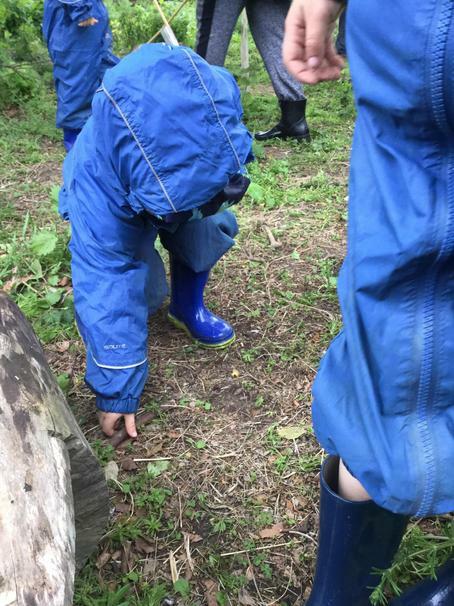 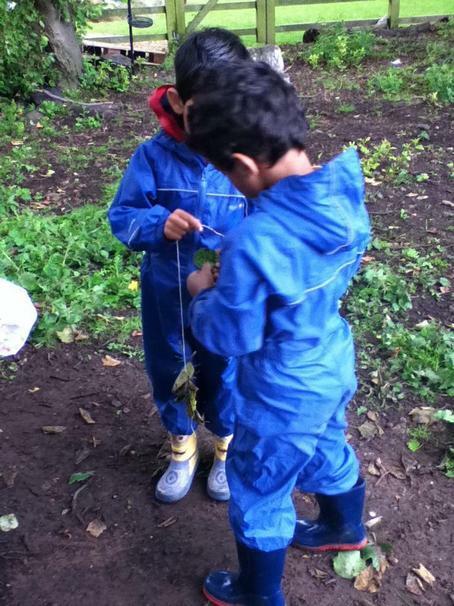 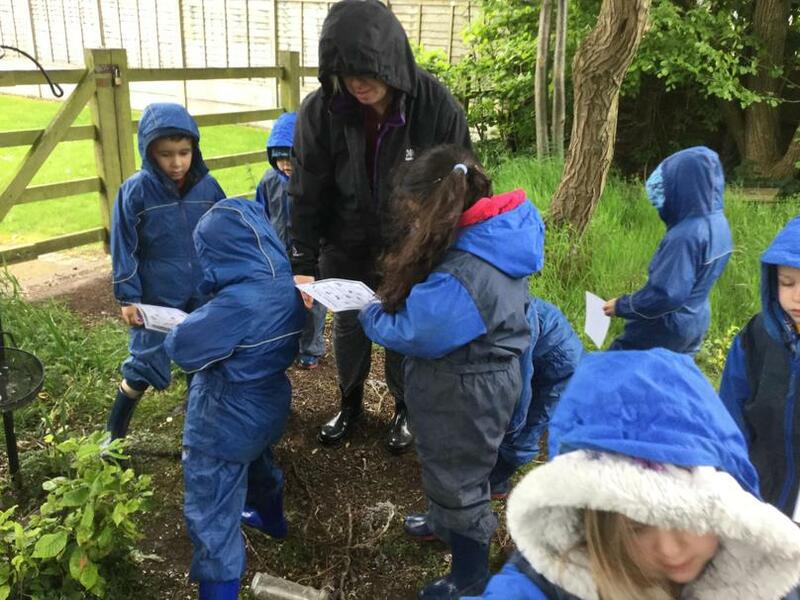 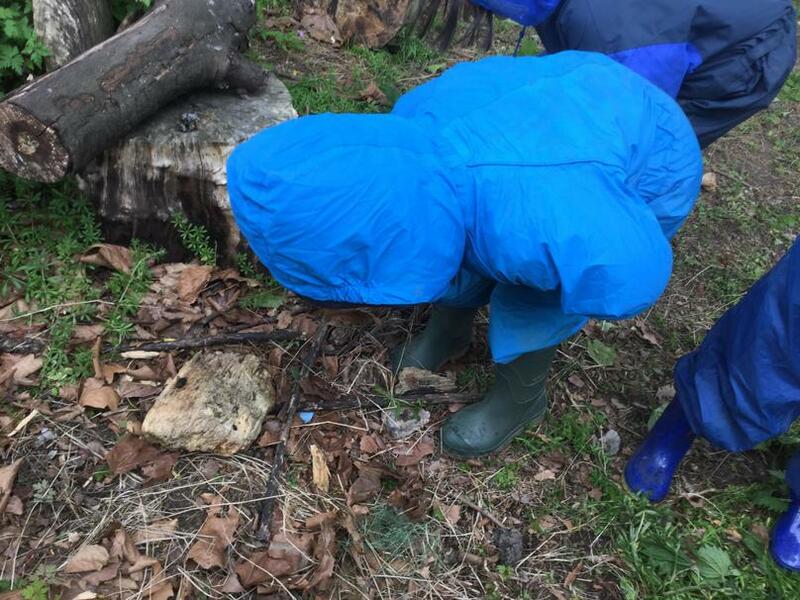 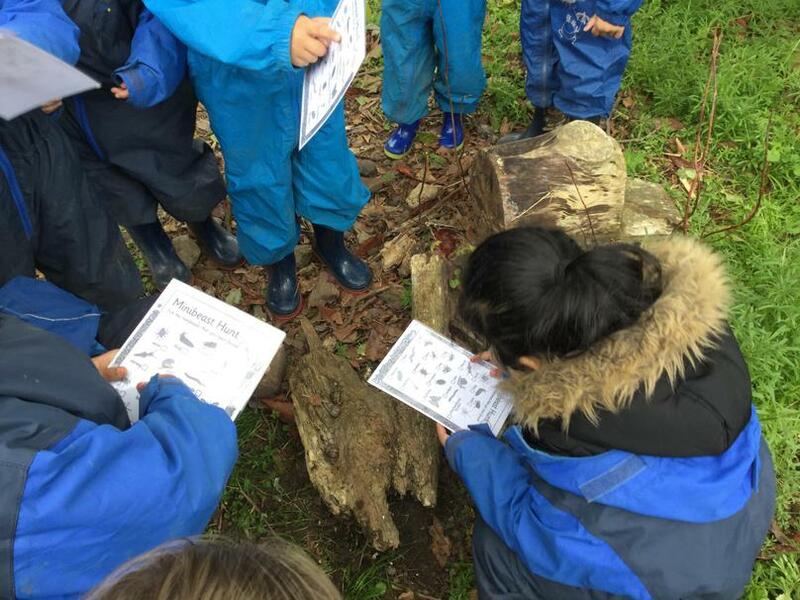 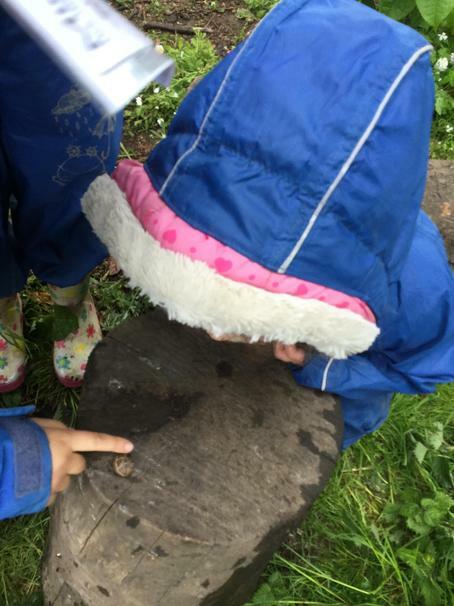 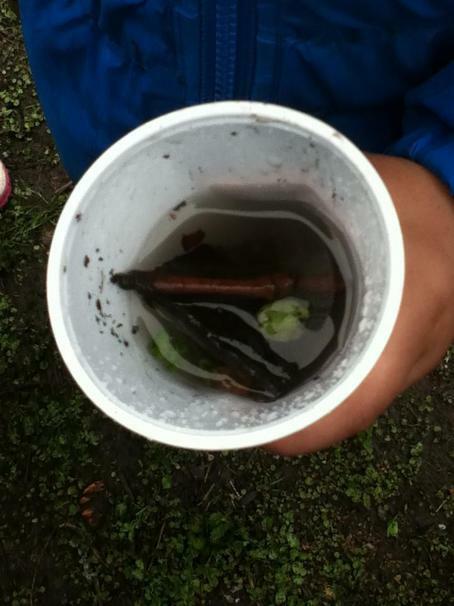 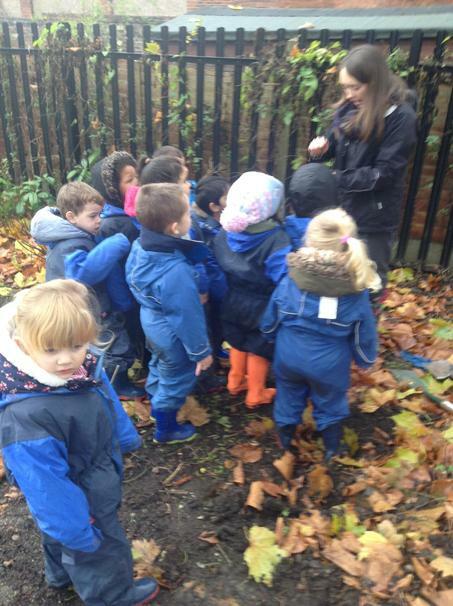 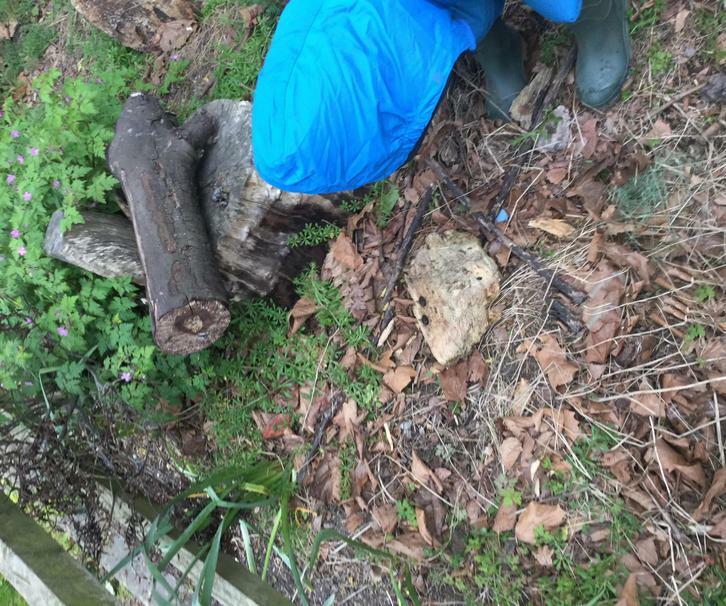 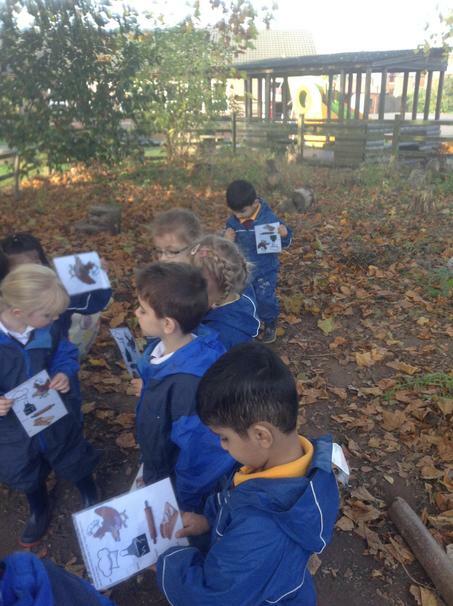 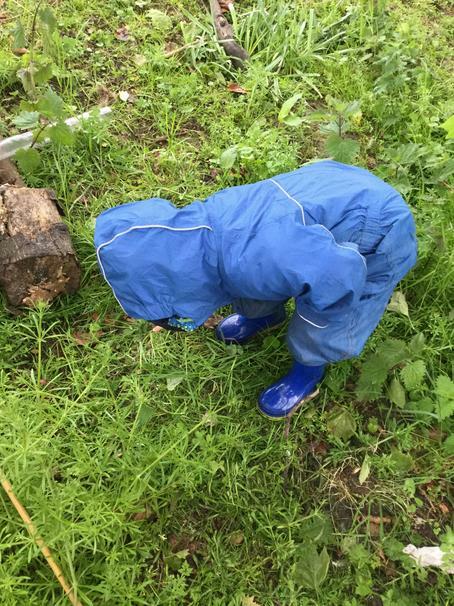 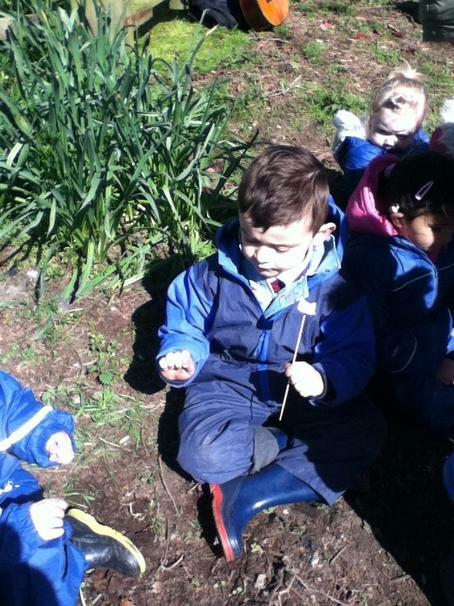 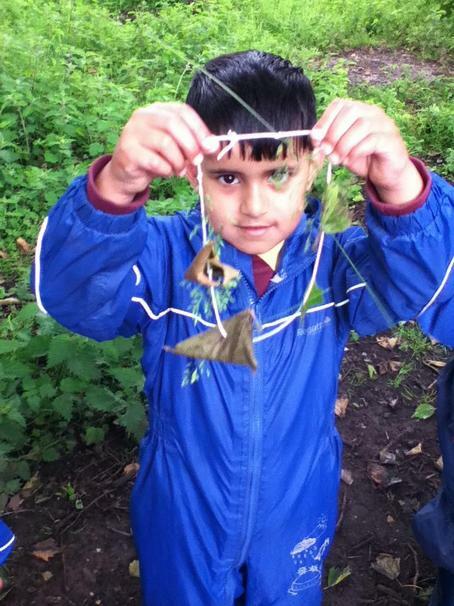 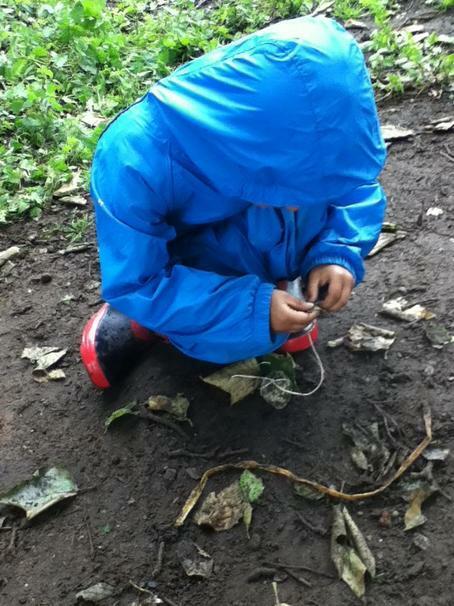 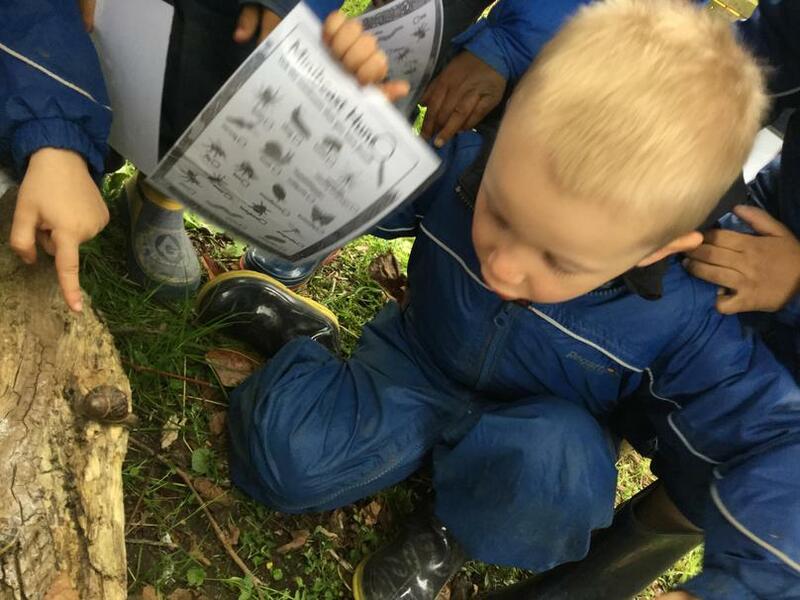 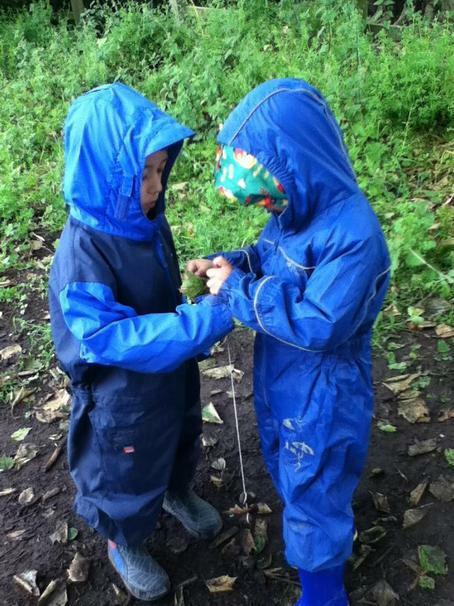 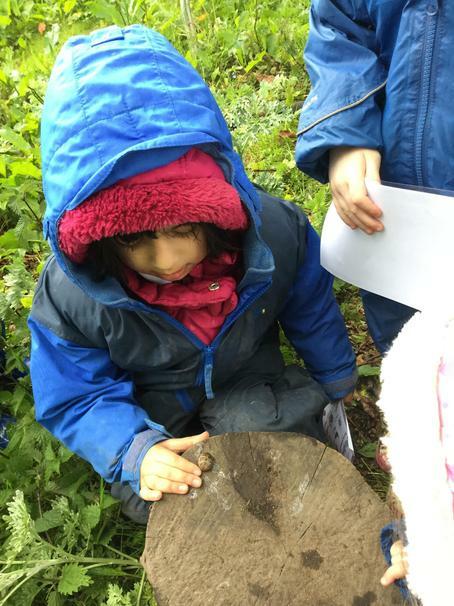 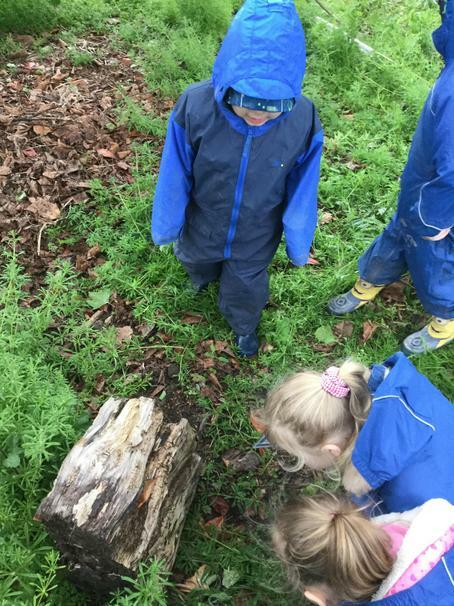 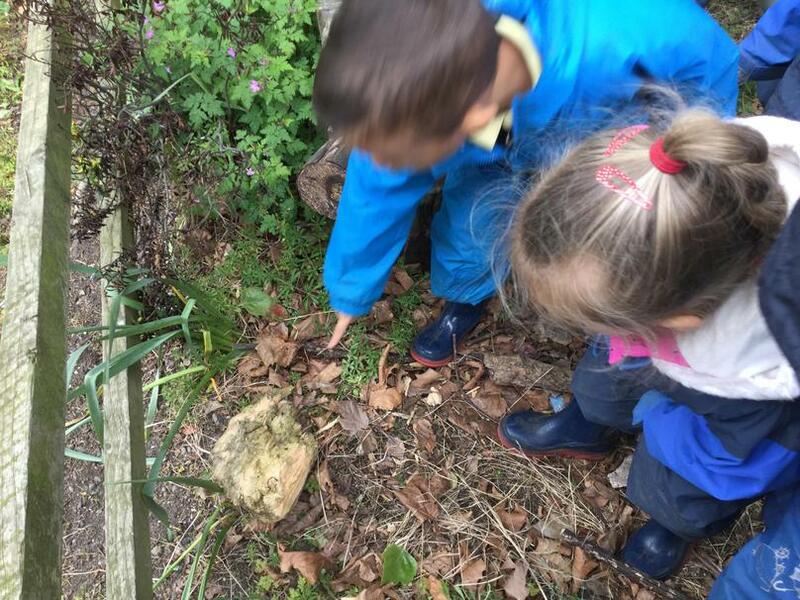 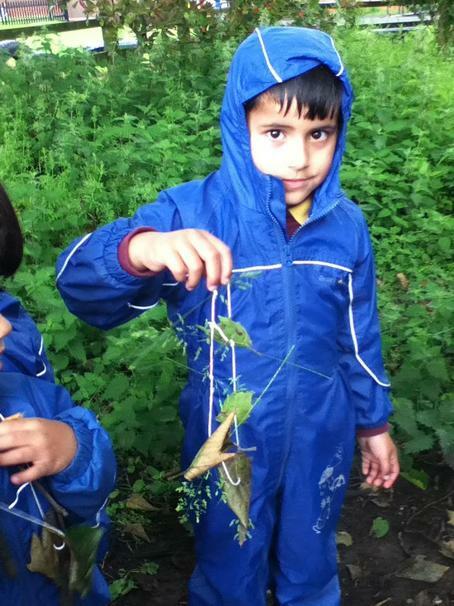 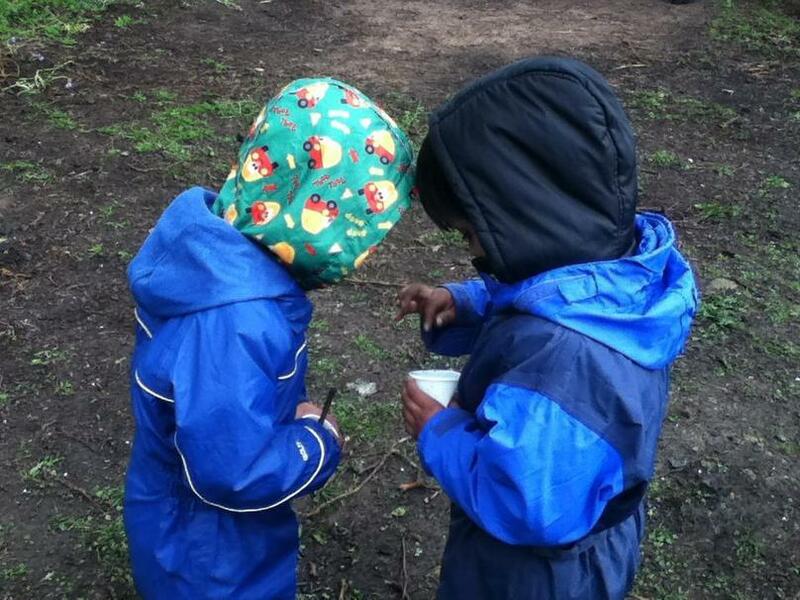 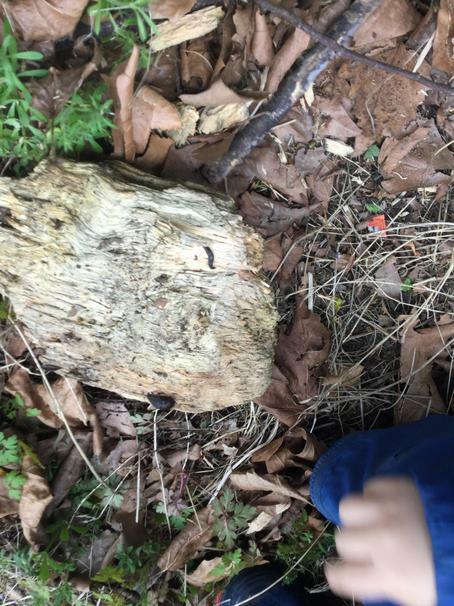 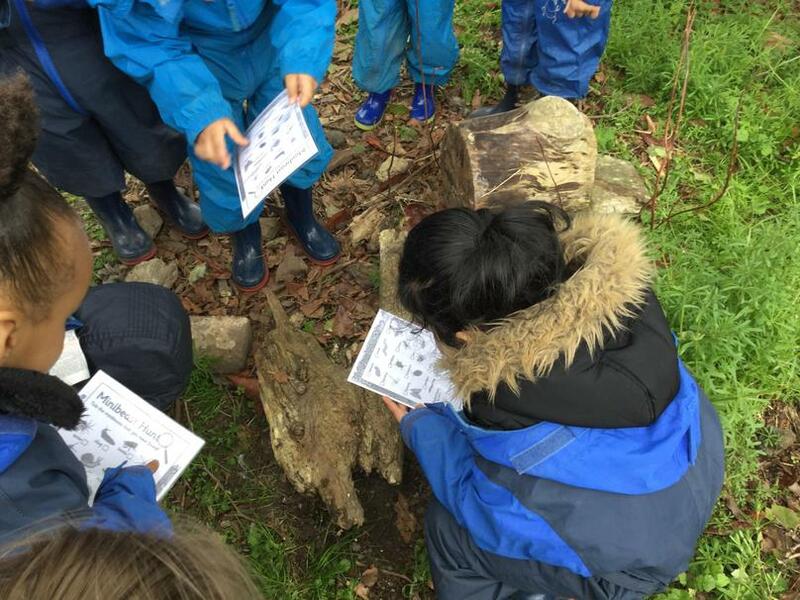 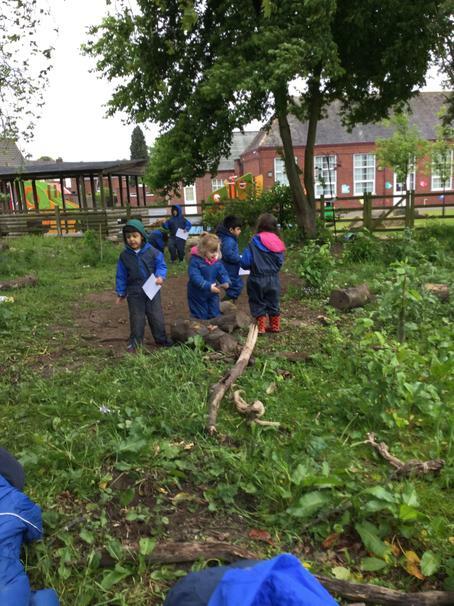 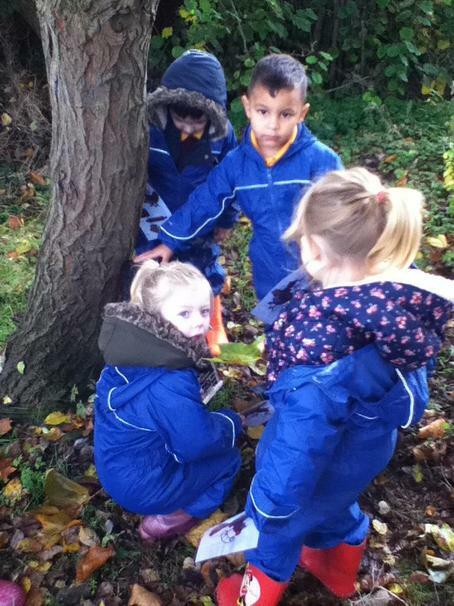 Nursery had lots of fun exploring the Forest School area looking for minibeasts! 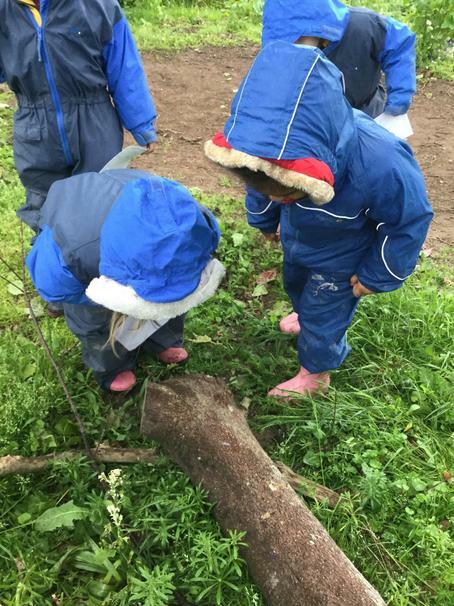 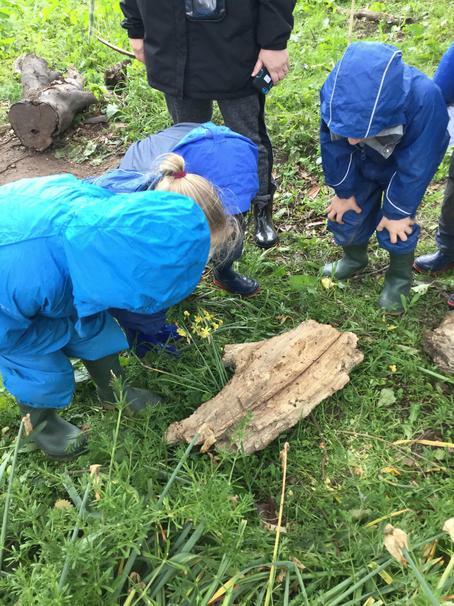 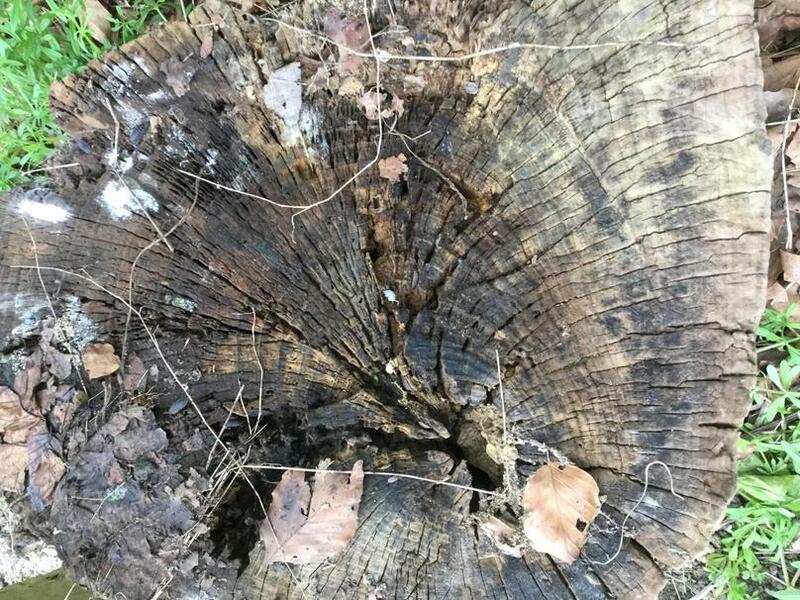 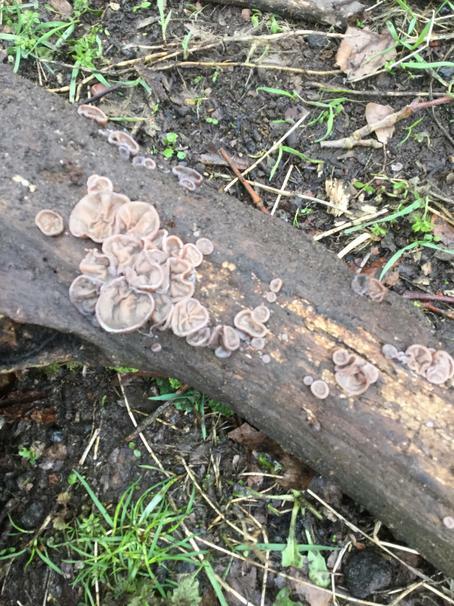 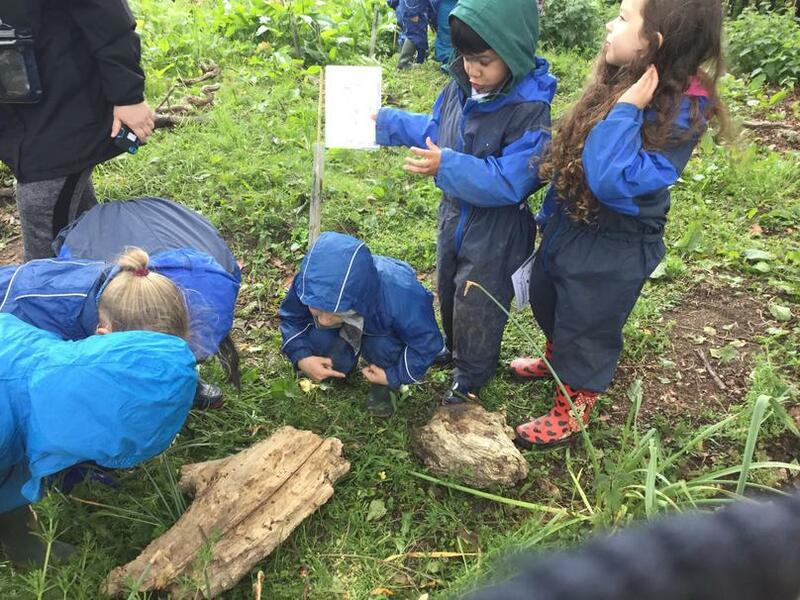 Why don't you ask us about what we found! 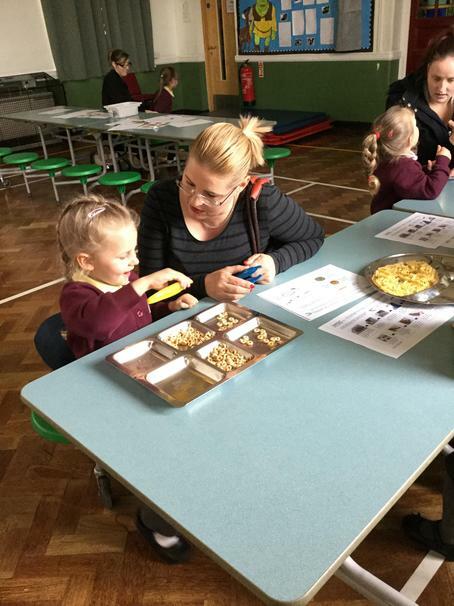 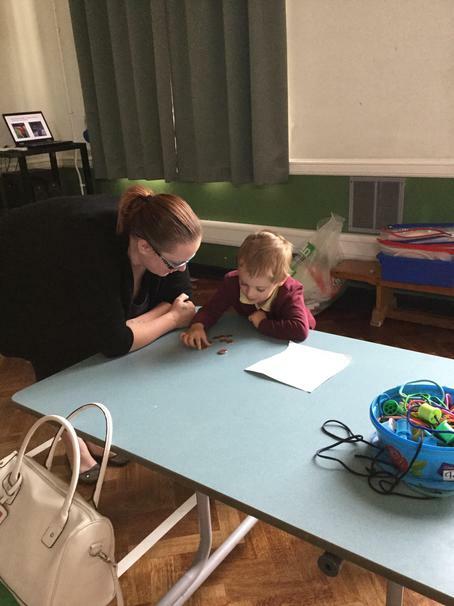 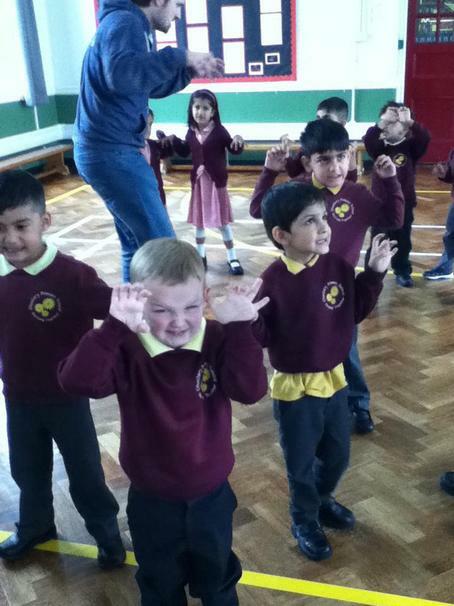 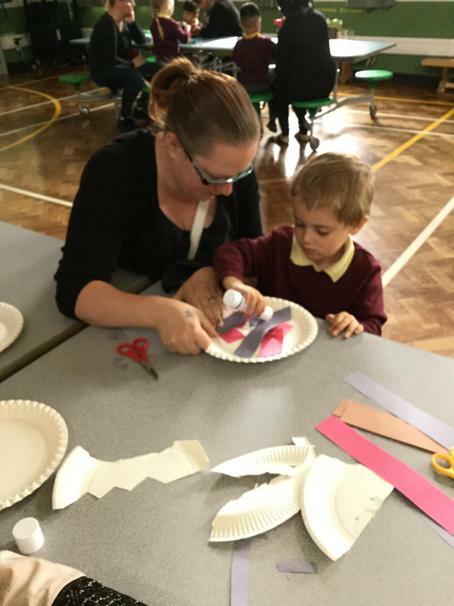 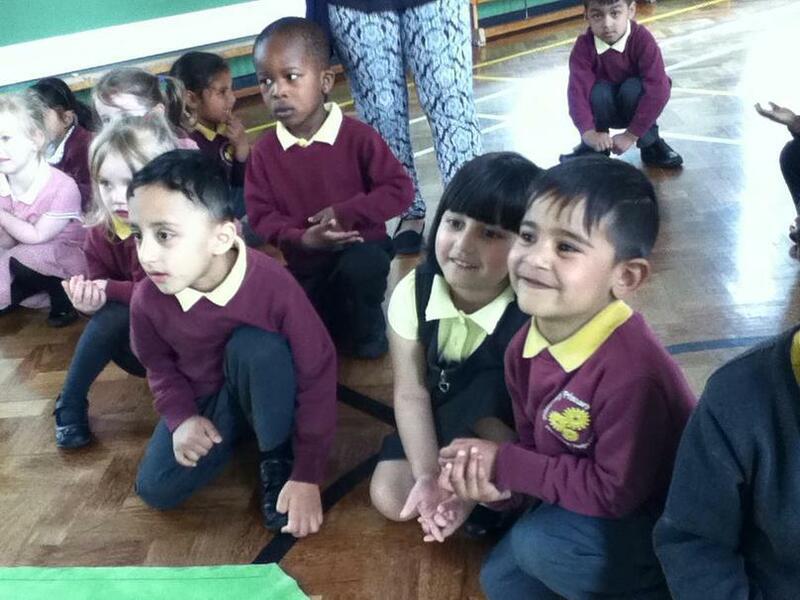 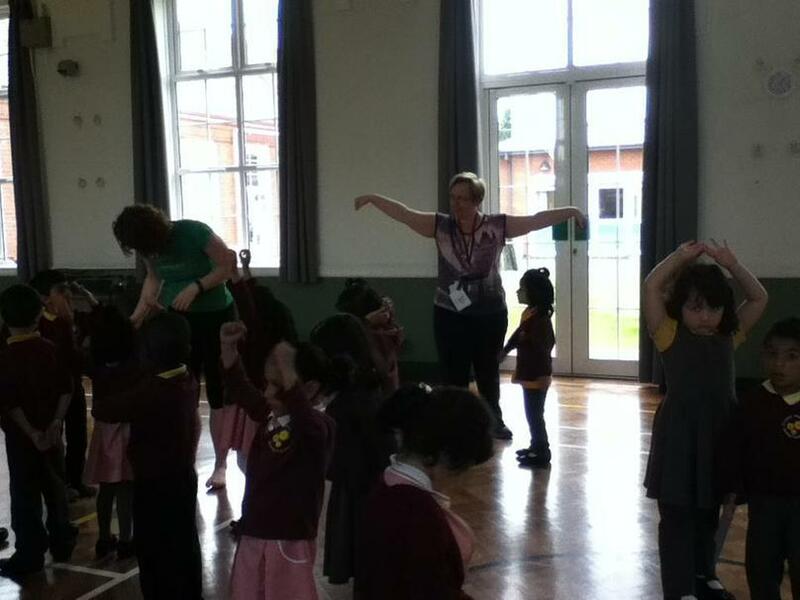 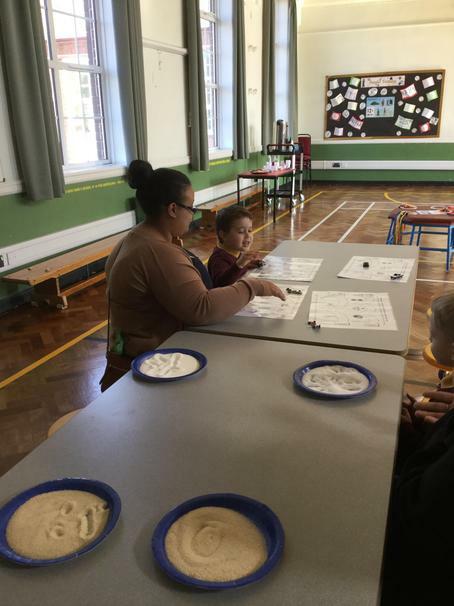 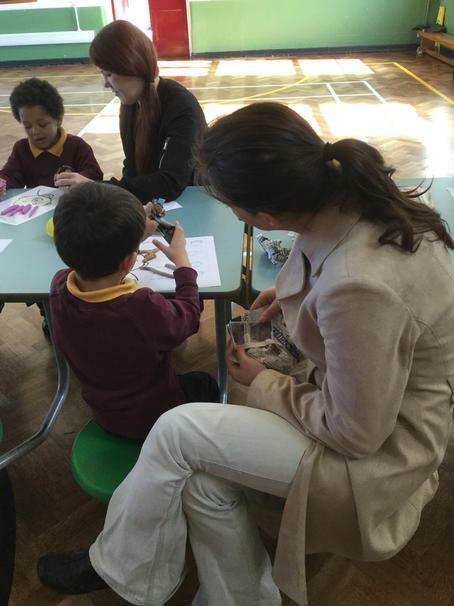 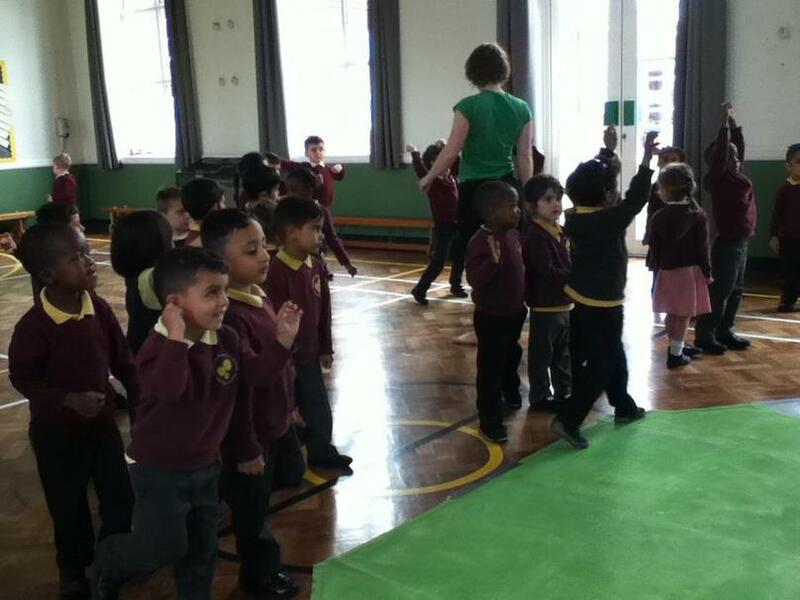 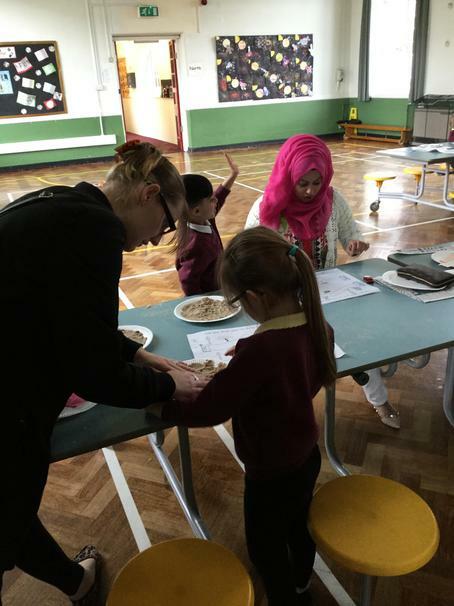 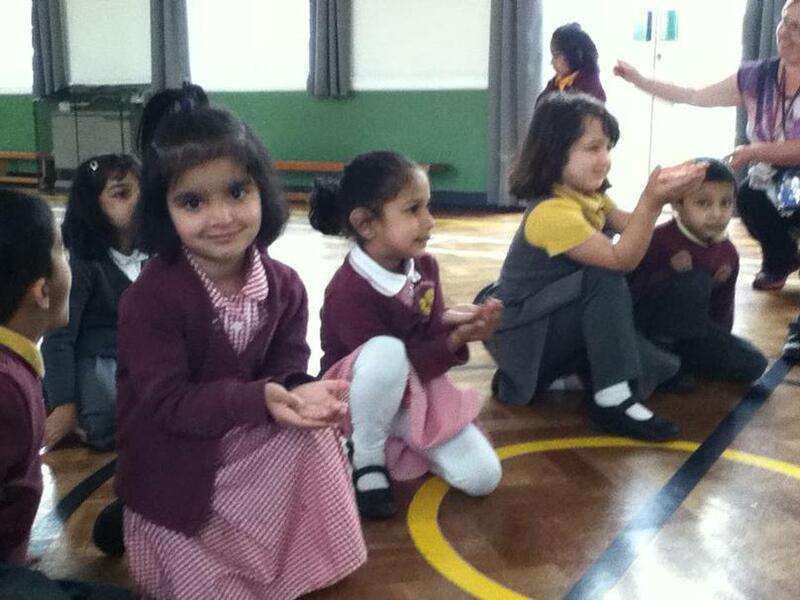 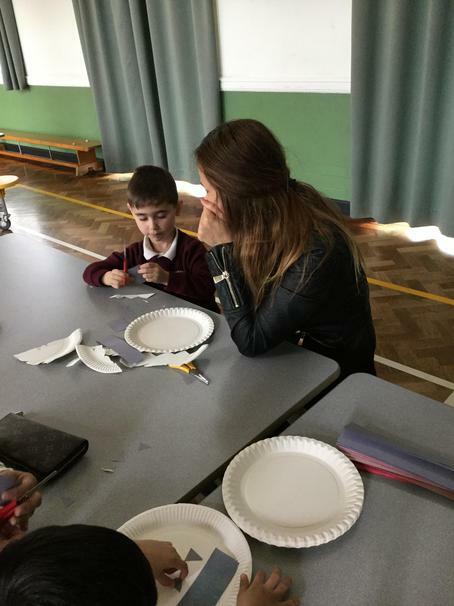 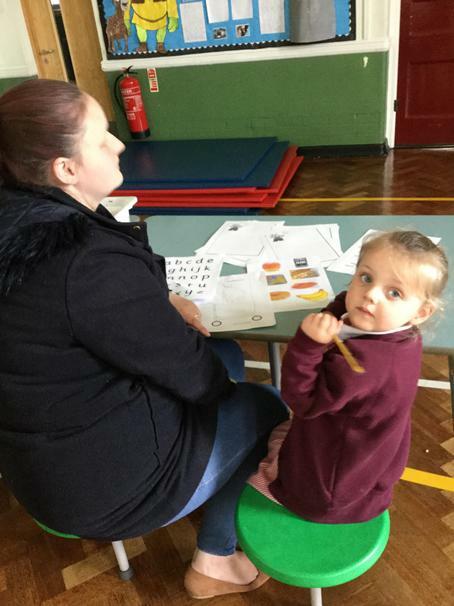 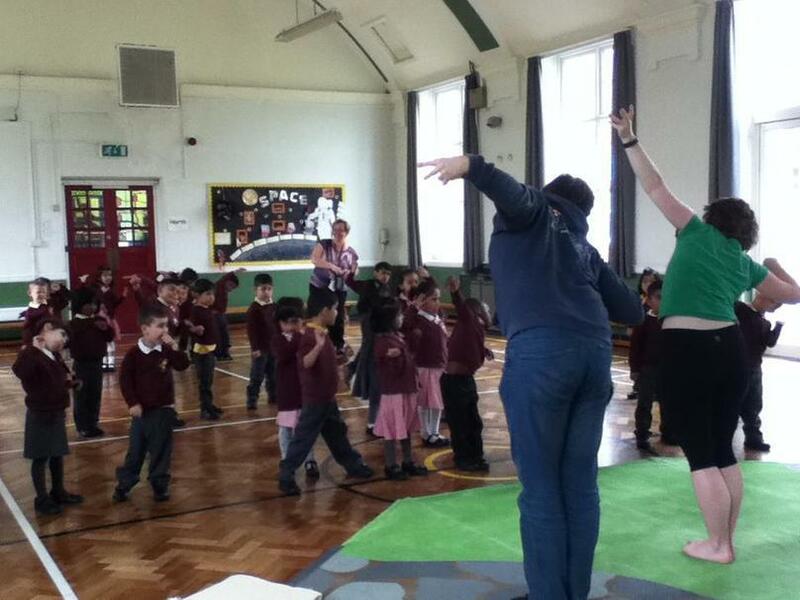 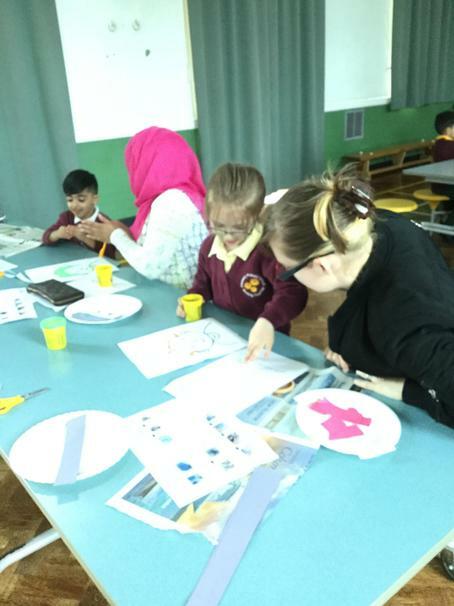 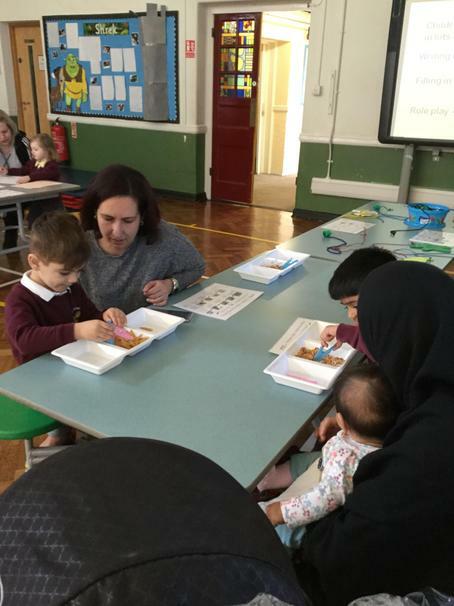 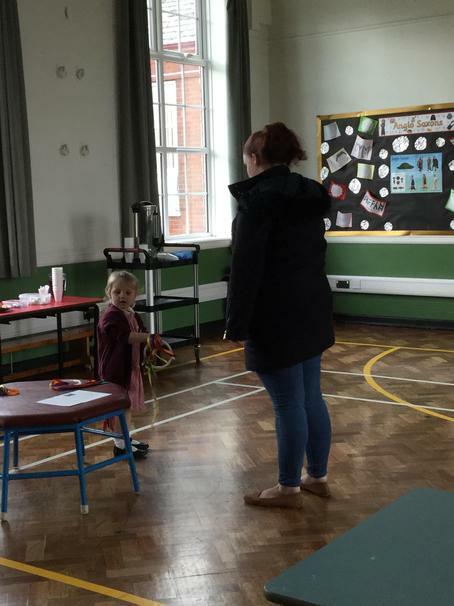 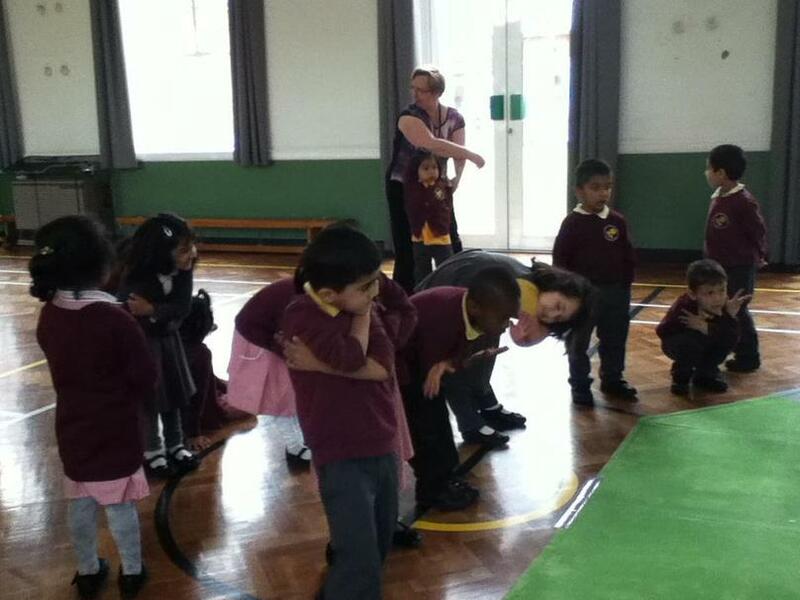 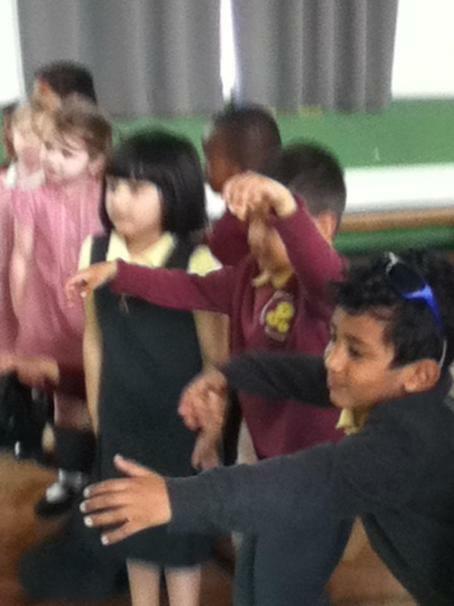 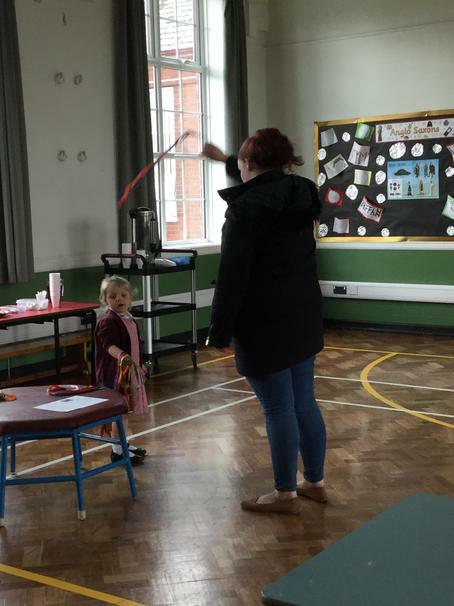 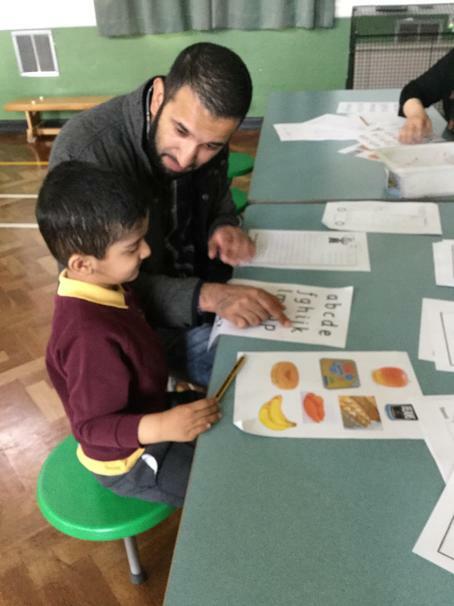 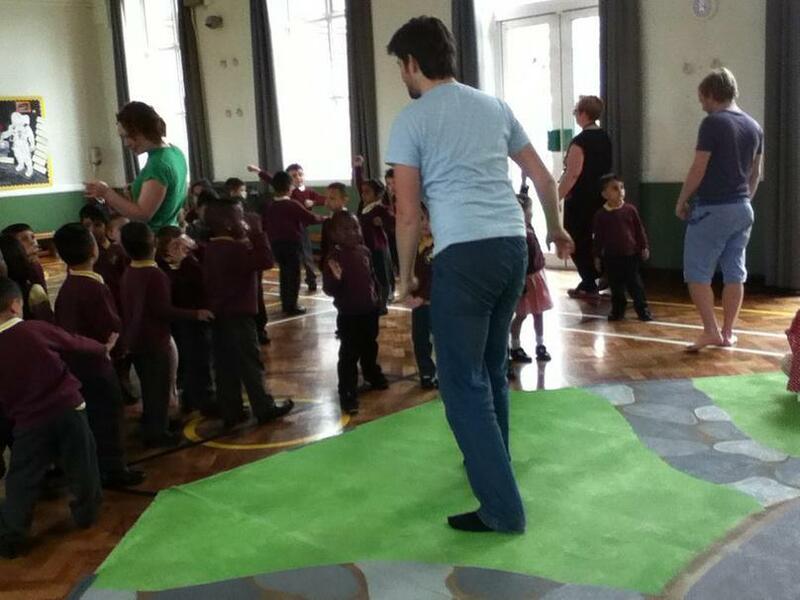 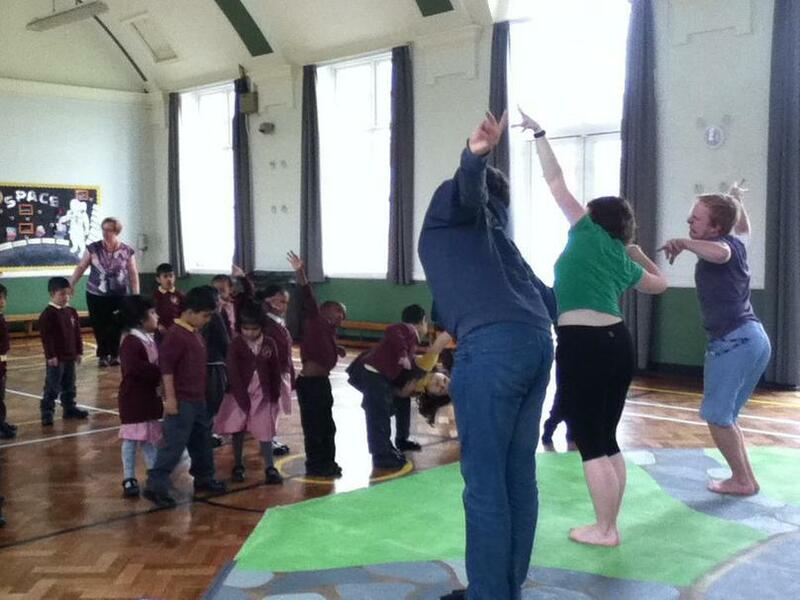 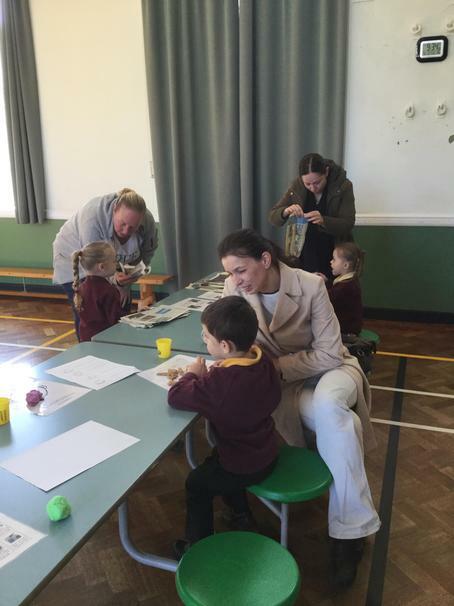 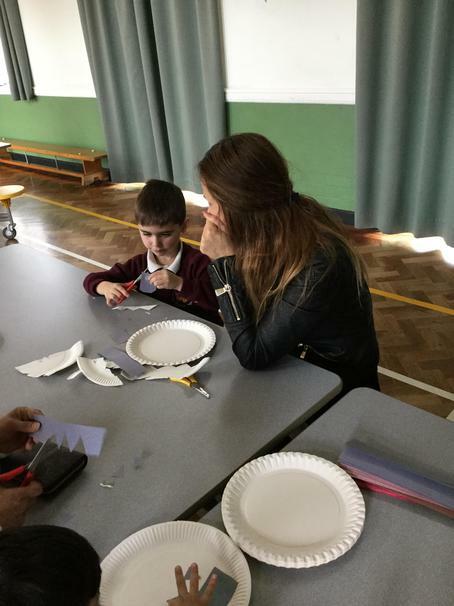 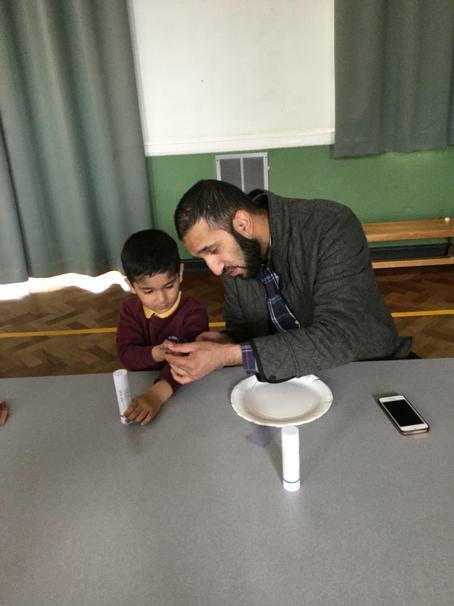 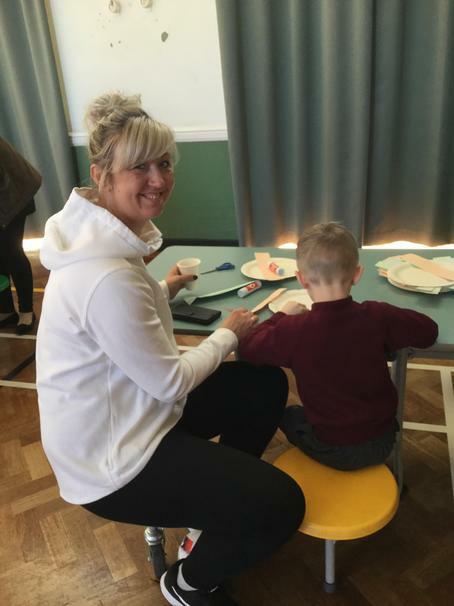 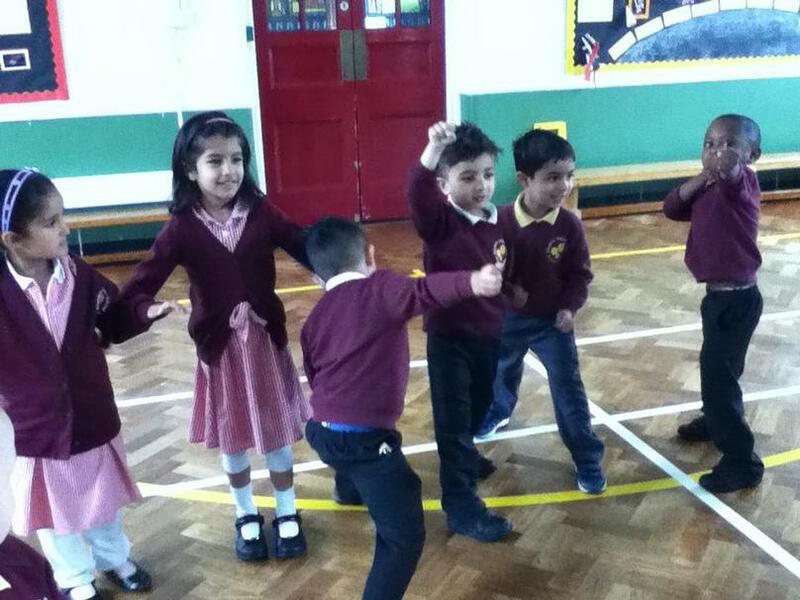 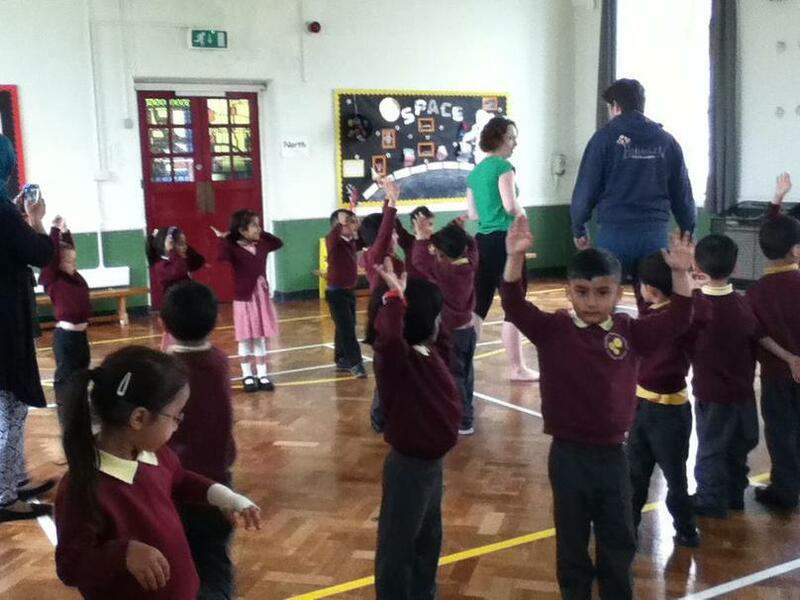 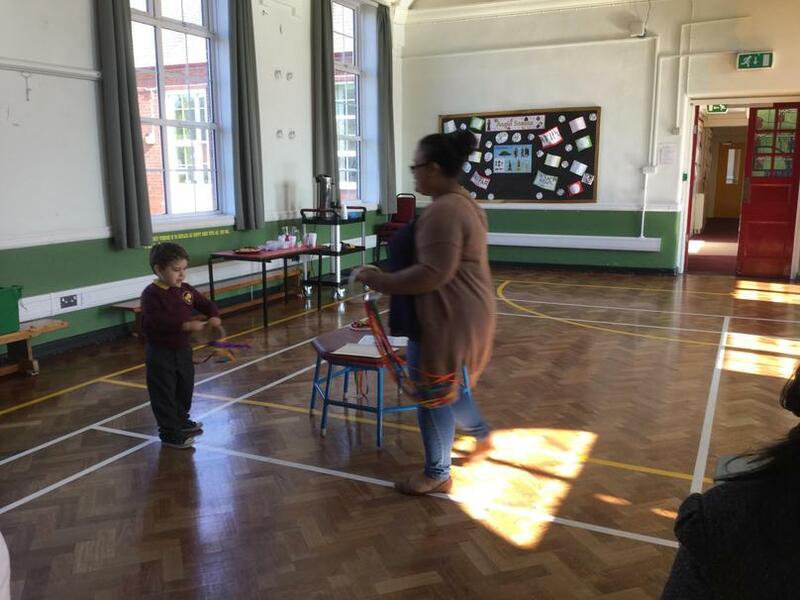 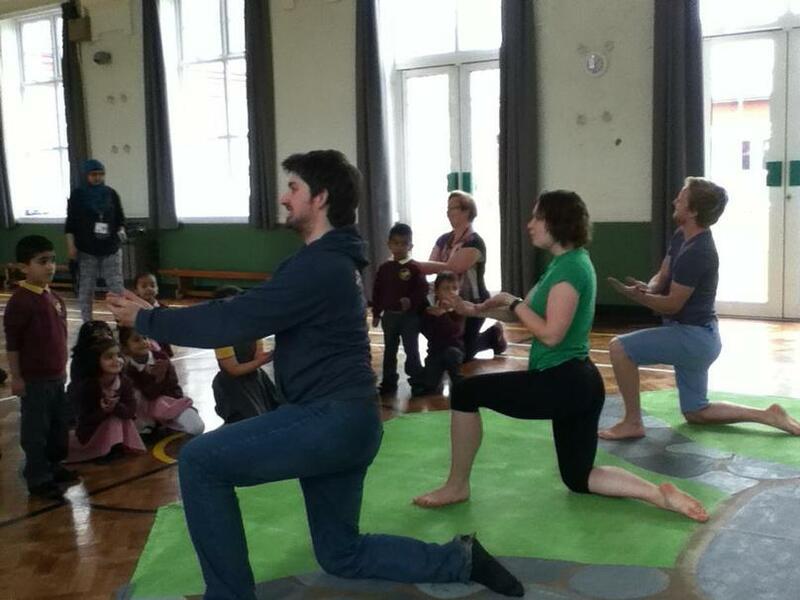 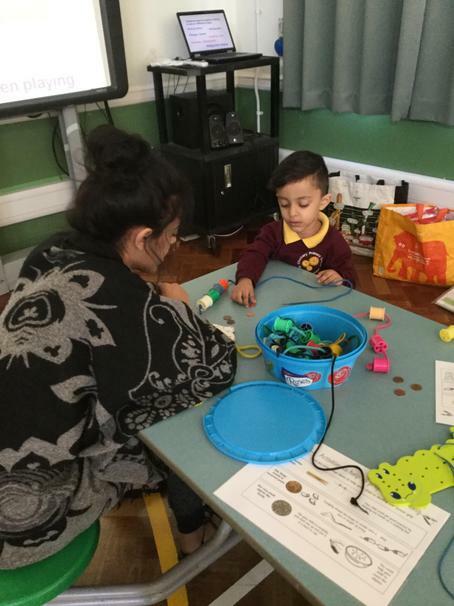 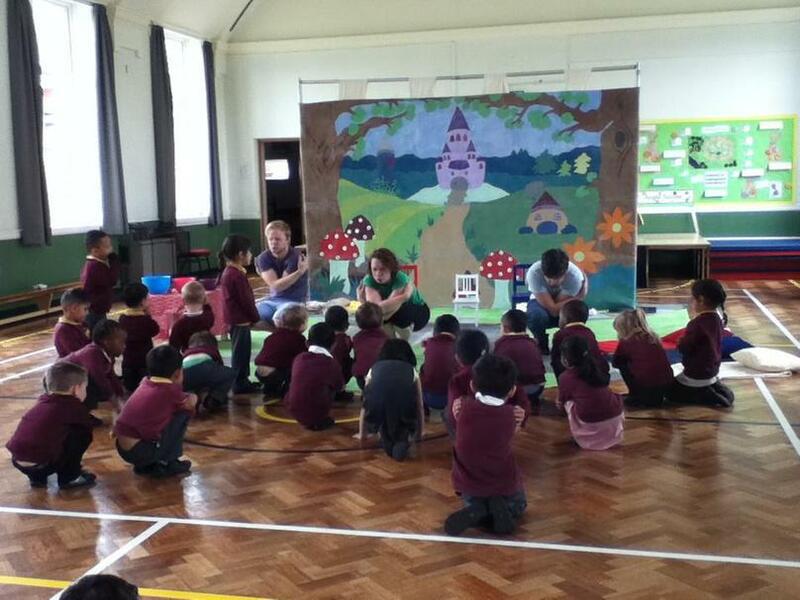 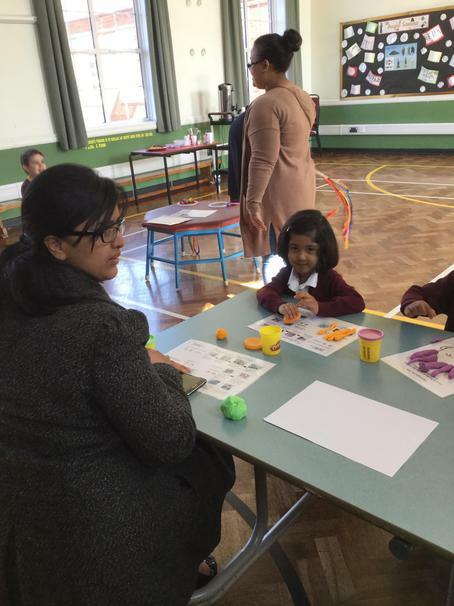 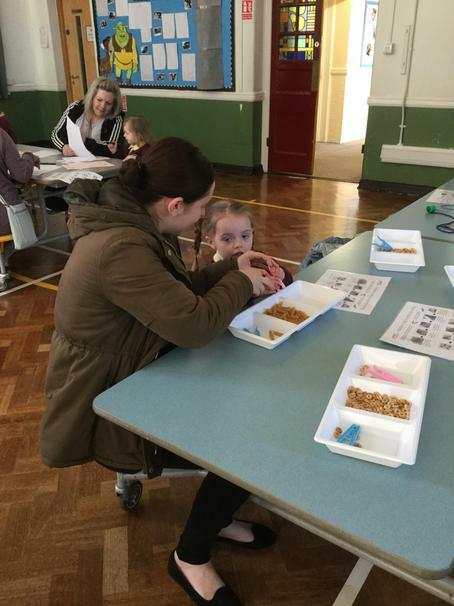 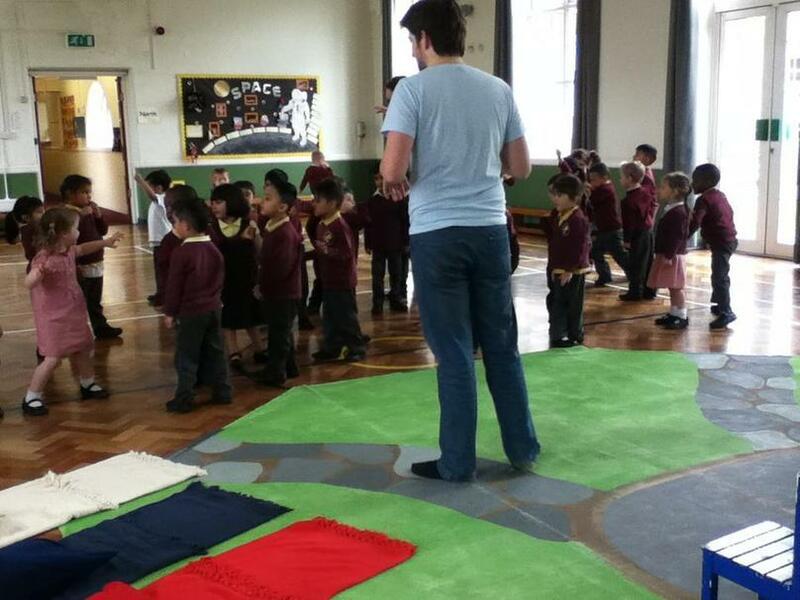 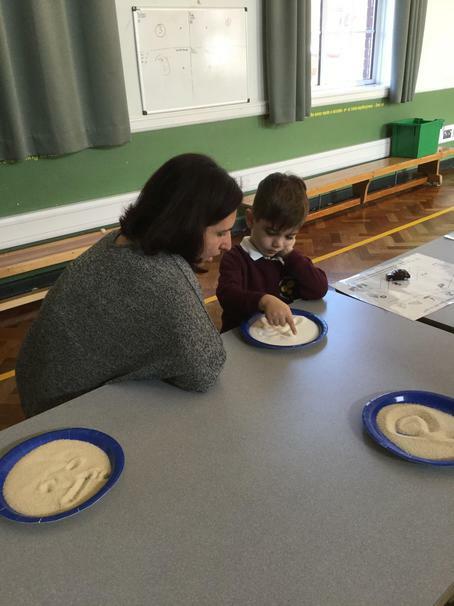 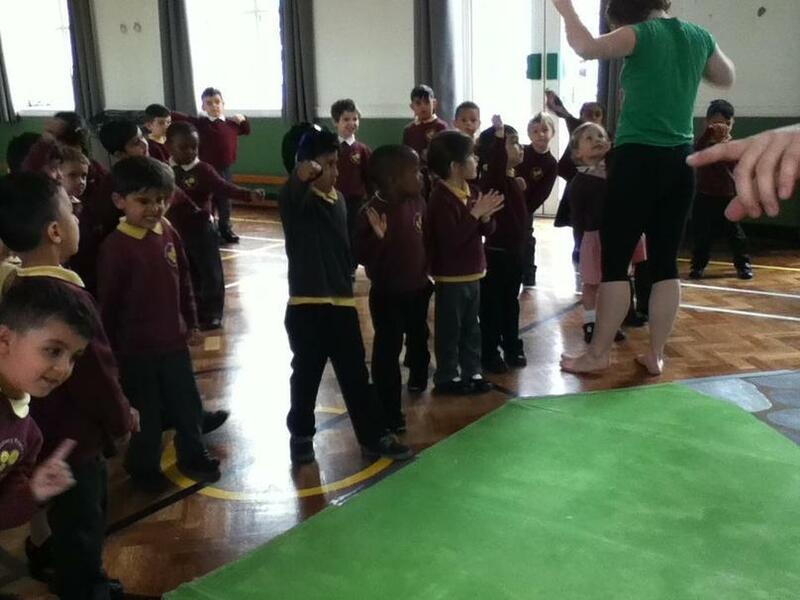 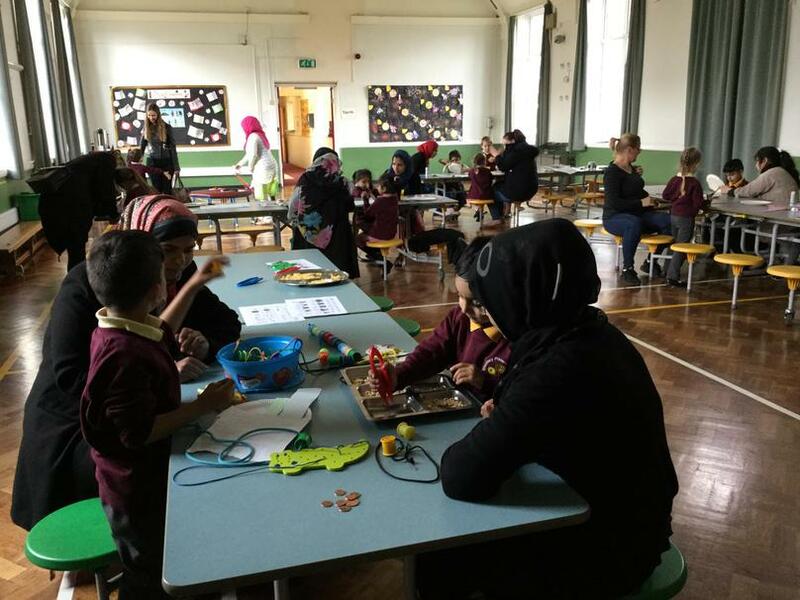 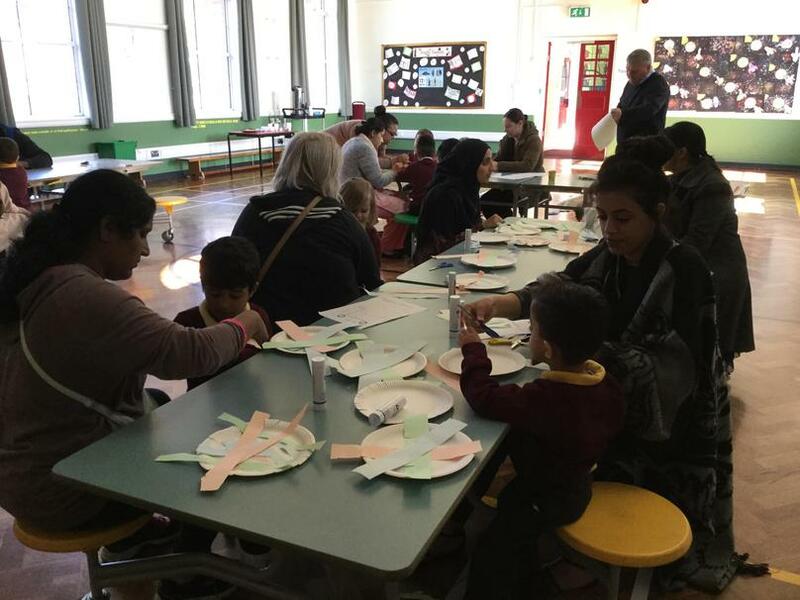 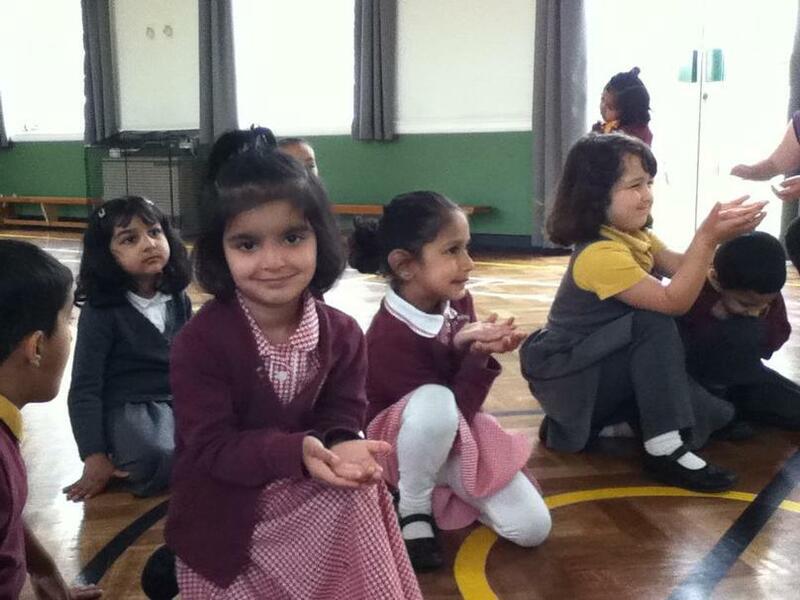 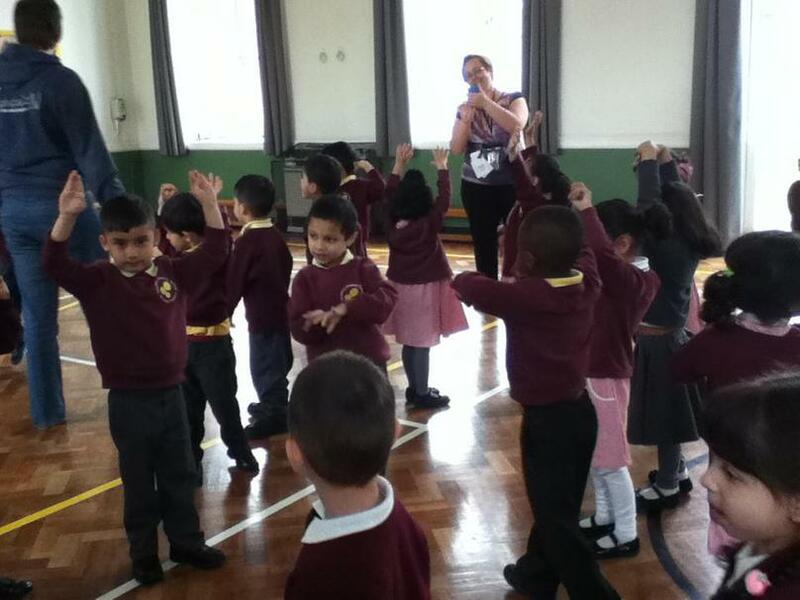 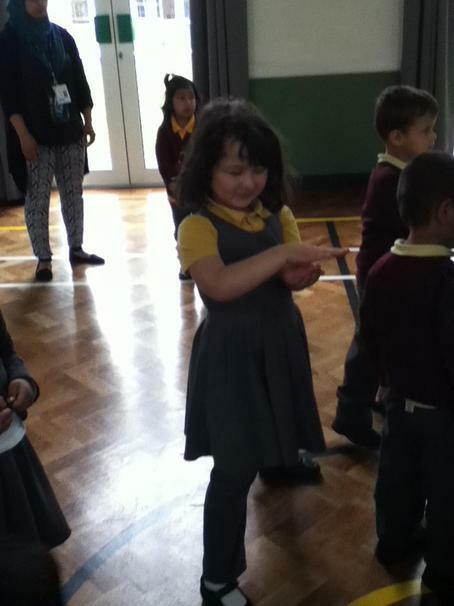 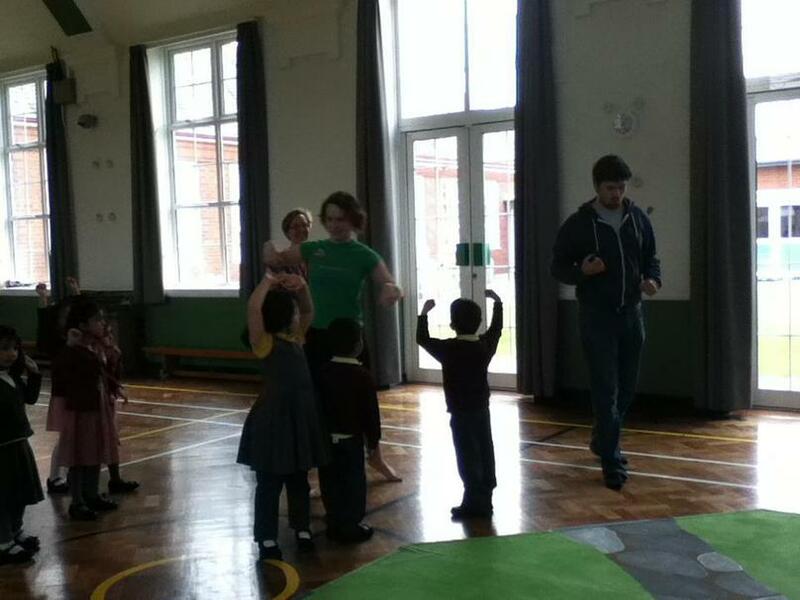 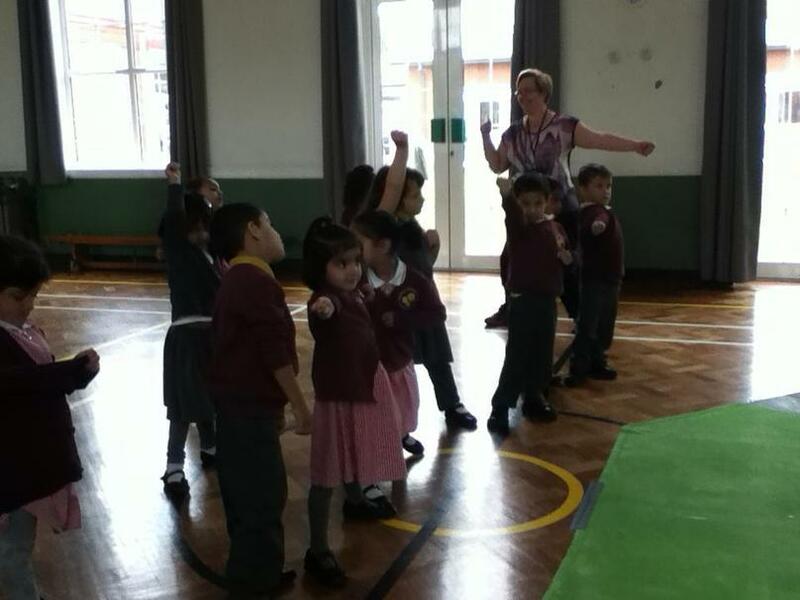 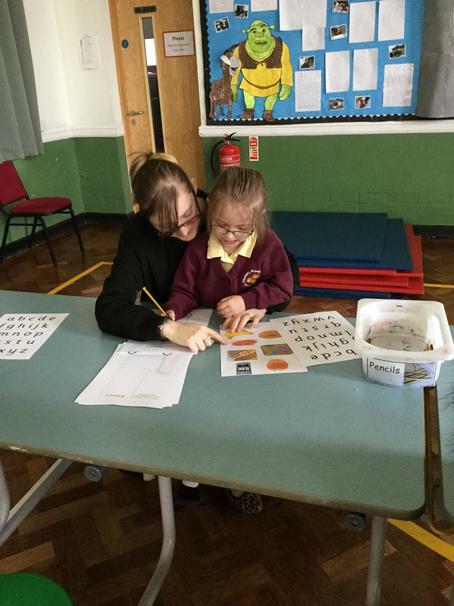 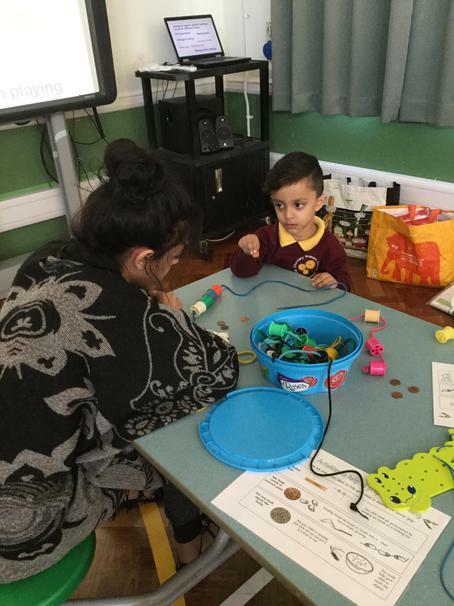 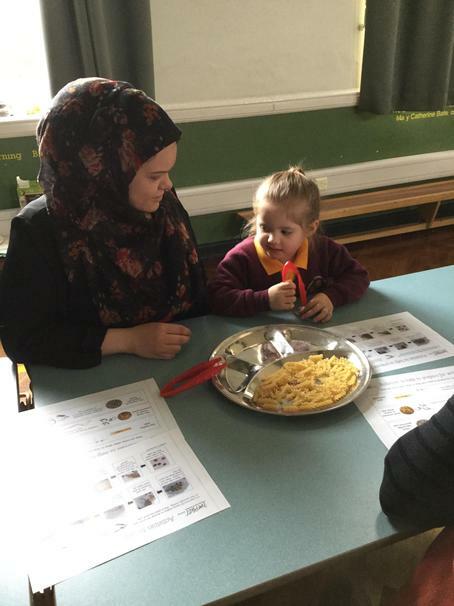 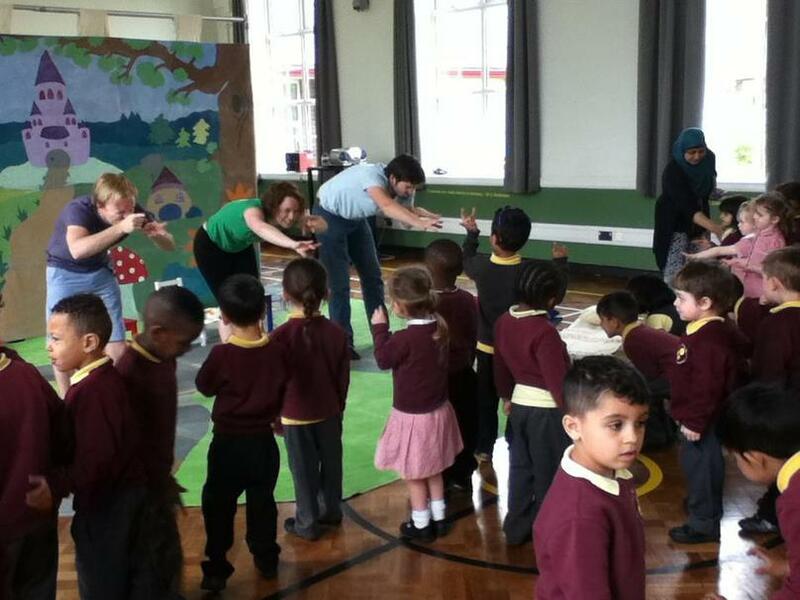 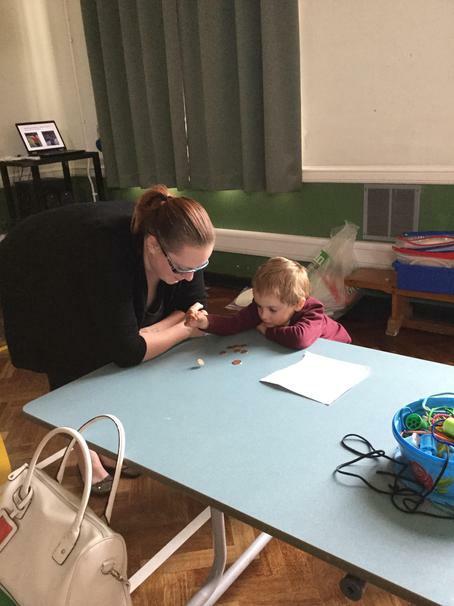 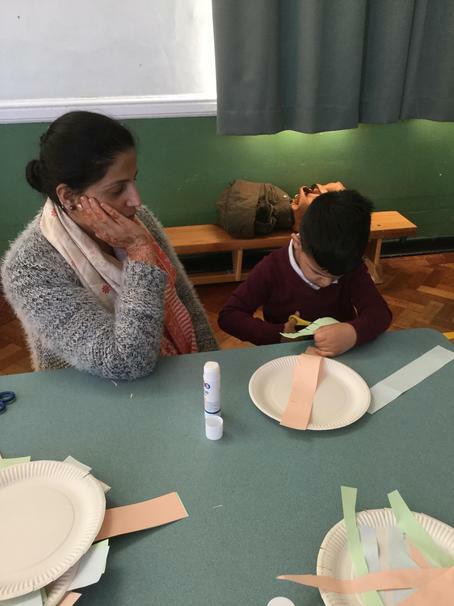 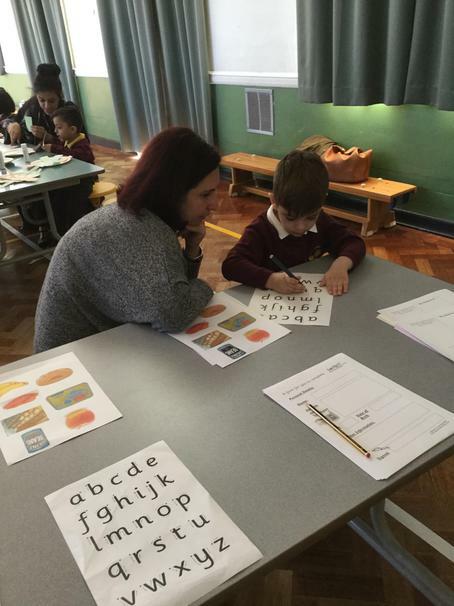 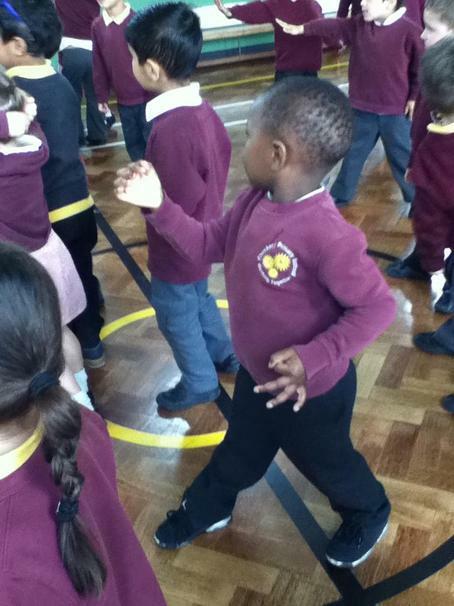 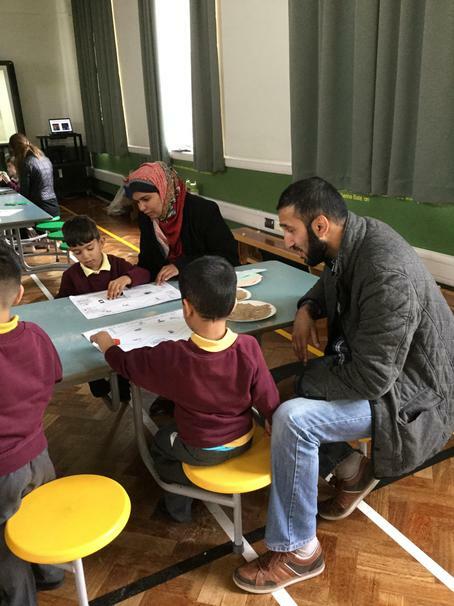 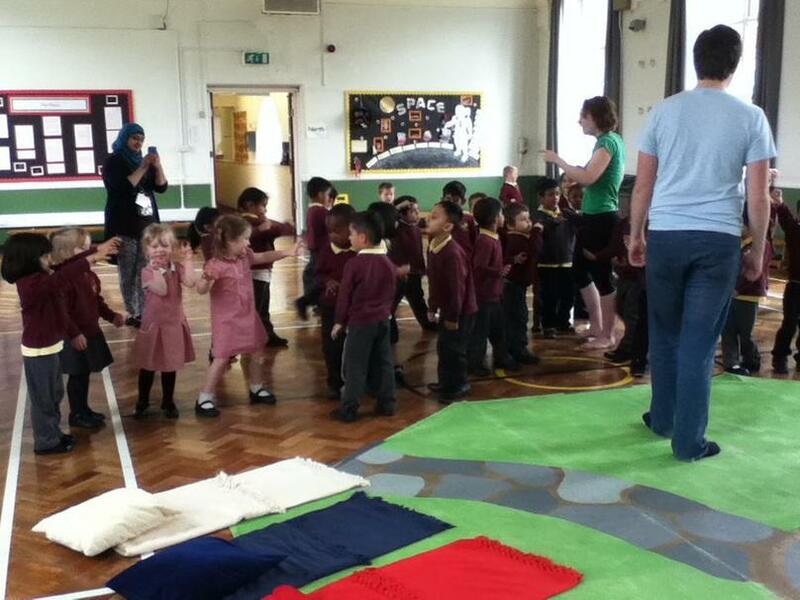 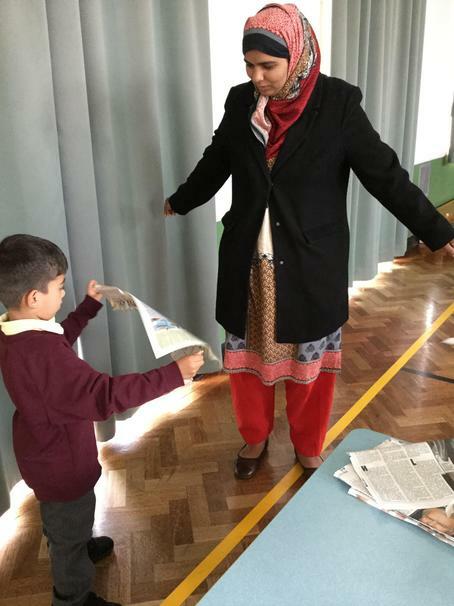 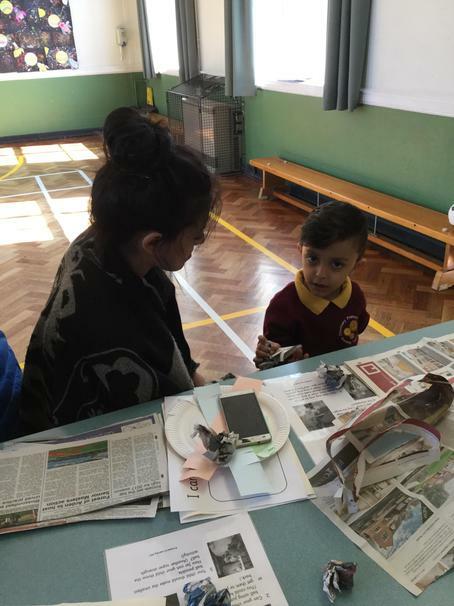 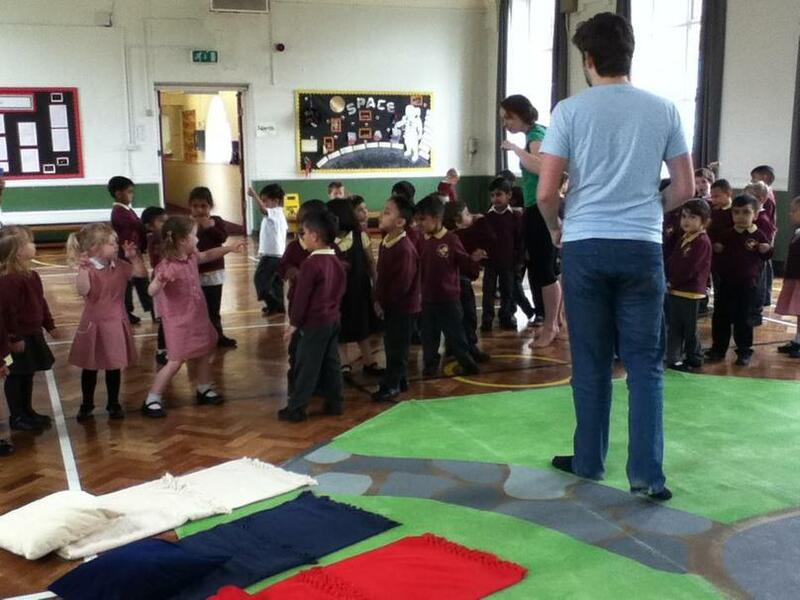 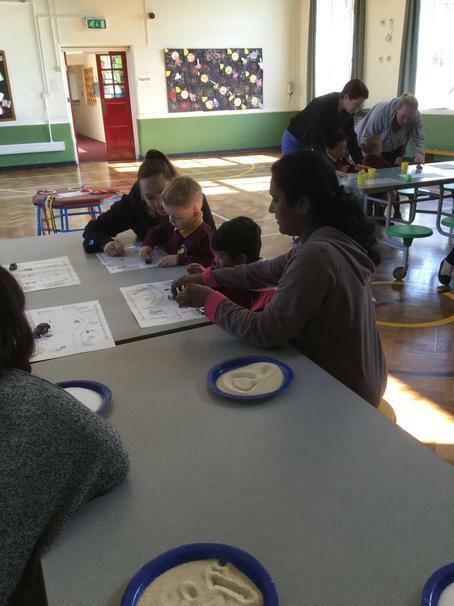 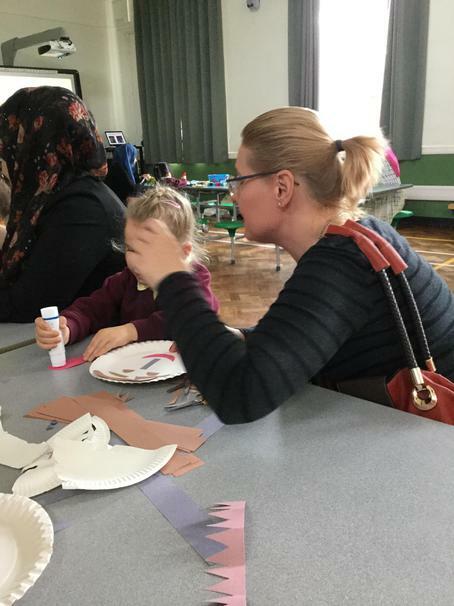 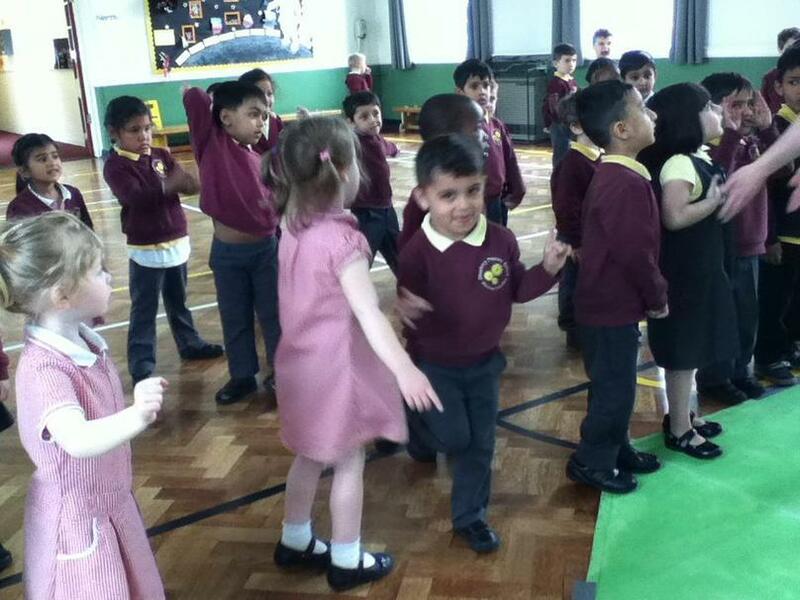 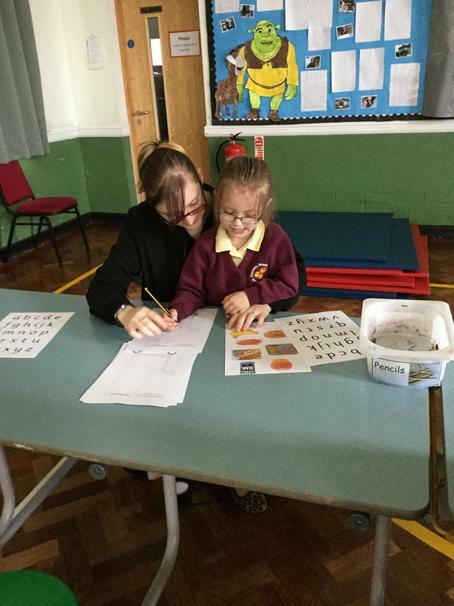 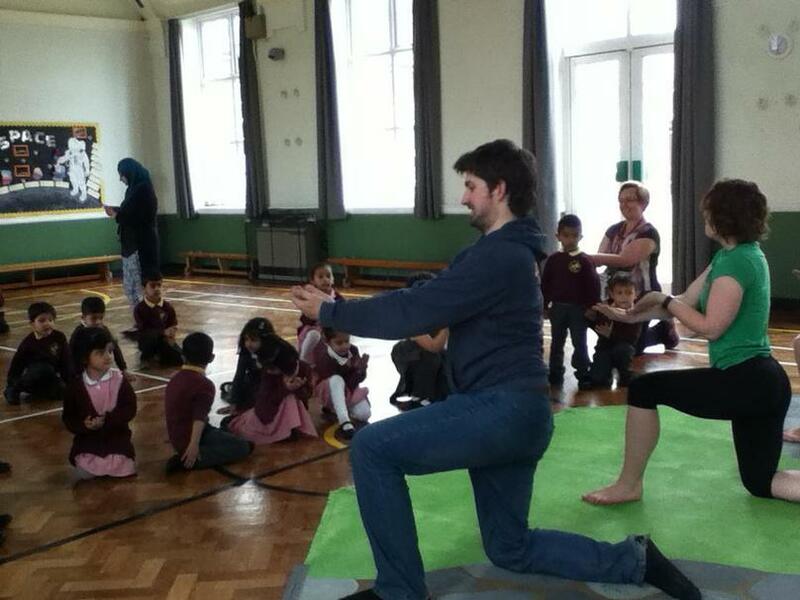 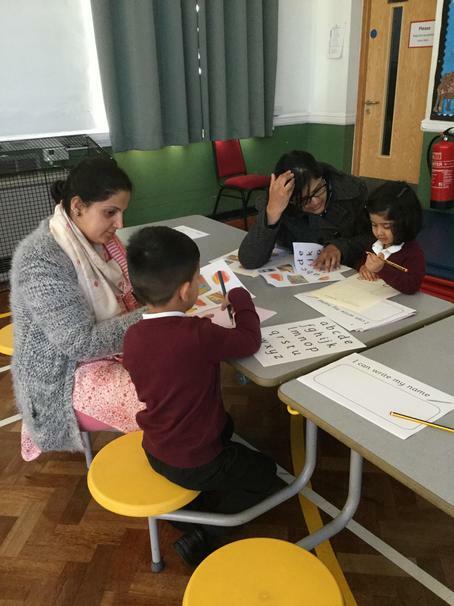 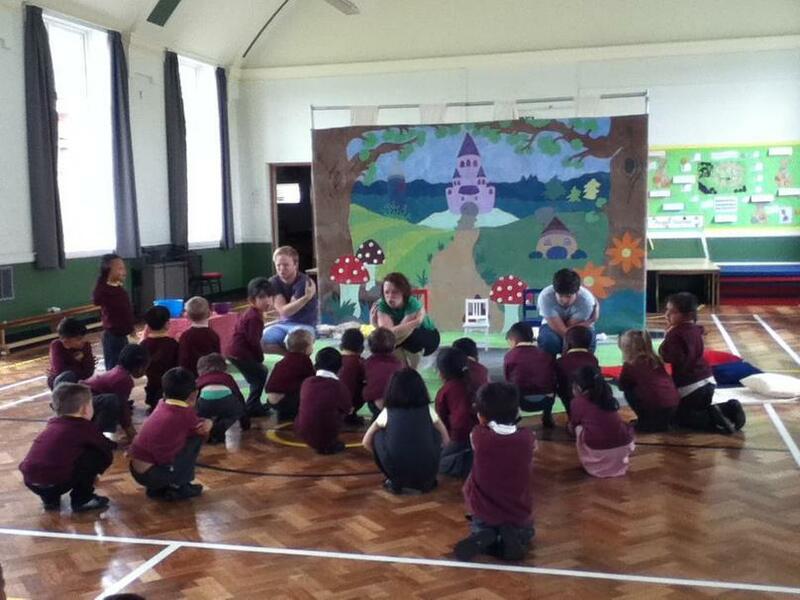 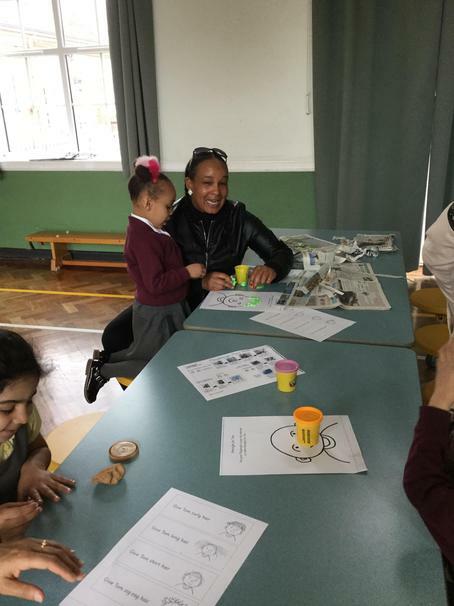 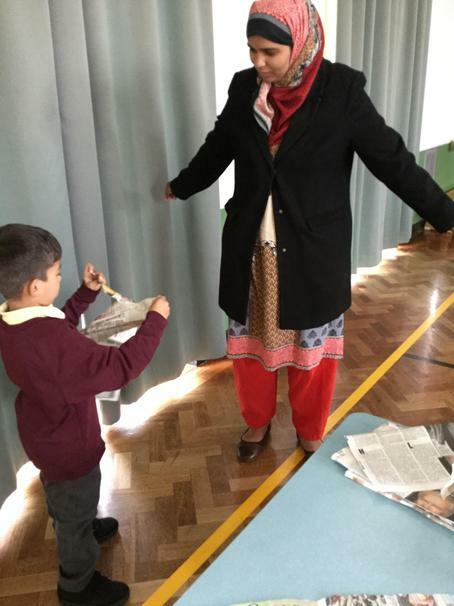 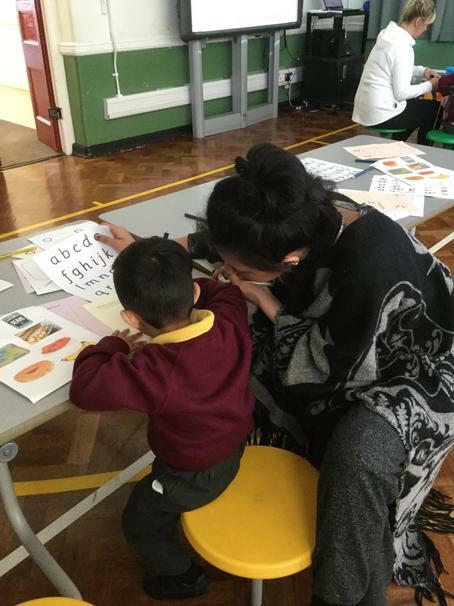 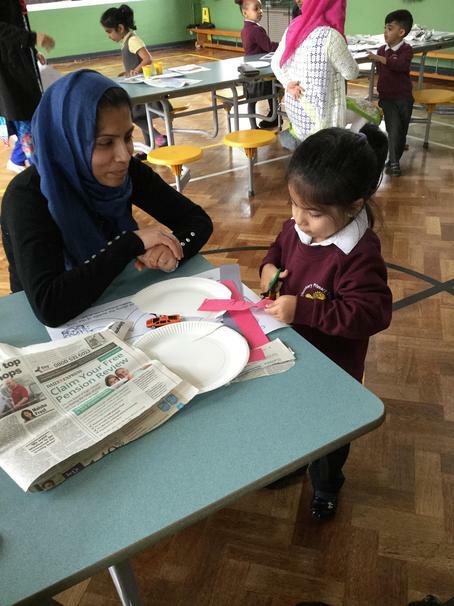 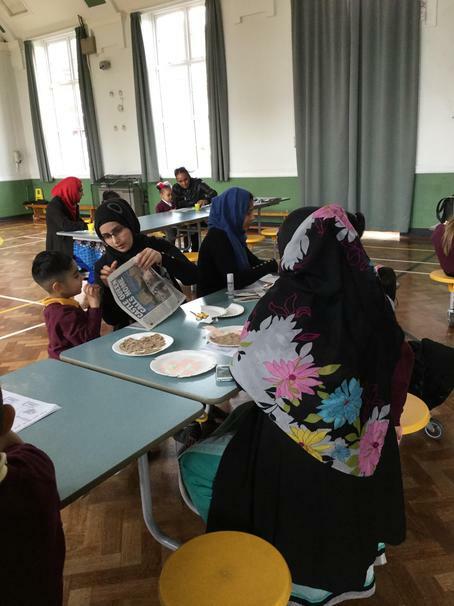 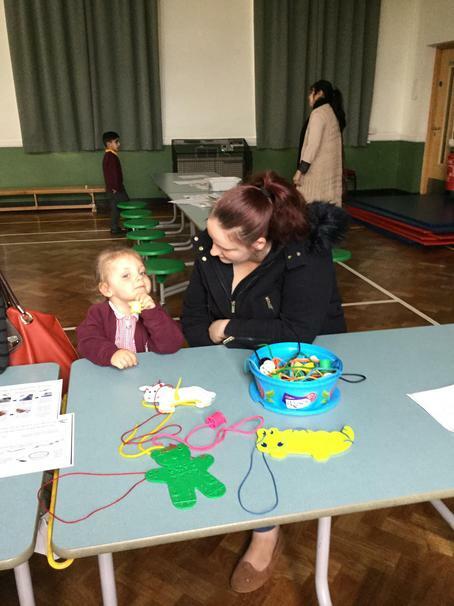 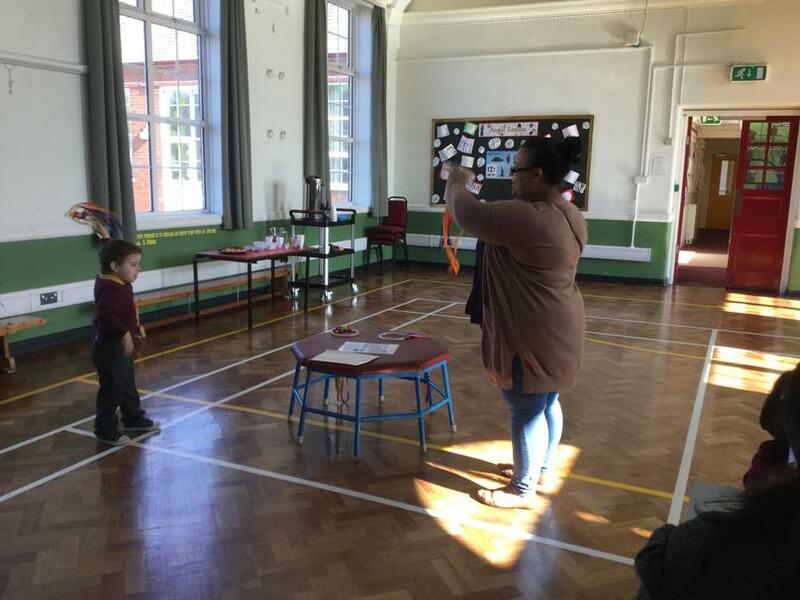 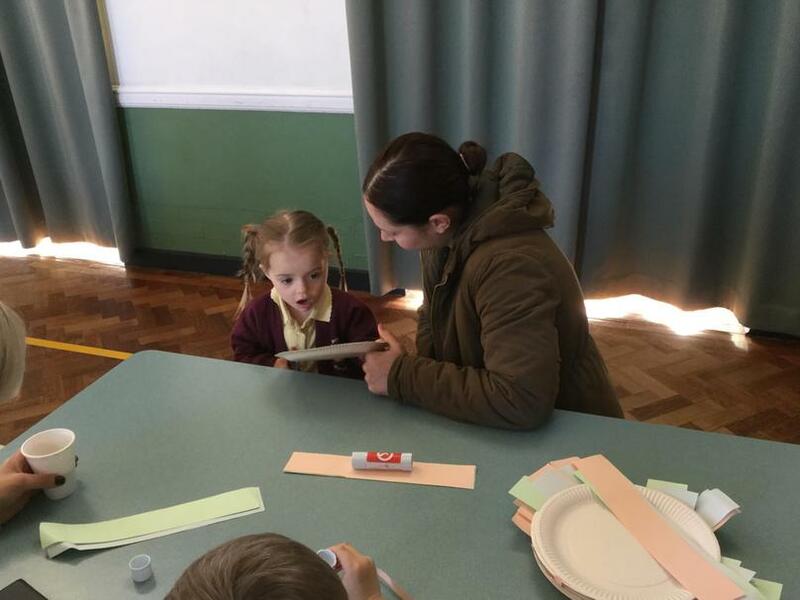 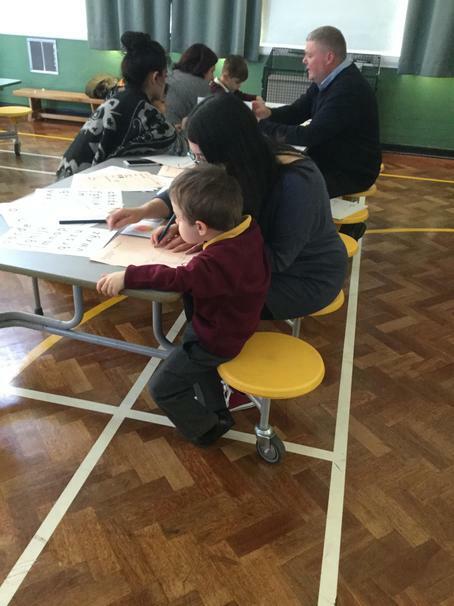 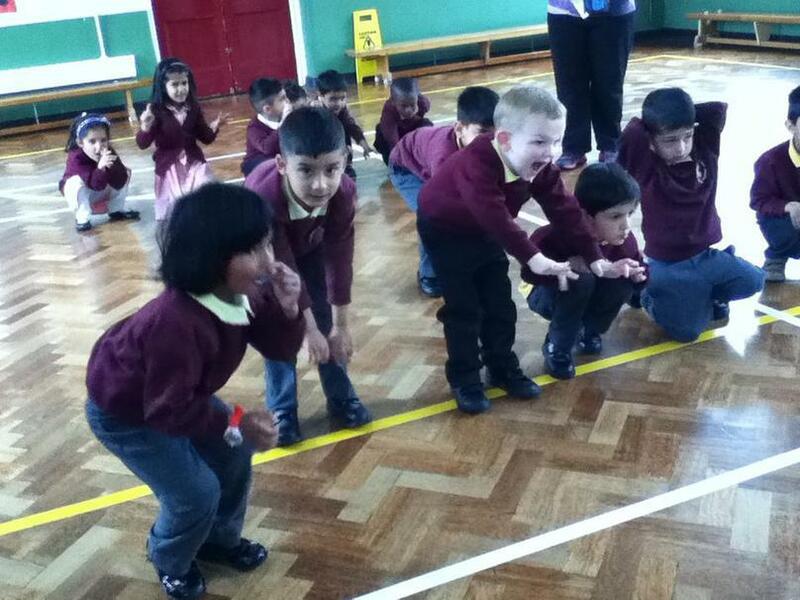 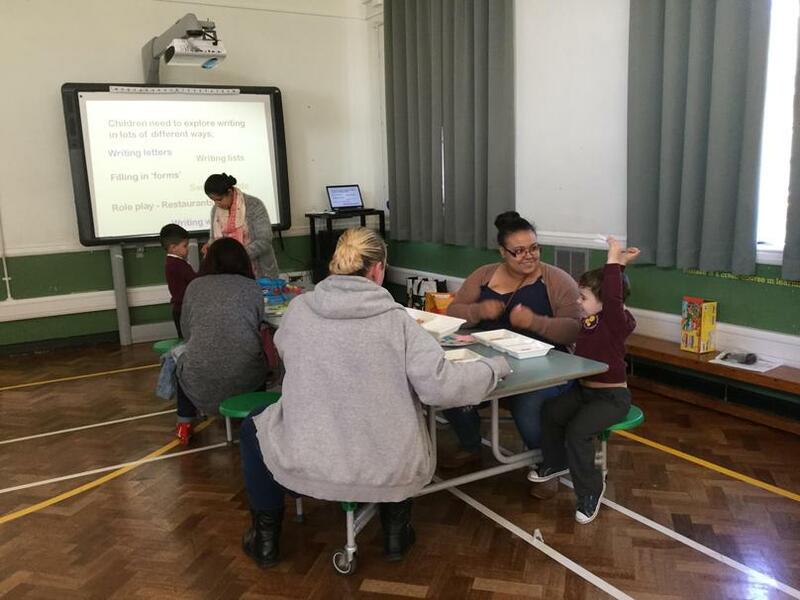 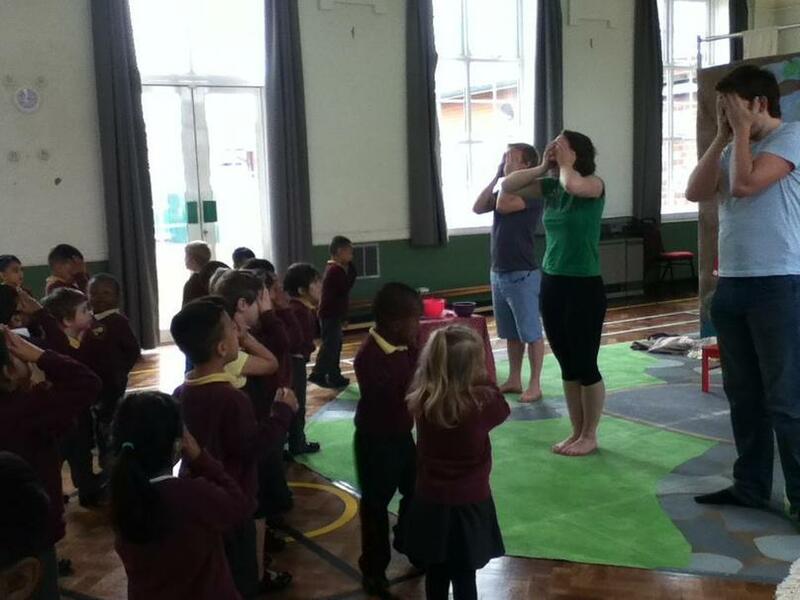 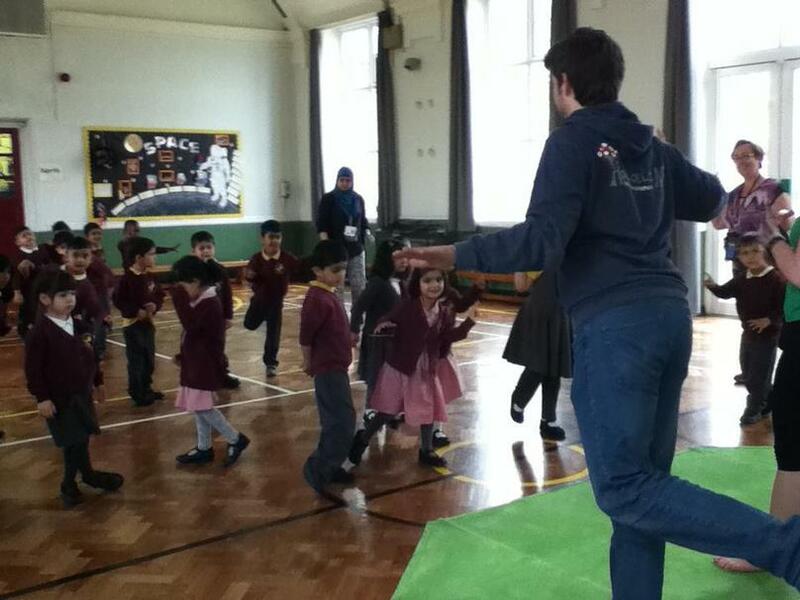 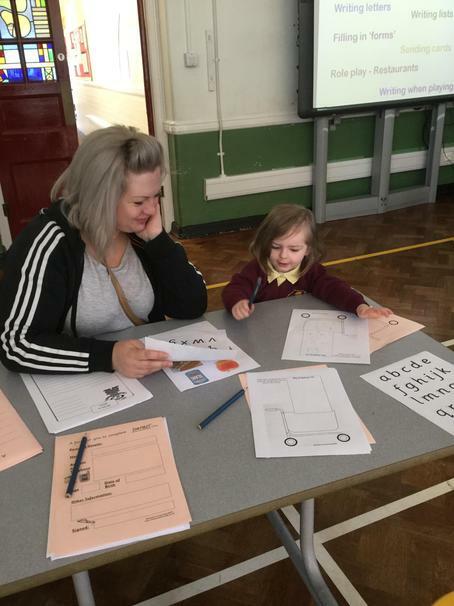 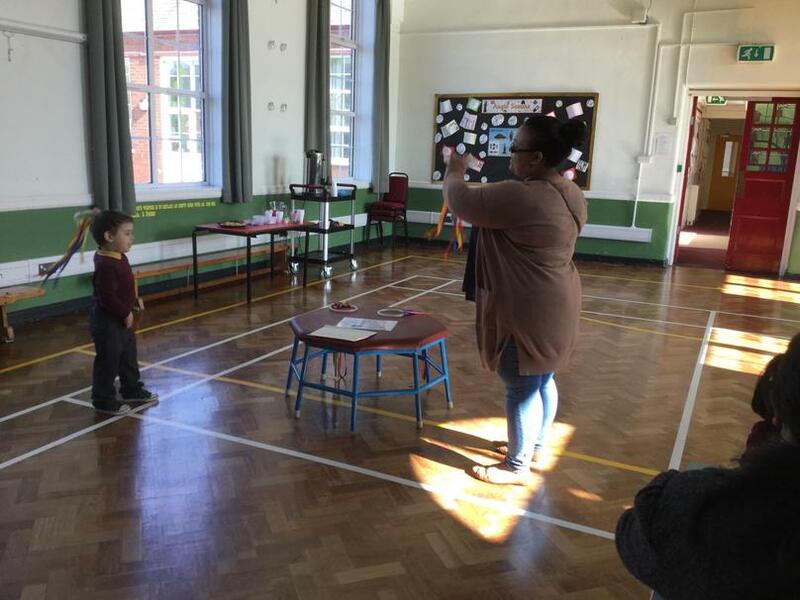 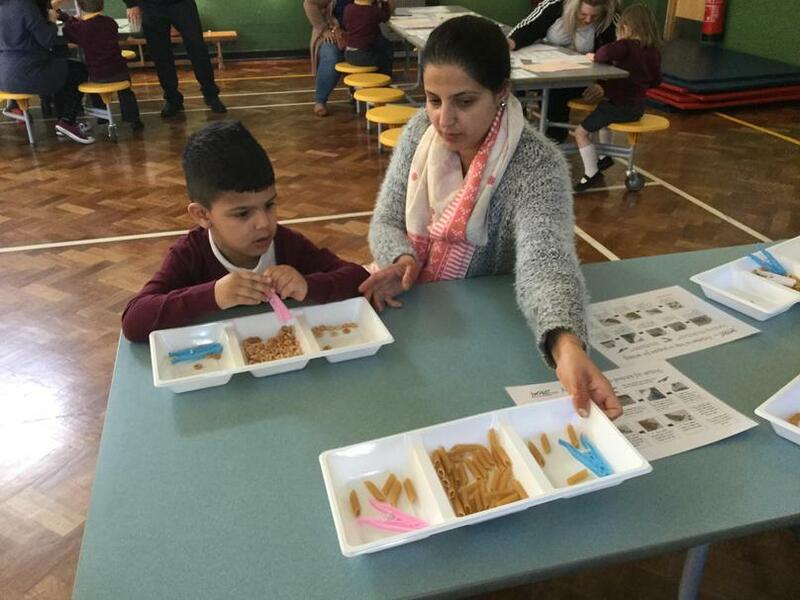 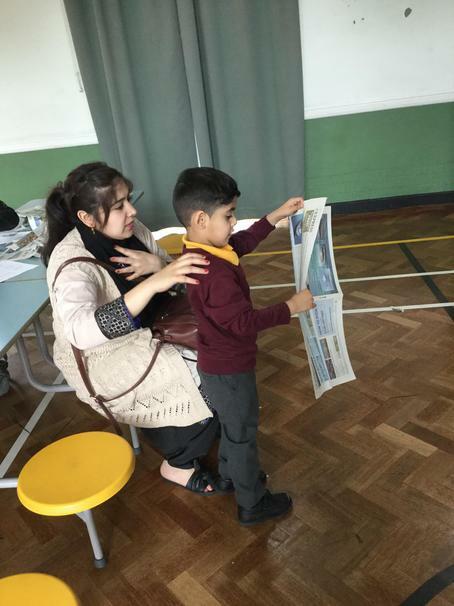 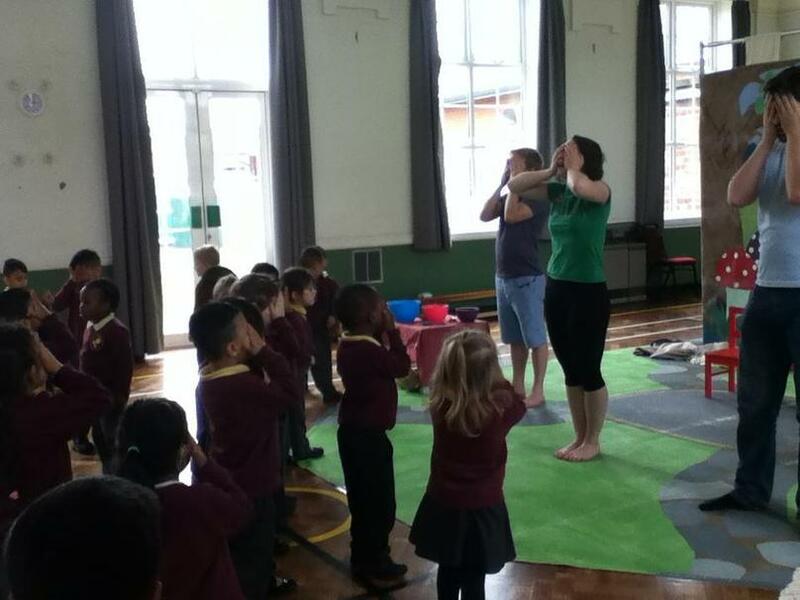 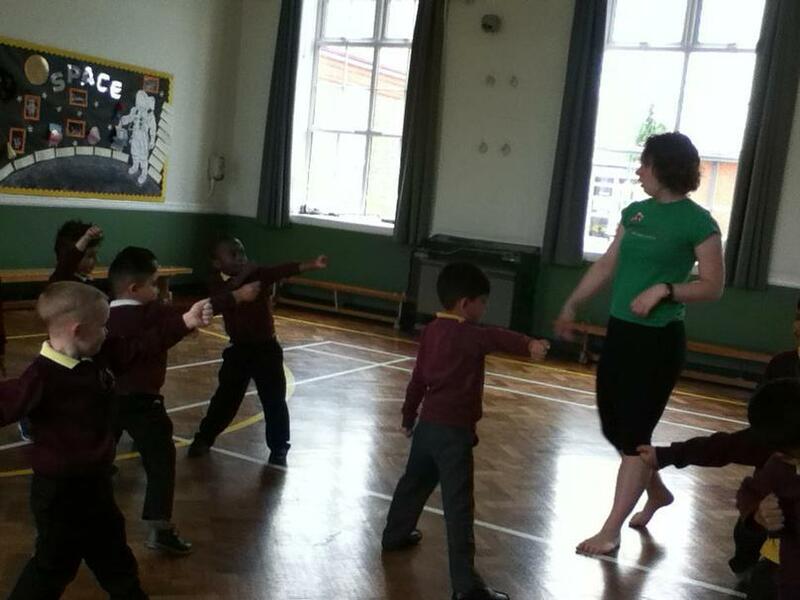 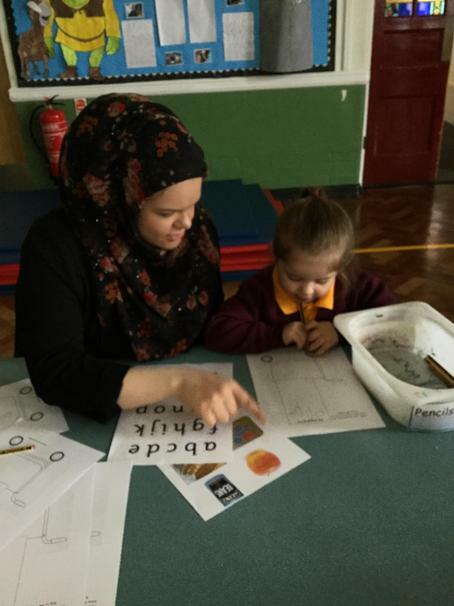 Nursery had lots of fun learning with their parents at school yesterday at the pre-writing parent workshop. 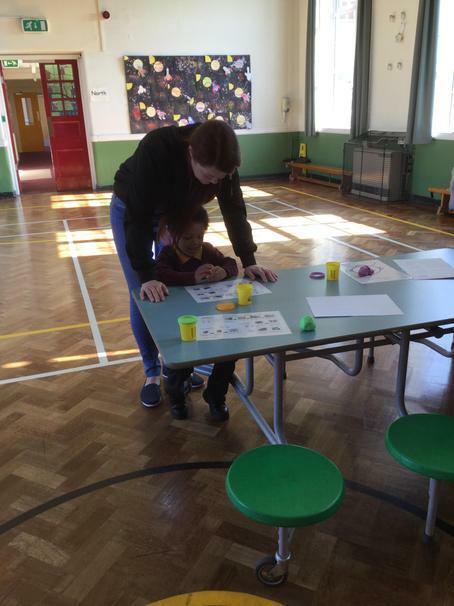 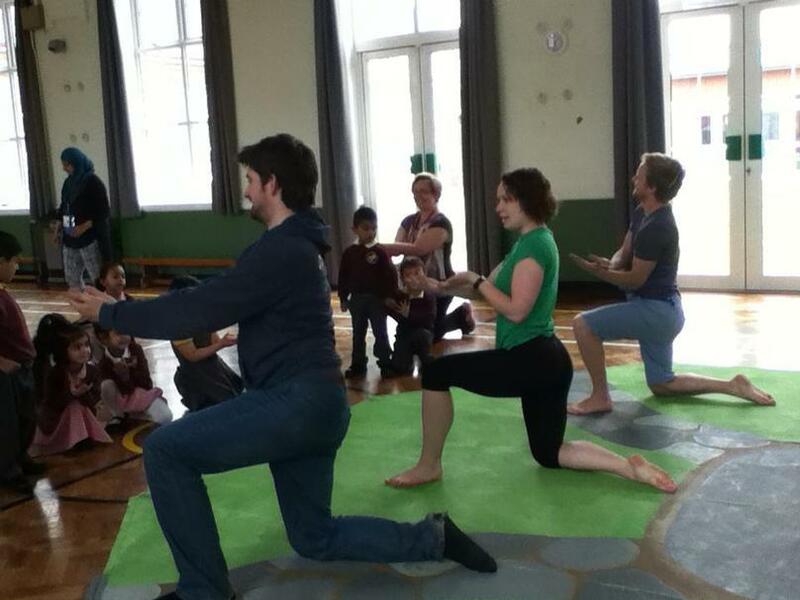 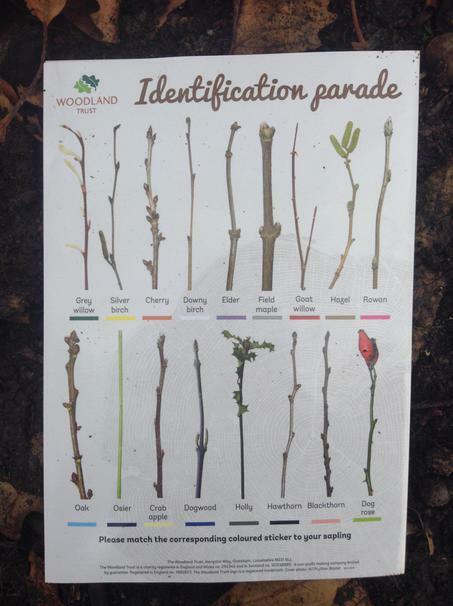 We hope you found it useful and have a go at the activities at home! 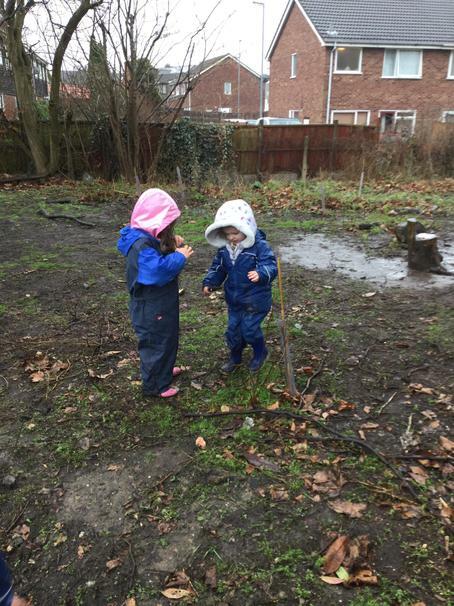 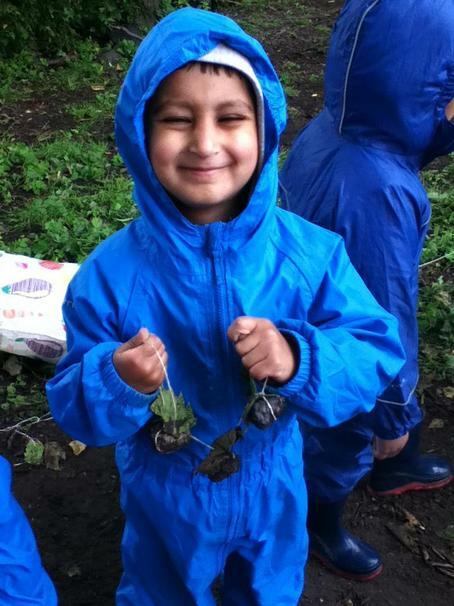 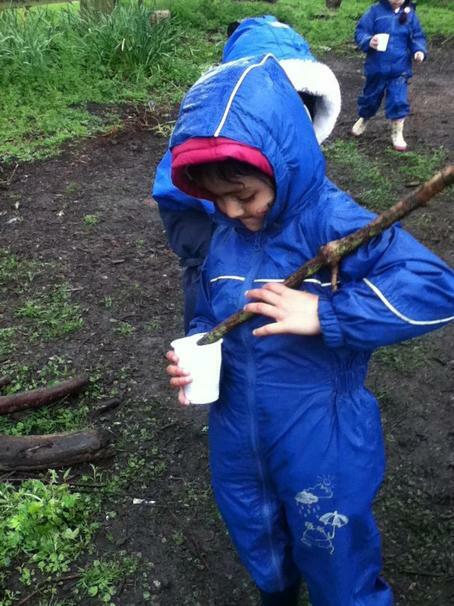 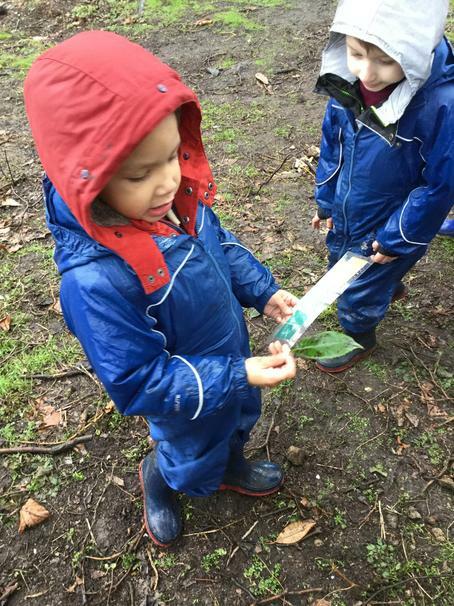 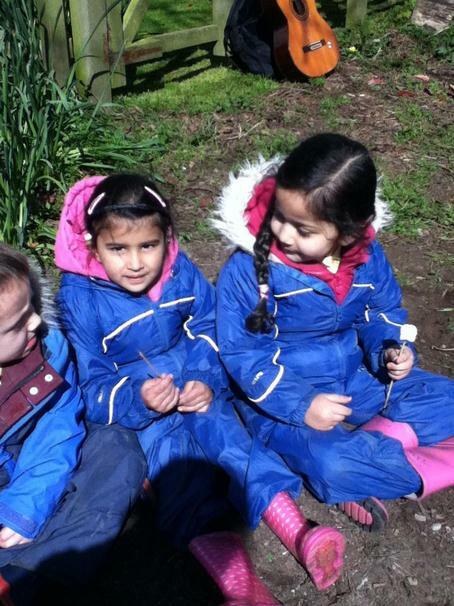 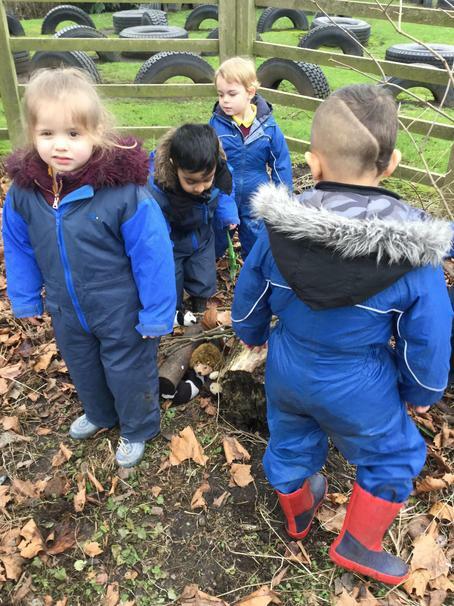 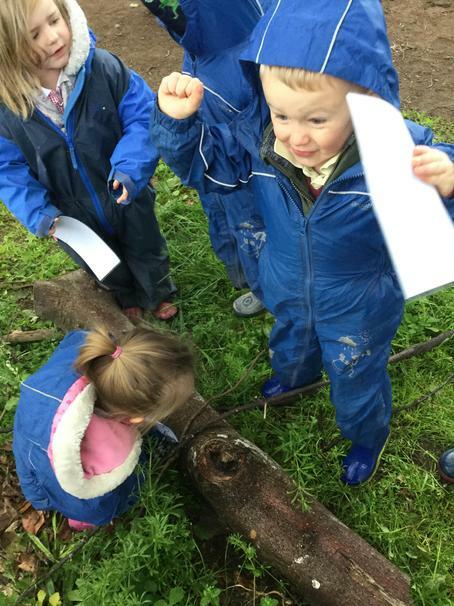 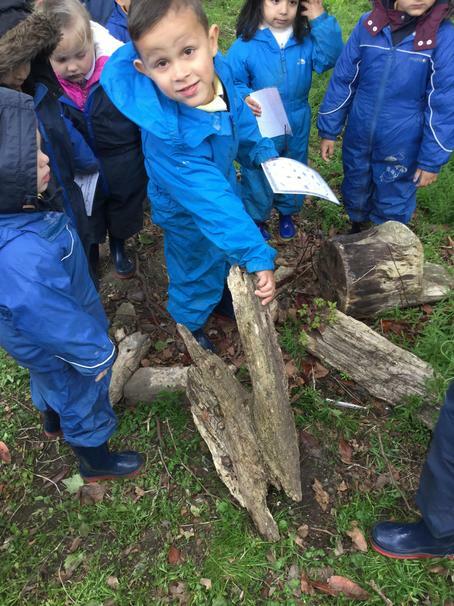 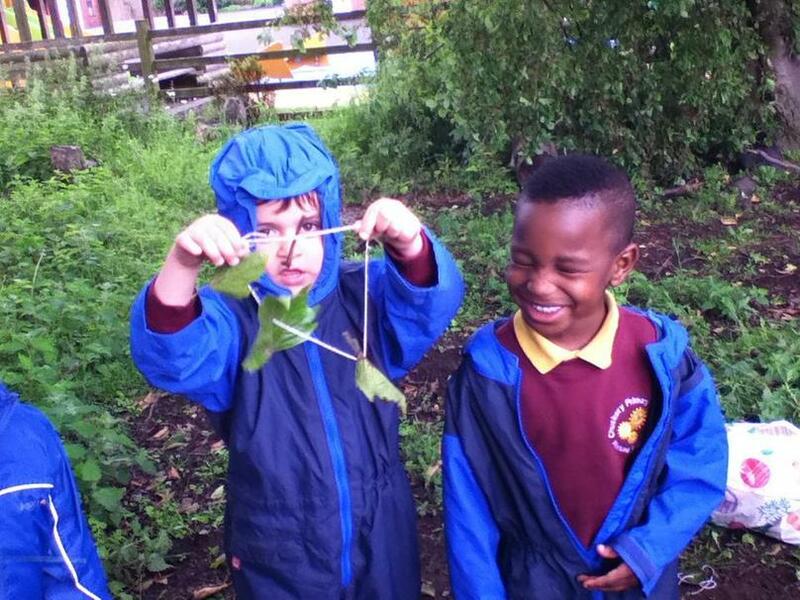 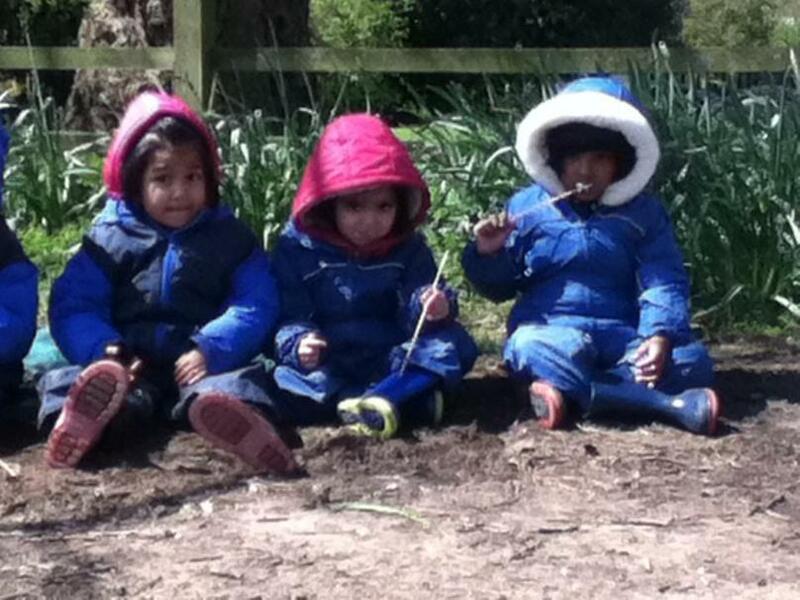 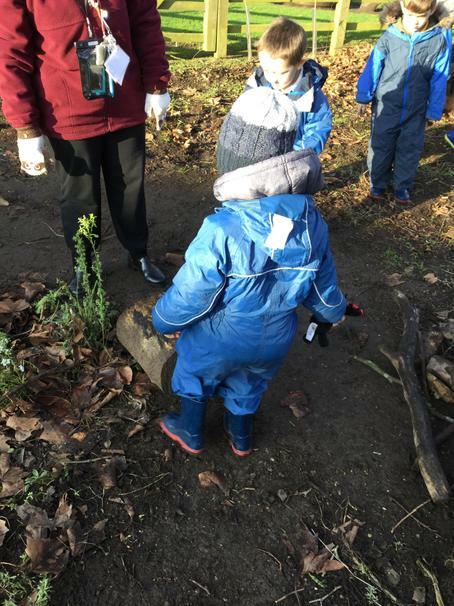 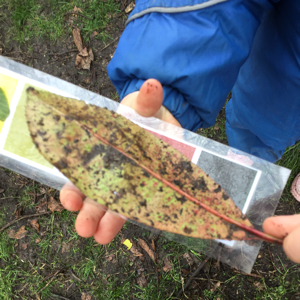 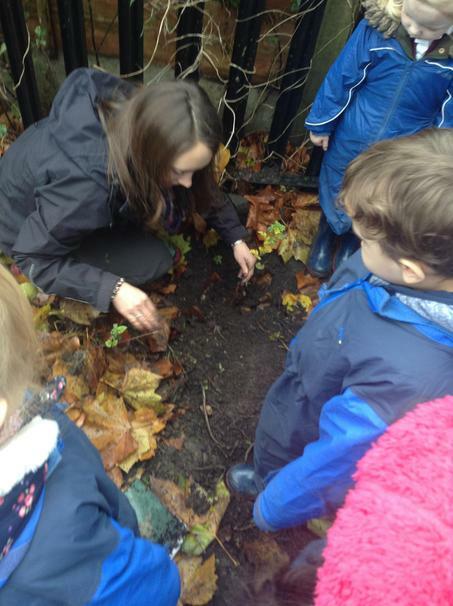 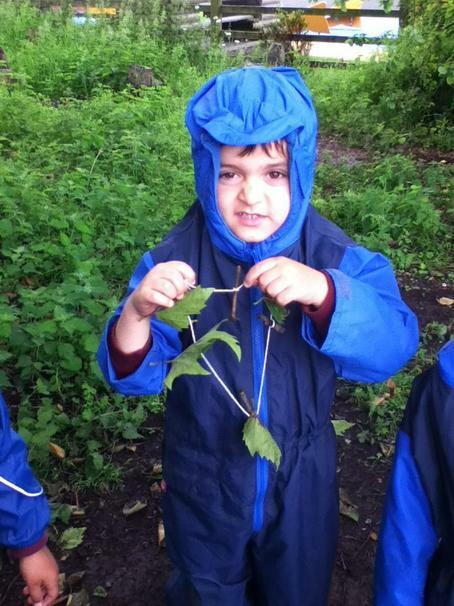 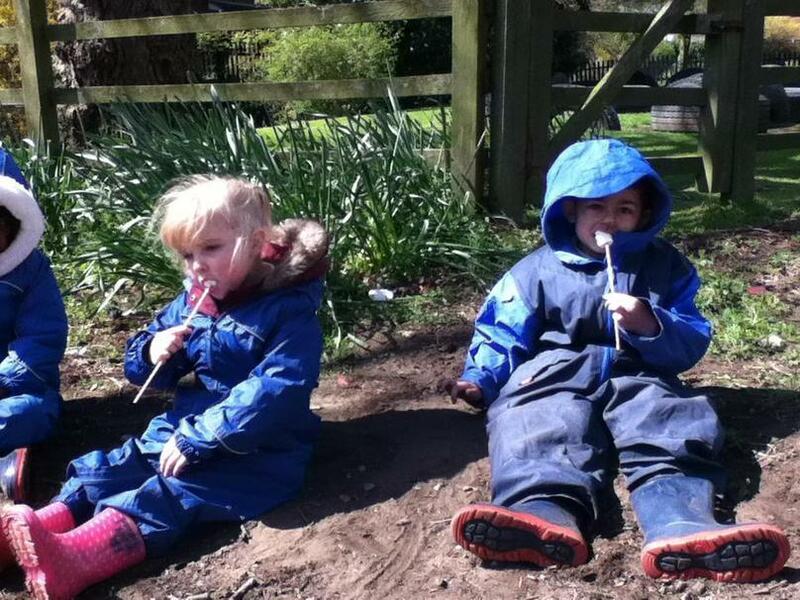 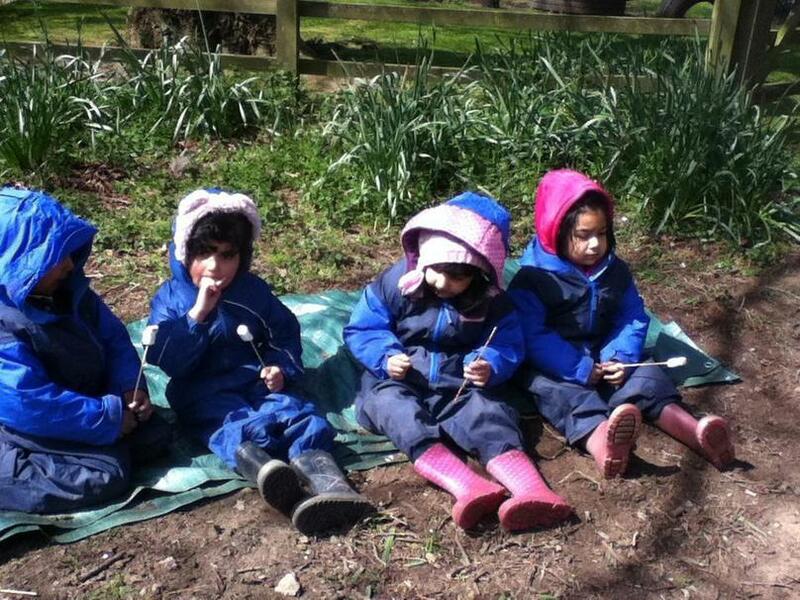 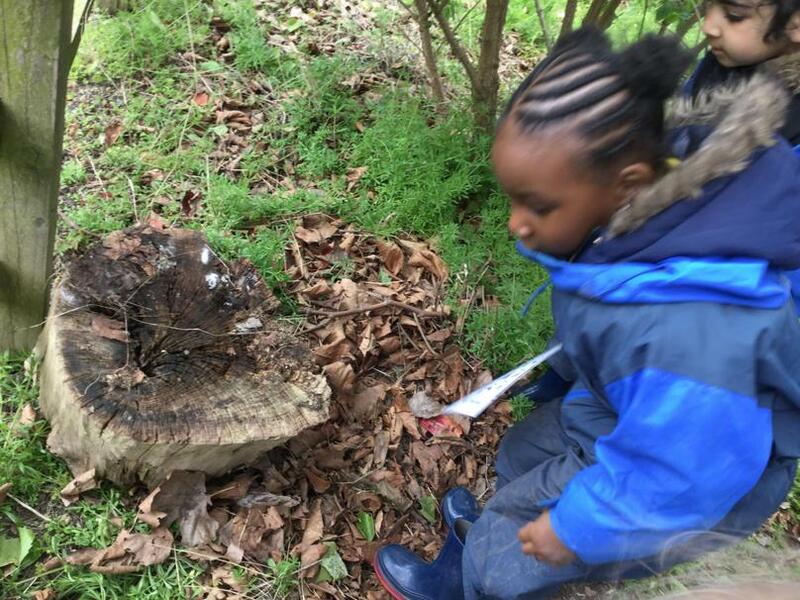 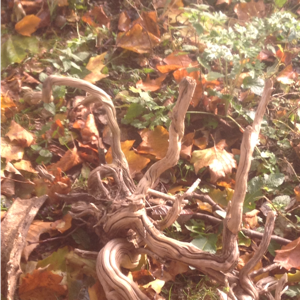 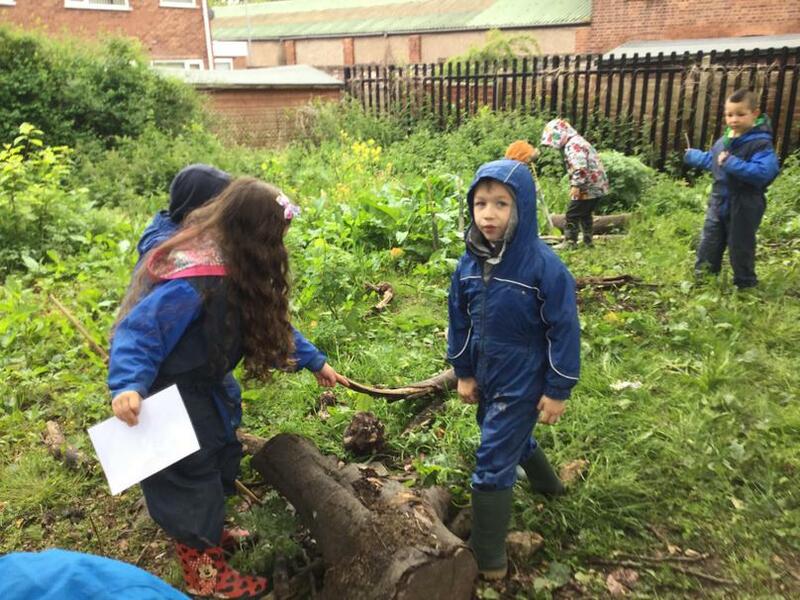 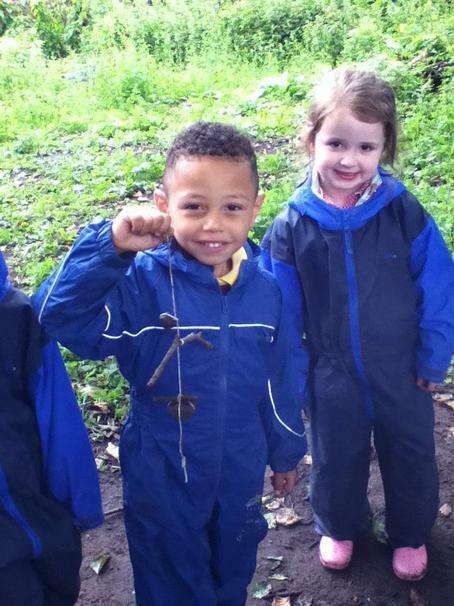 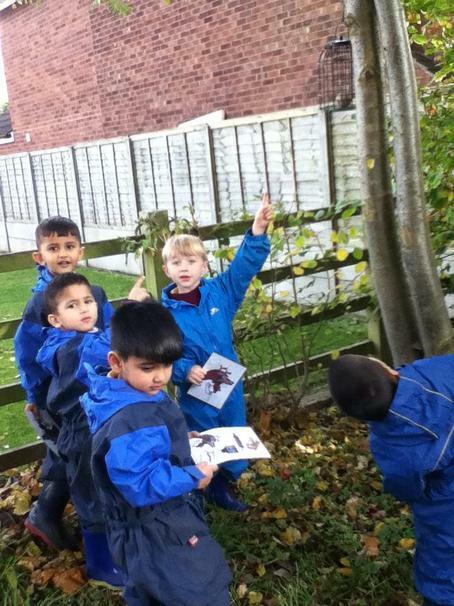 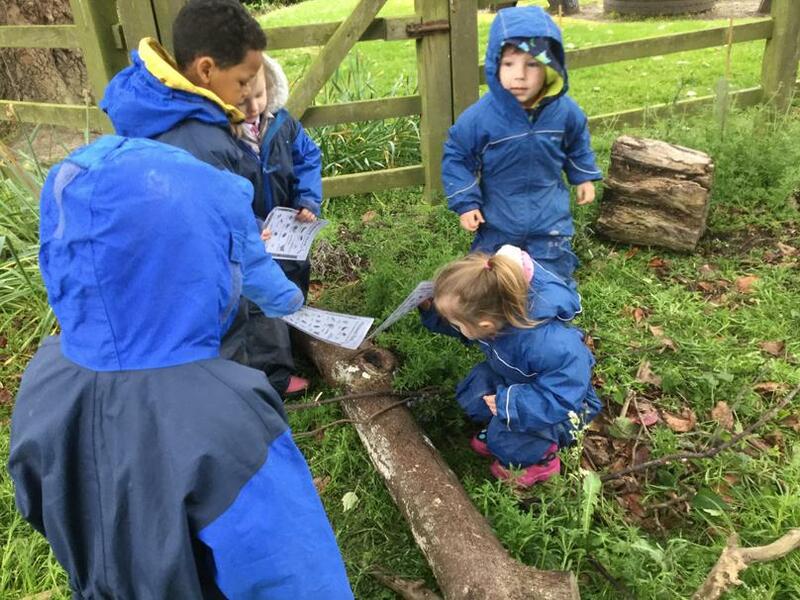 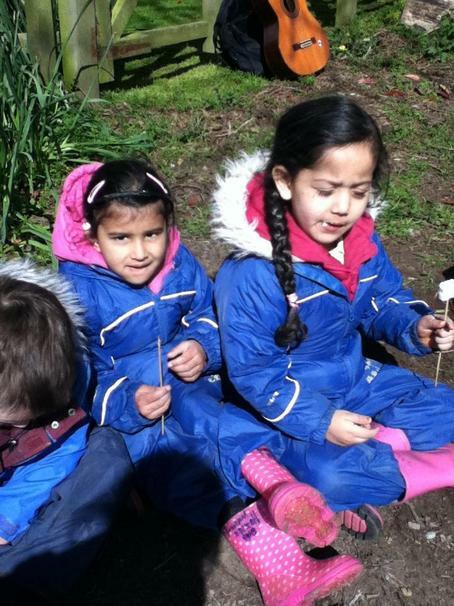 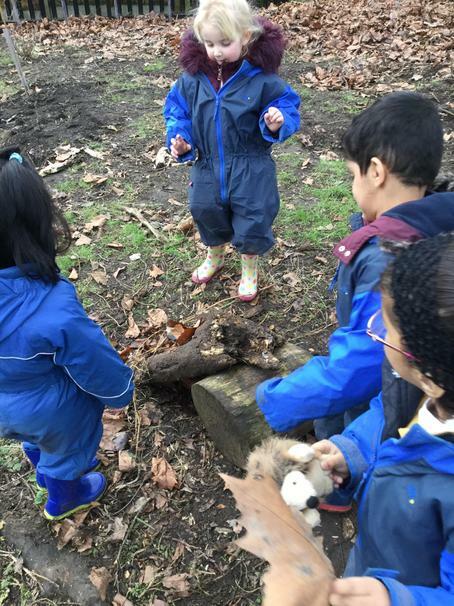 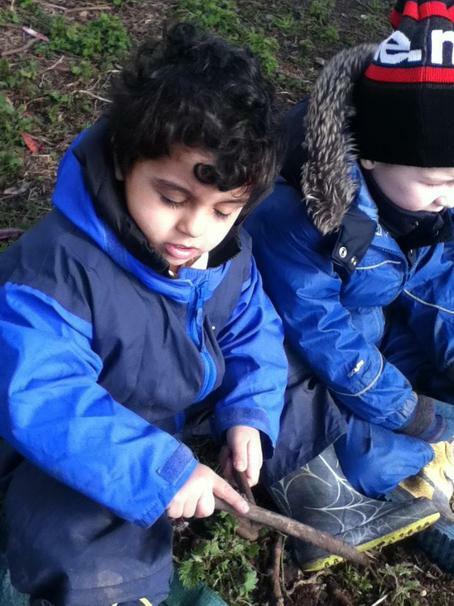 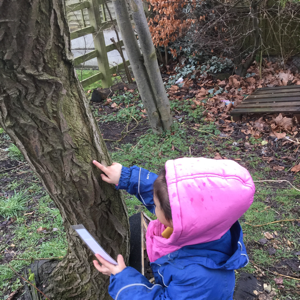 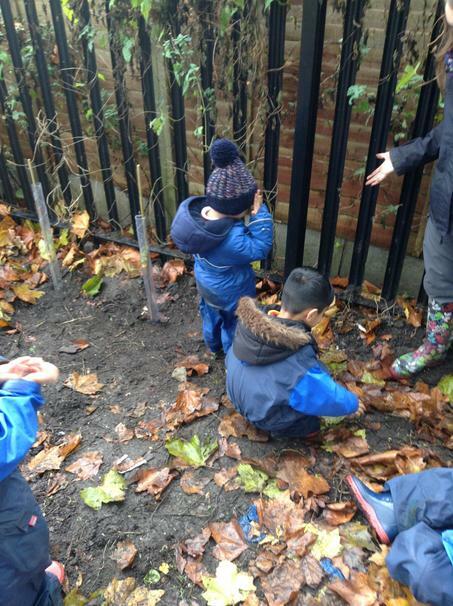 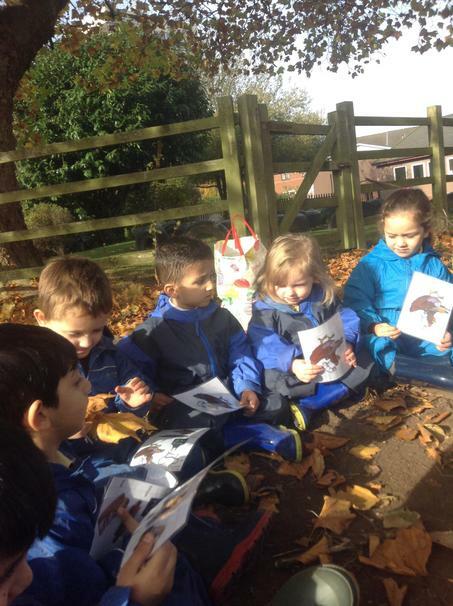 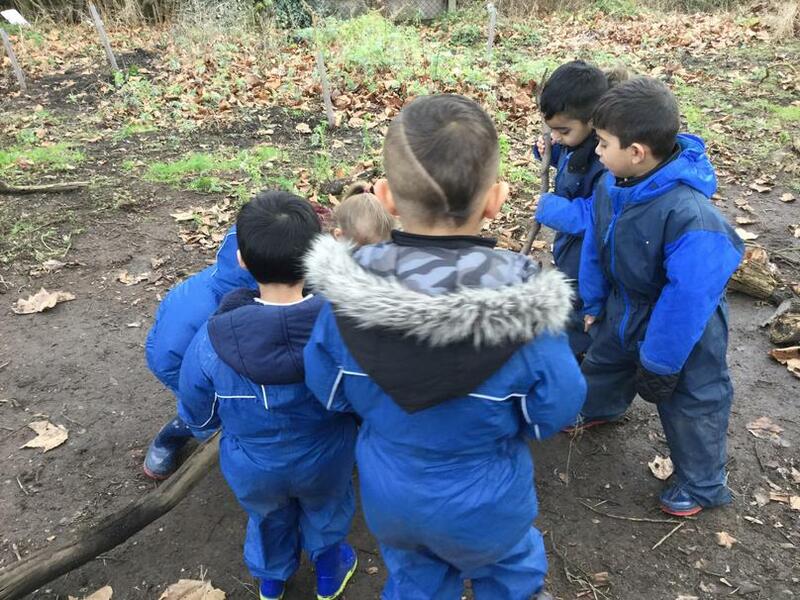 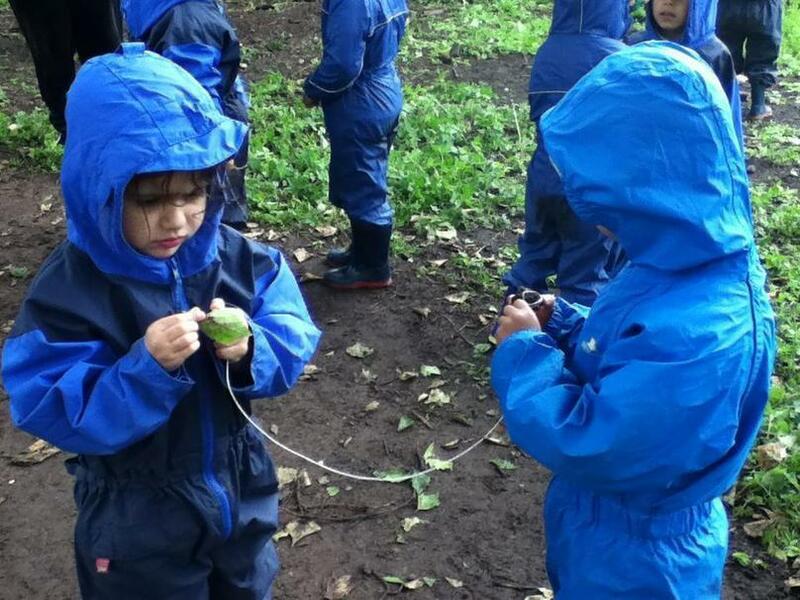 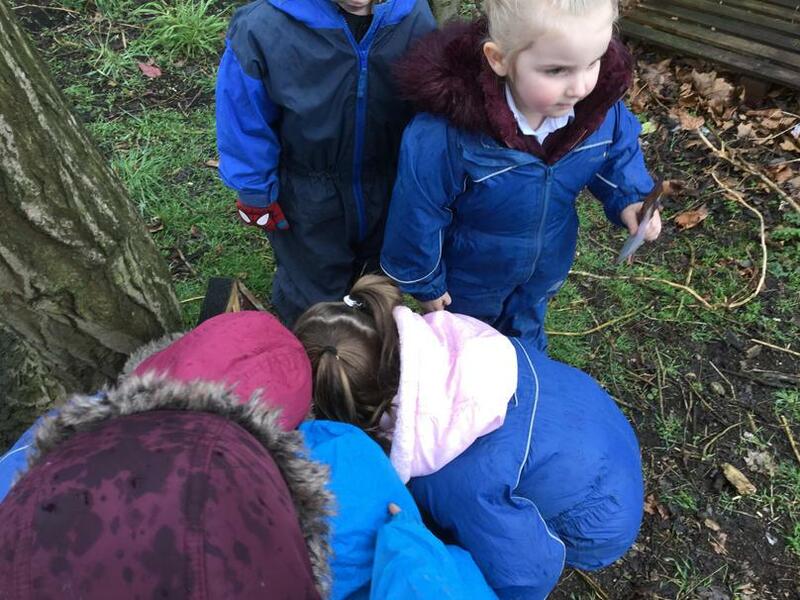 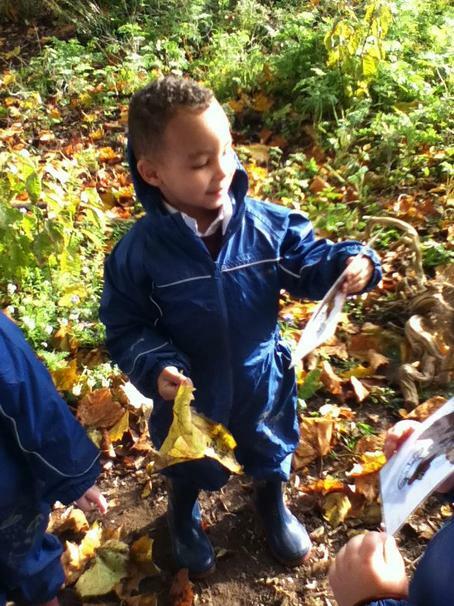 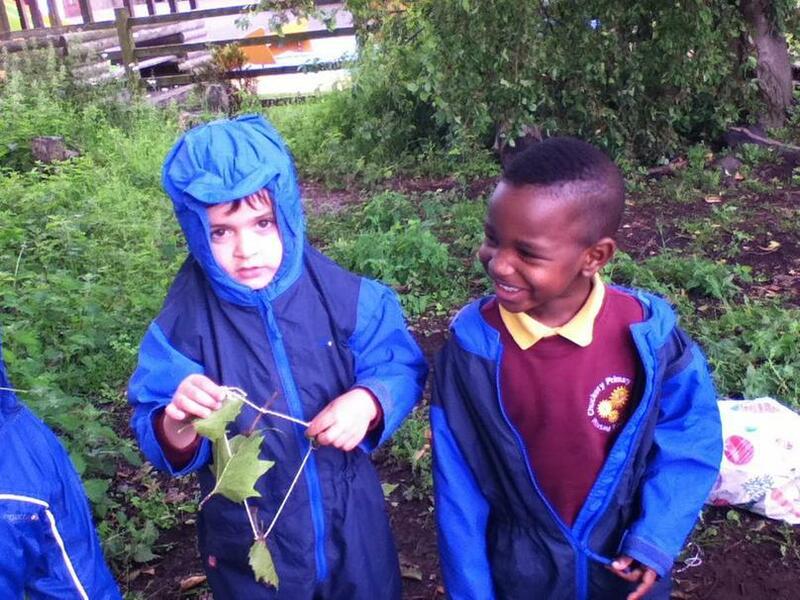 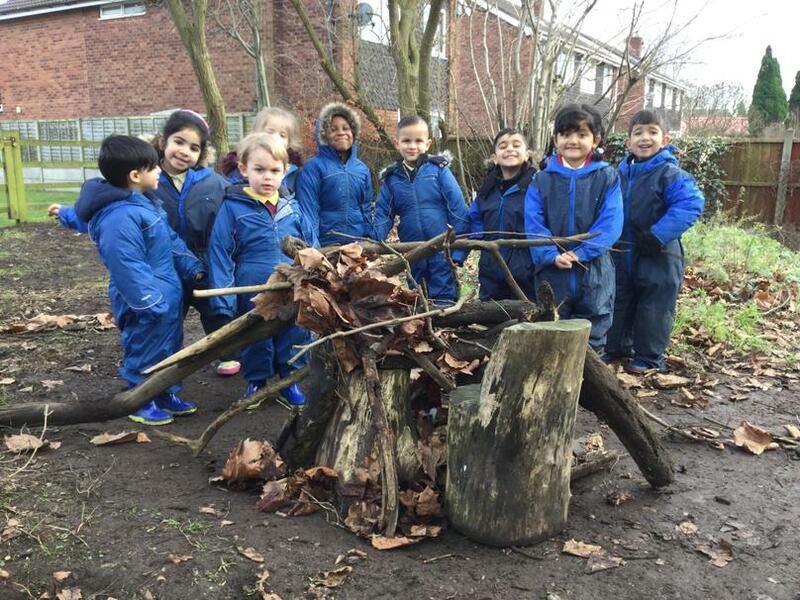 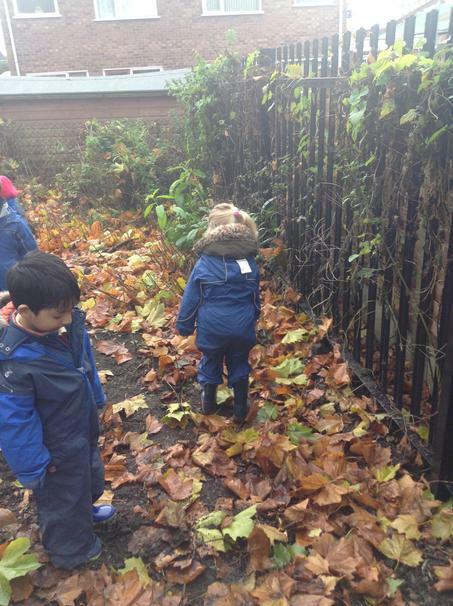 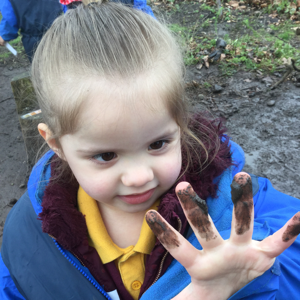 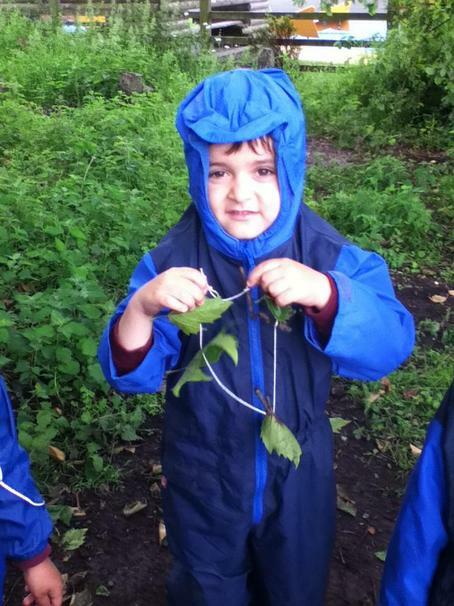 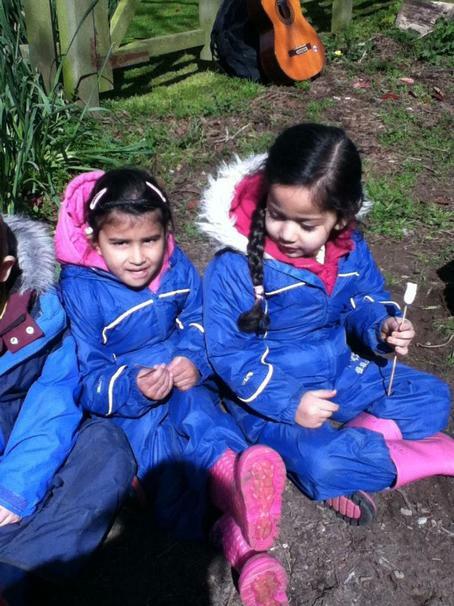 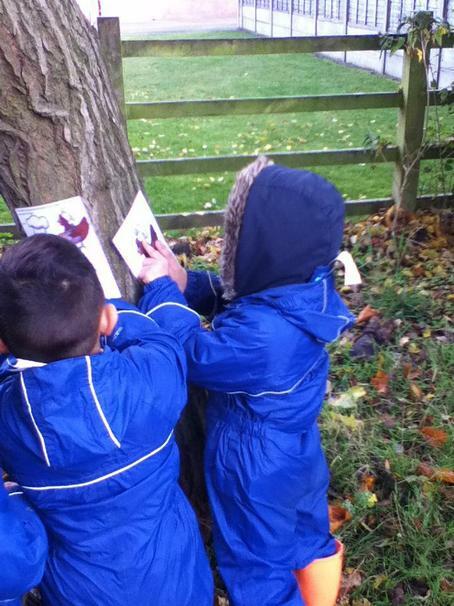 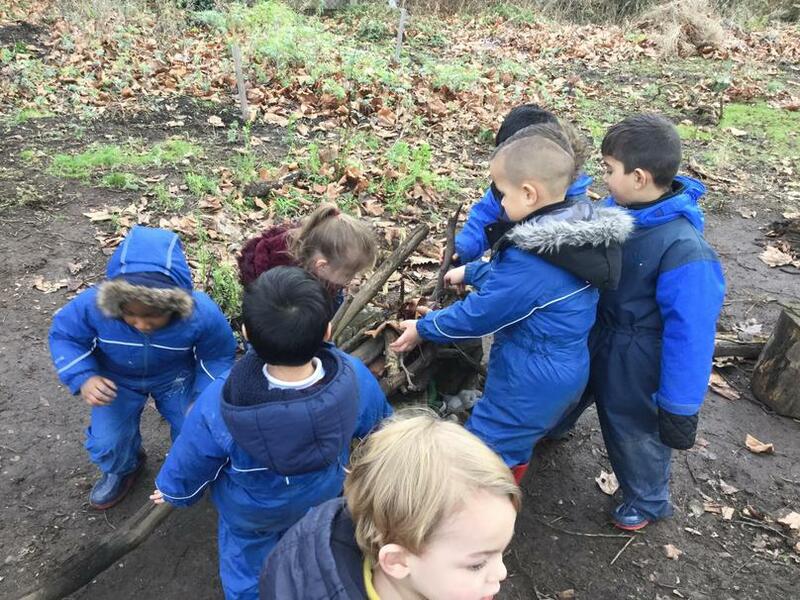 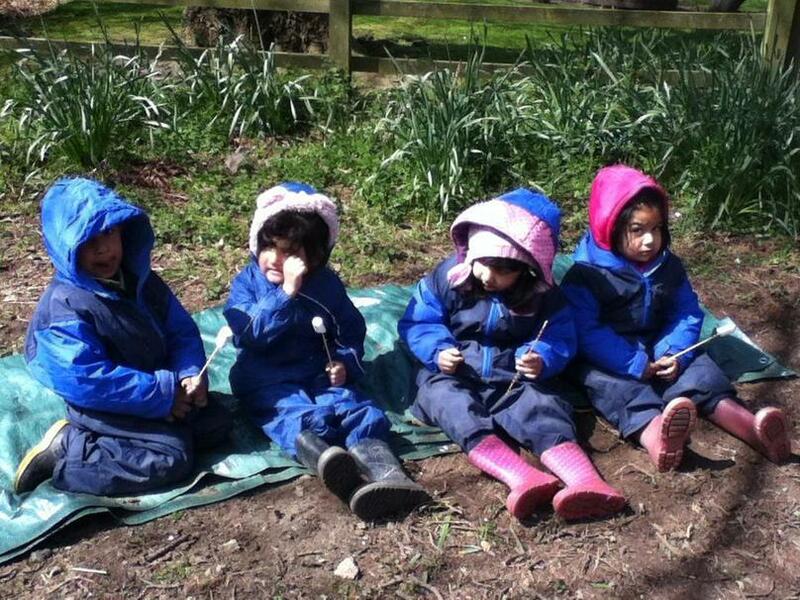 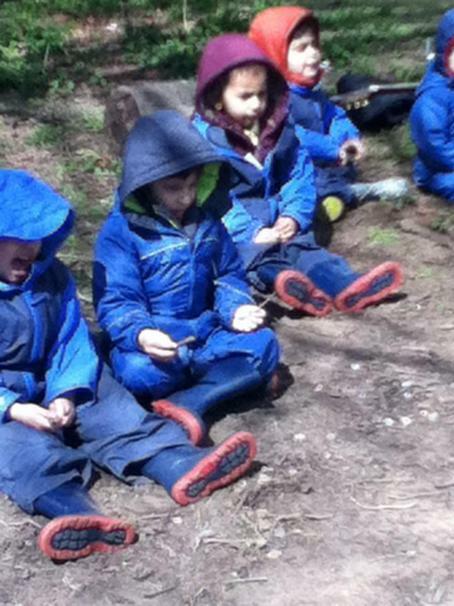 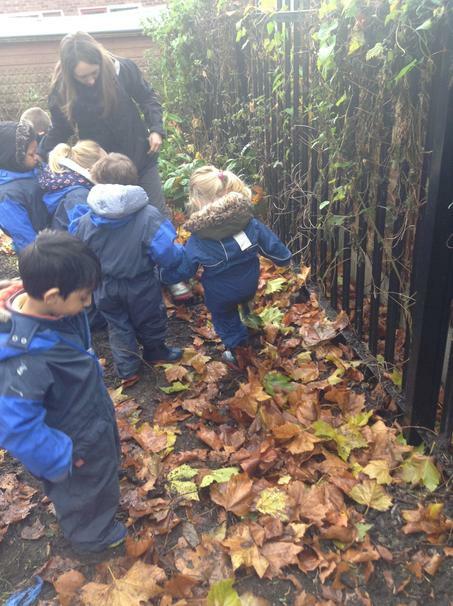 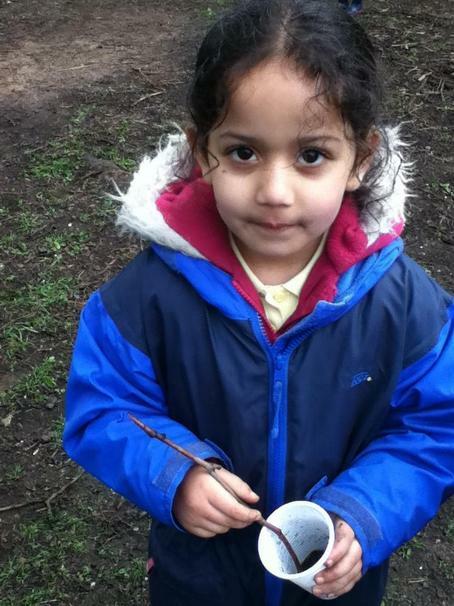 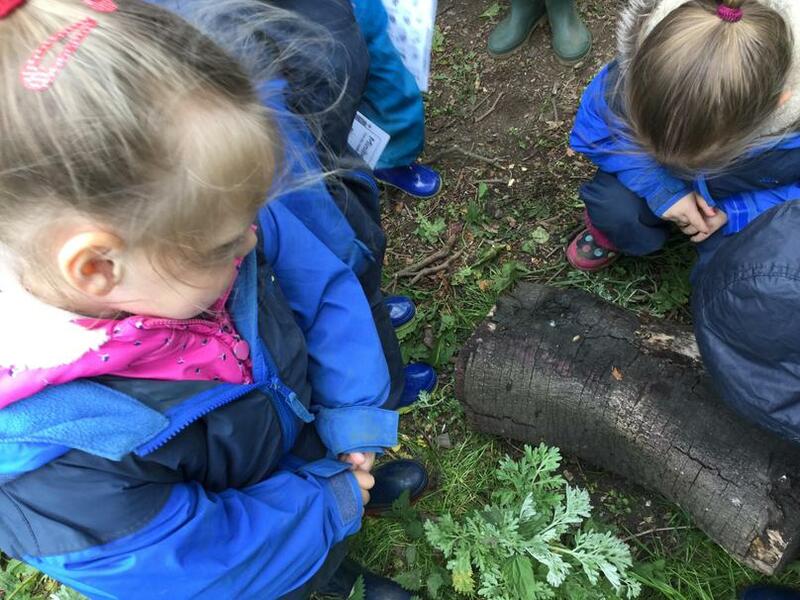 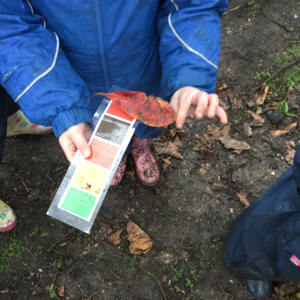 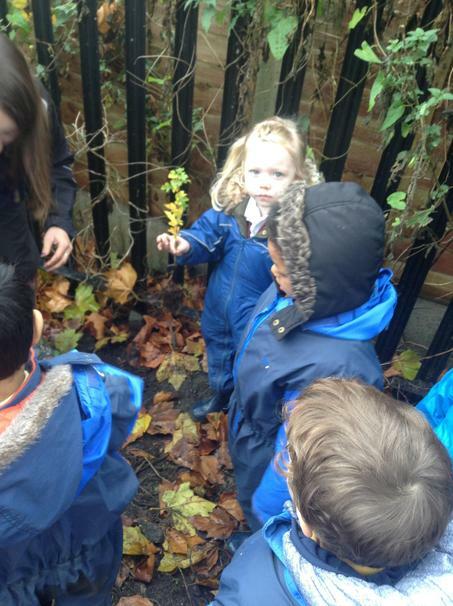 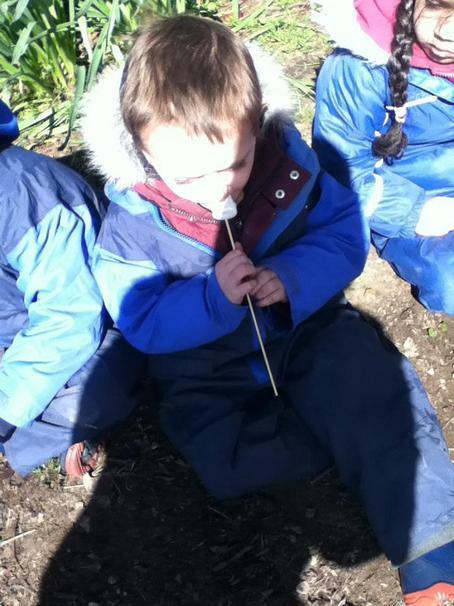 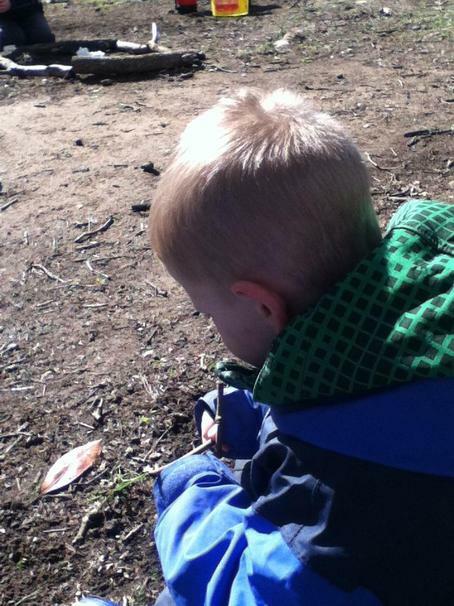 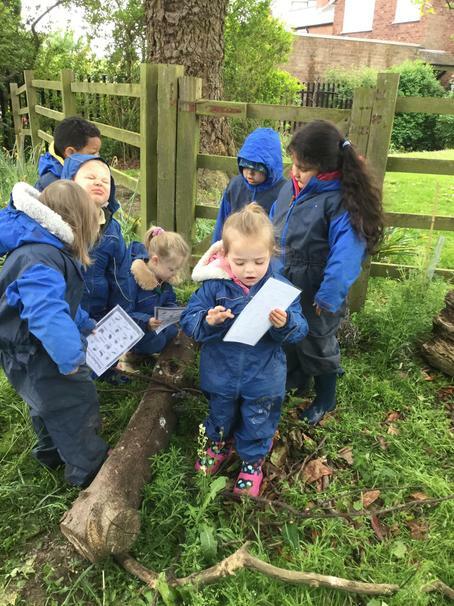 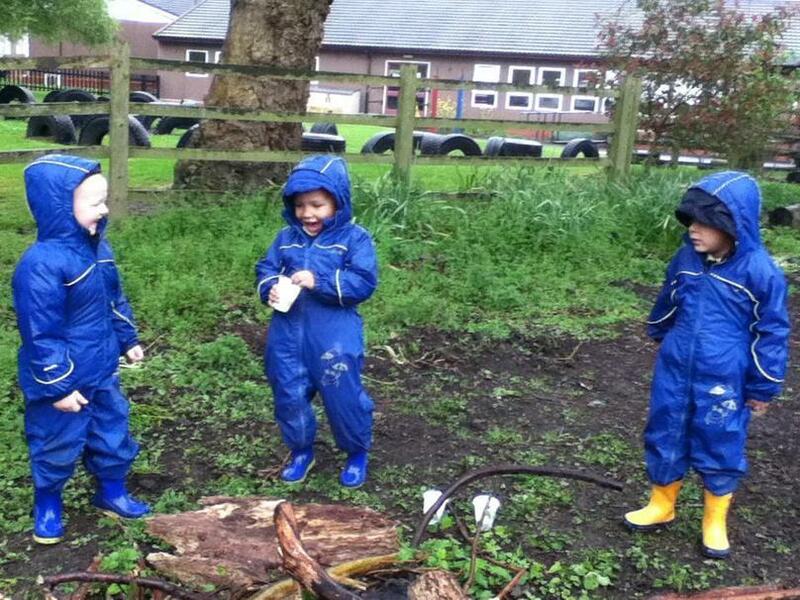 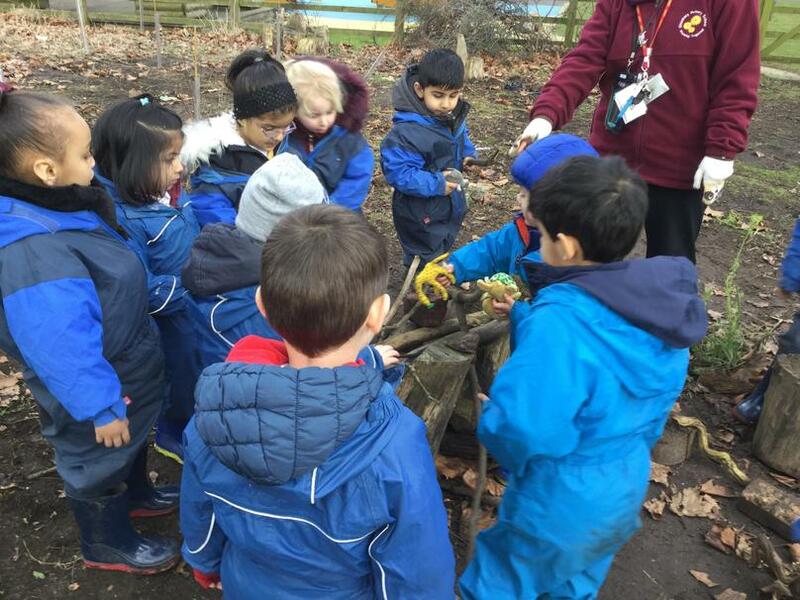 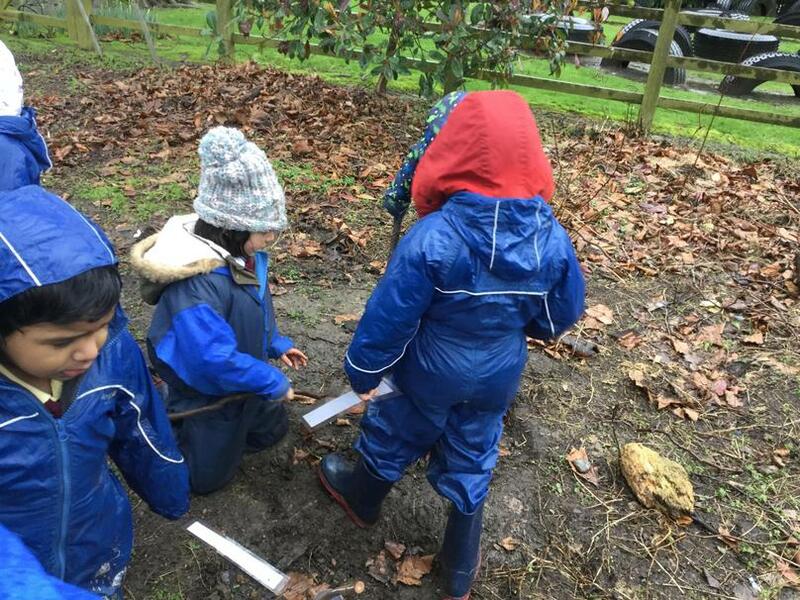 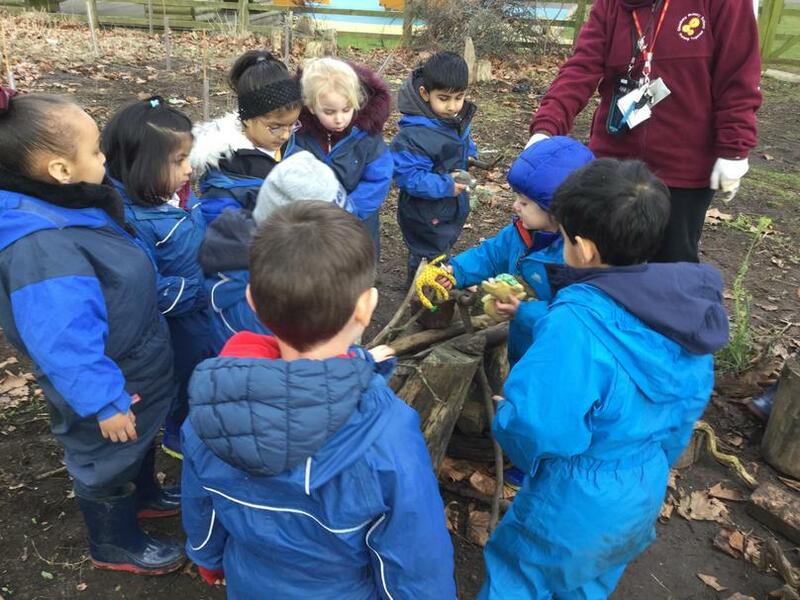 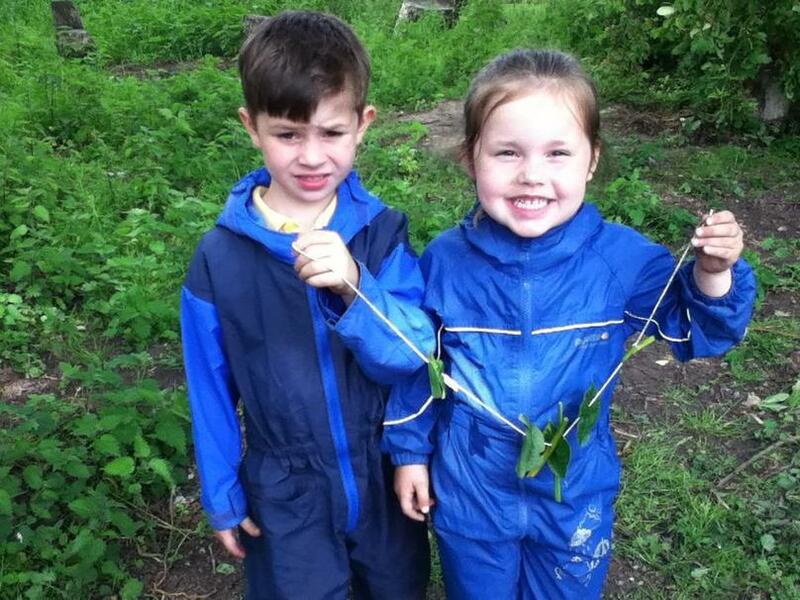 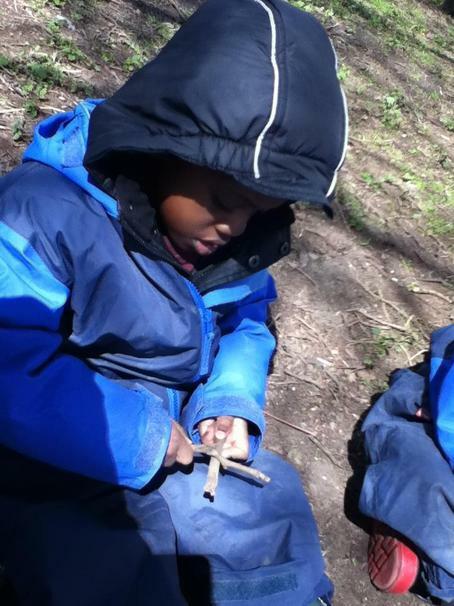 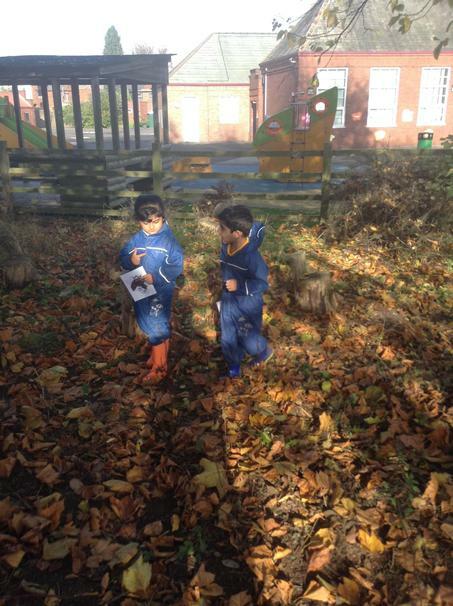 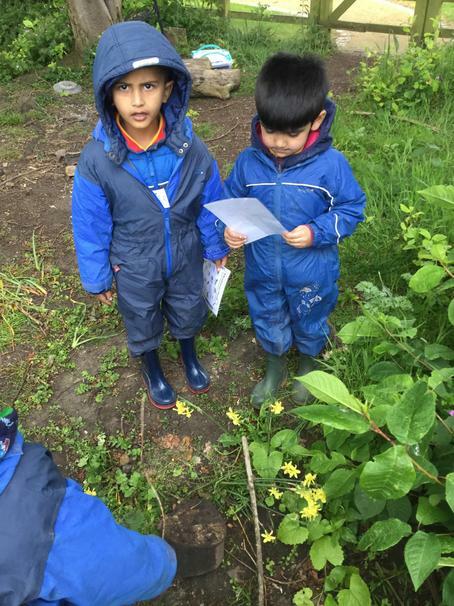 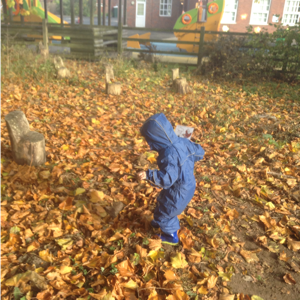 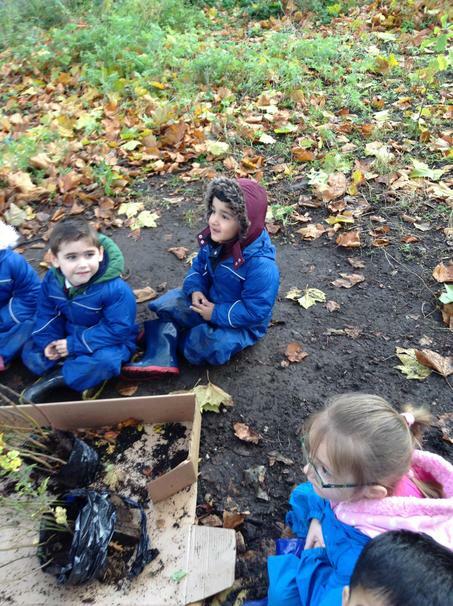 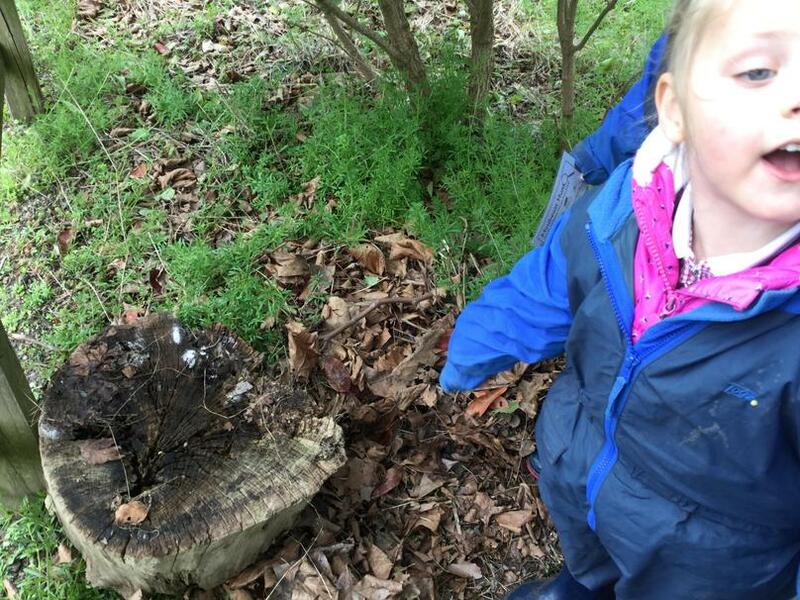 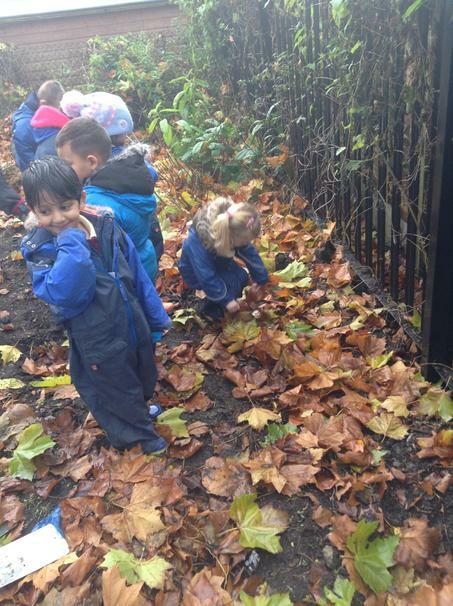 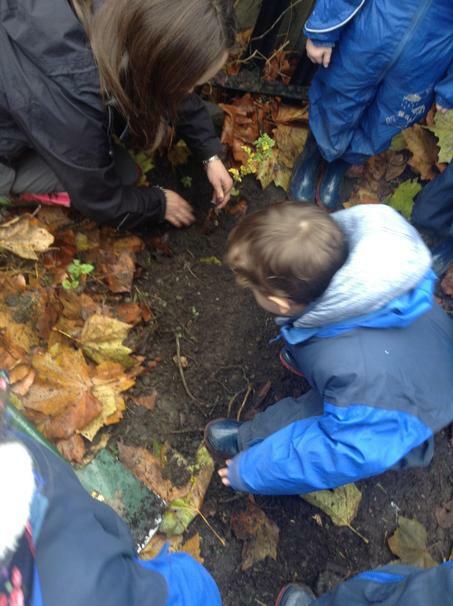 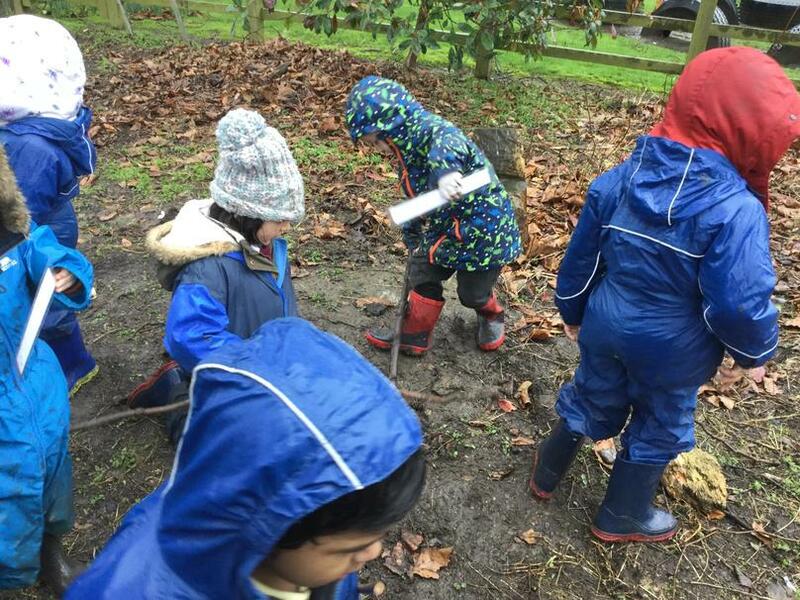 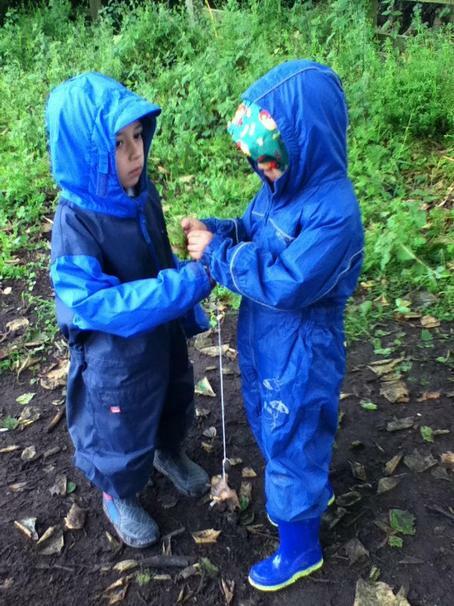 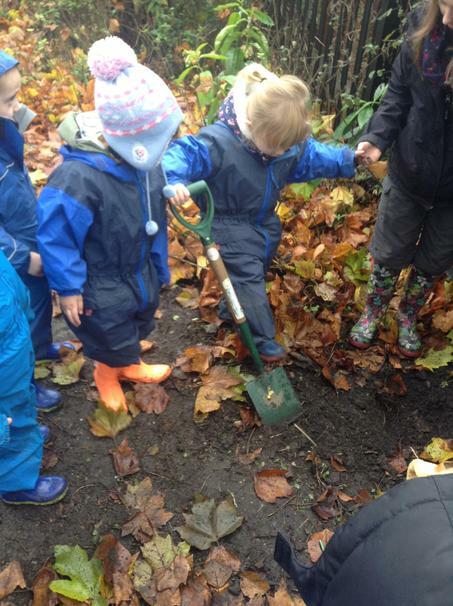 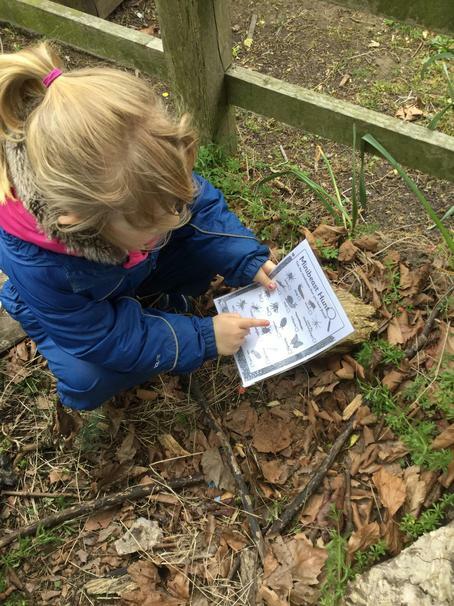 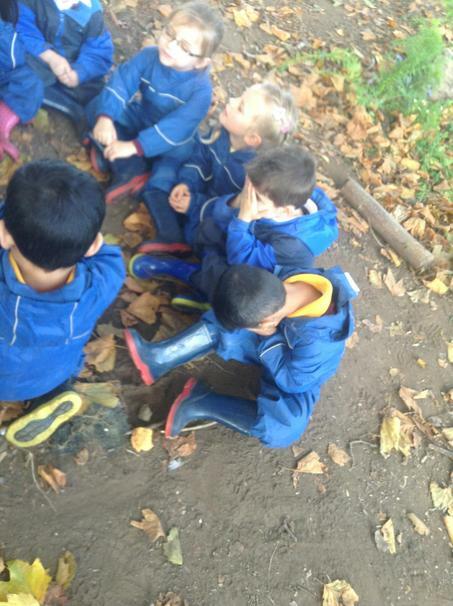 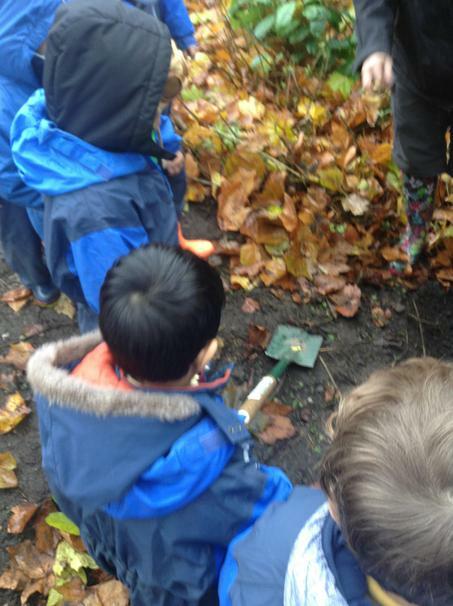 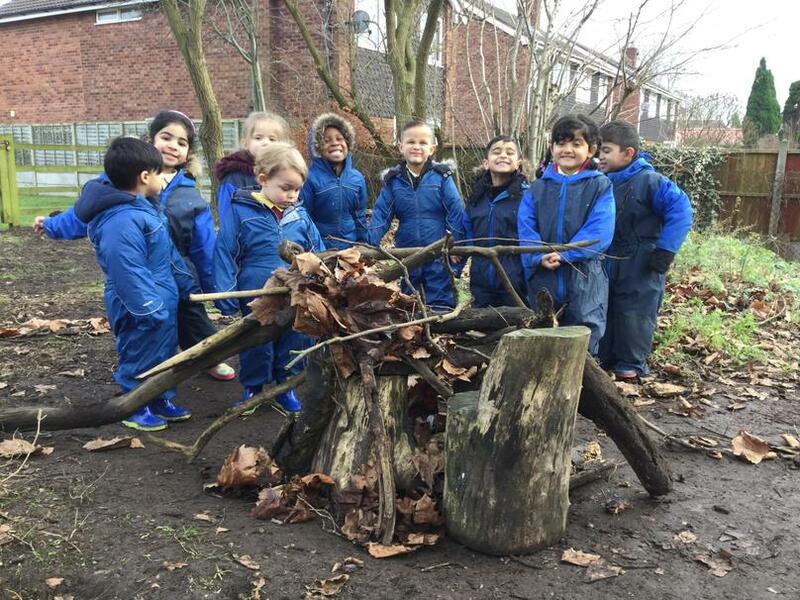 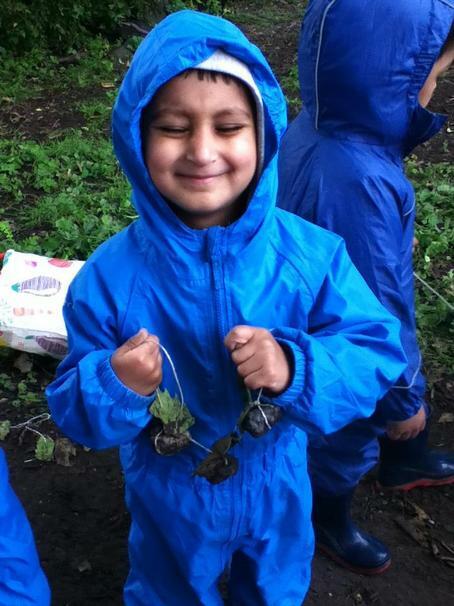 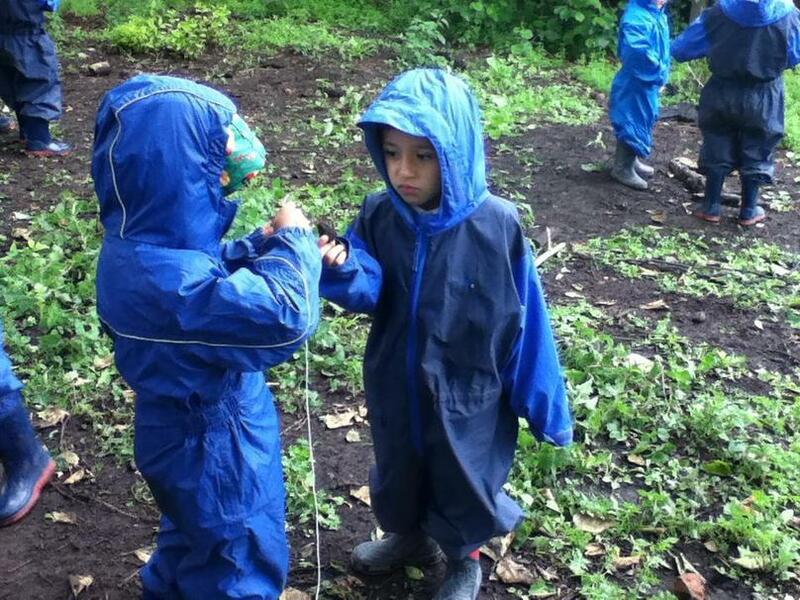 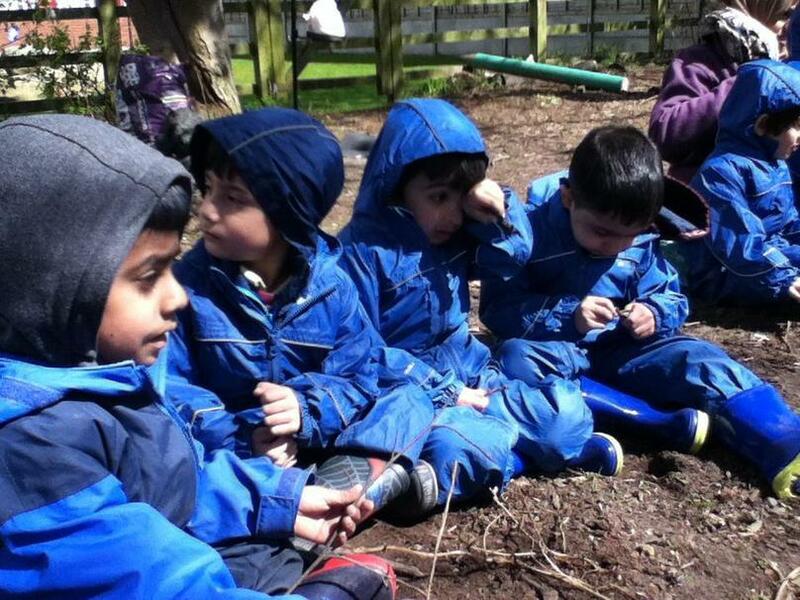 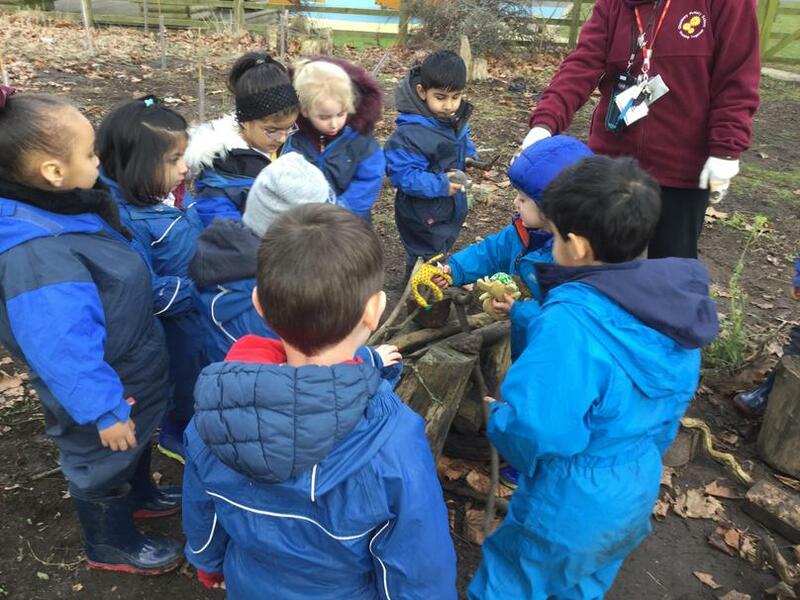 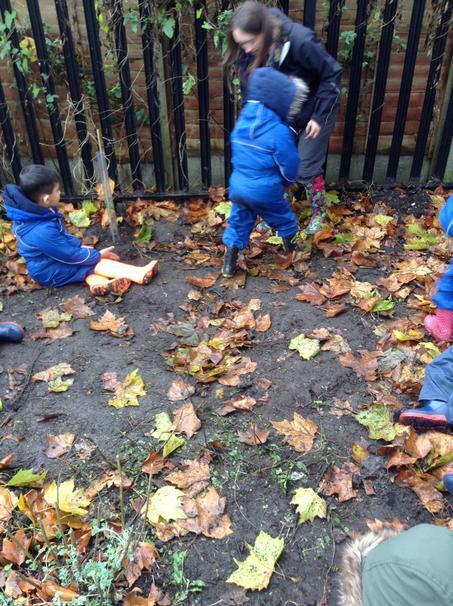 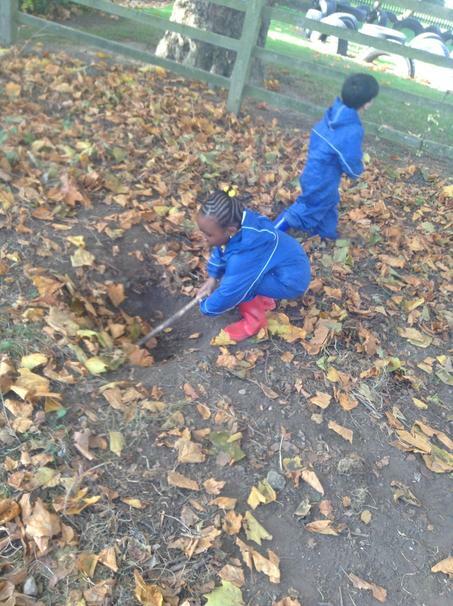 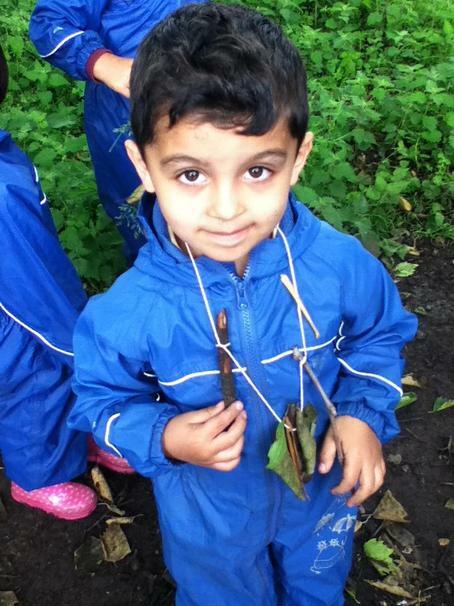 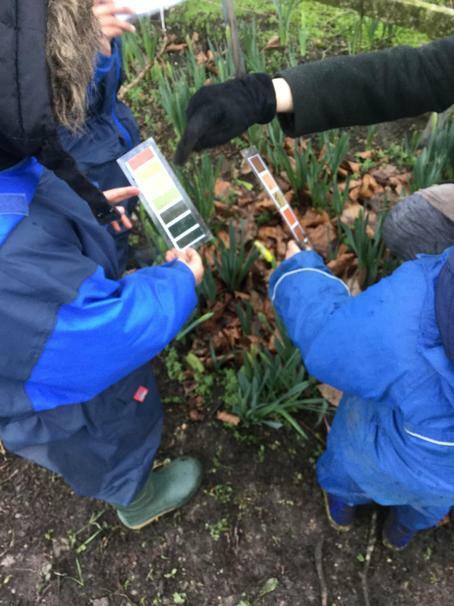 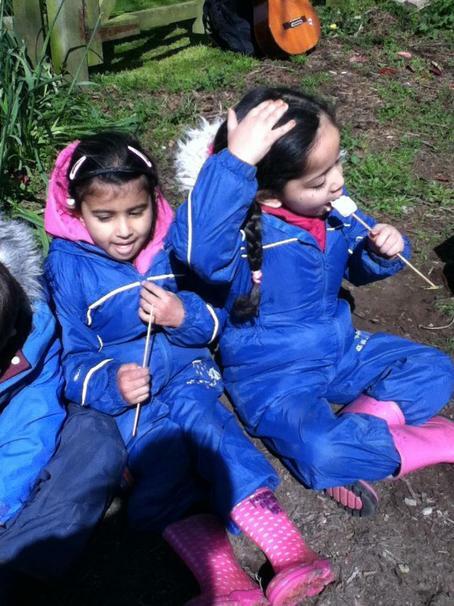 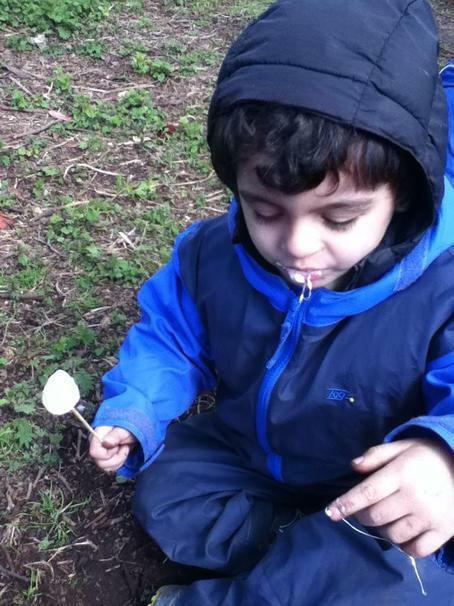 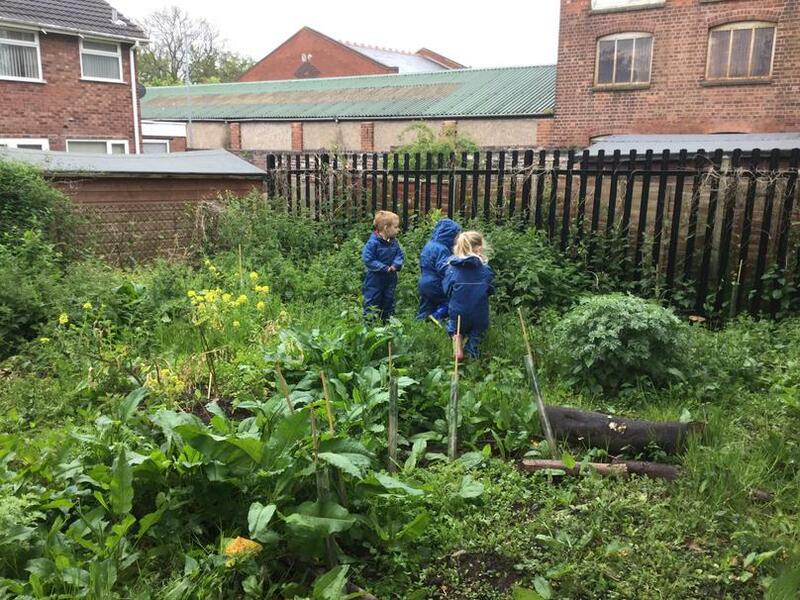 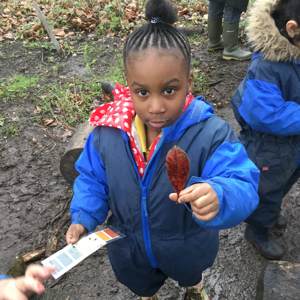 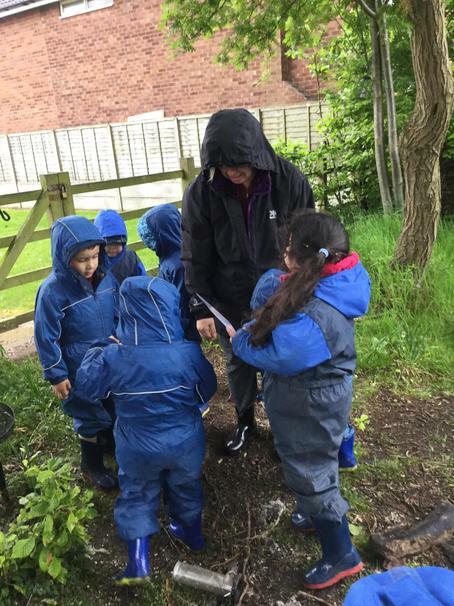 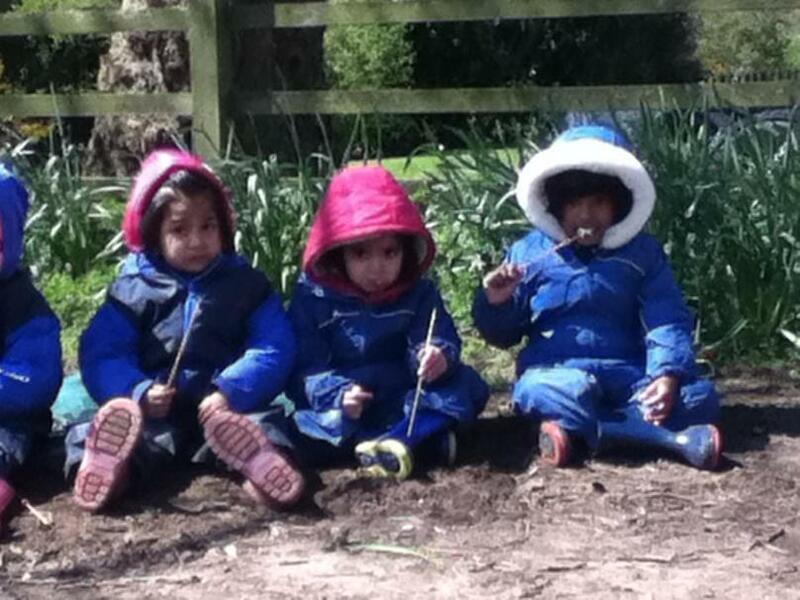 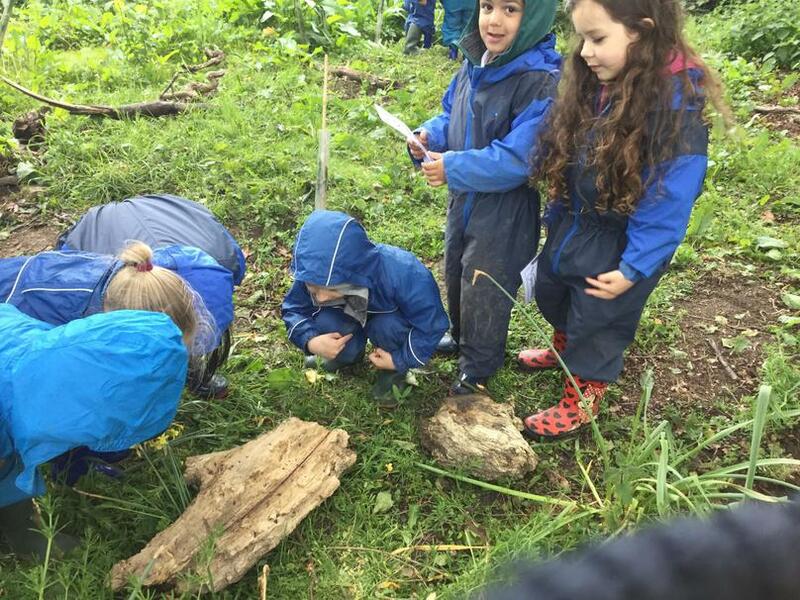 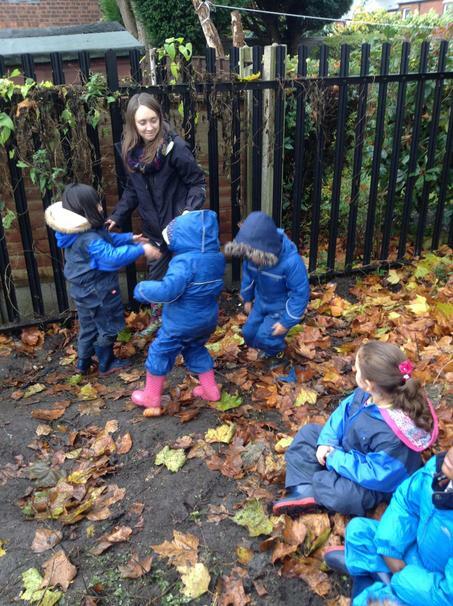 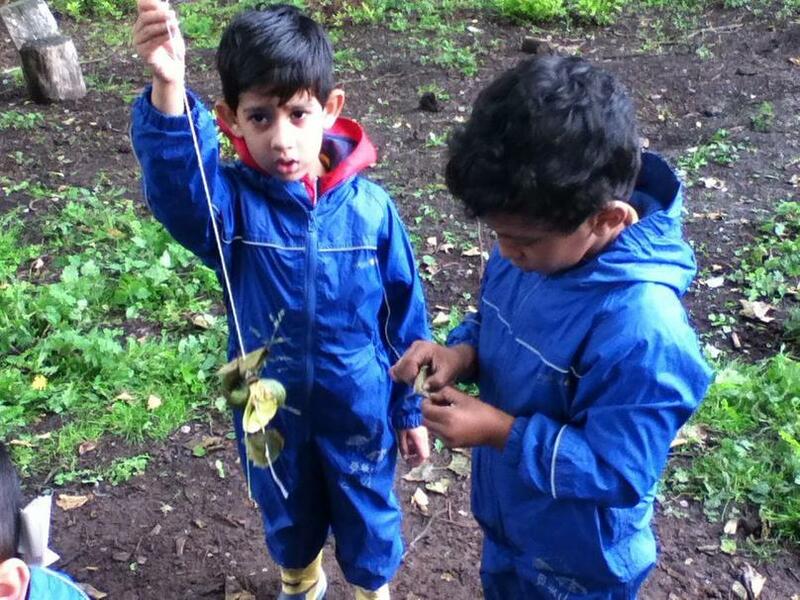 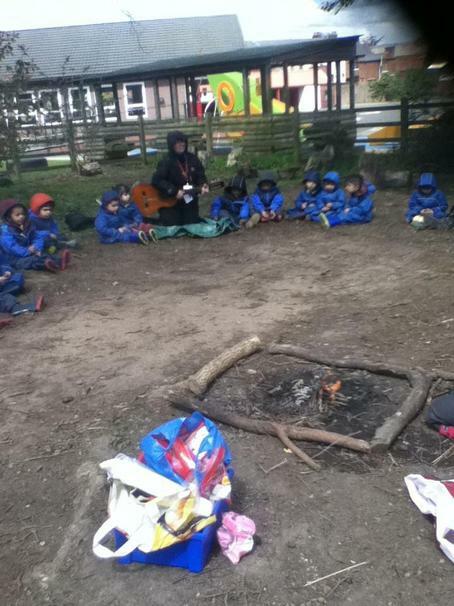 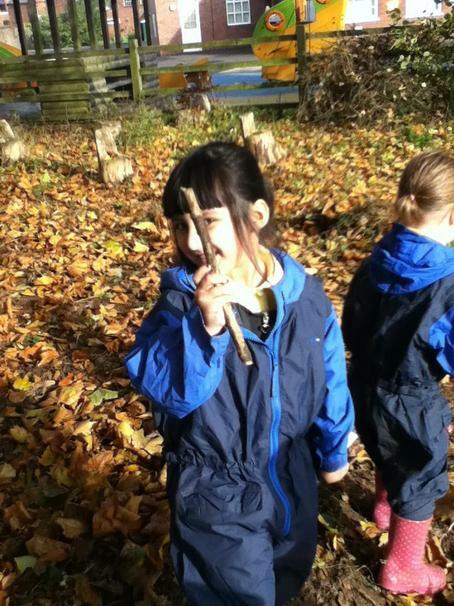 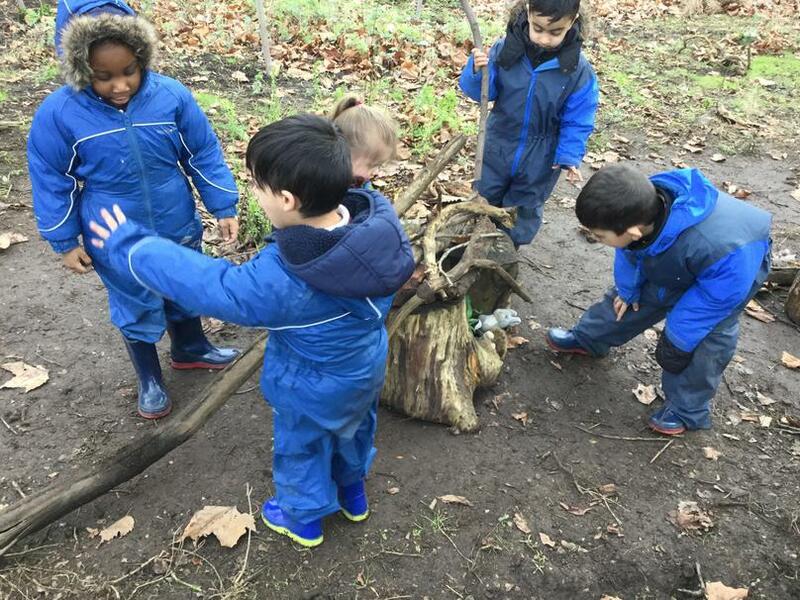 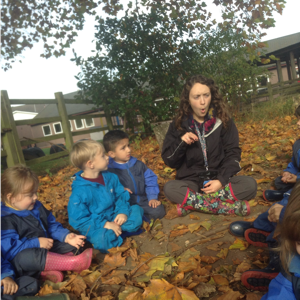 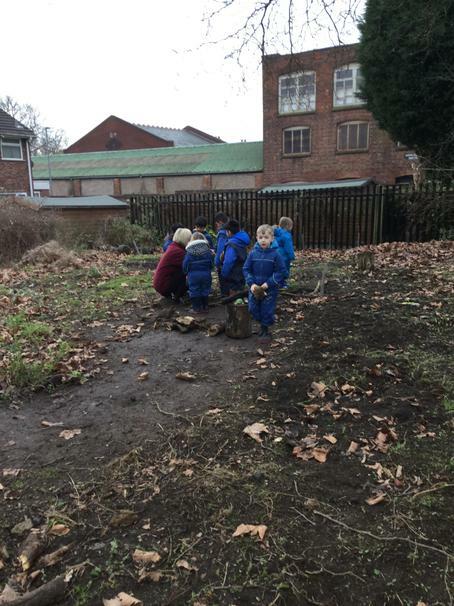 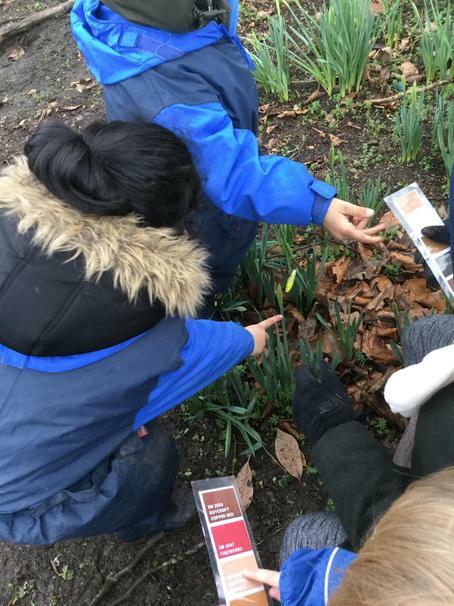 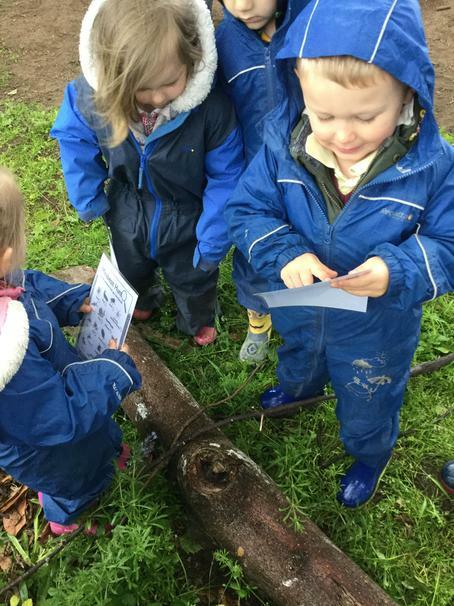 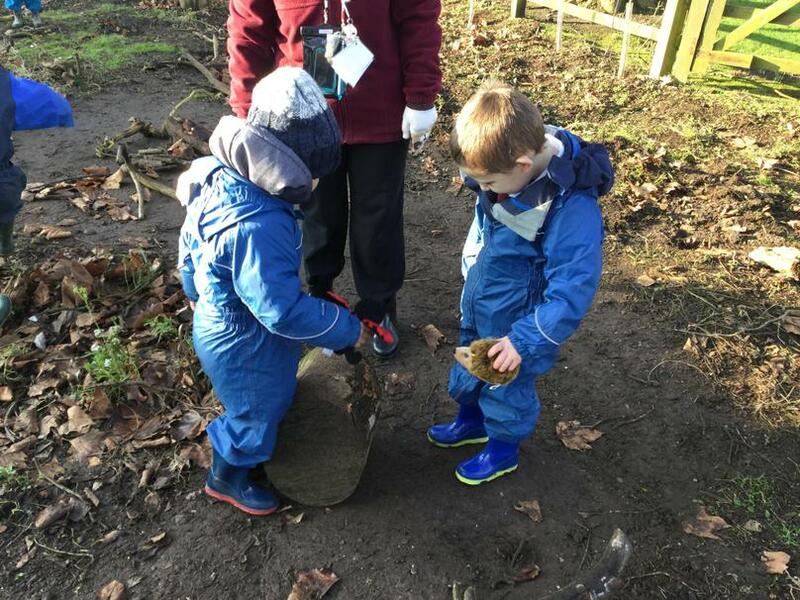 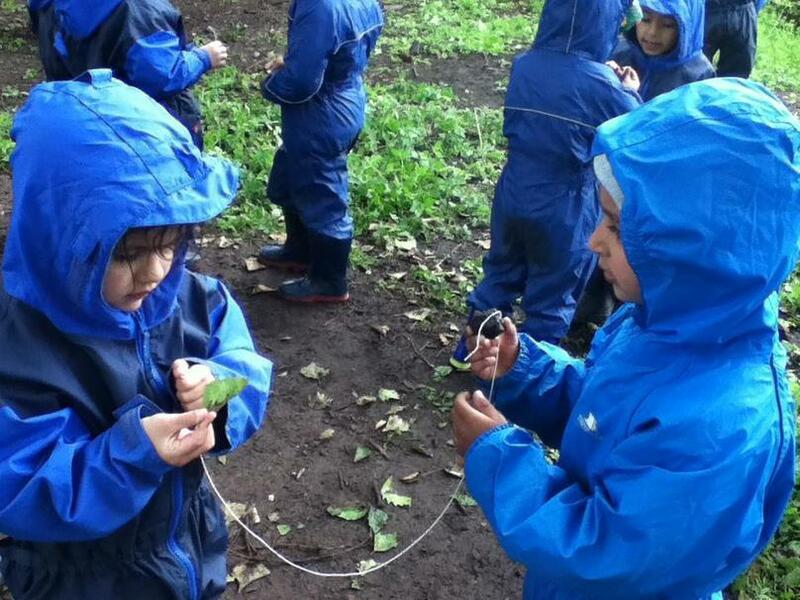 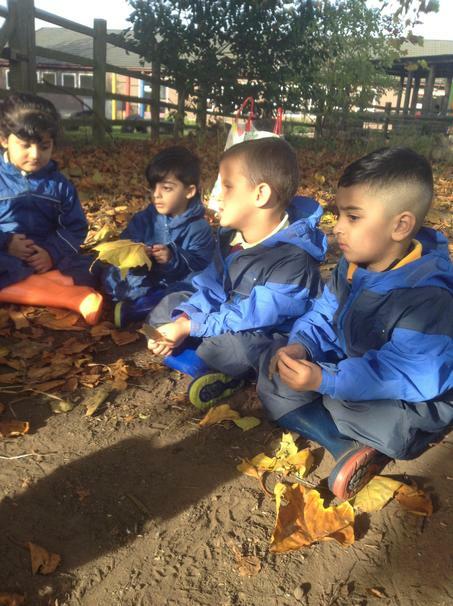 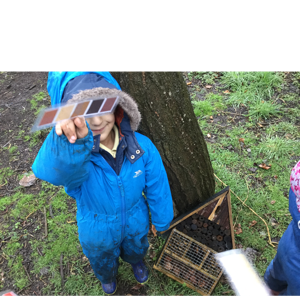 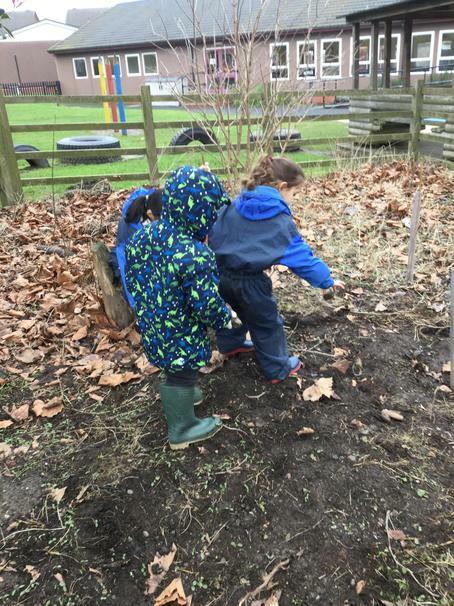 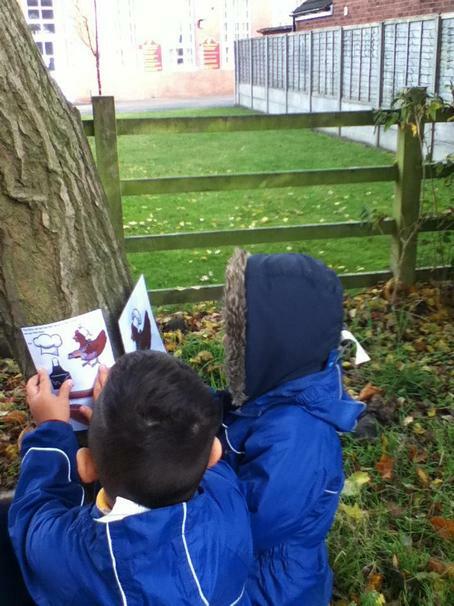 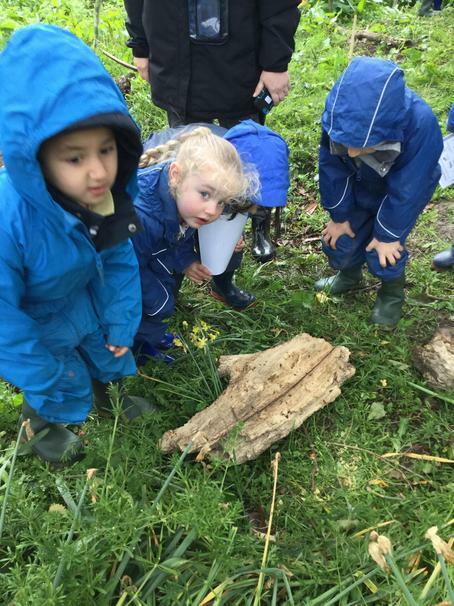 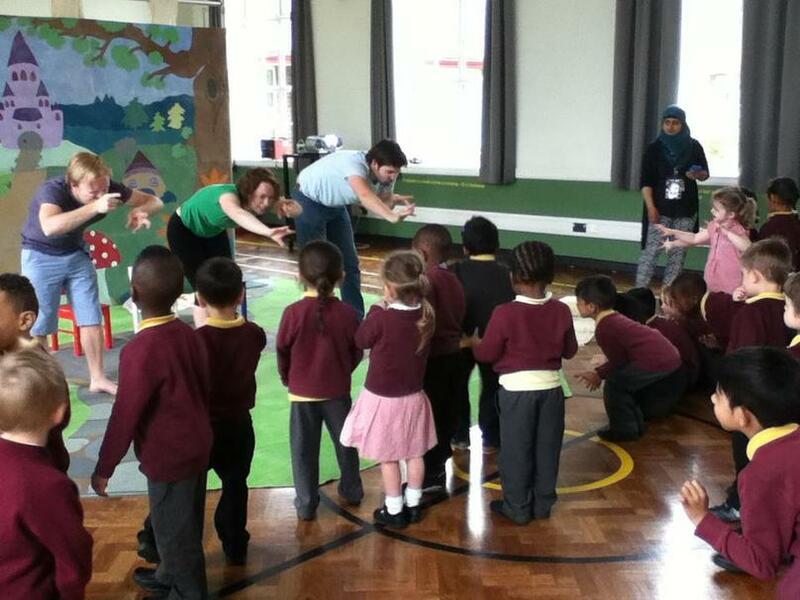 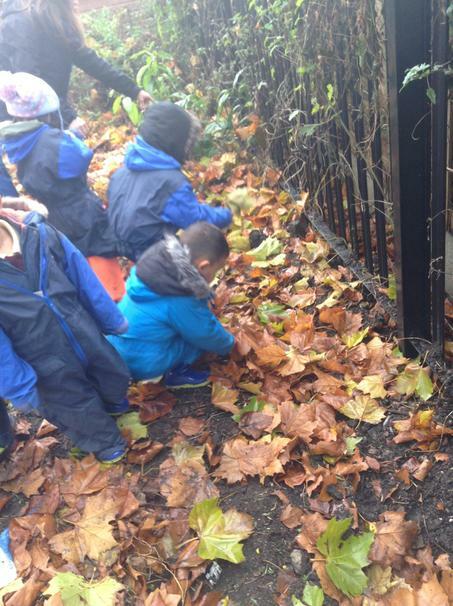 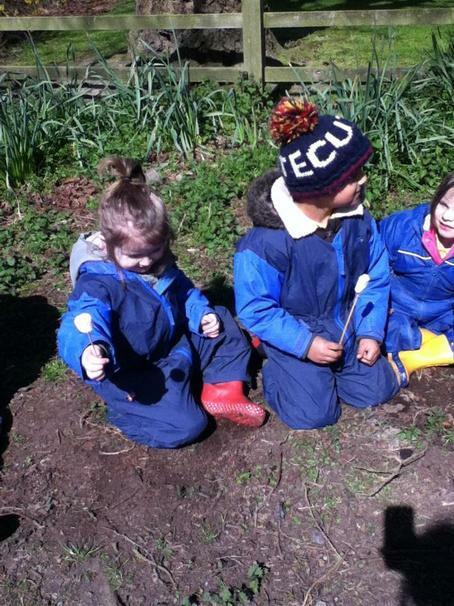 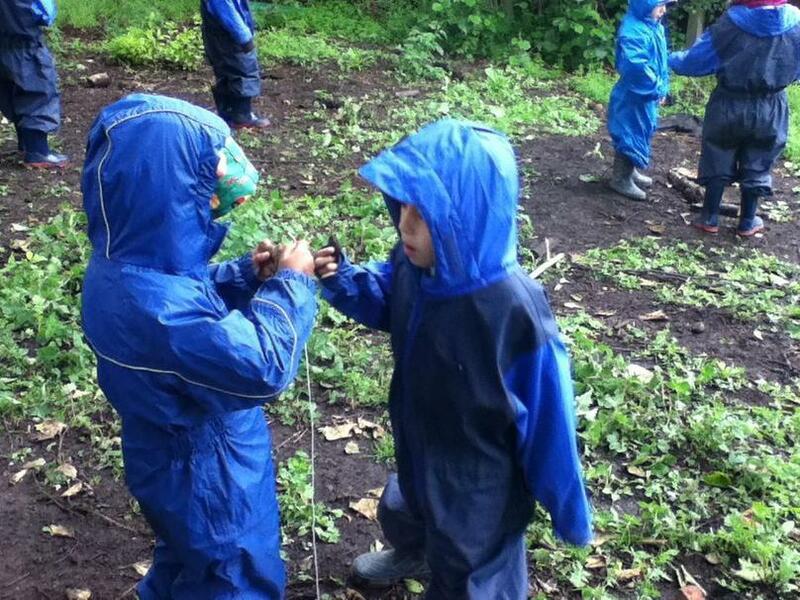 "Nursery enjoyed exploring the forest again this week! 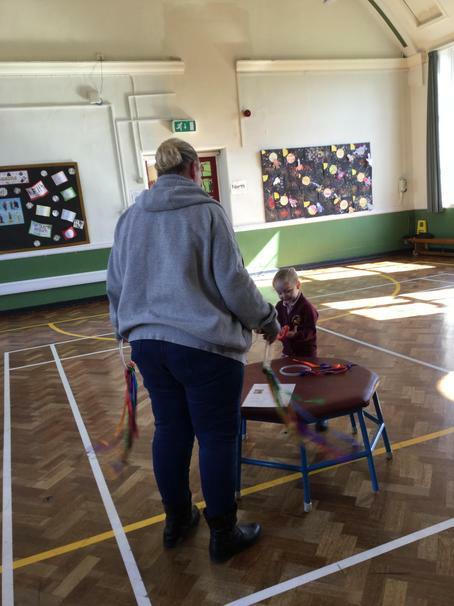 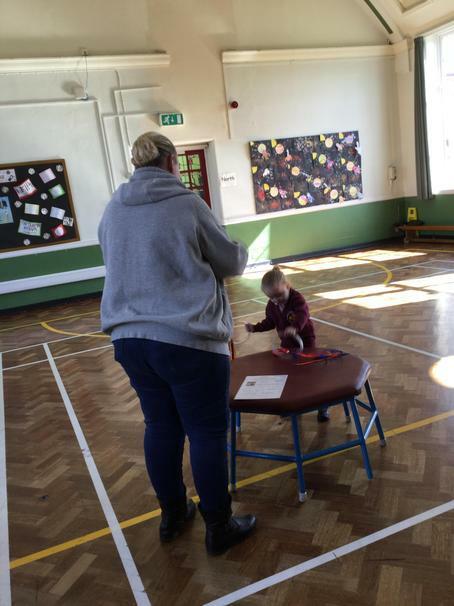 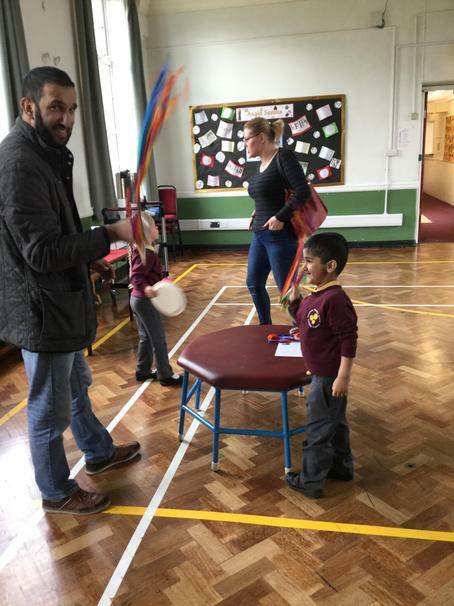 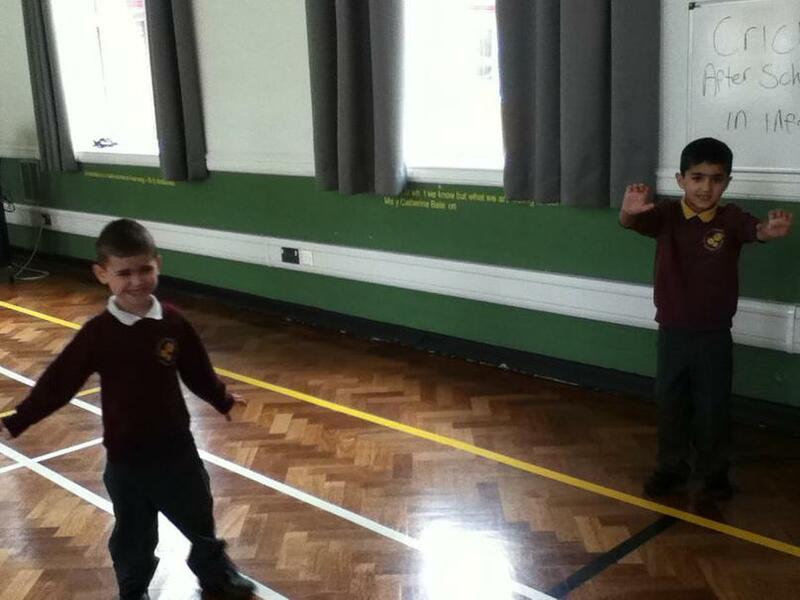 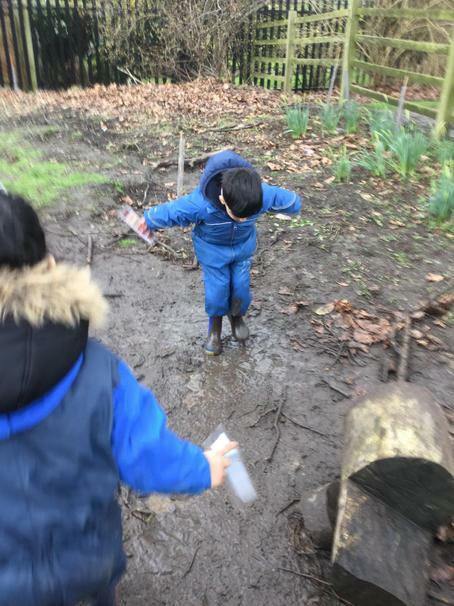 We enjoyed looking to see what we could see in hoops and we had time to explored ourselves and we discovered our own see-saw! 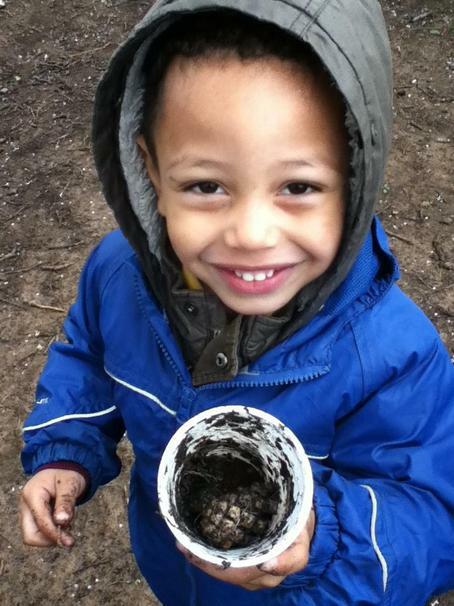 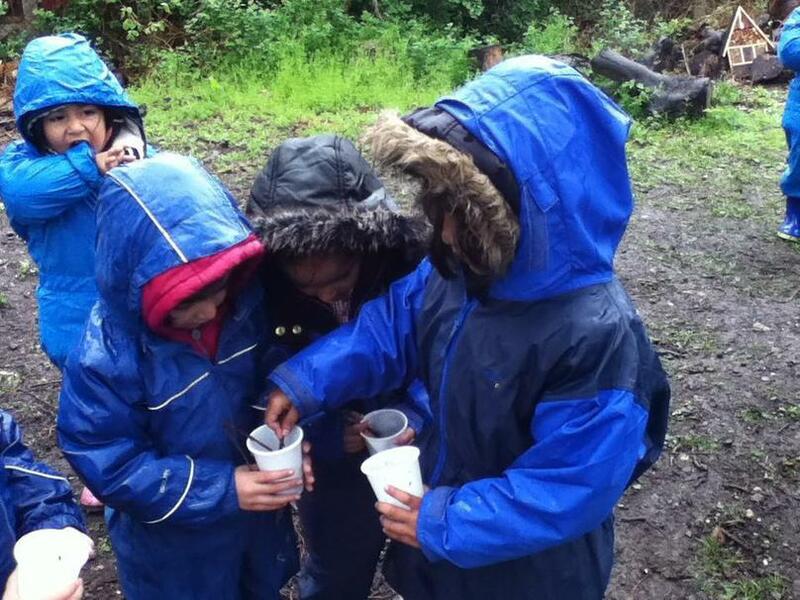 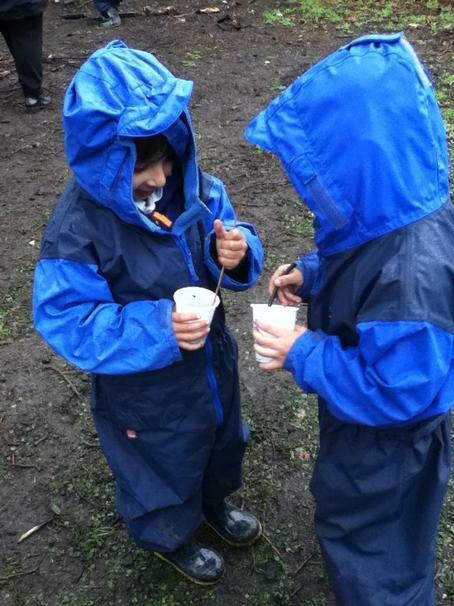 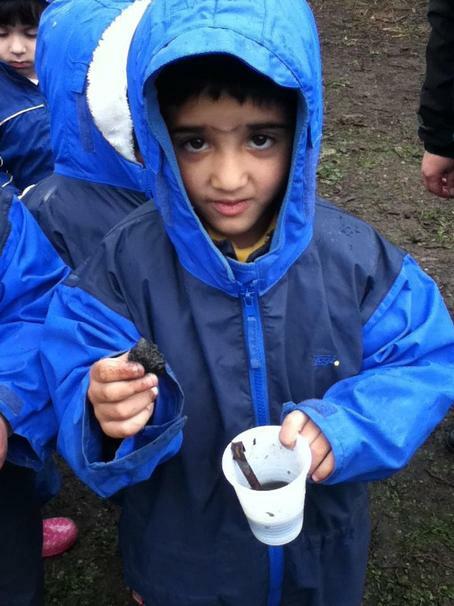 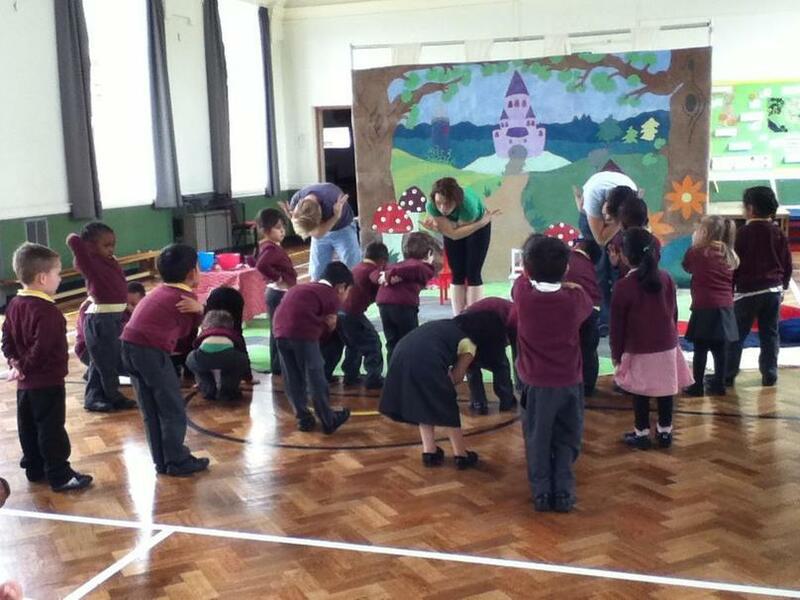 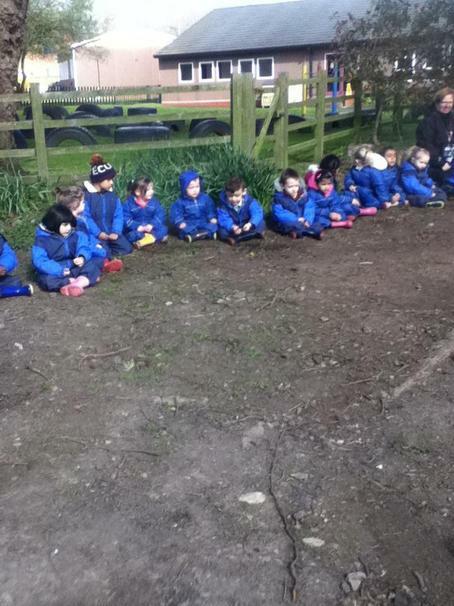 We also enjoyed mixing water with the dry soil to make mud pies!" 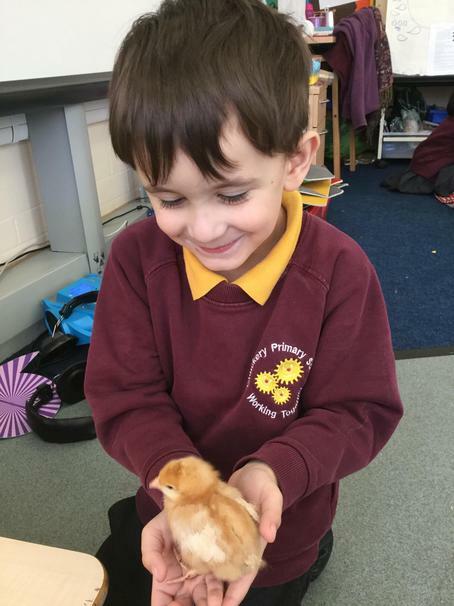 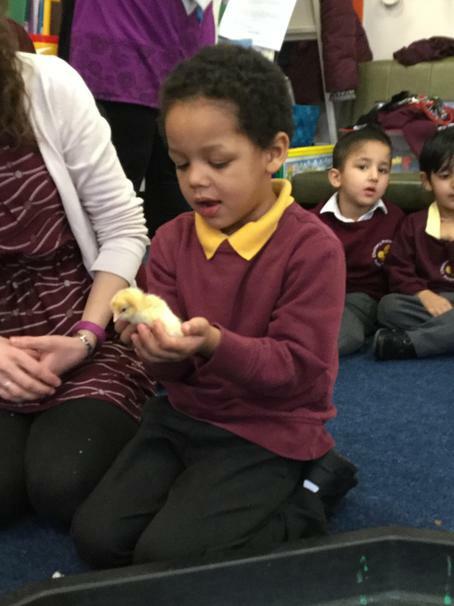 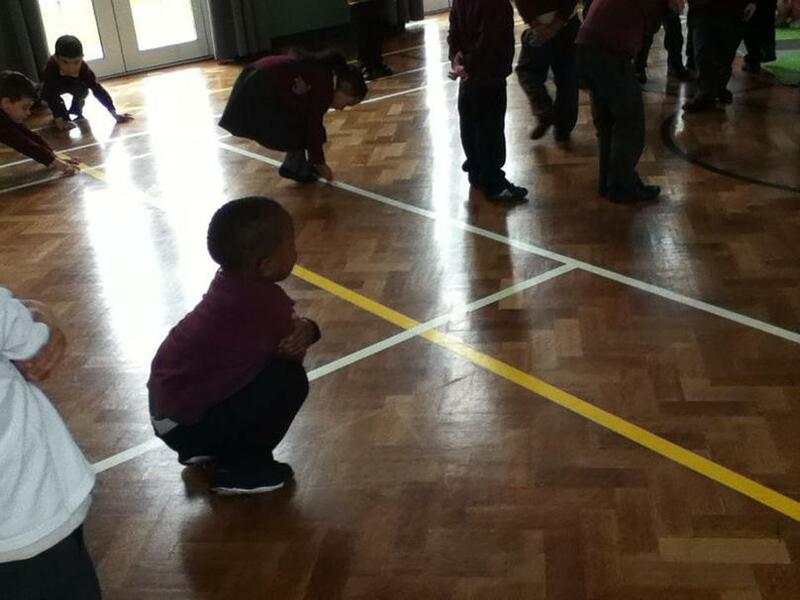 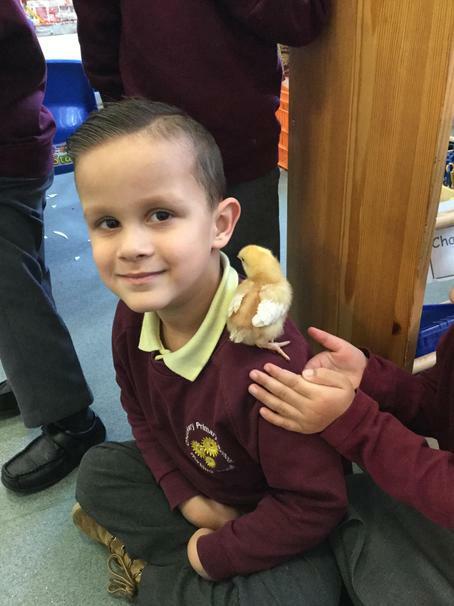 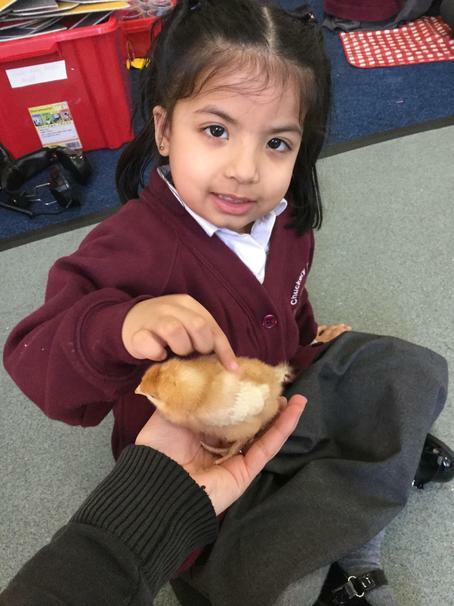 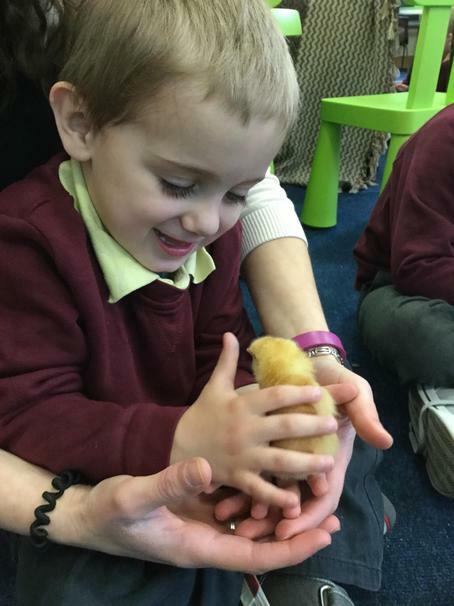 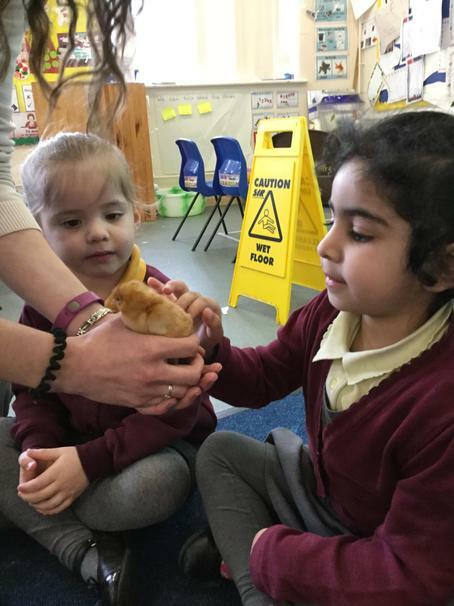 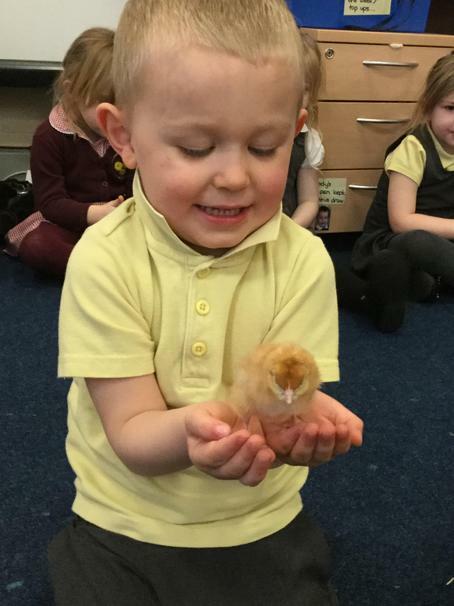 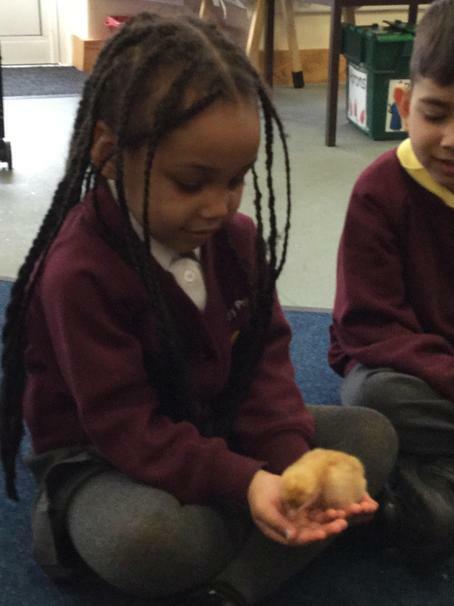 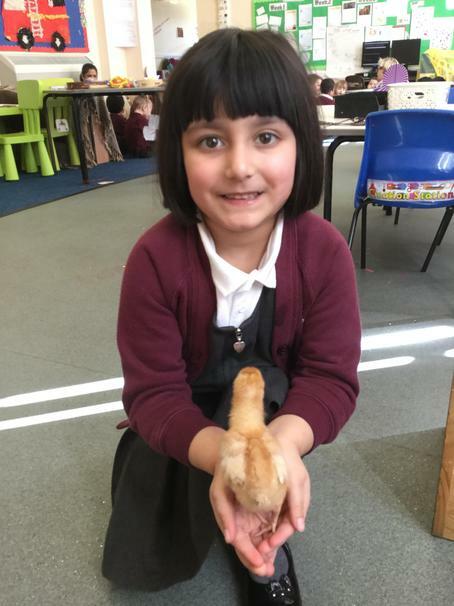 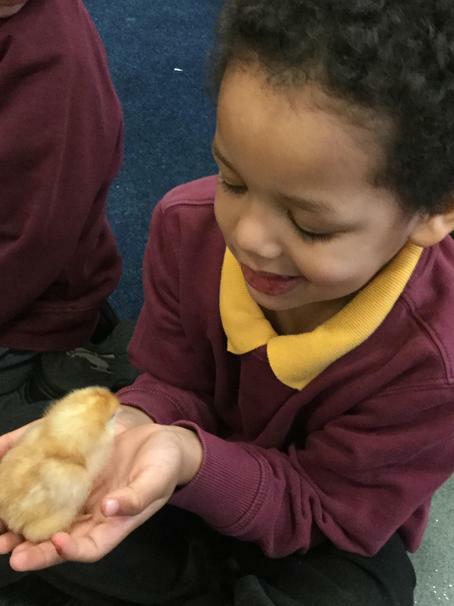 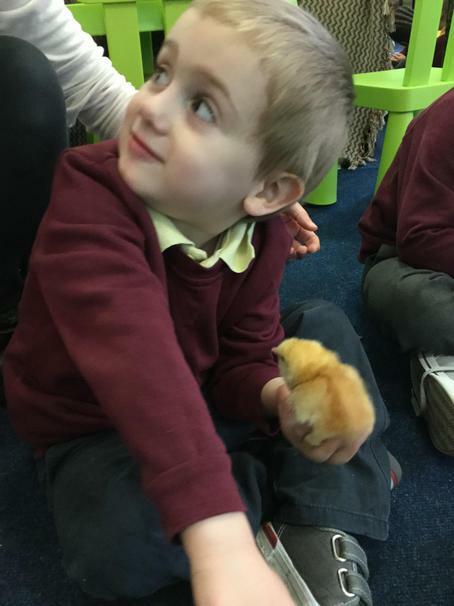 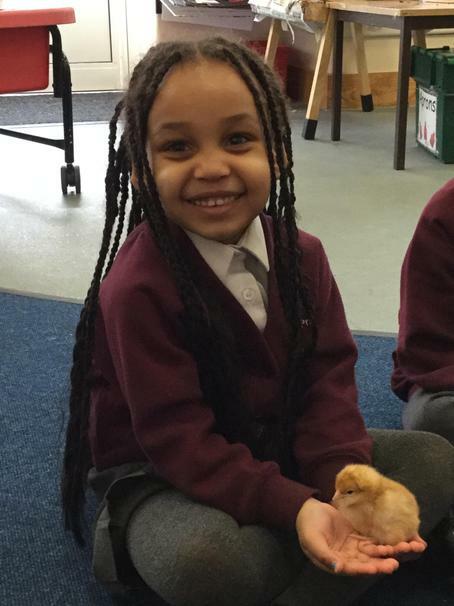 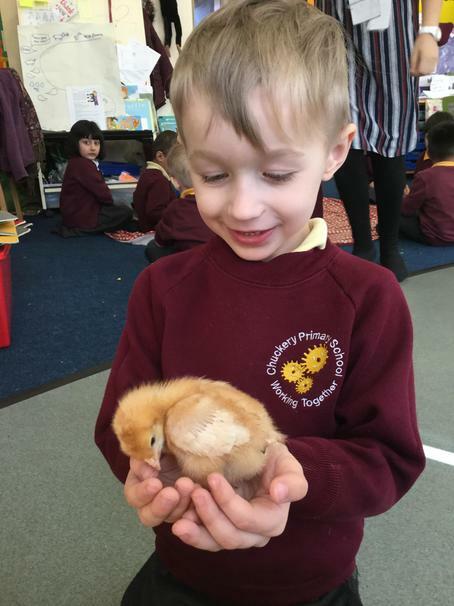 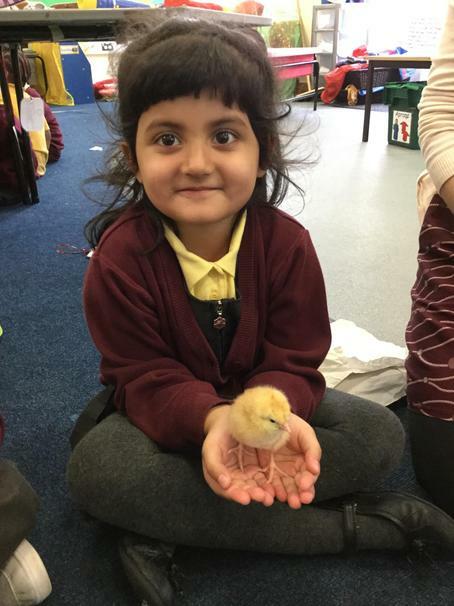 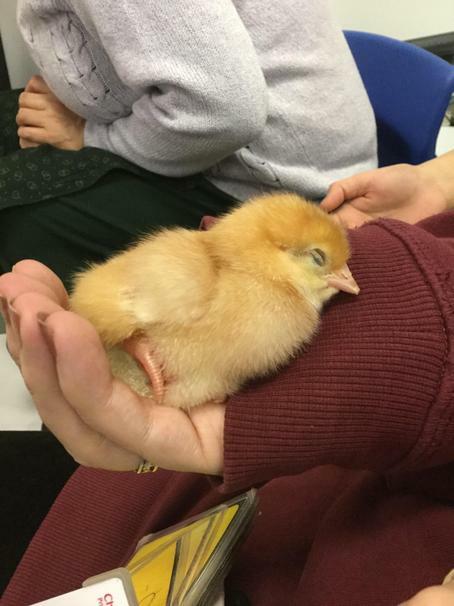 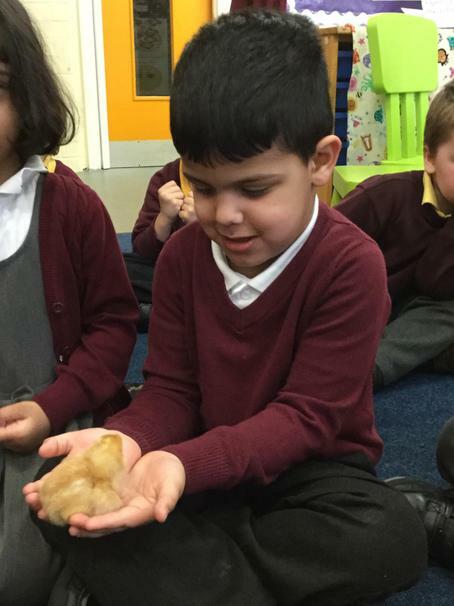 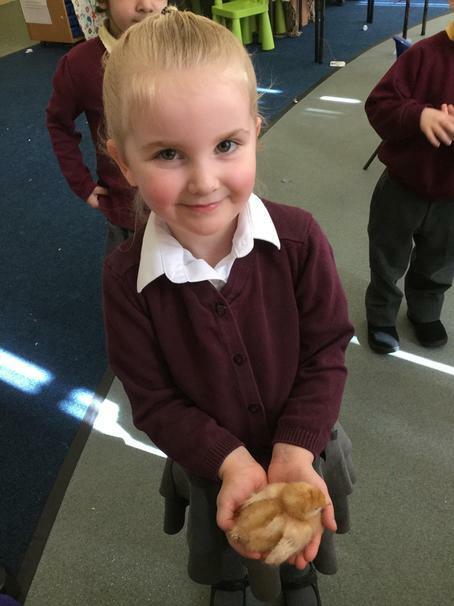 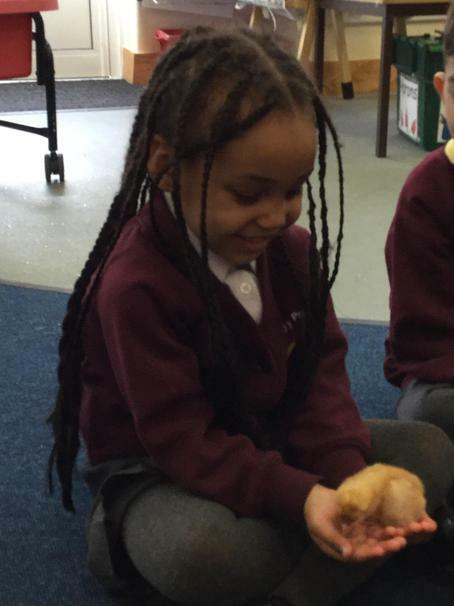 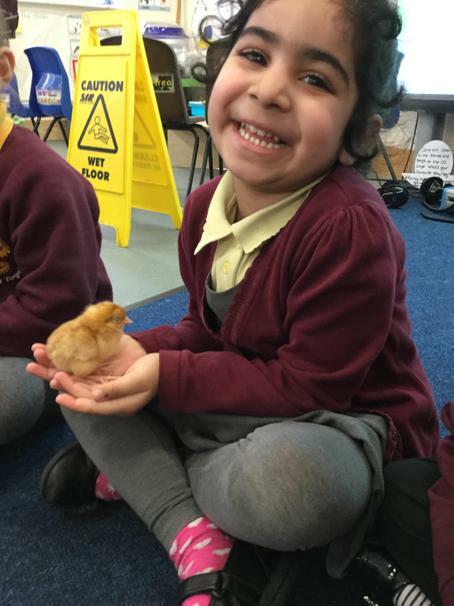 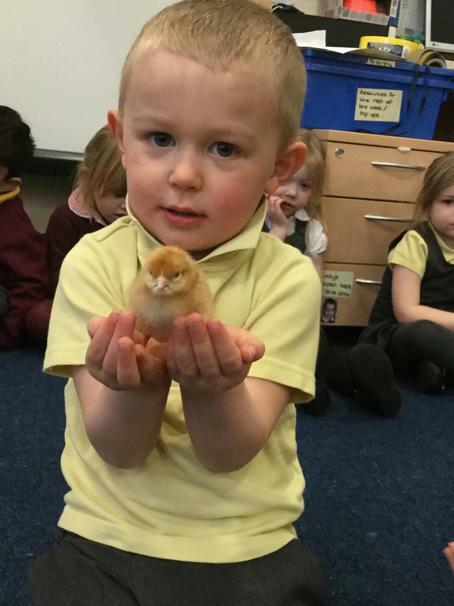 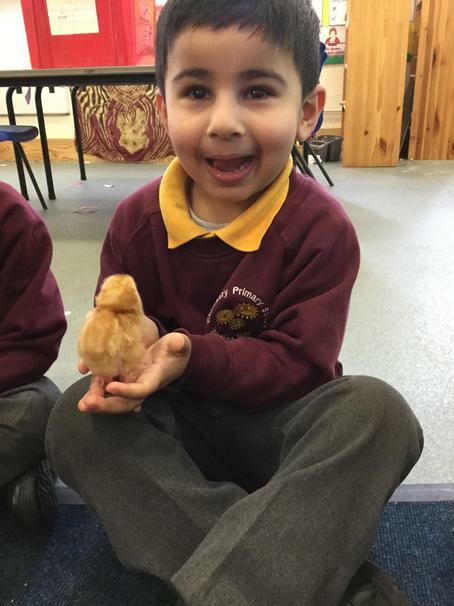 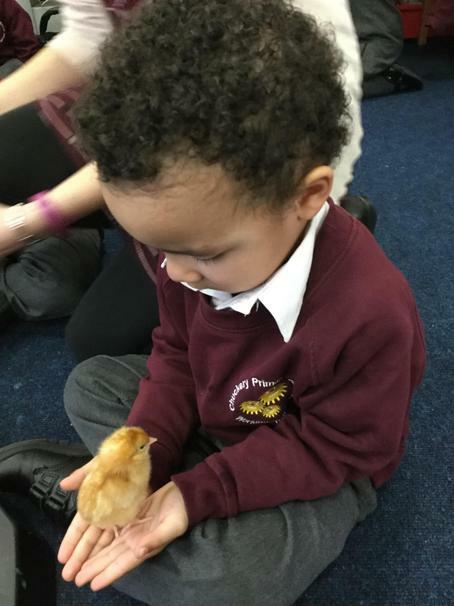 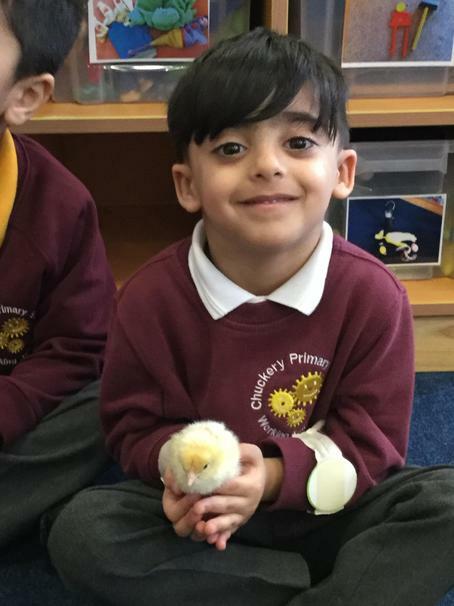 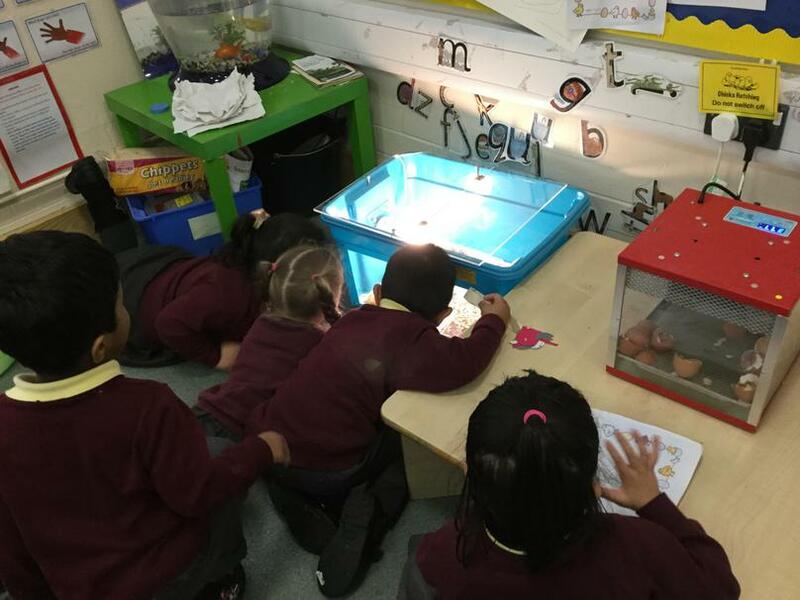 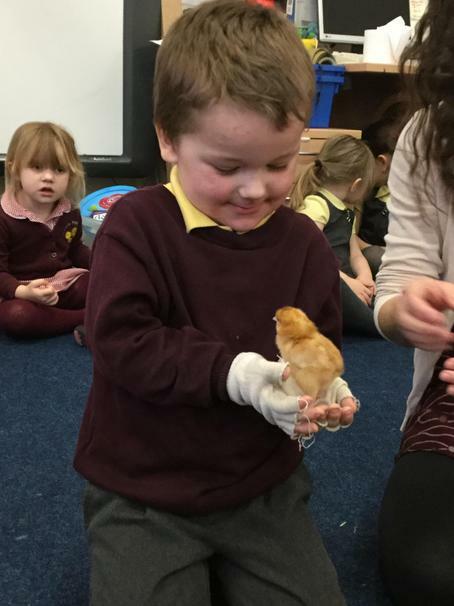 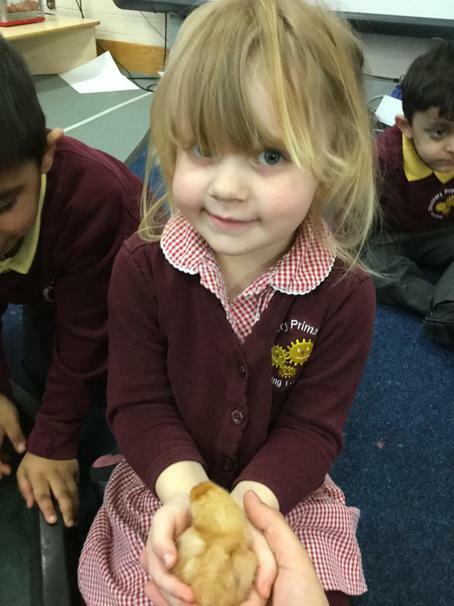 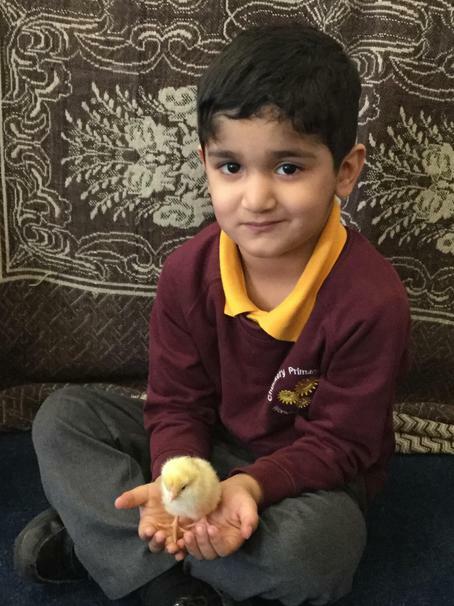 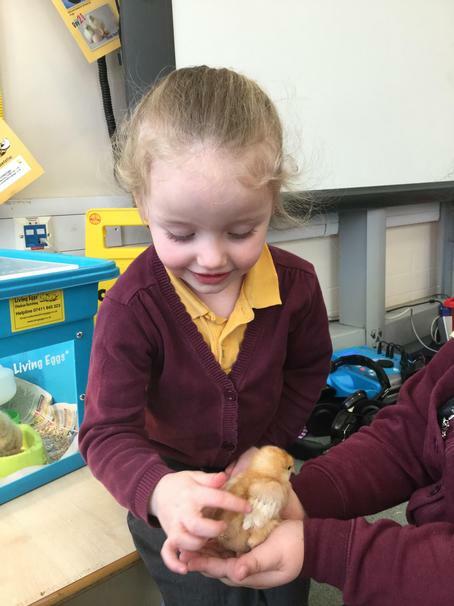 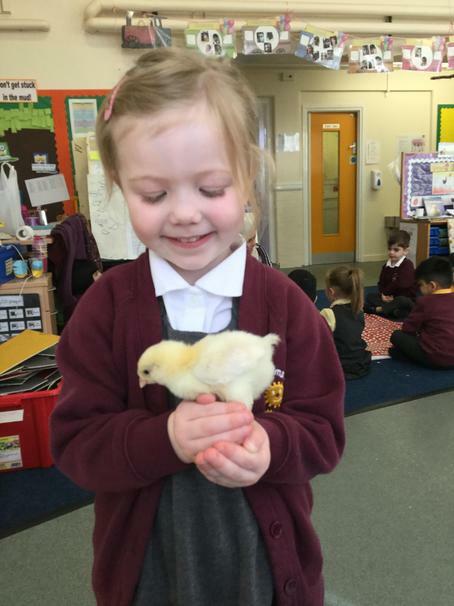 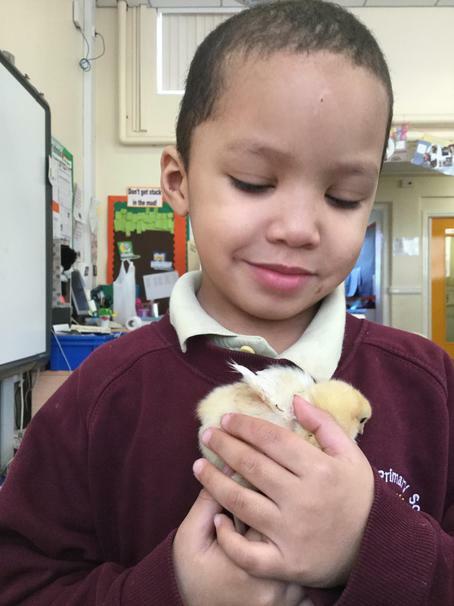 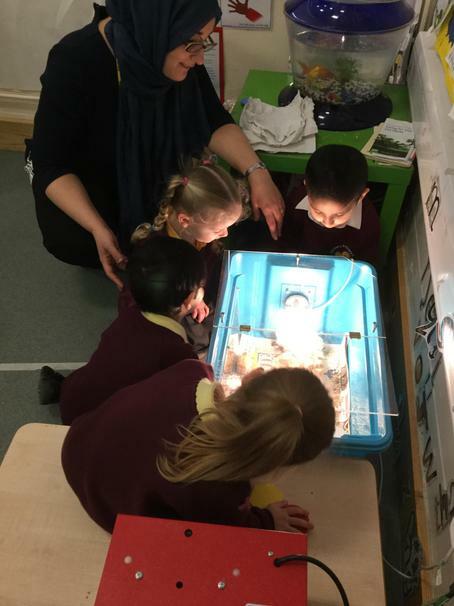 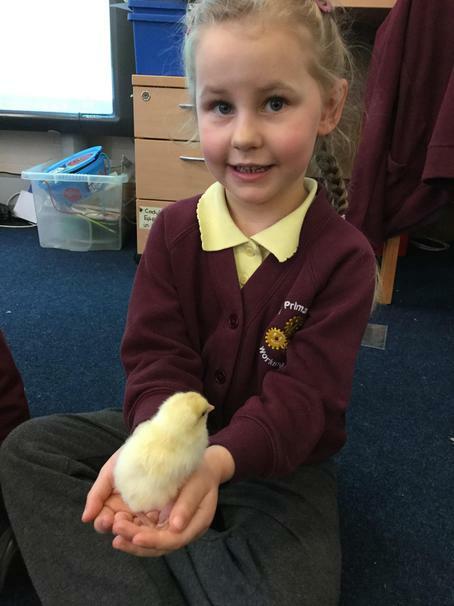 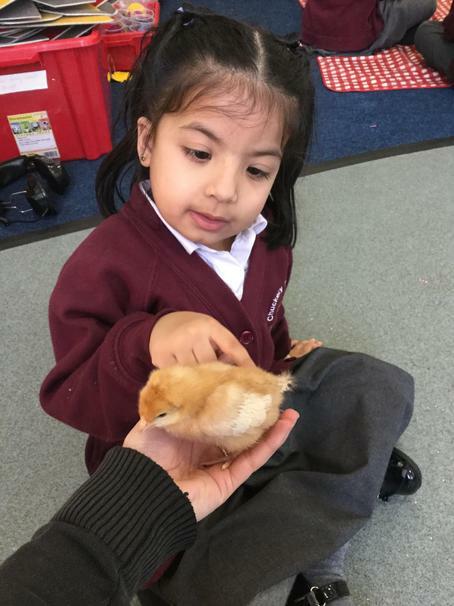 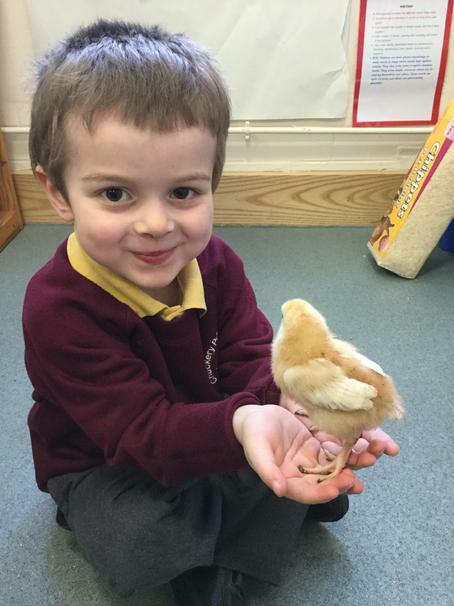 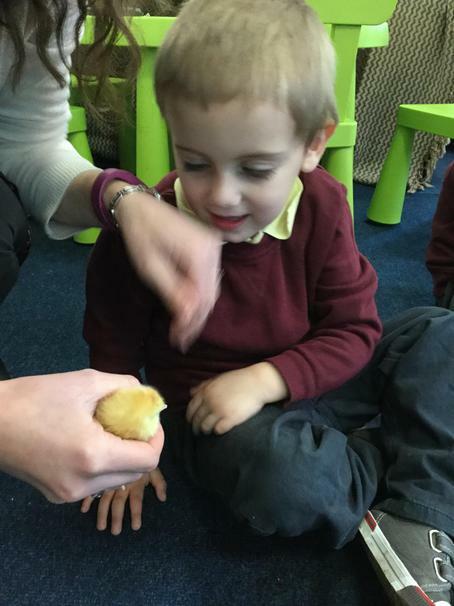 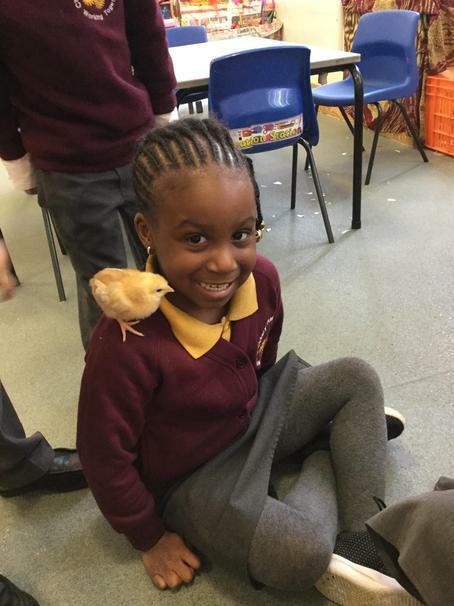 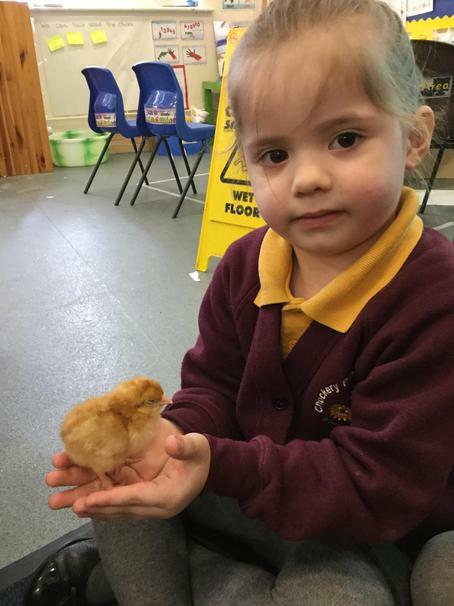 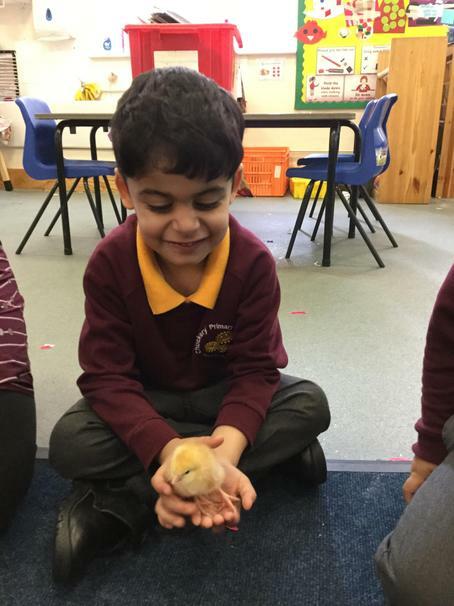 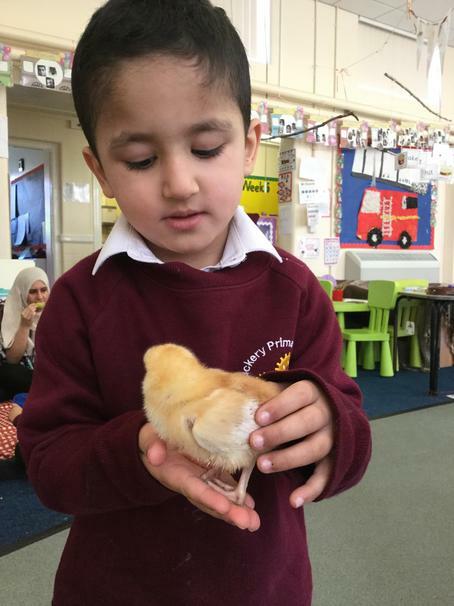 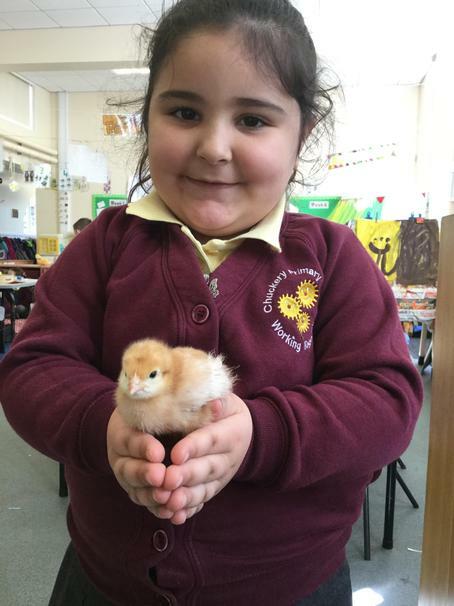 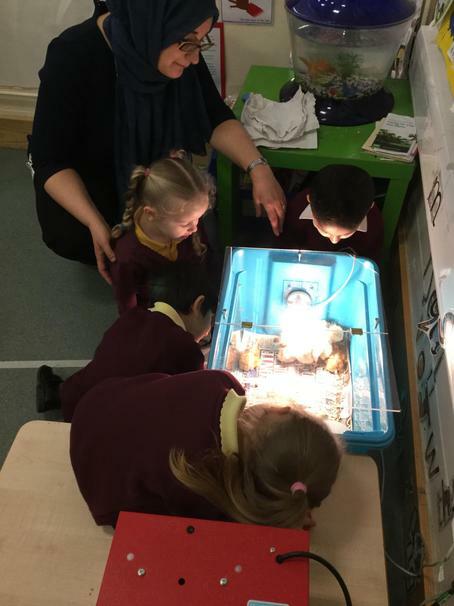 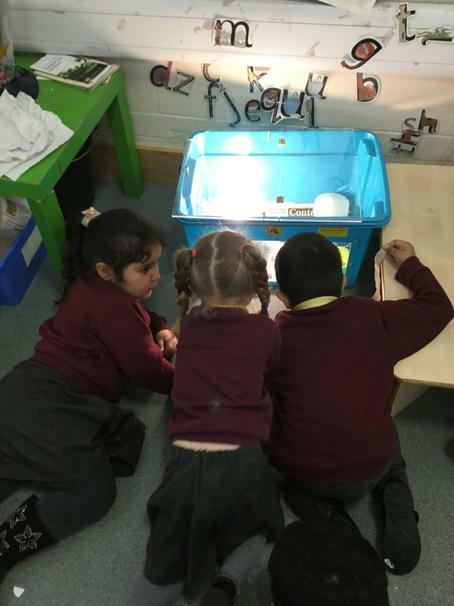 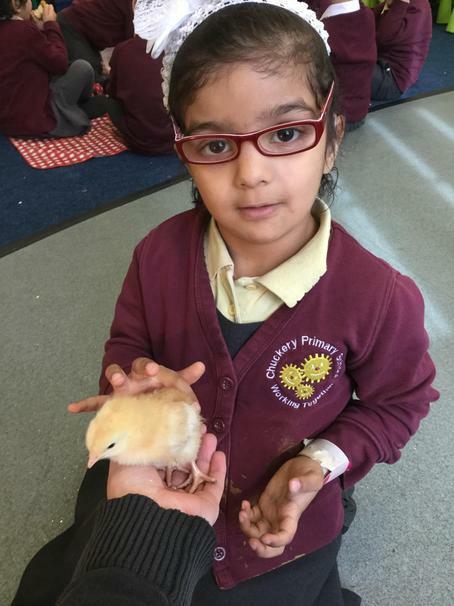 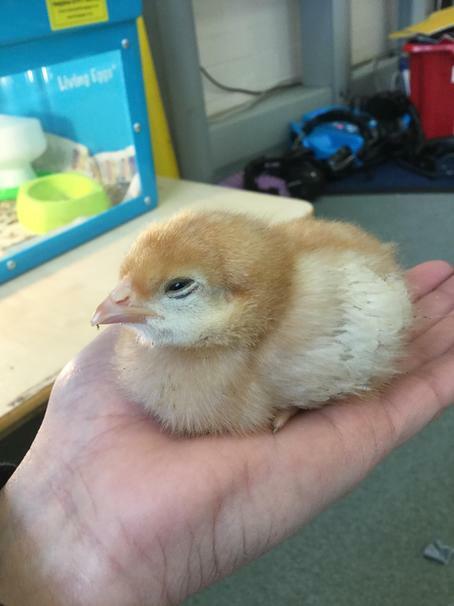 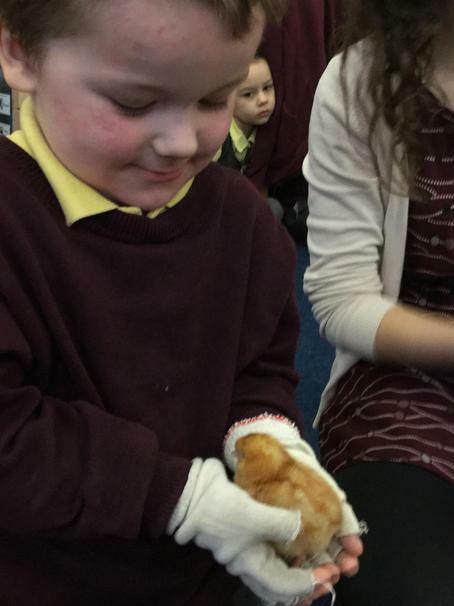 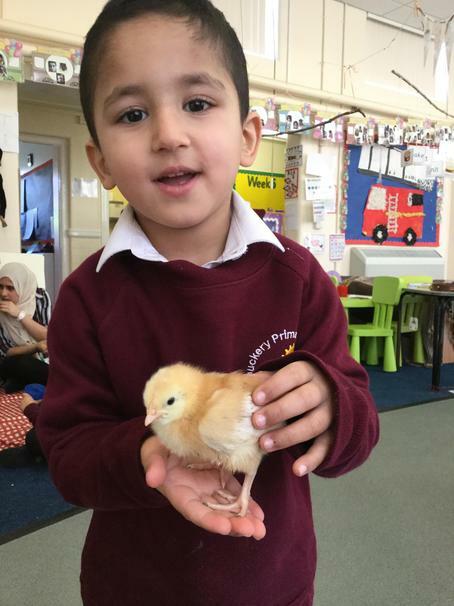 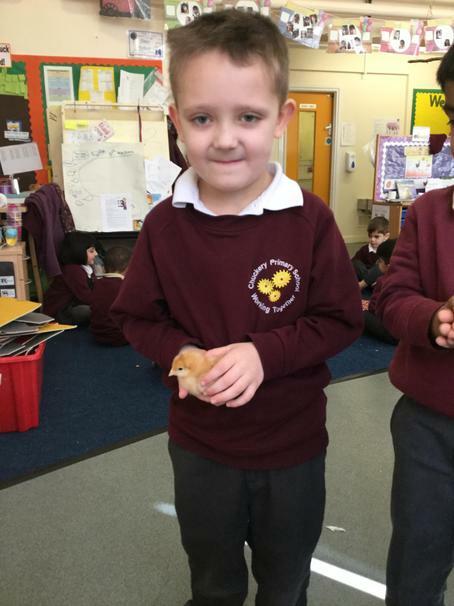 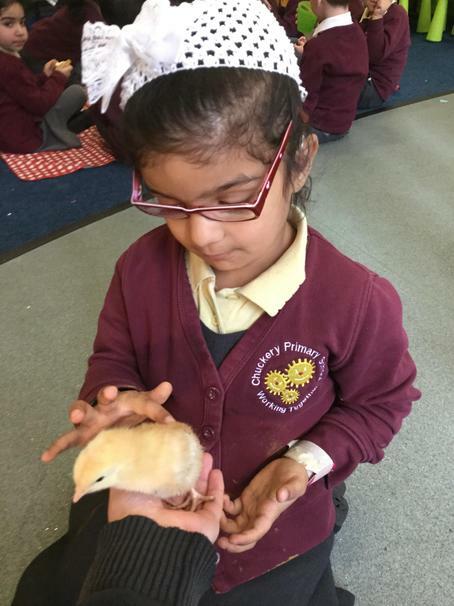 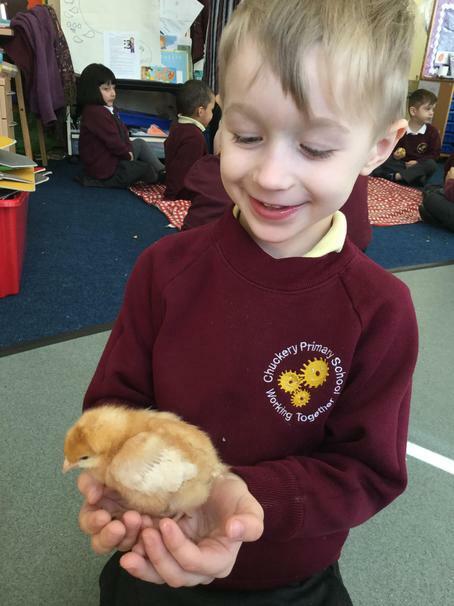 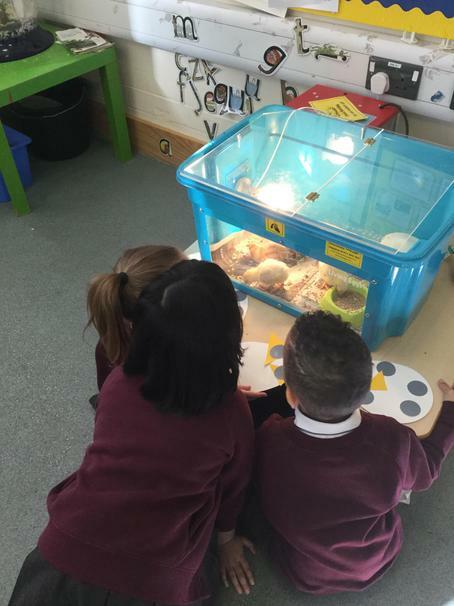 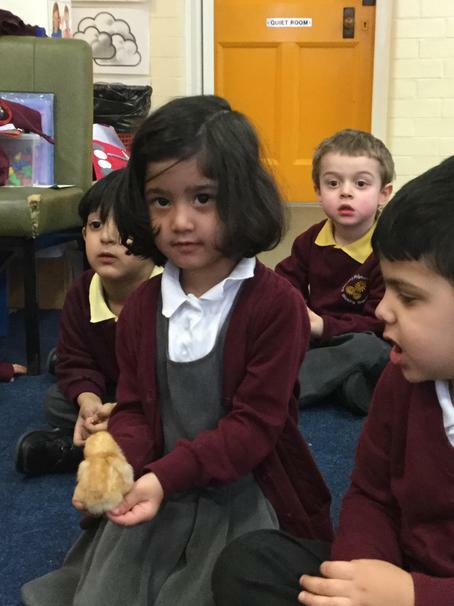 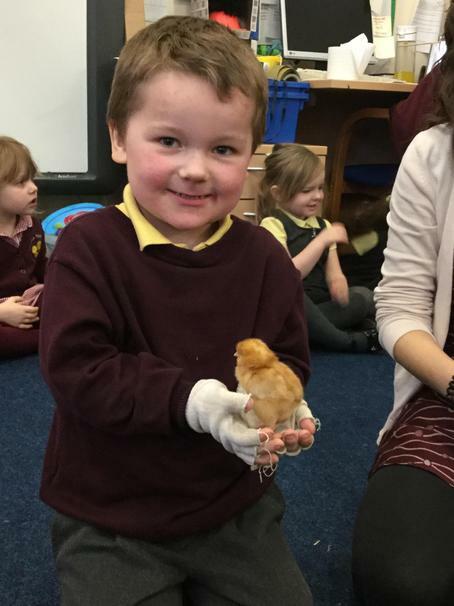 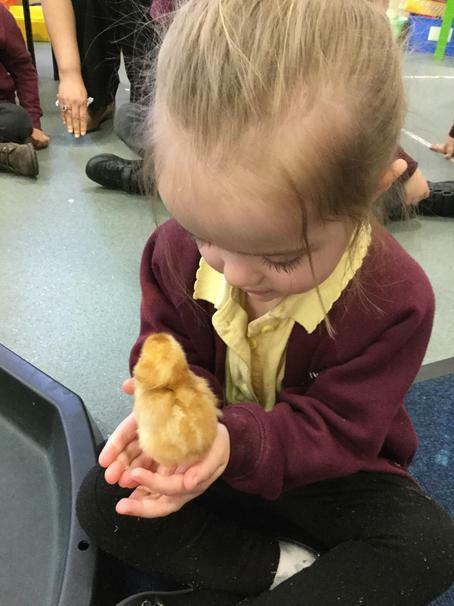 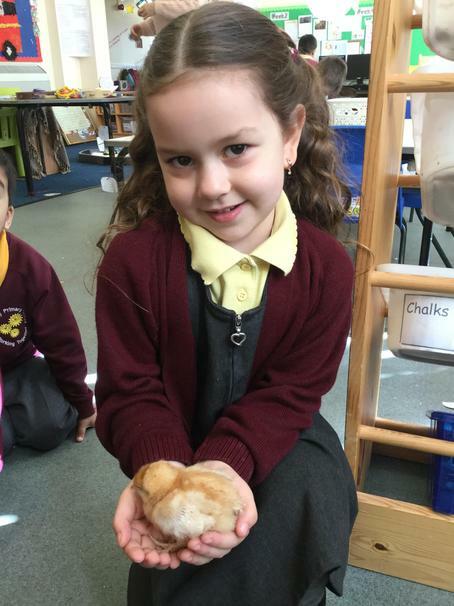 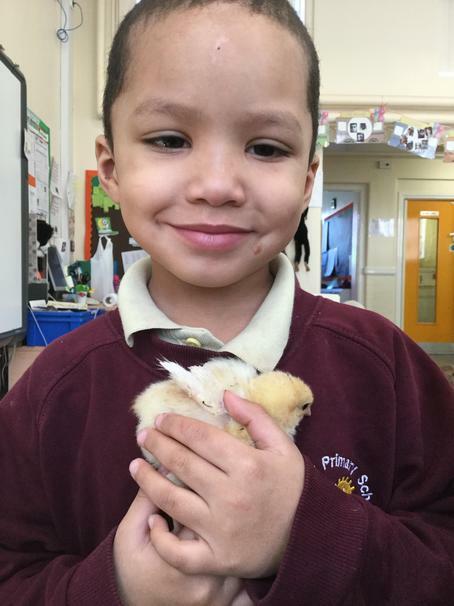 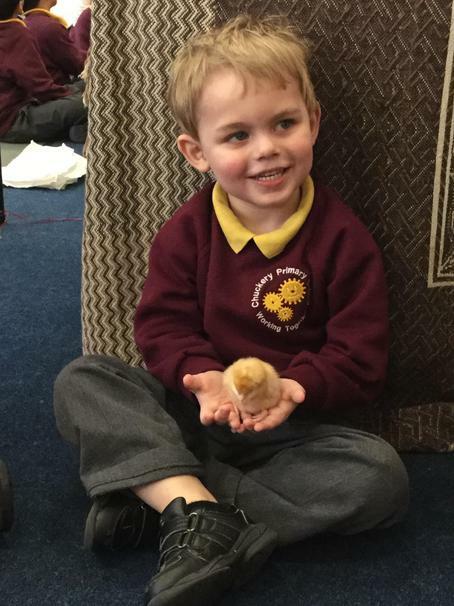 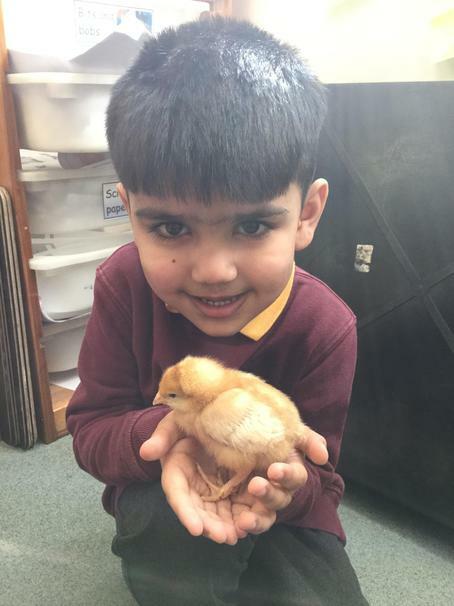 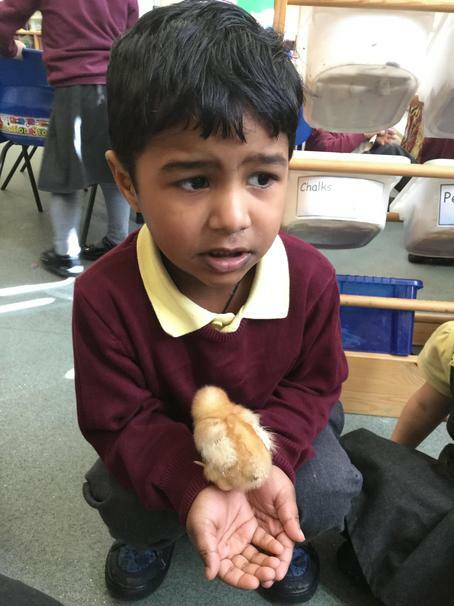 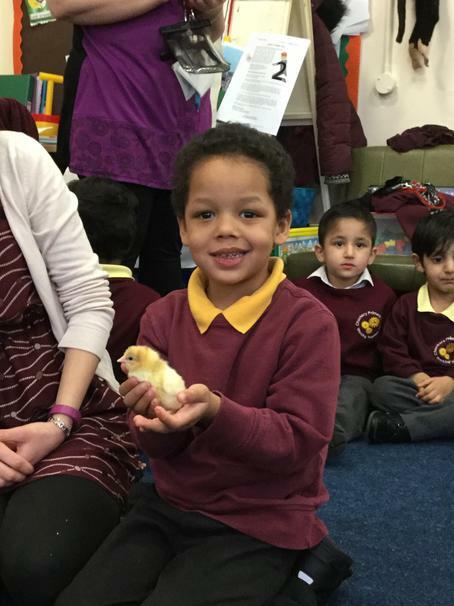 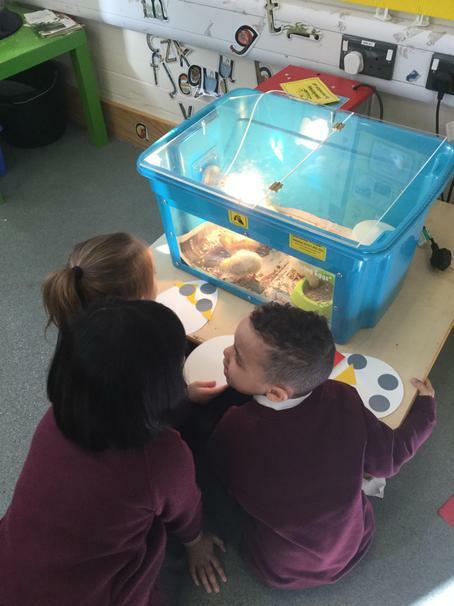 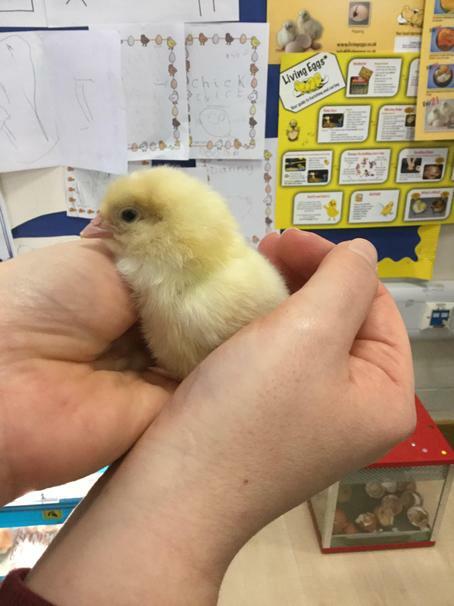 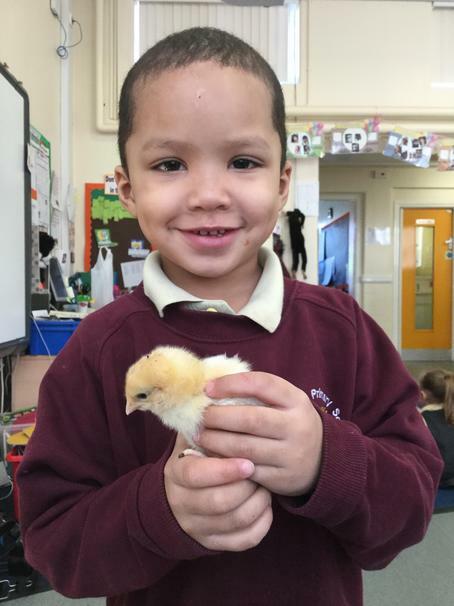 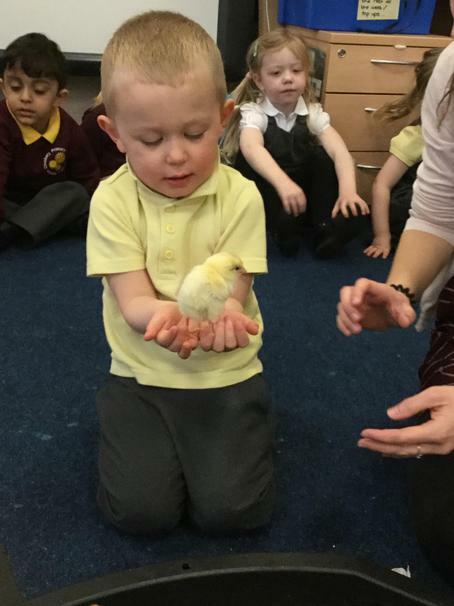 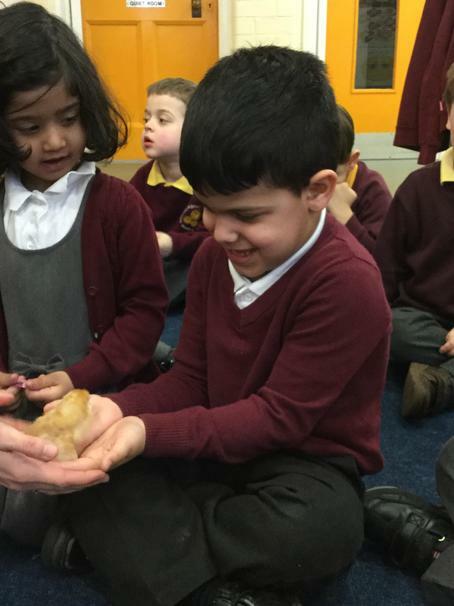 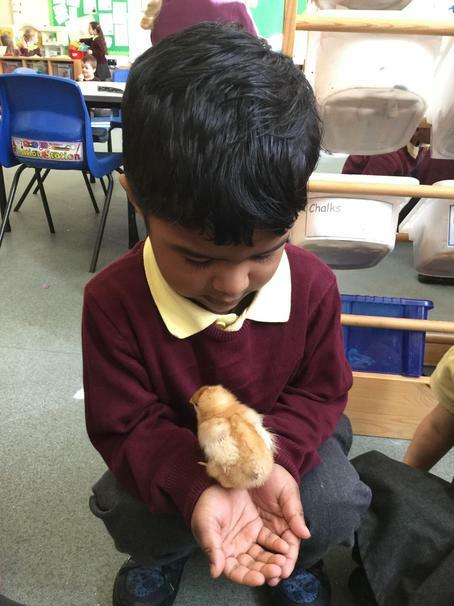 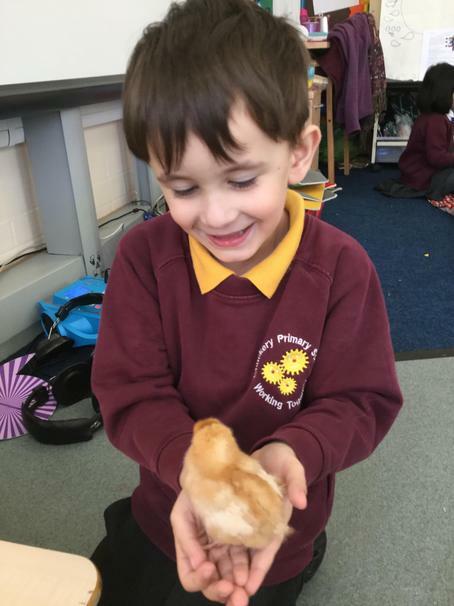 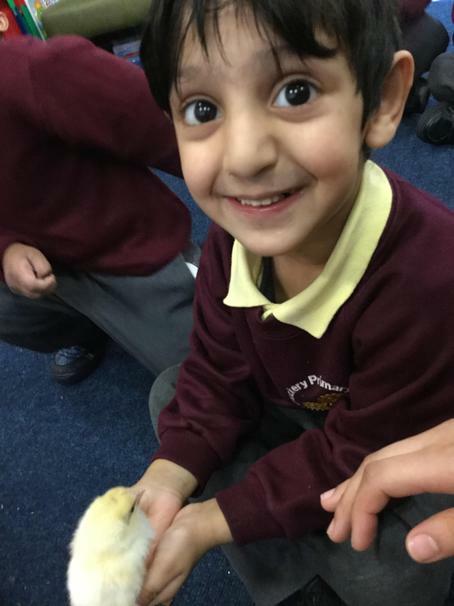 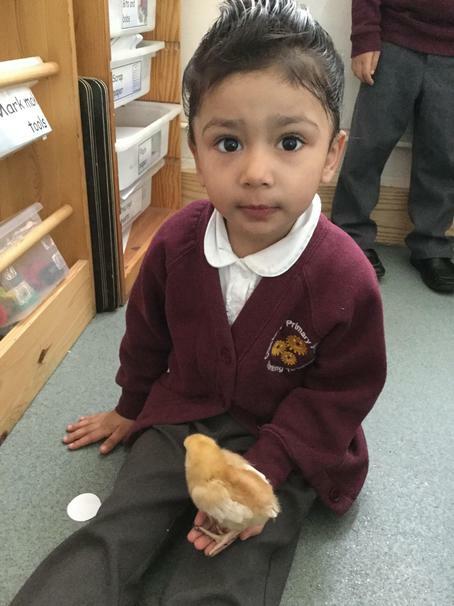 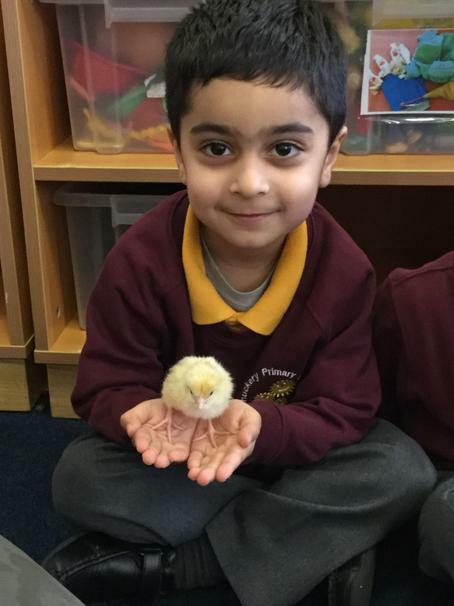 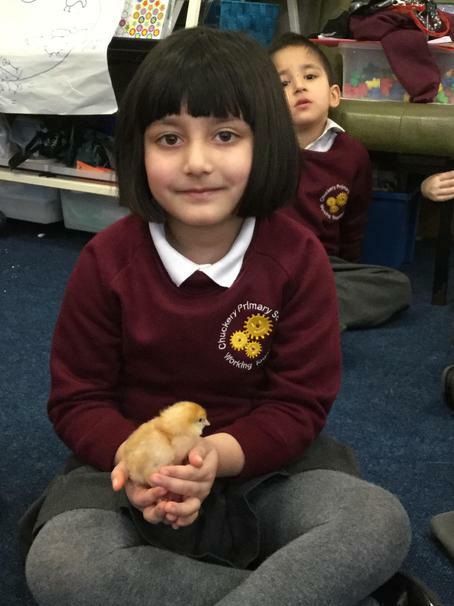 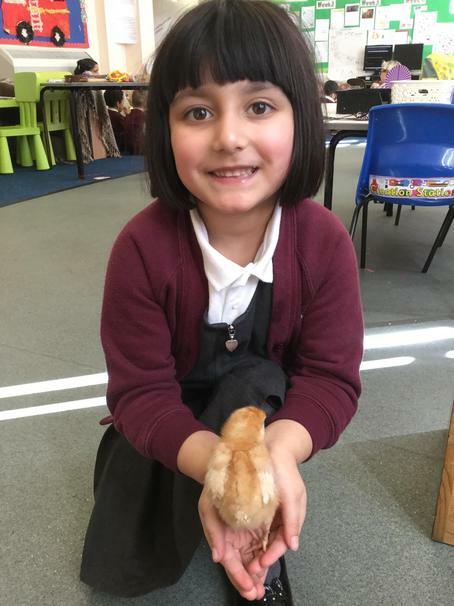 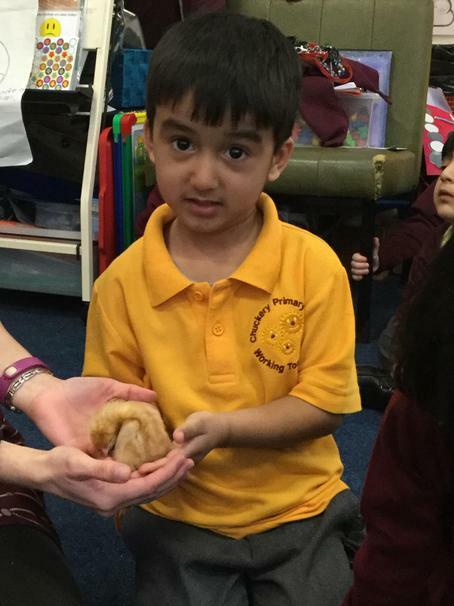 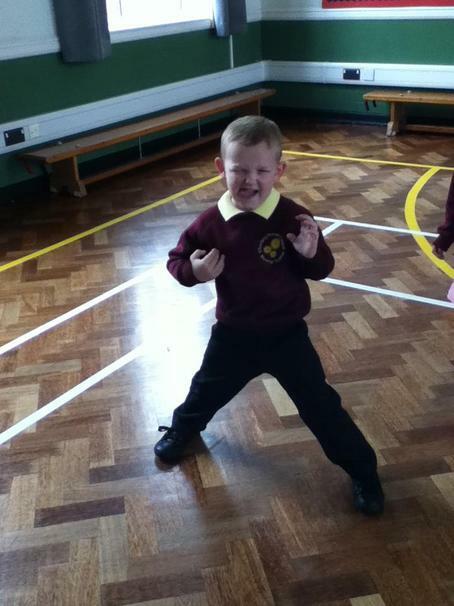 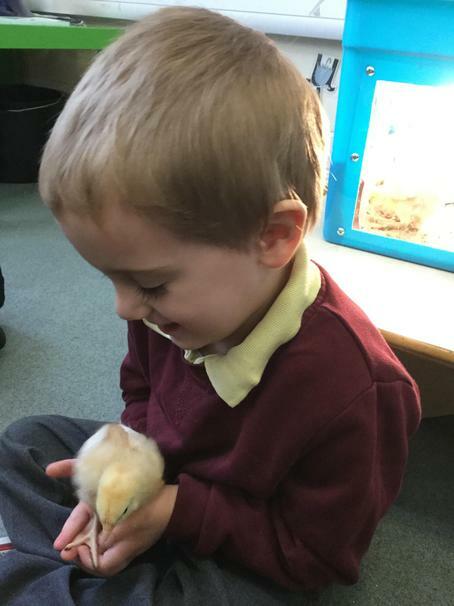 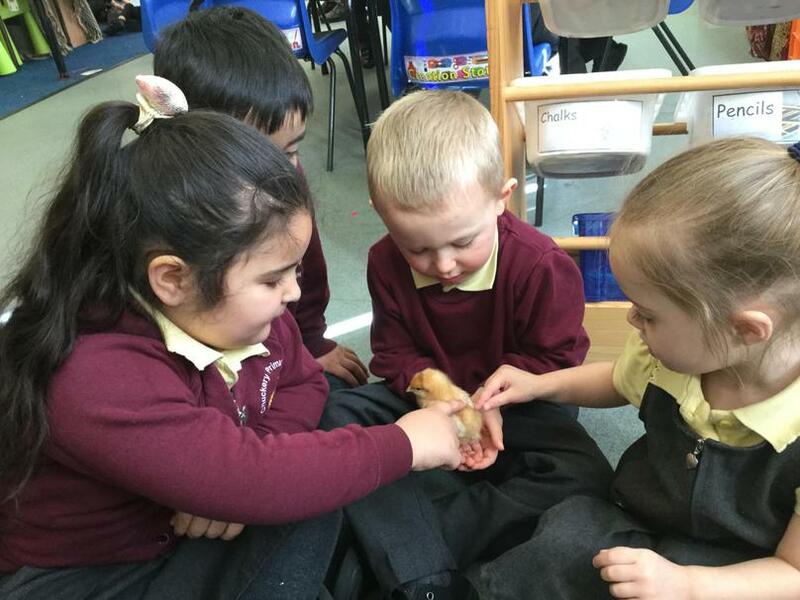 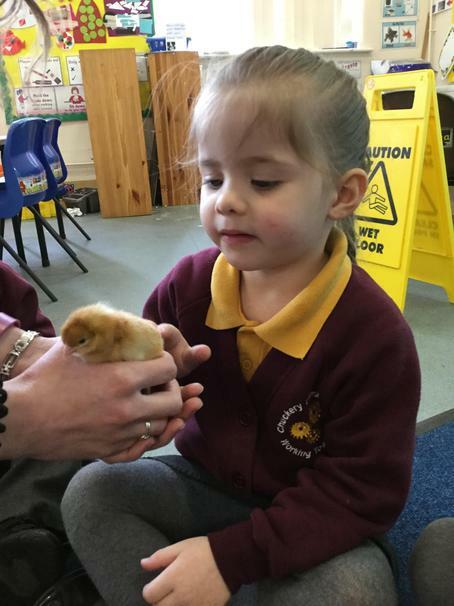 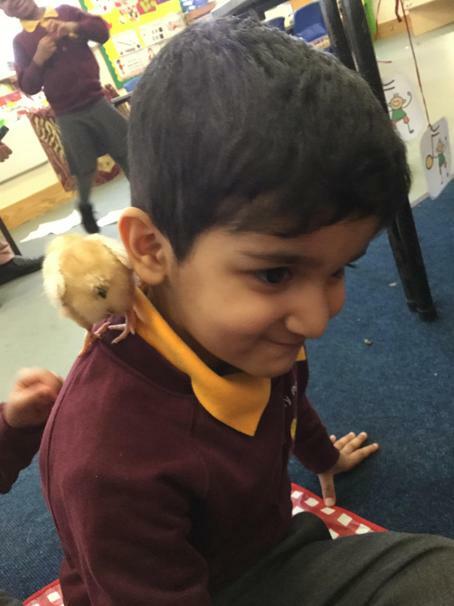 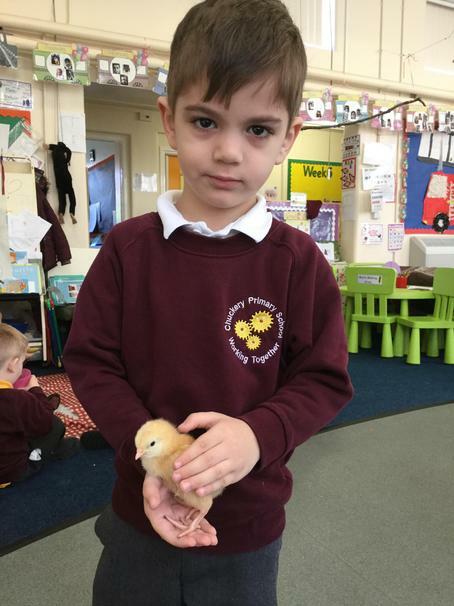 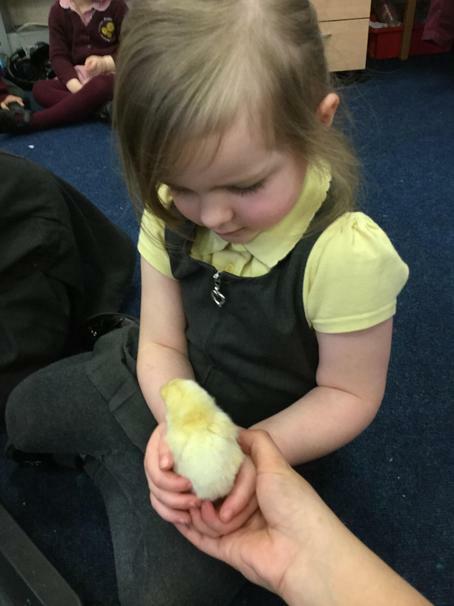 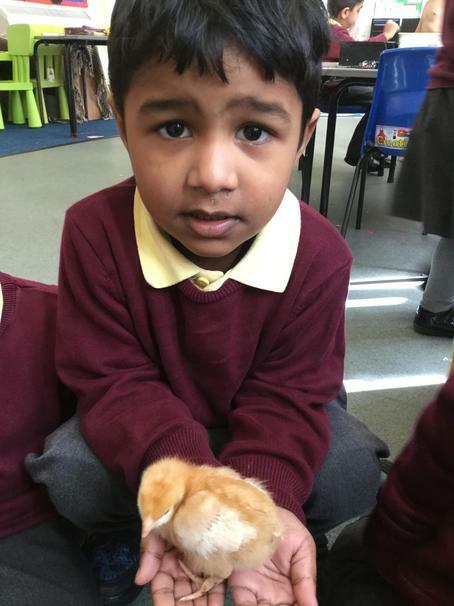 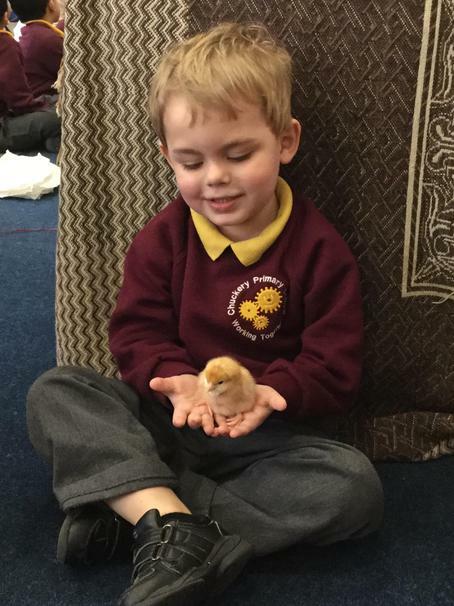 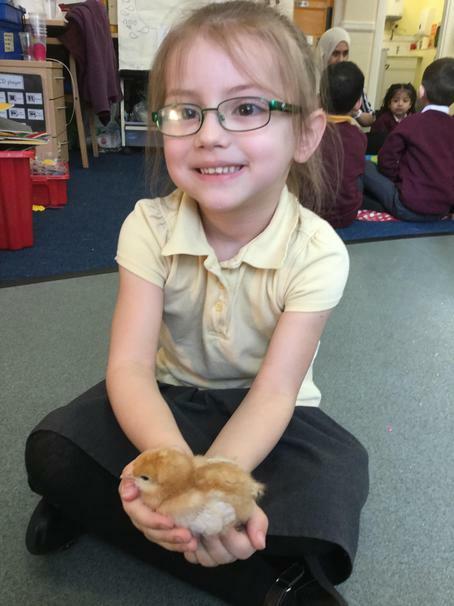 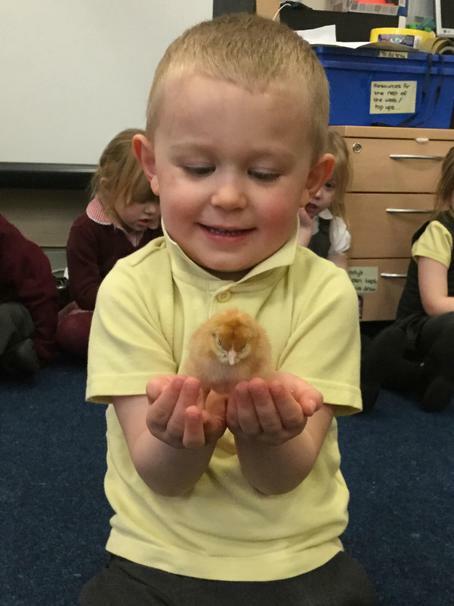 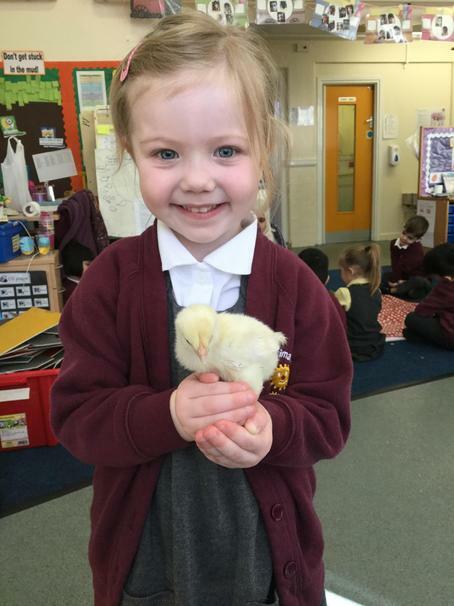 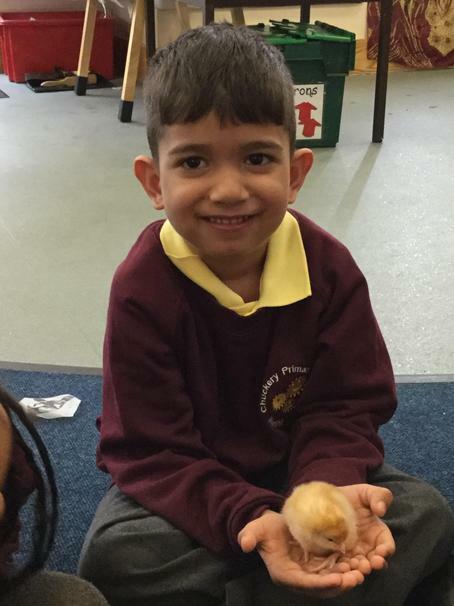 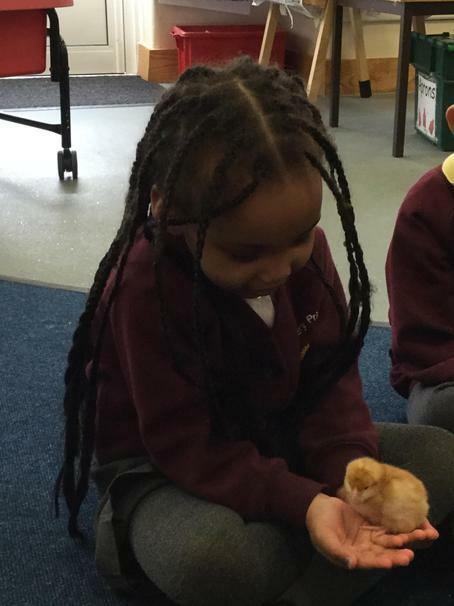 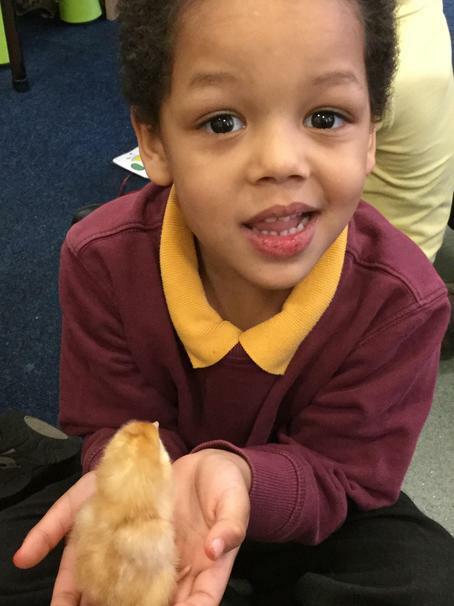 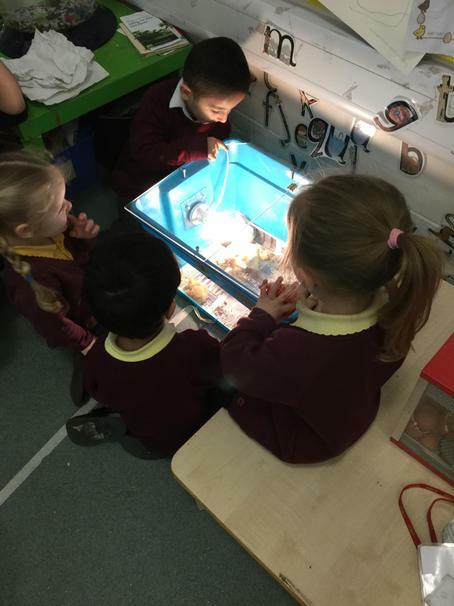 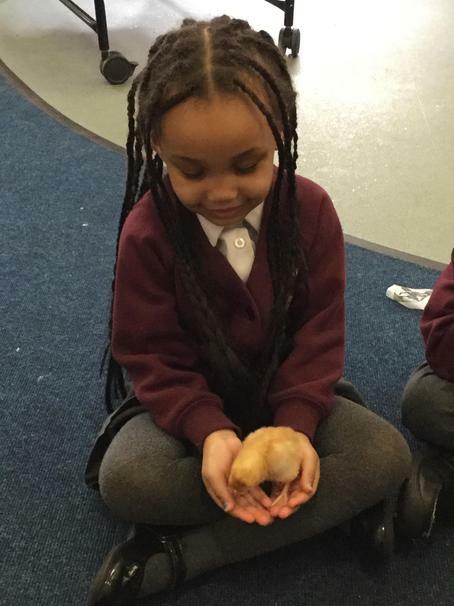 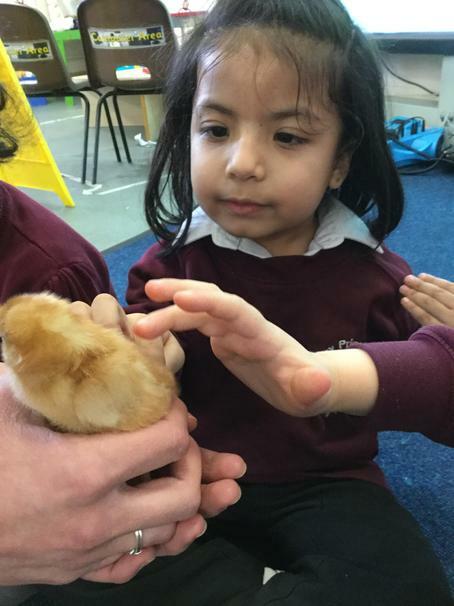 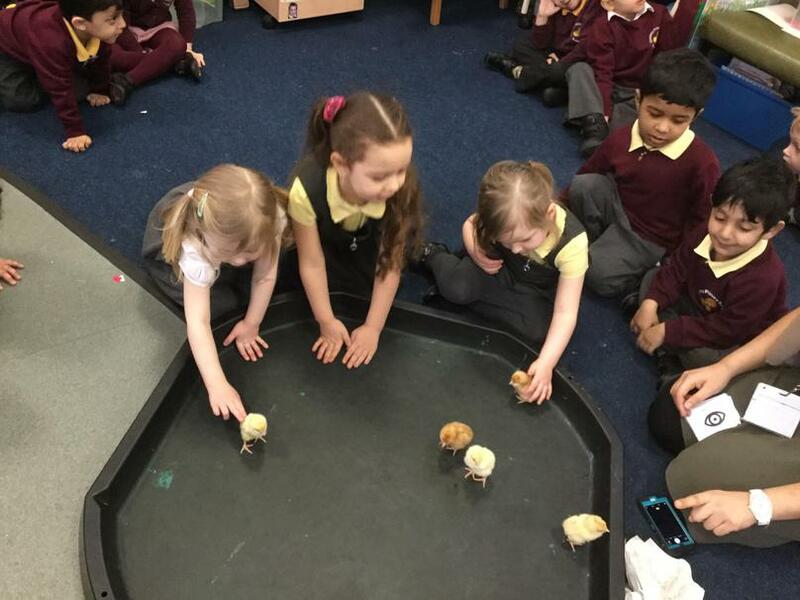 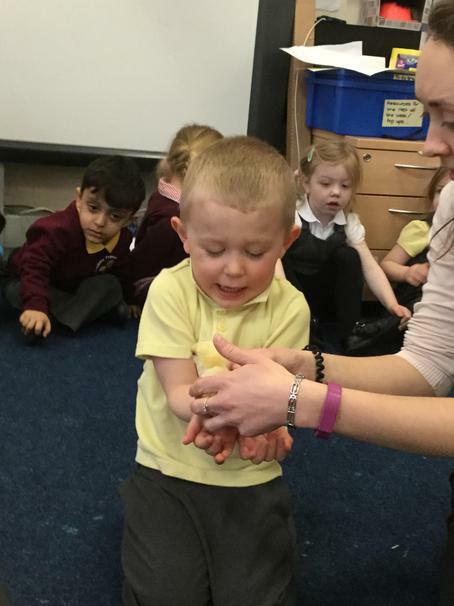 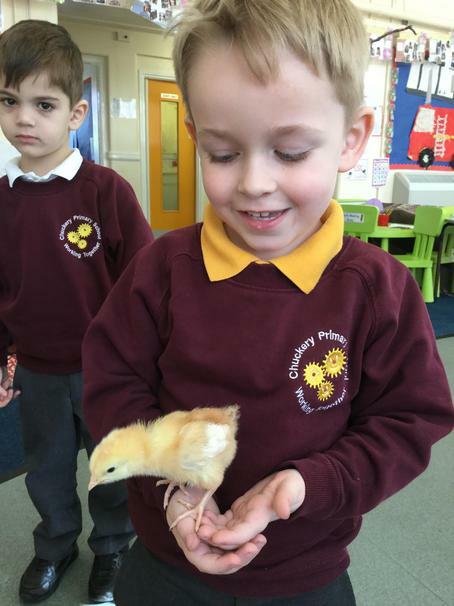 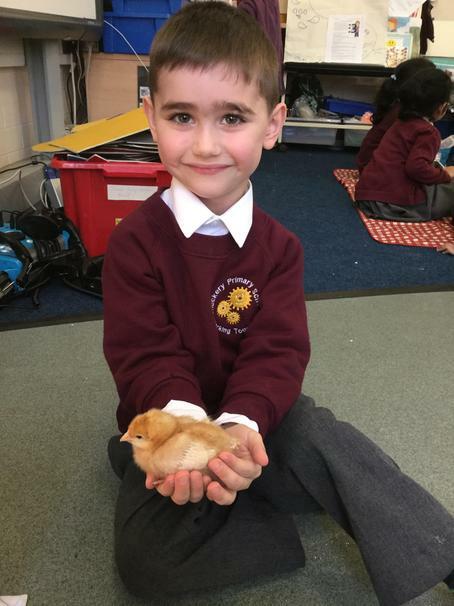 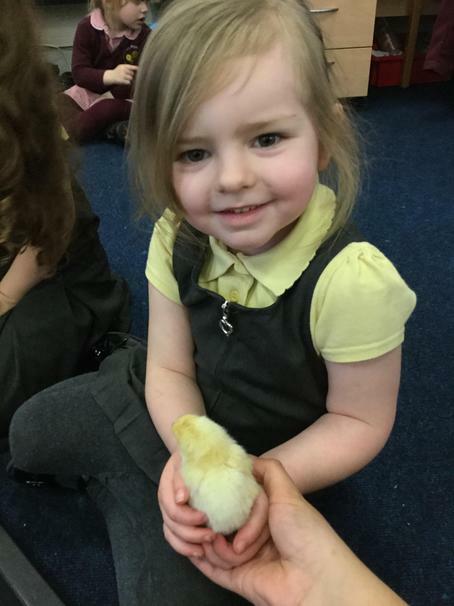 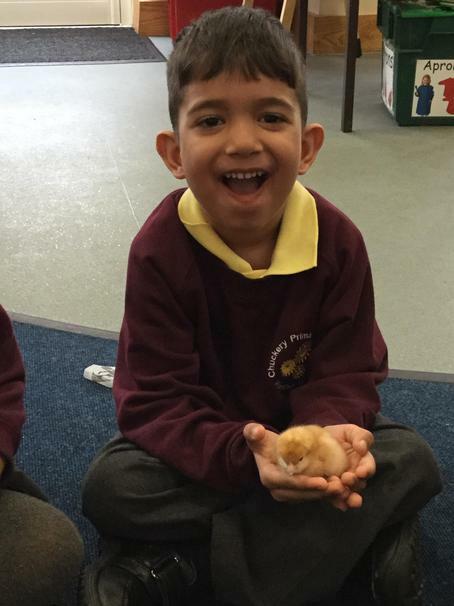 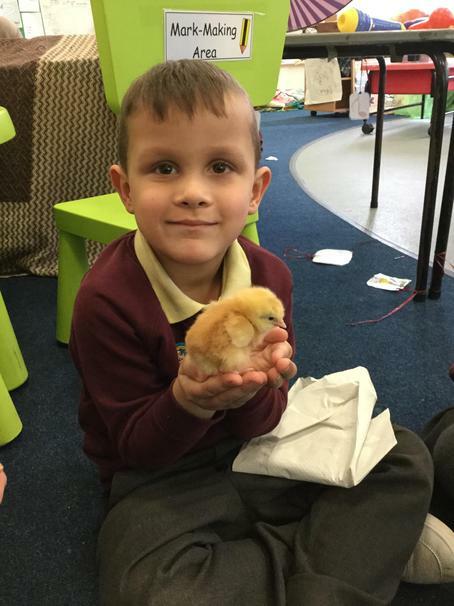 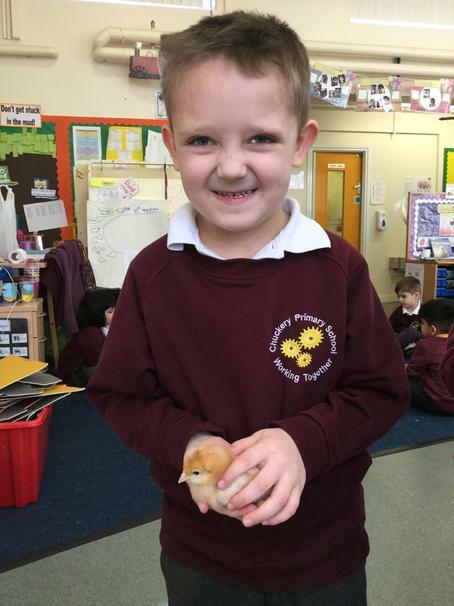 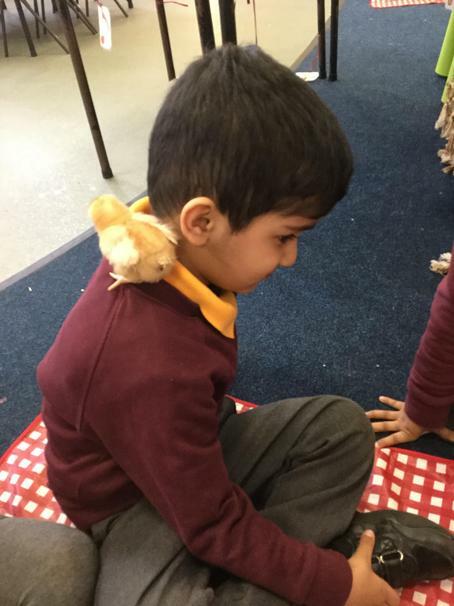 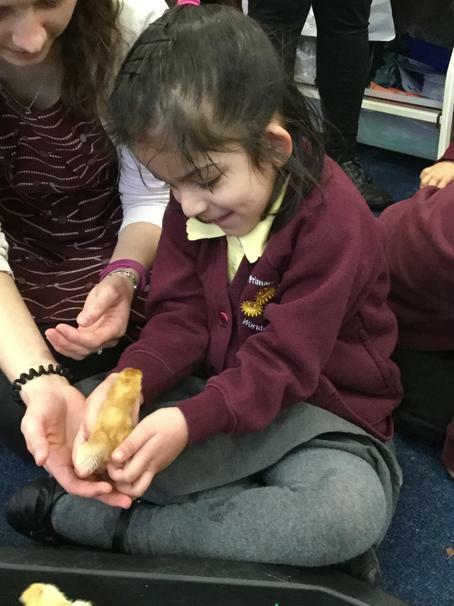 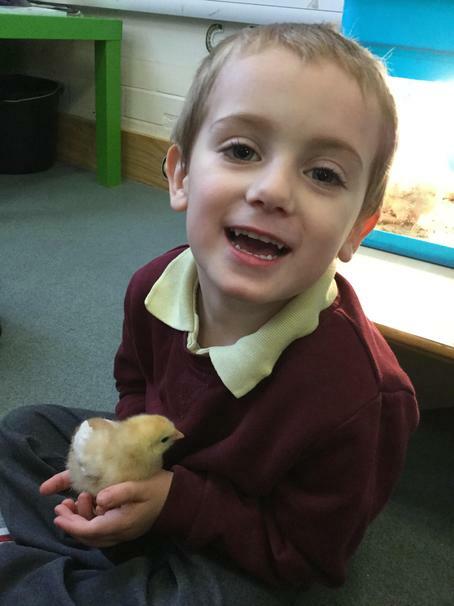 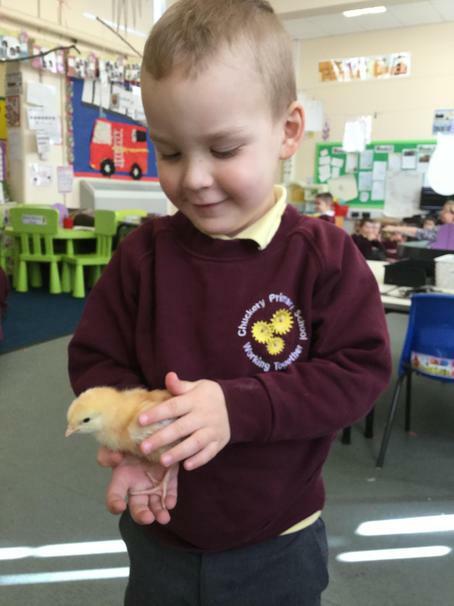 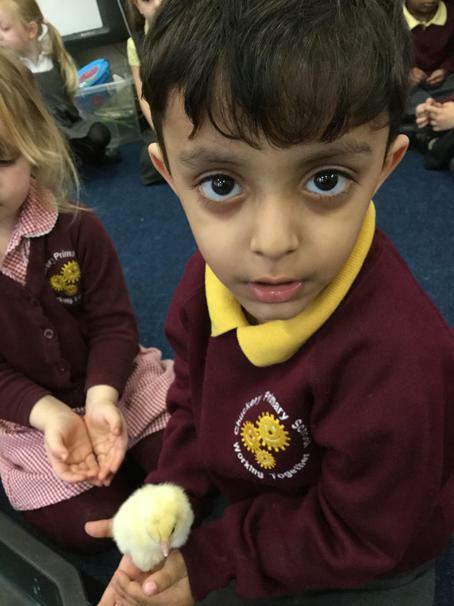 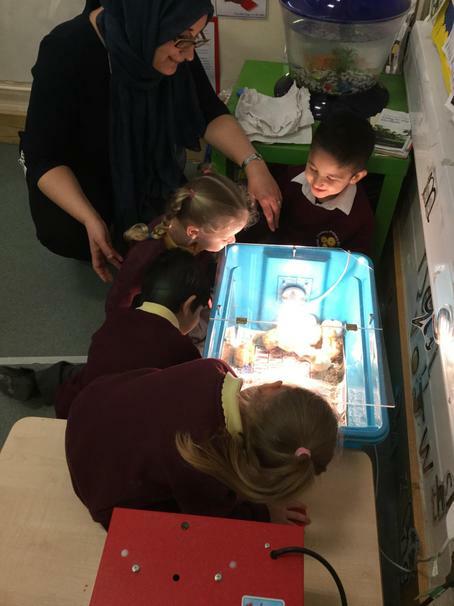 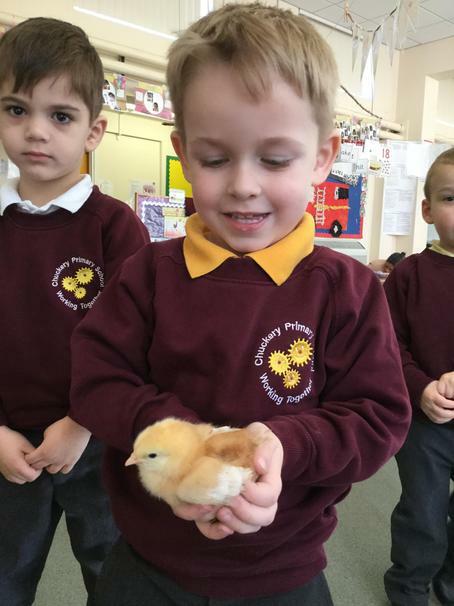 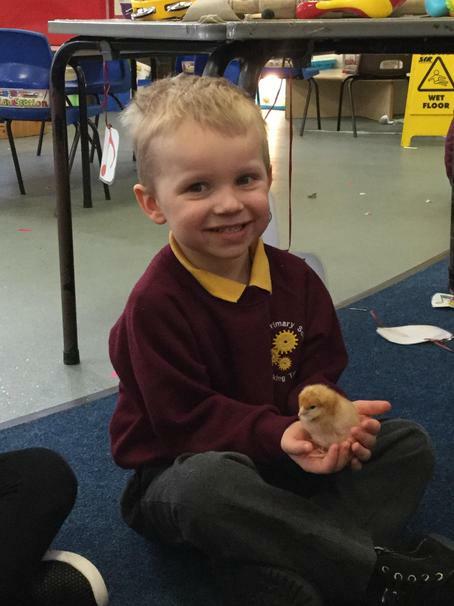 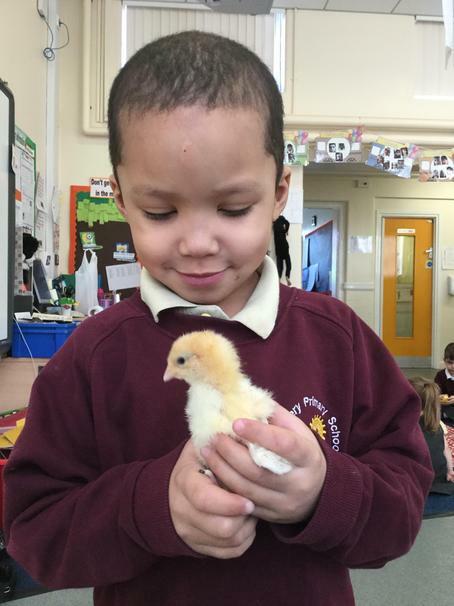 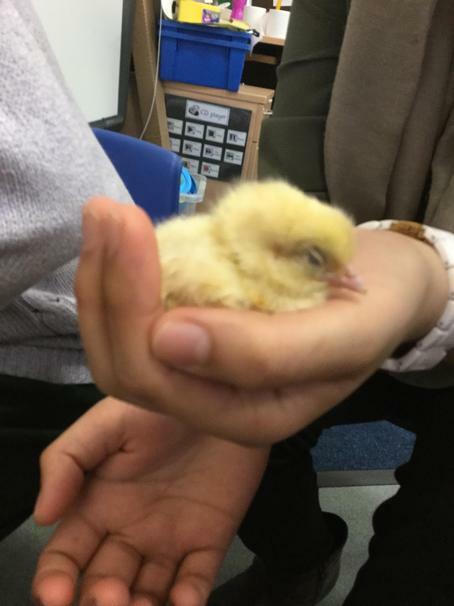 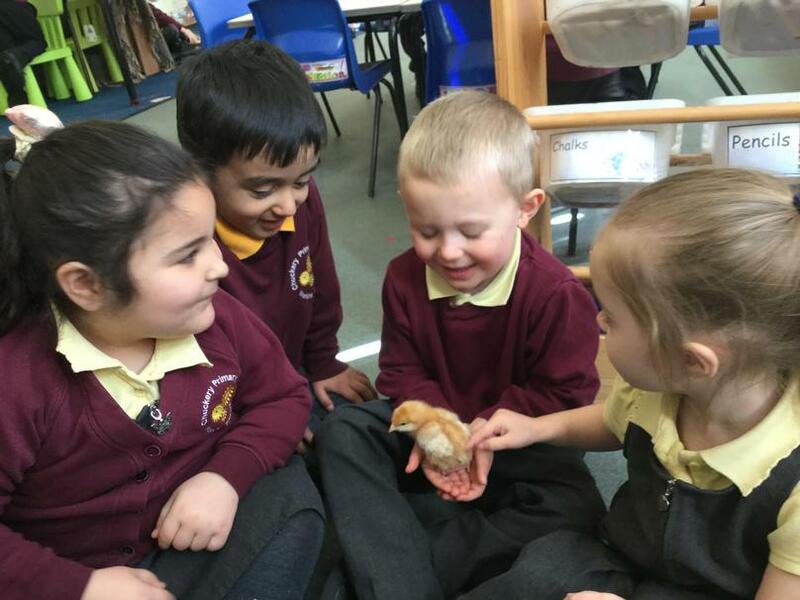 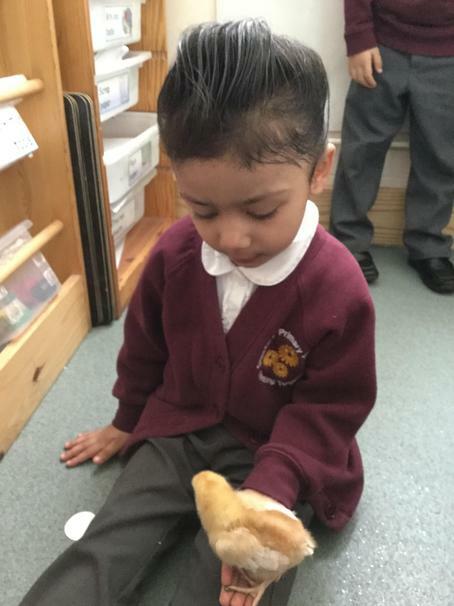 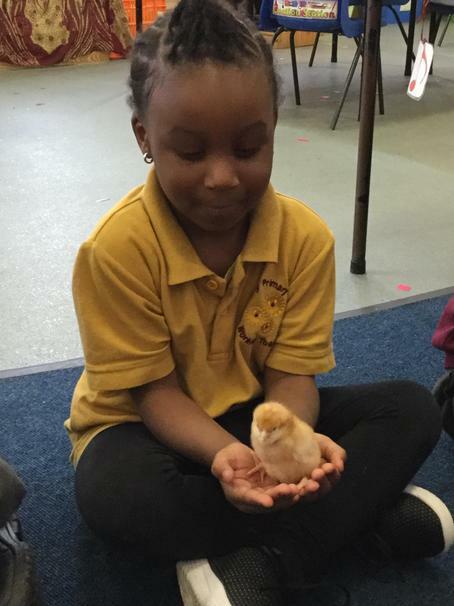 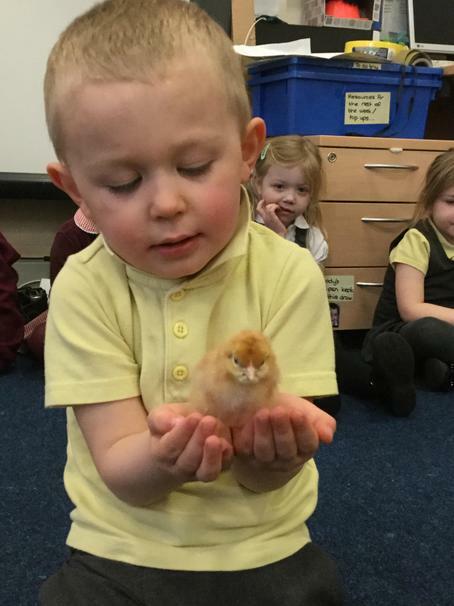 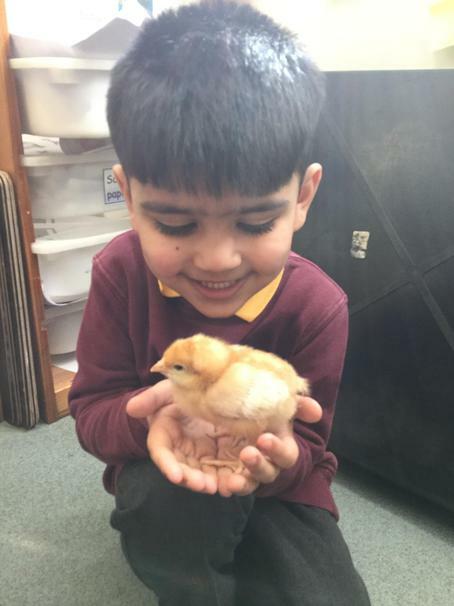 "Nursery enjoyed another week with the chicks last week. 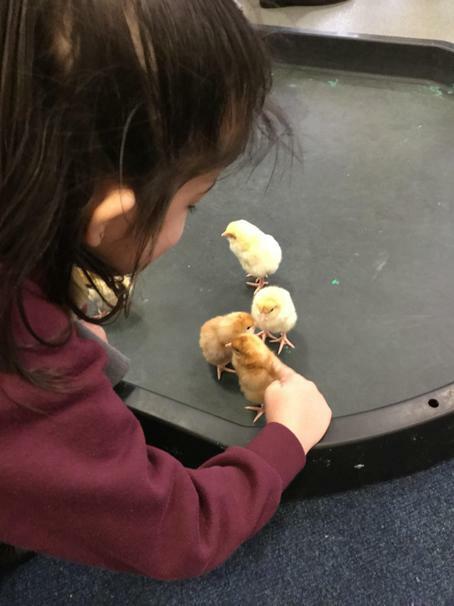 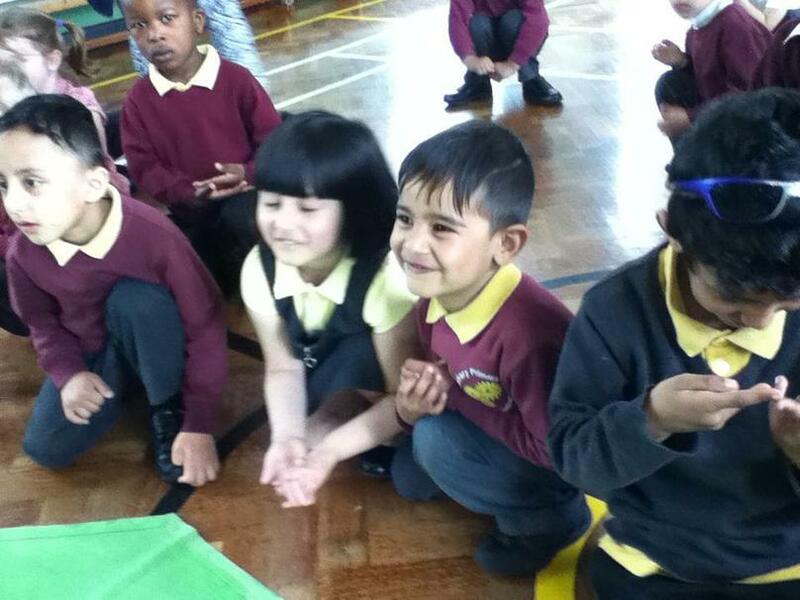 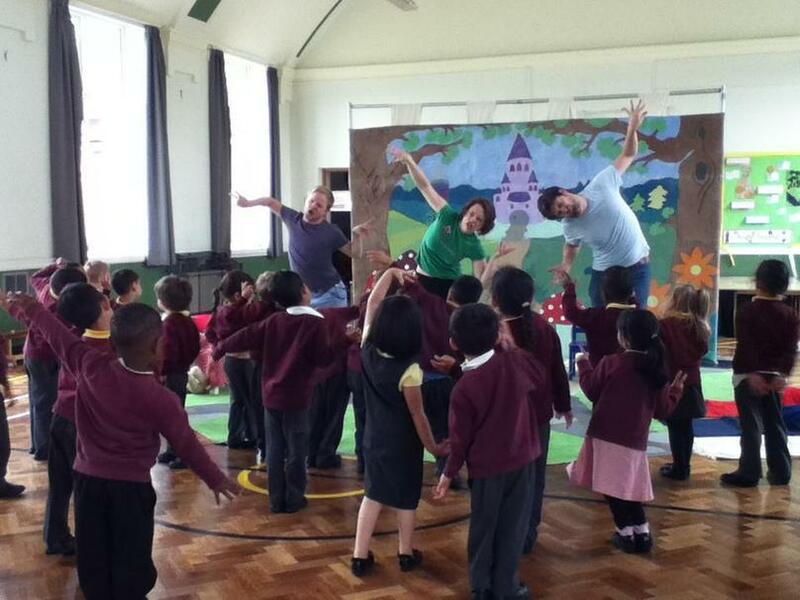 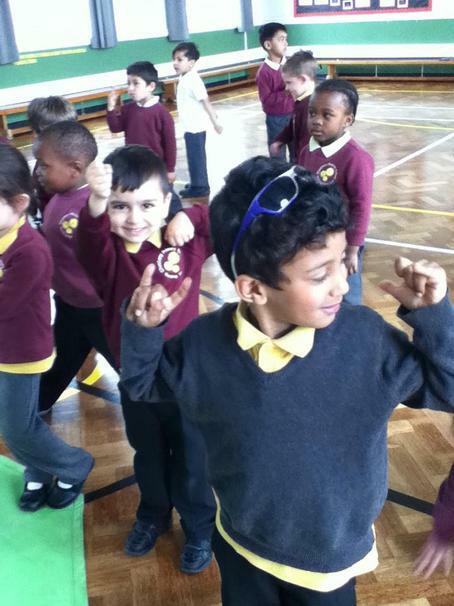 We worked together to look after them and watch them grow! 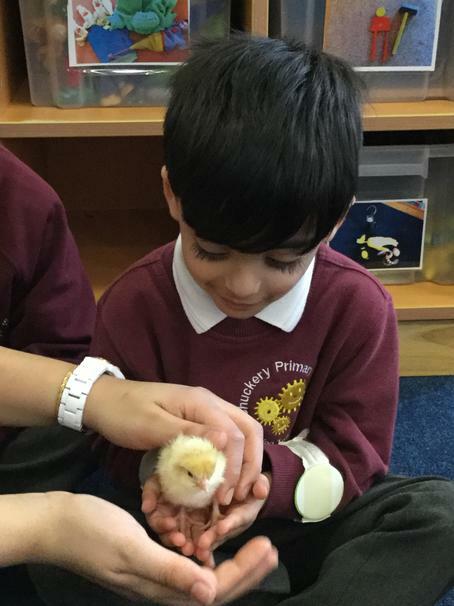 They are now in their new homes with some of the teachers so we look forward to seeing photos when they have grown even bigger!" 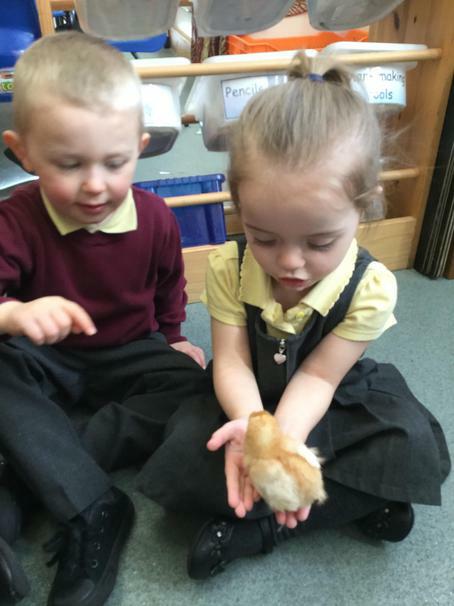 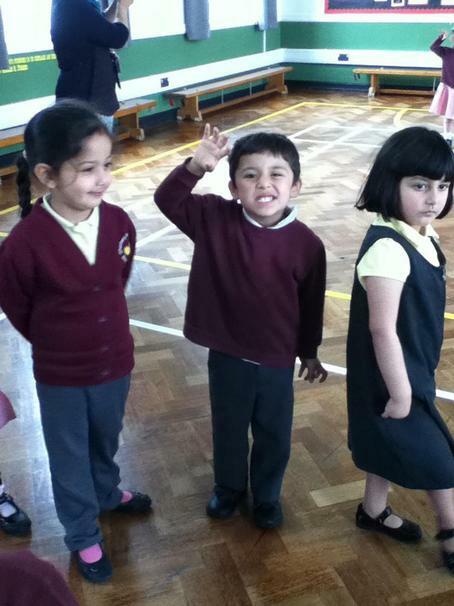 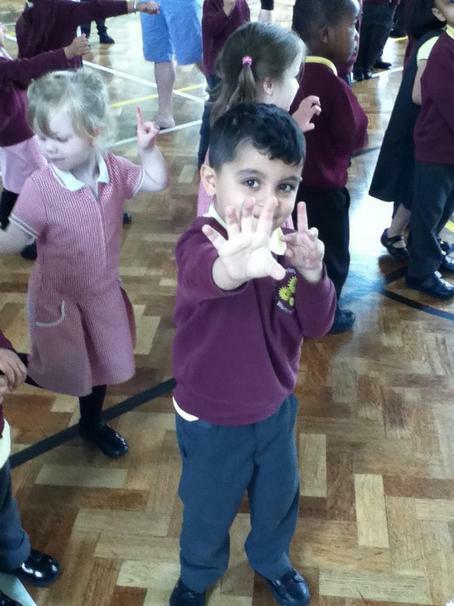 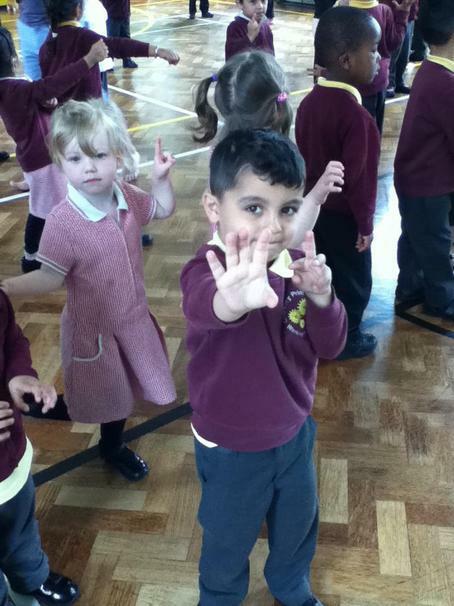 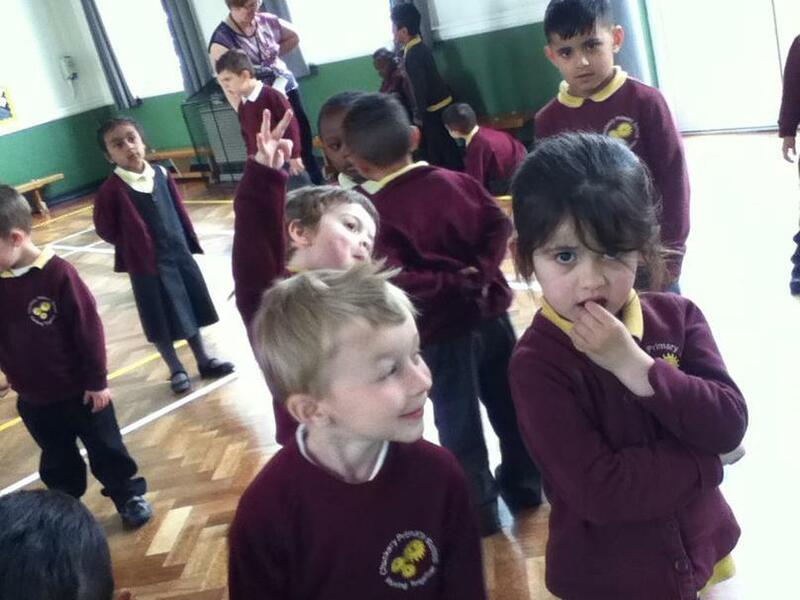 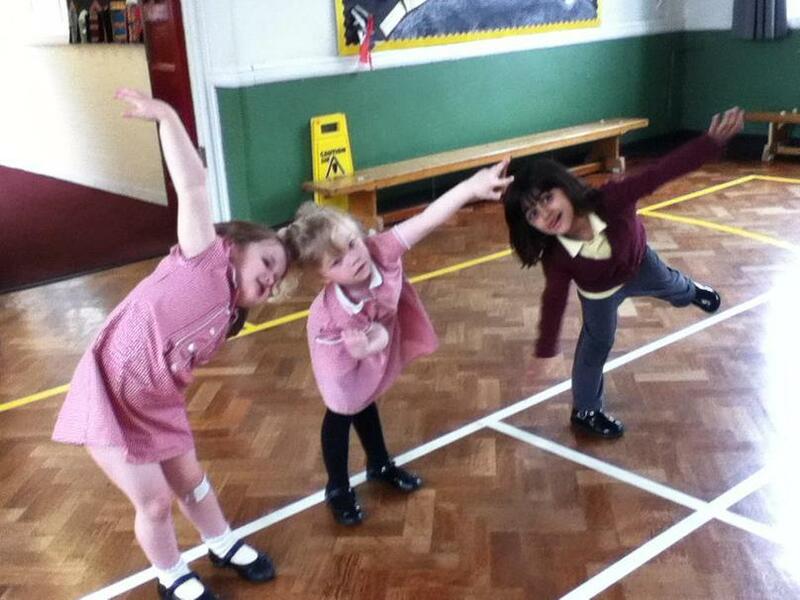 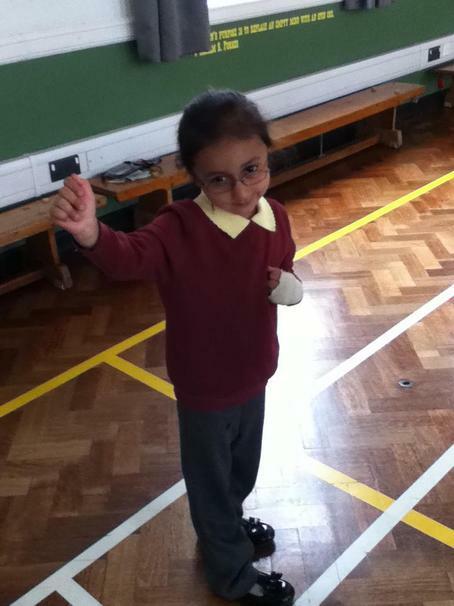 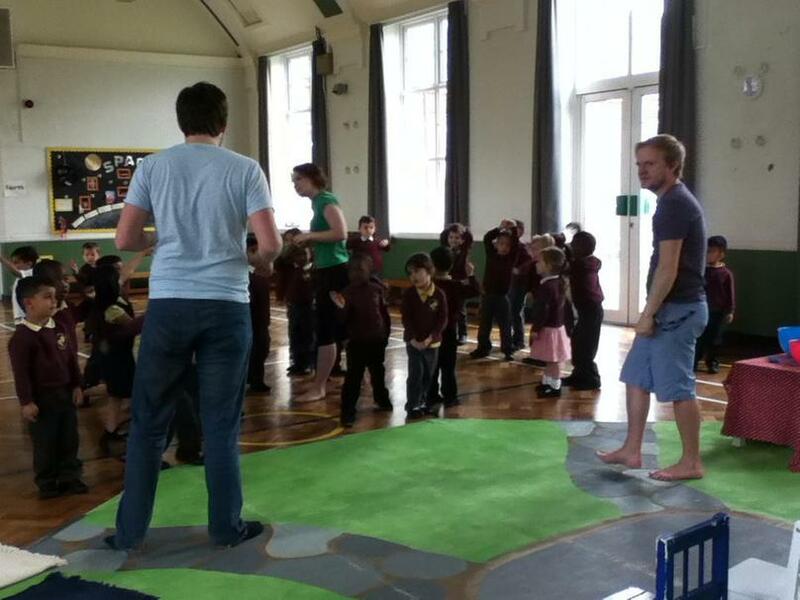 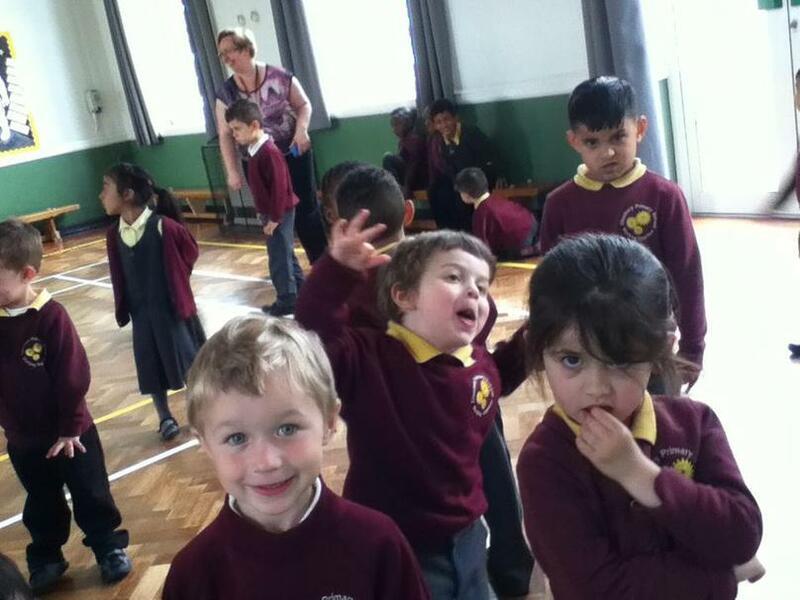 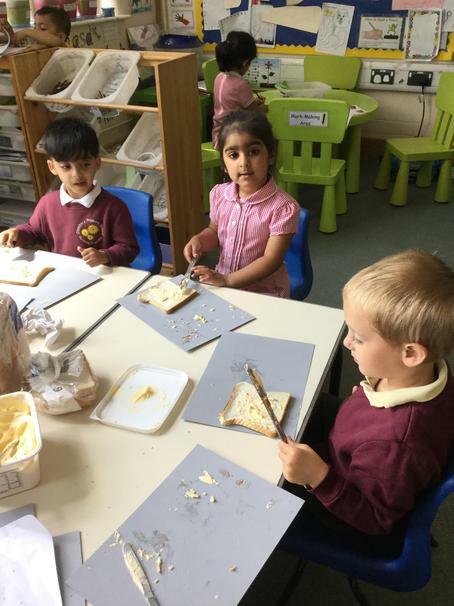 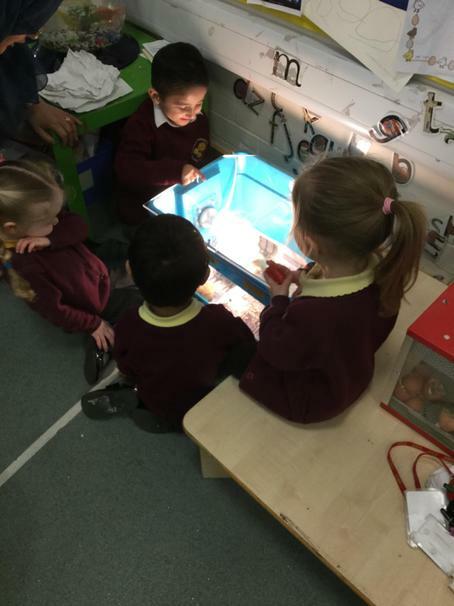 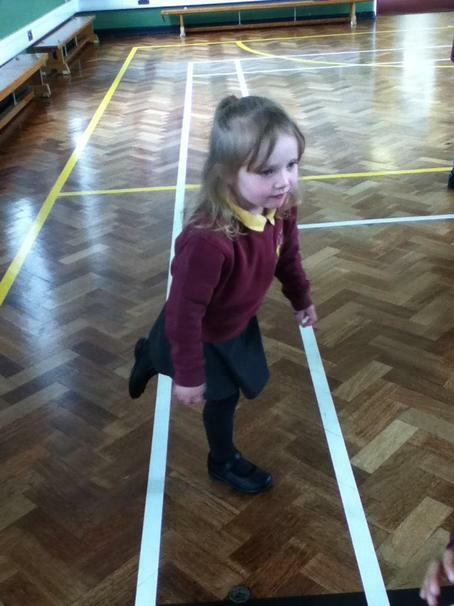 "Nursery have had some guests last week! 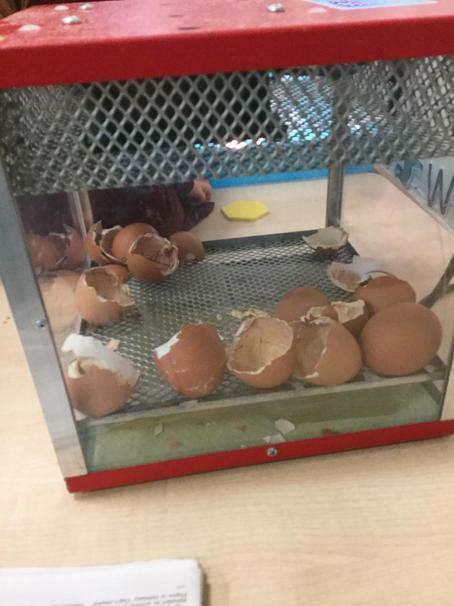 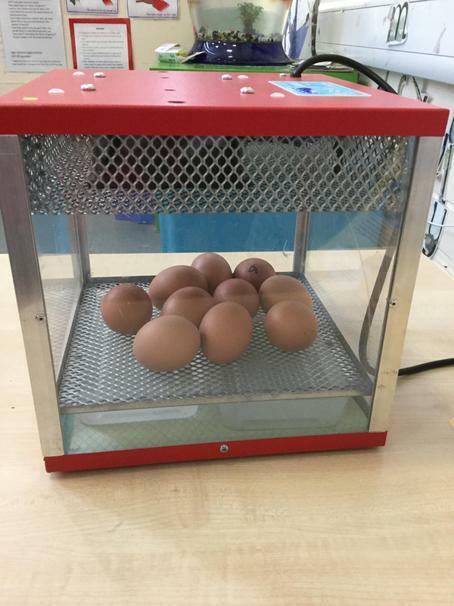 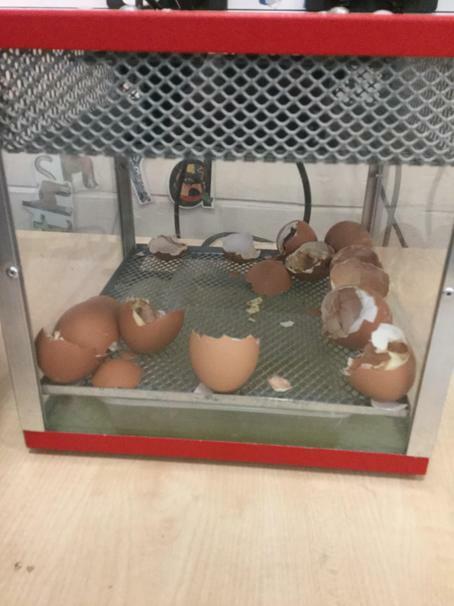 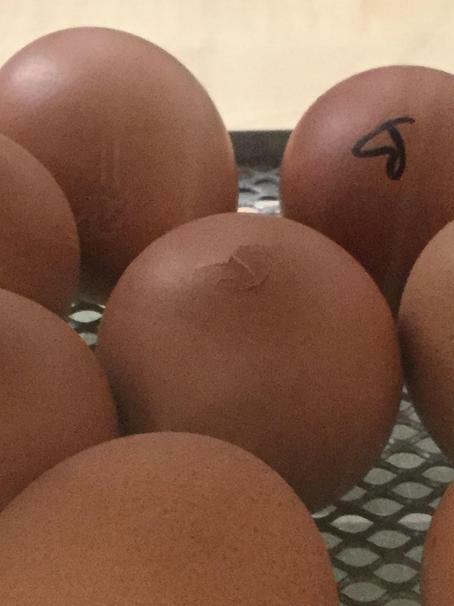 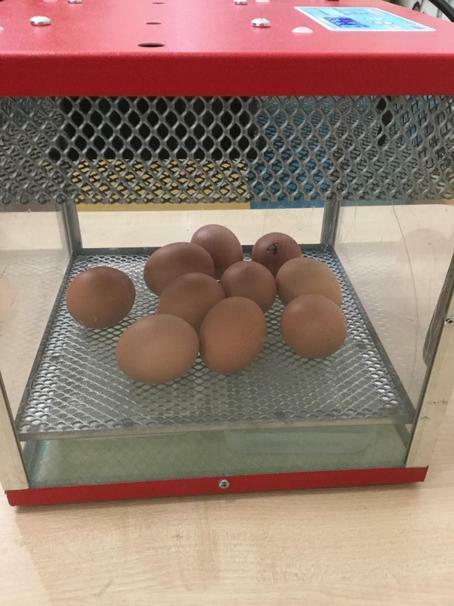 On Monday 10 eggs were delivered and we have enjoyed watching them hatch into chicks. 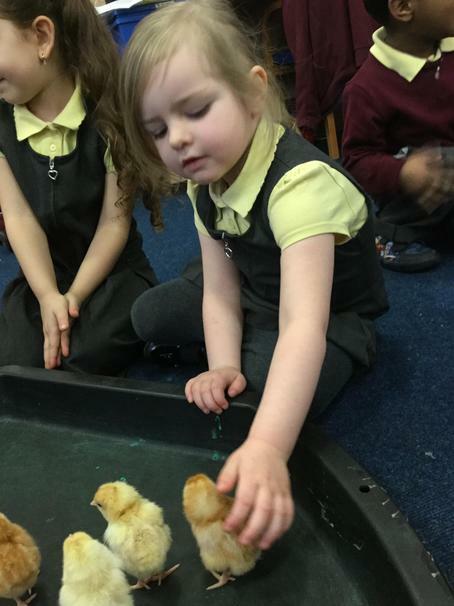 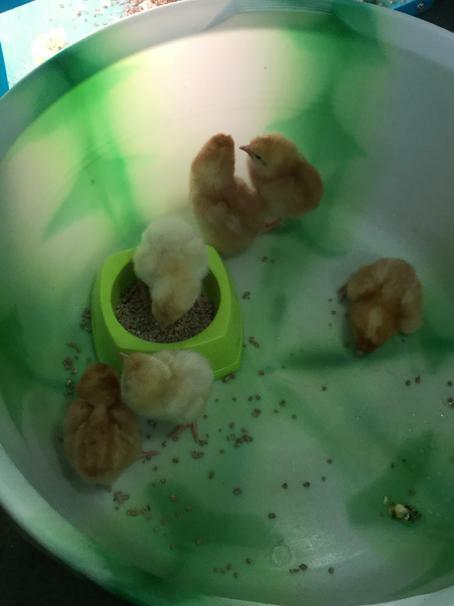 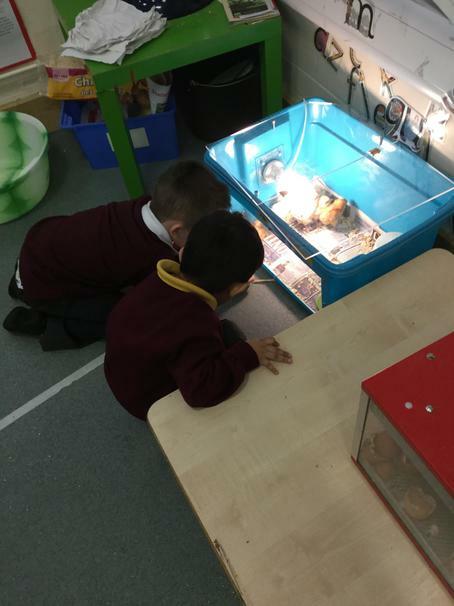 We have worked together to look after the chicks making sure they are clean and have enough food and water. 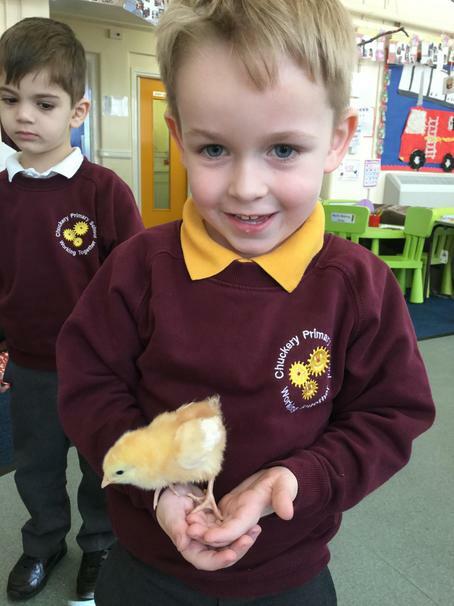 We have learnt lots about the life cycle of a chicken. 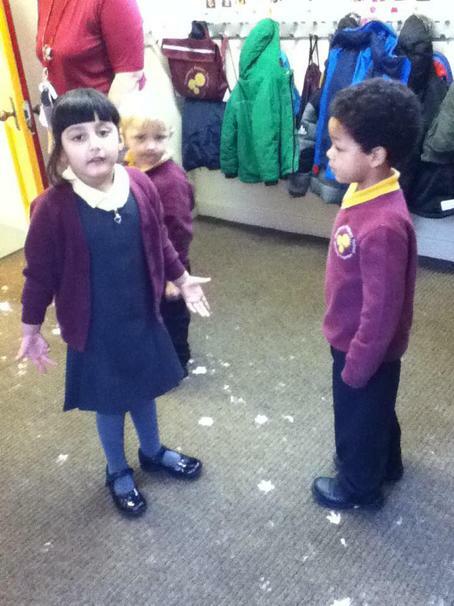 Why don't you ask us what we have learnt!" 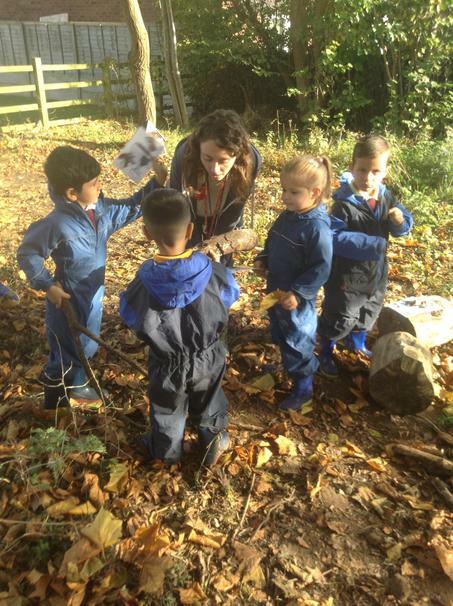 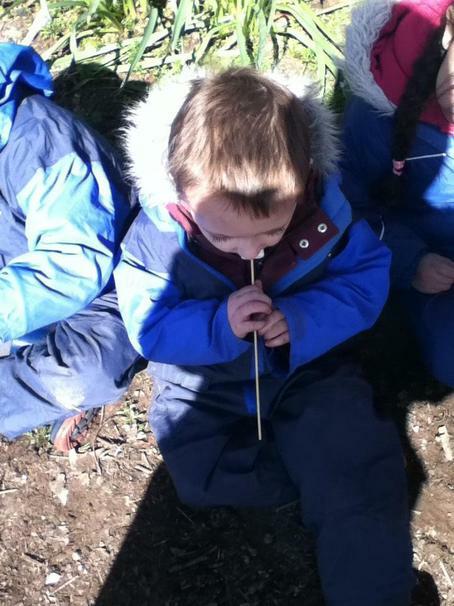 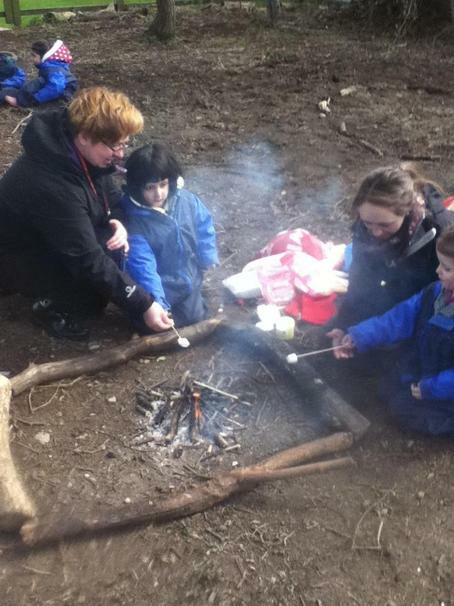 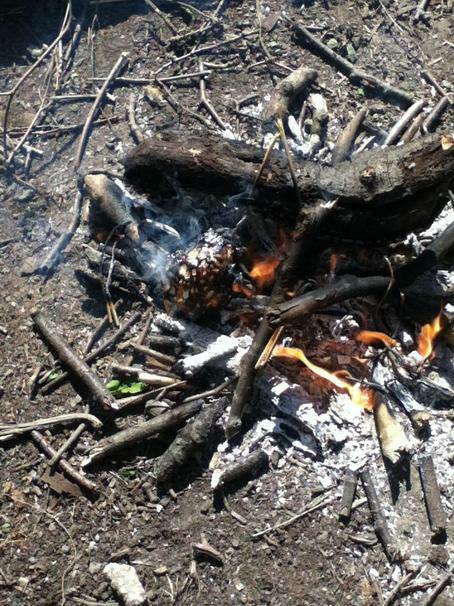 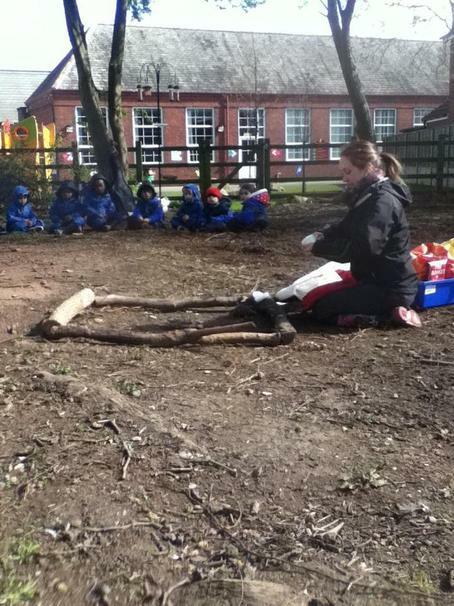 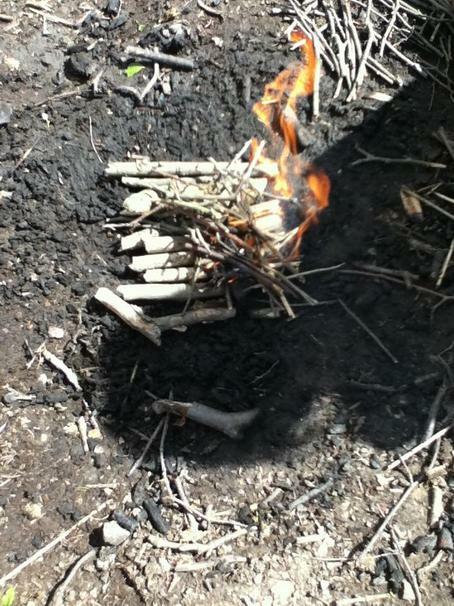 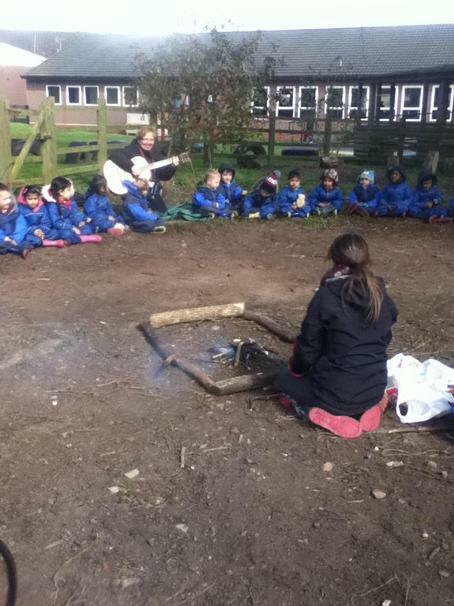 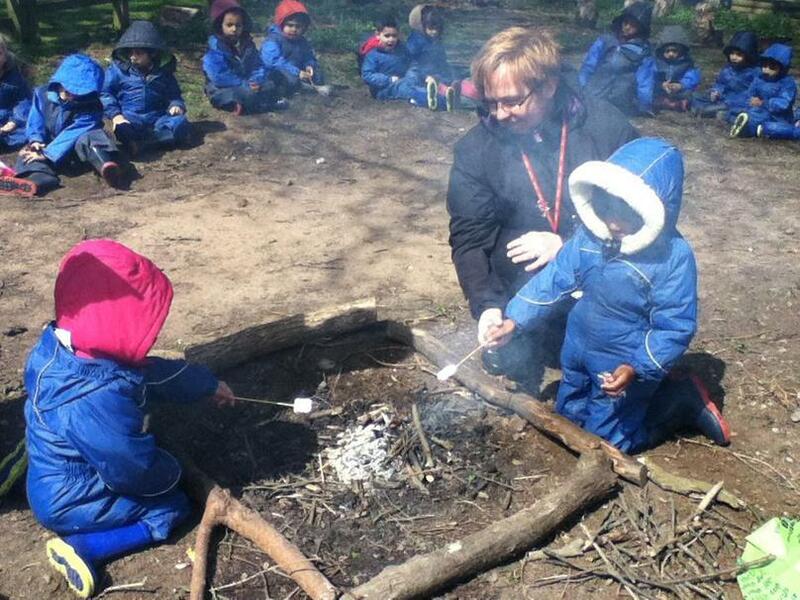 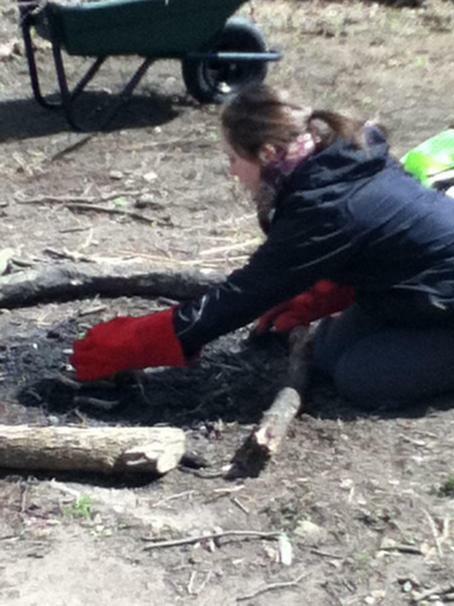 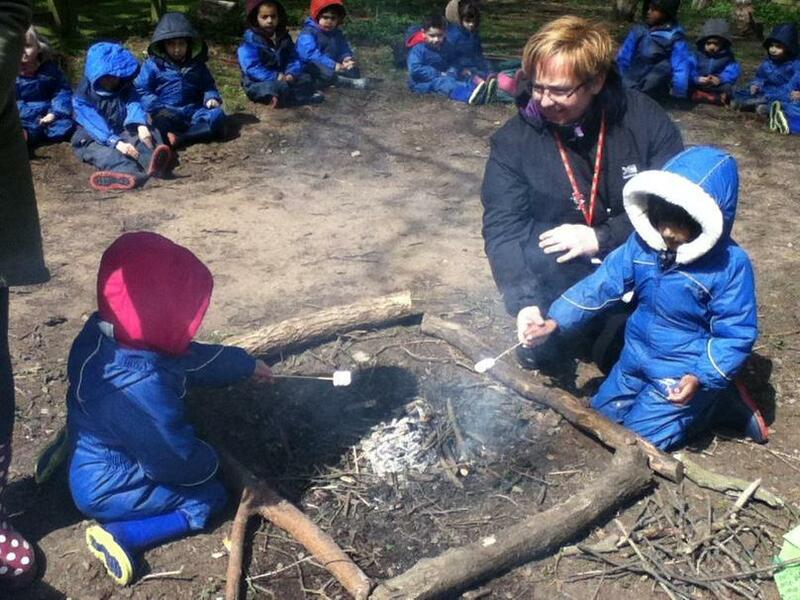 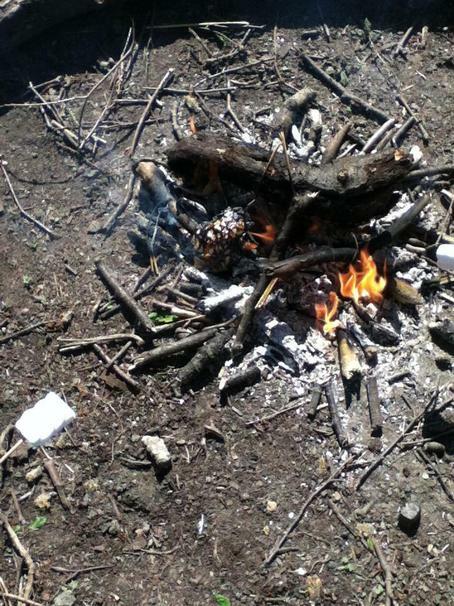 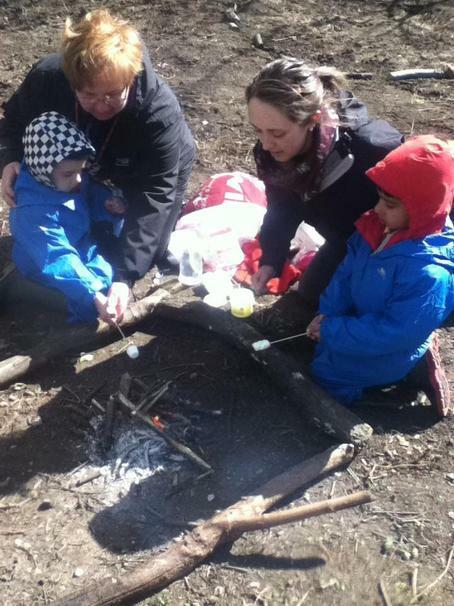 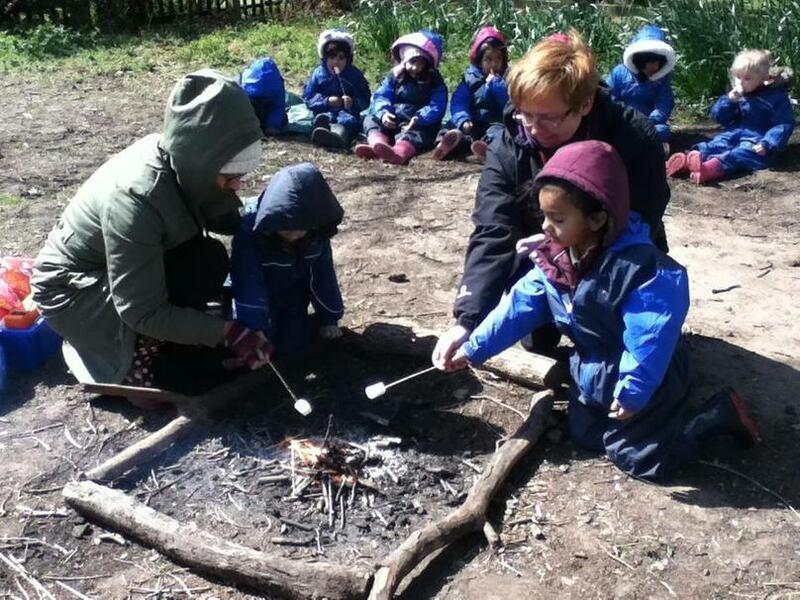 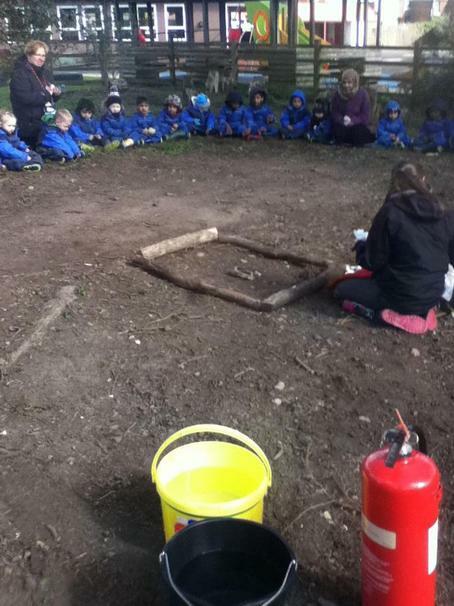 Nursery had lots of fun at Forest School today! 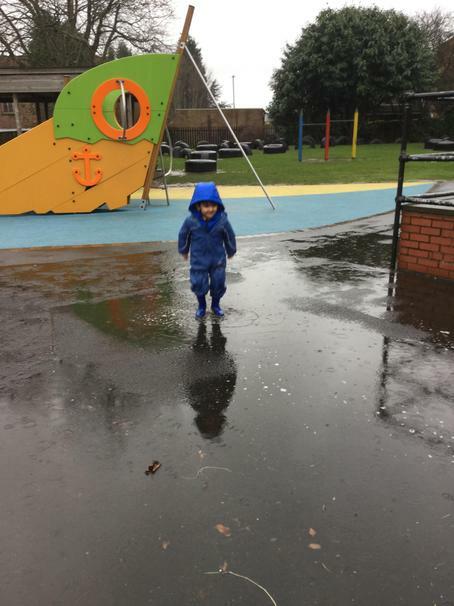 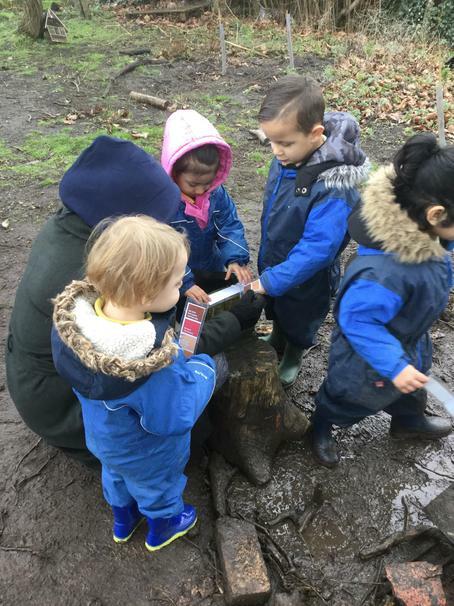 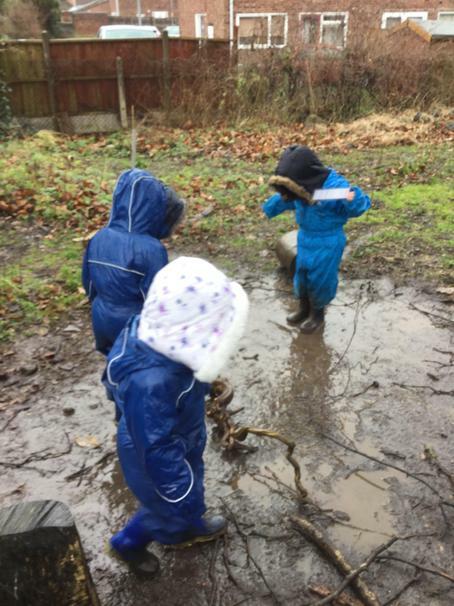 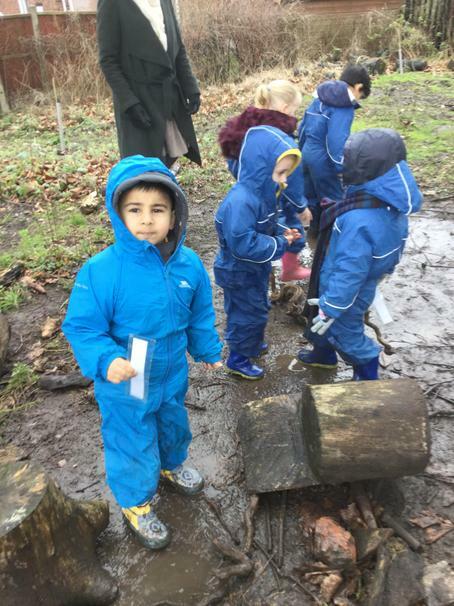 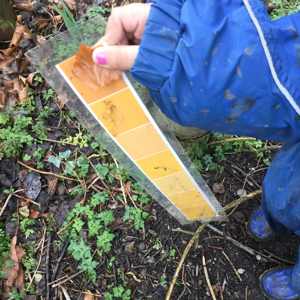 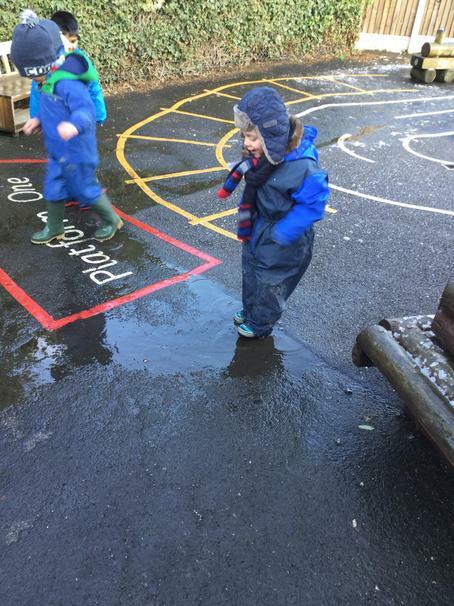 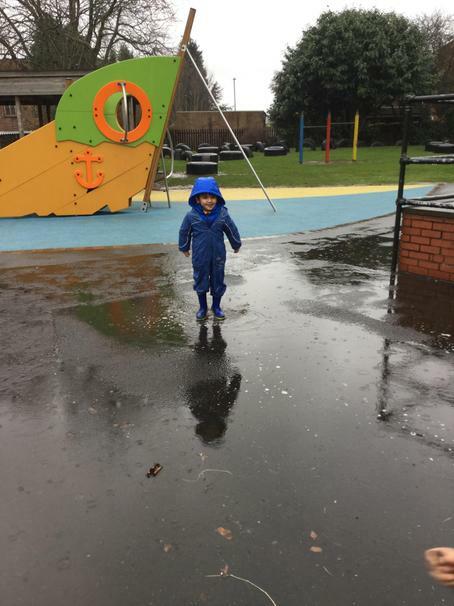 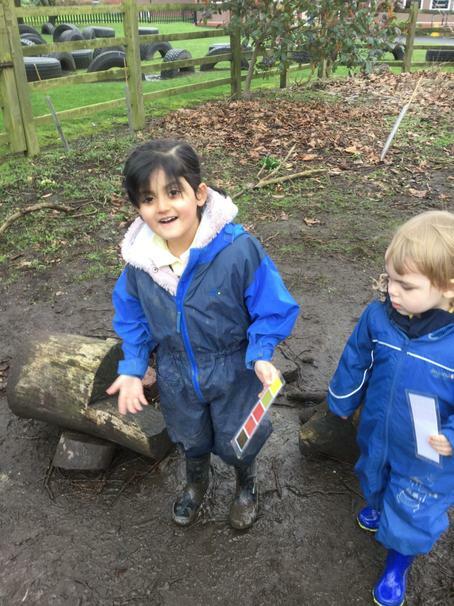 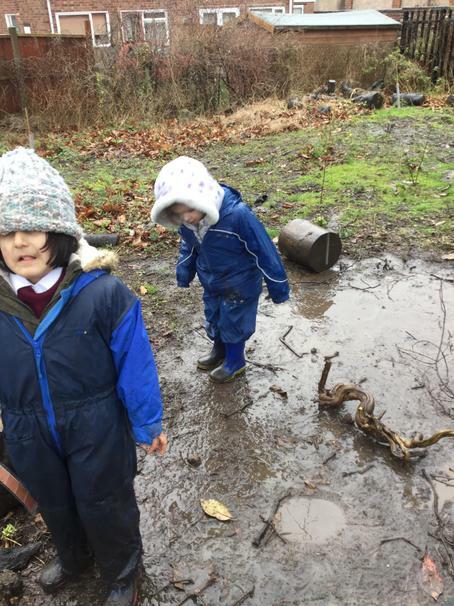 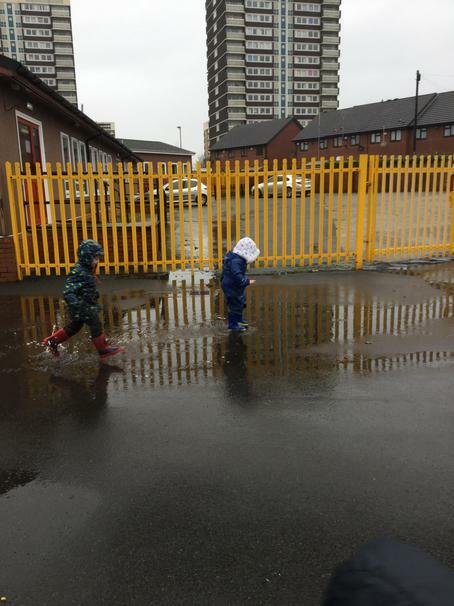 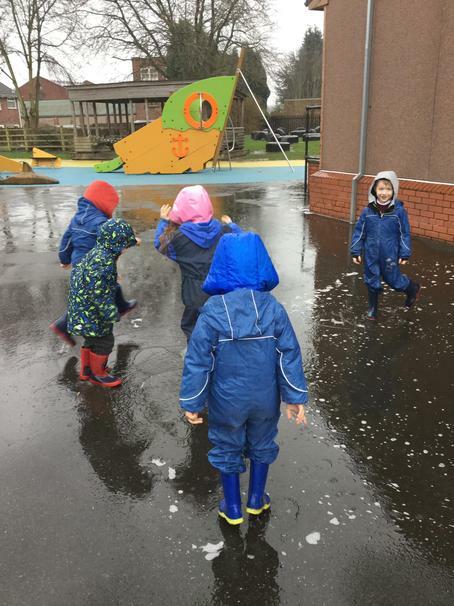 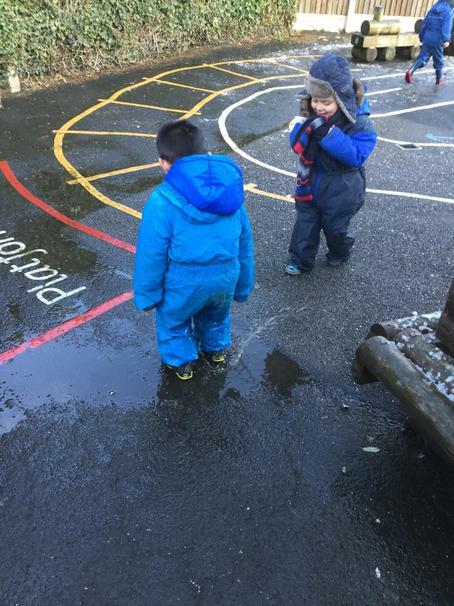 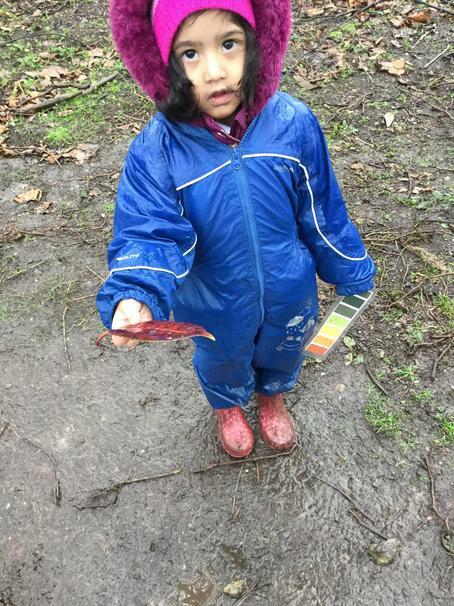 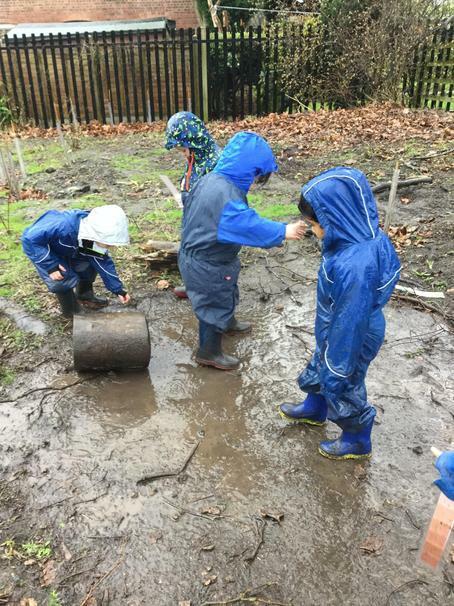 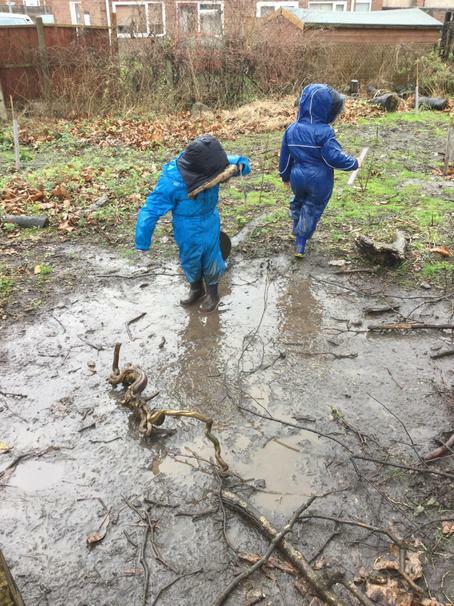 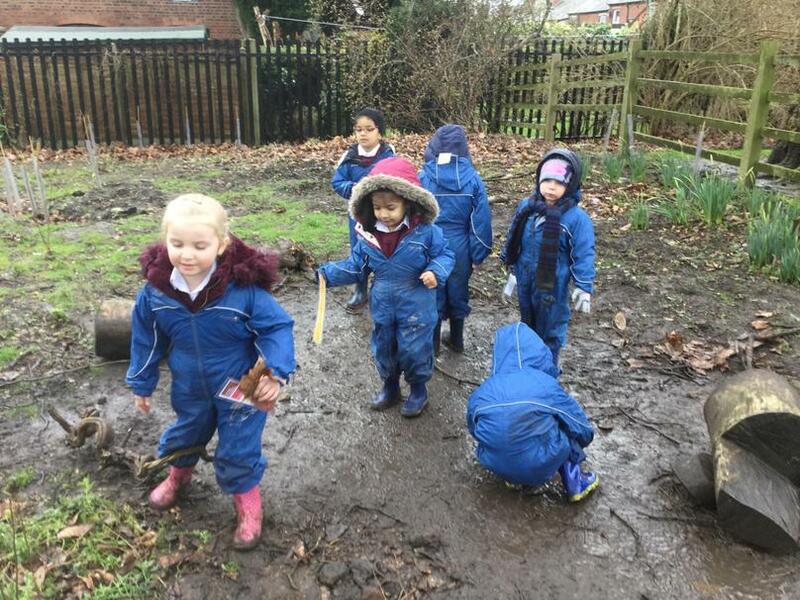 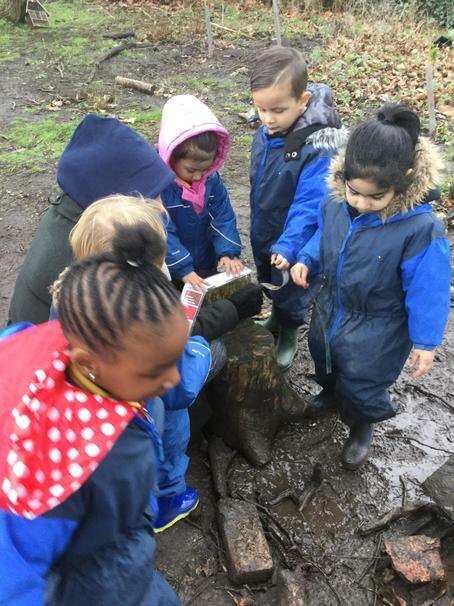 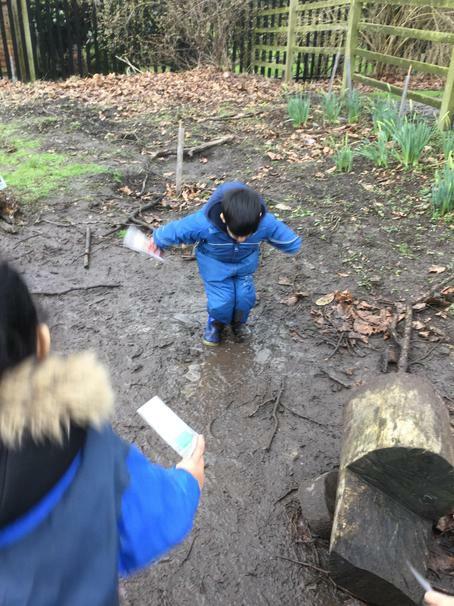 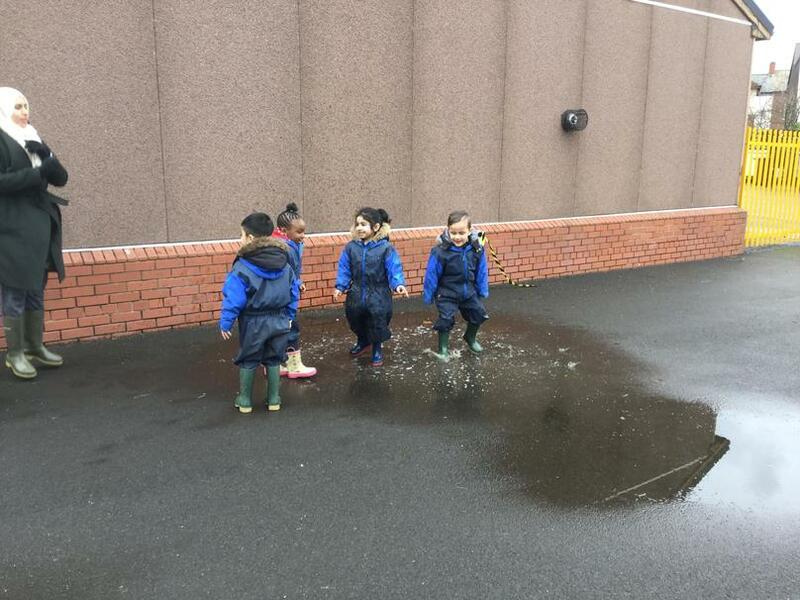 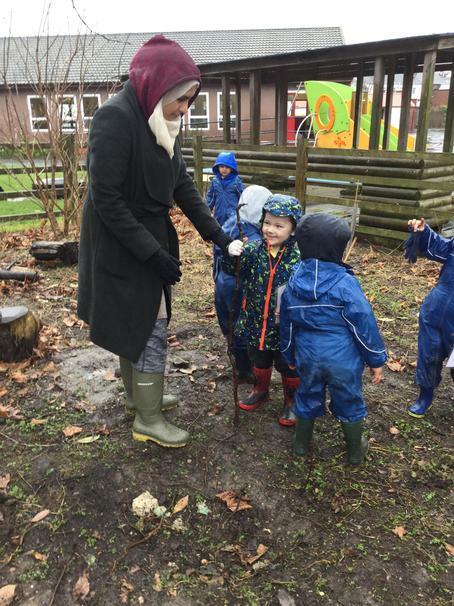 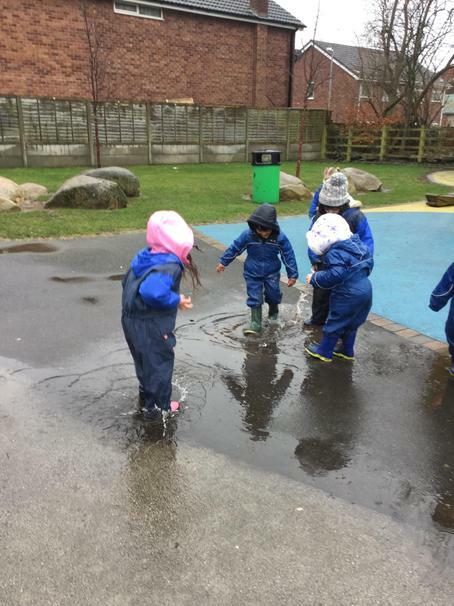 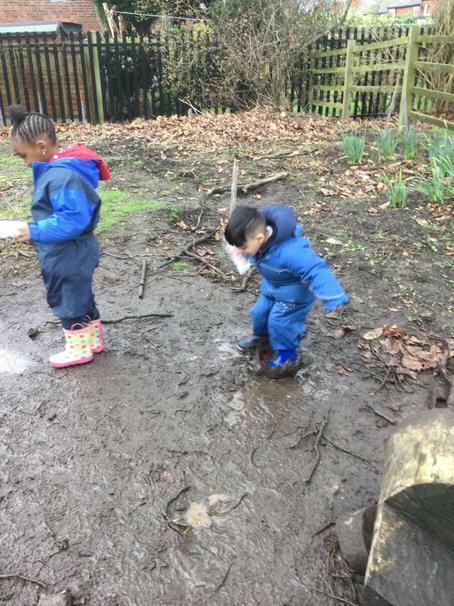 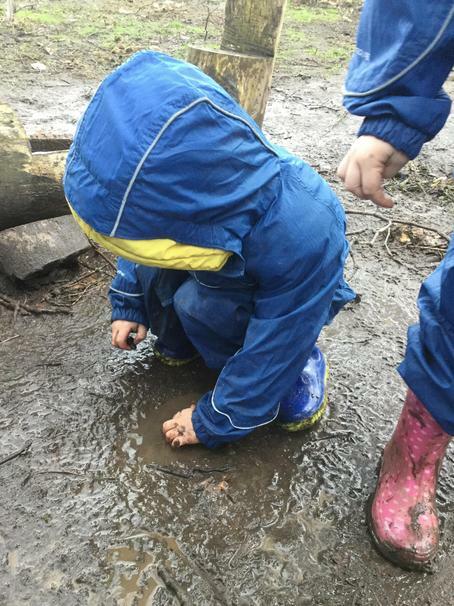 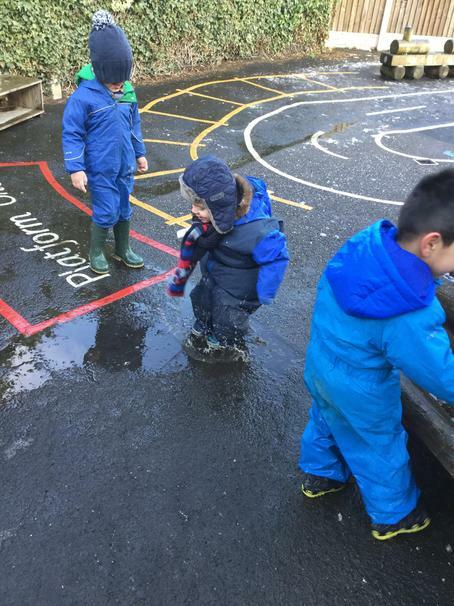 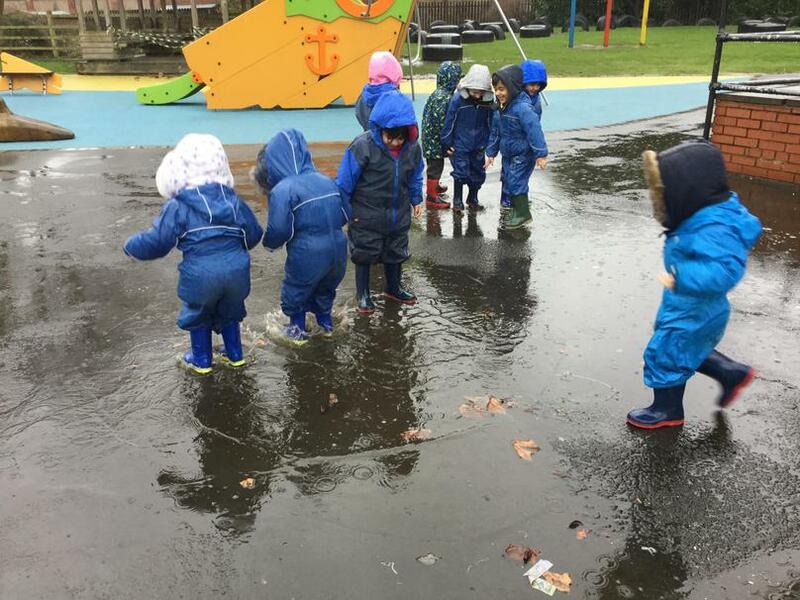 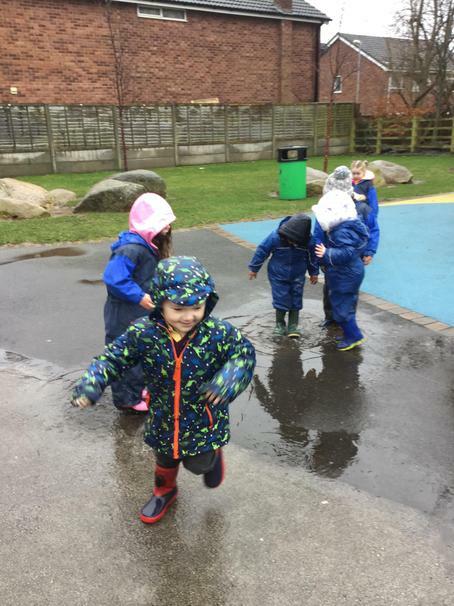 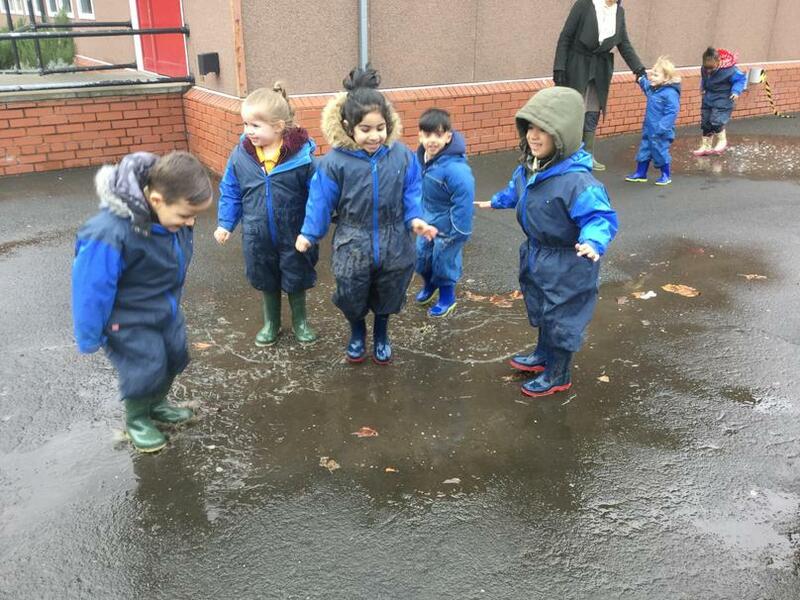 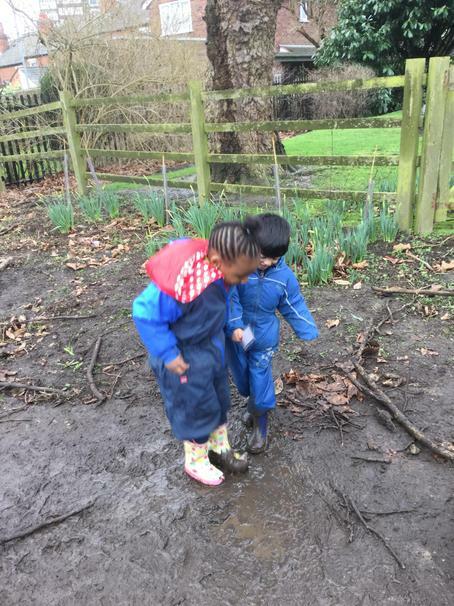 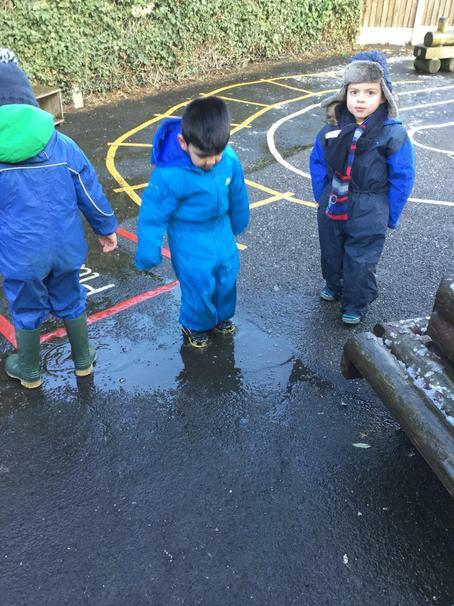 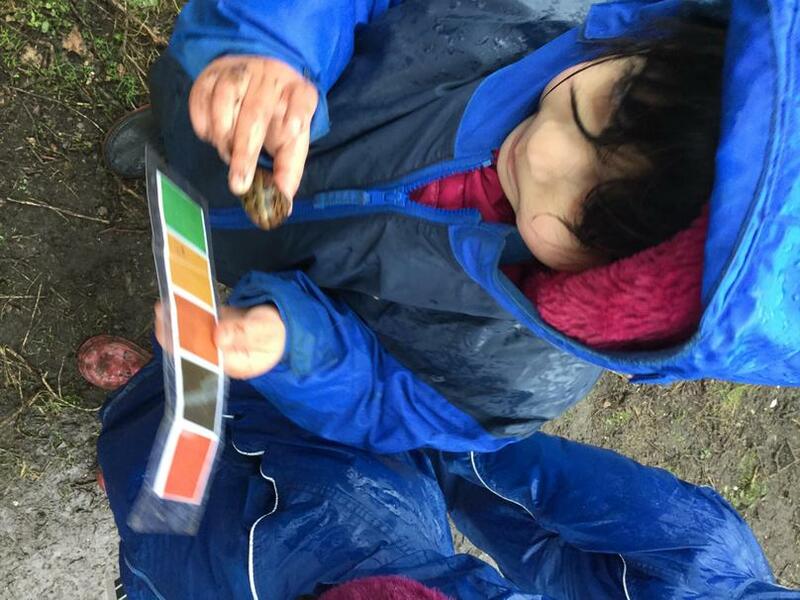 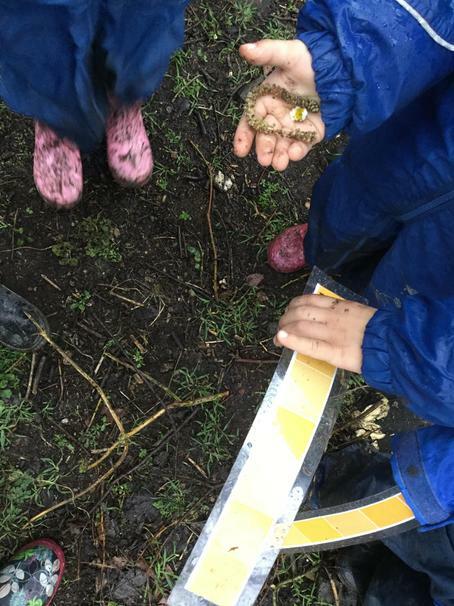 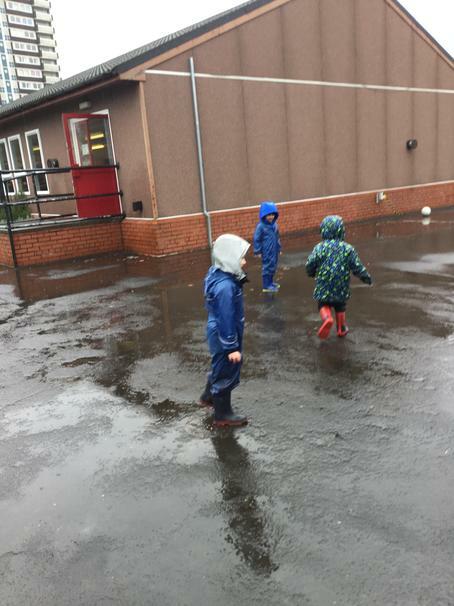 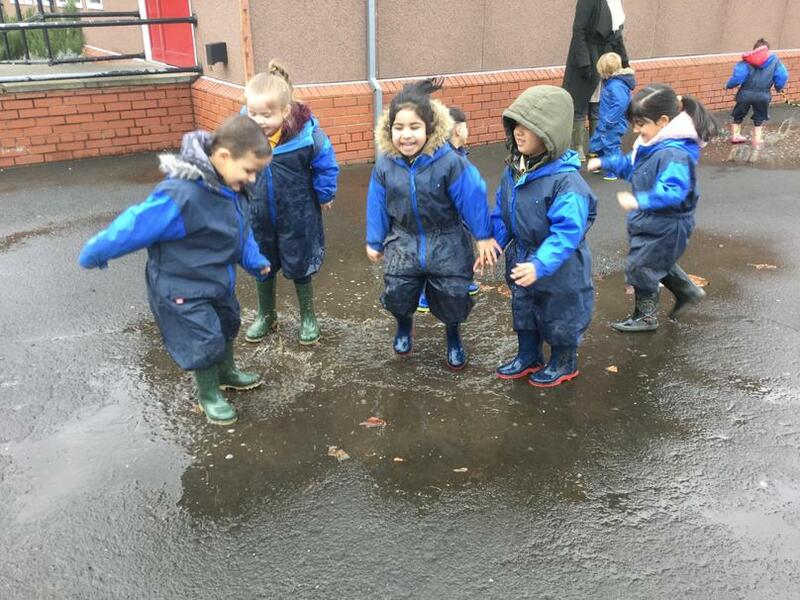 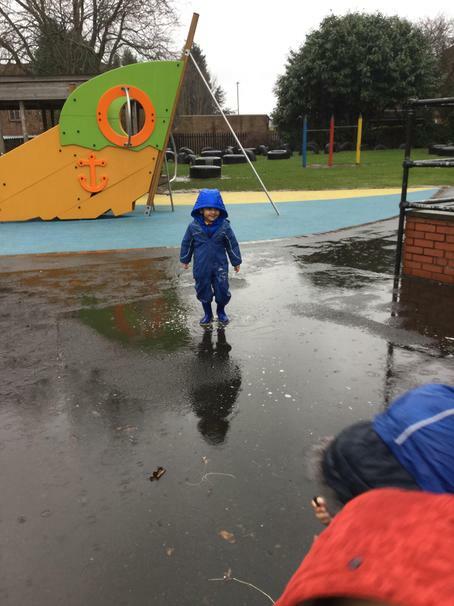 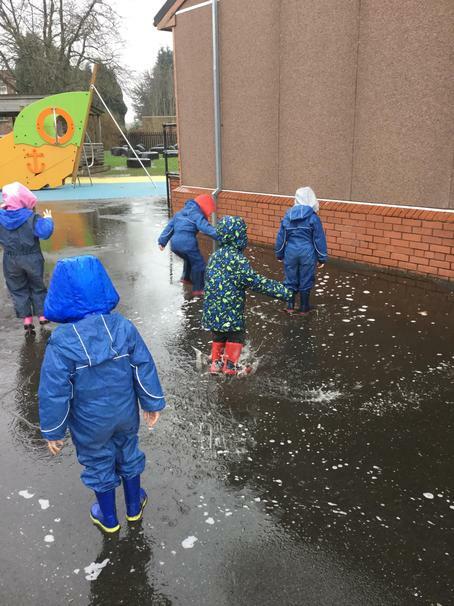 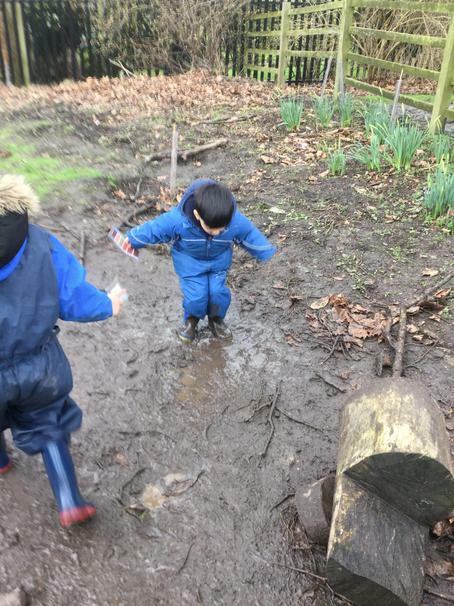 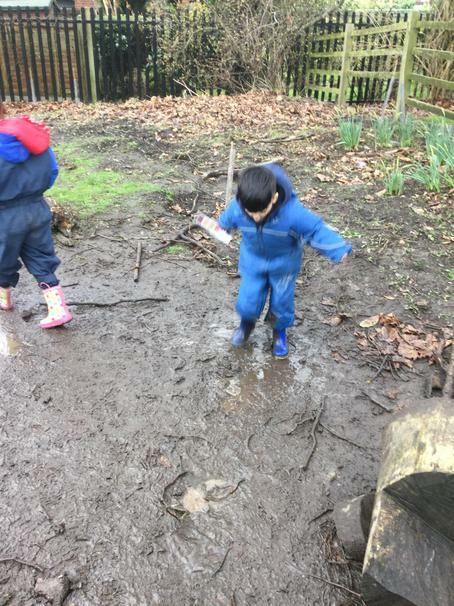 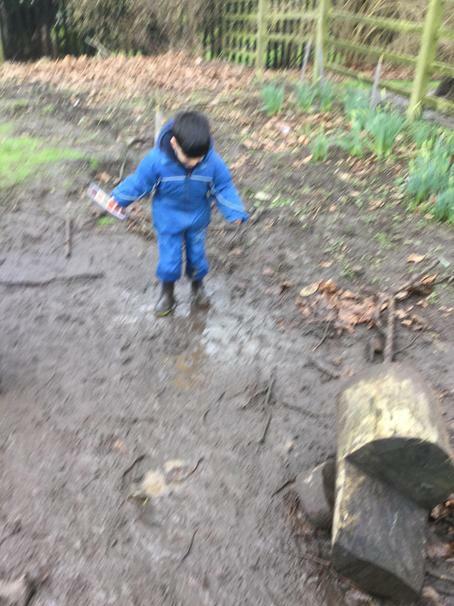 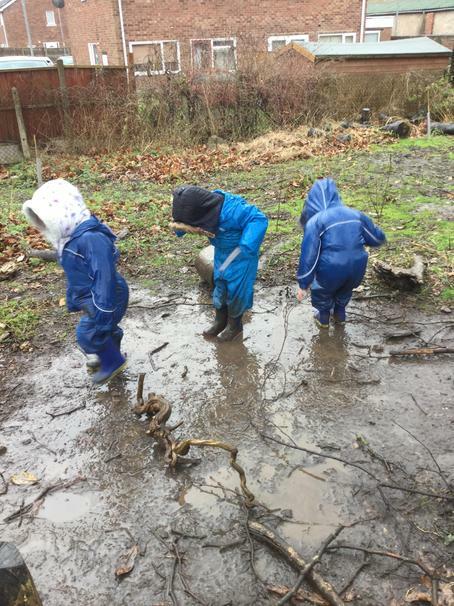 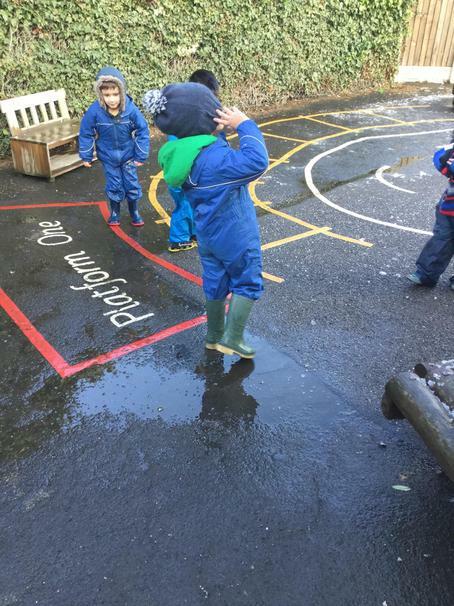 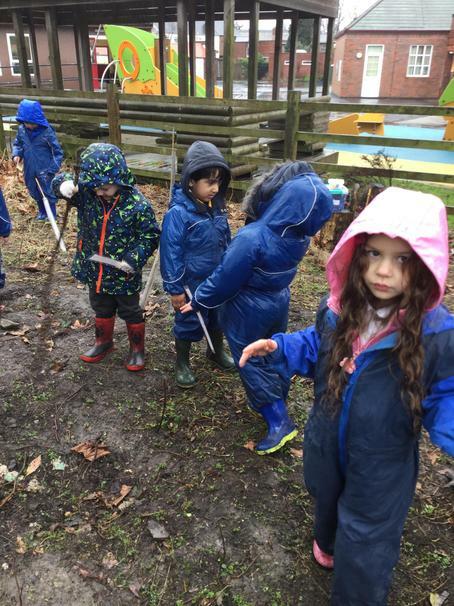 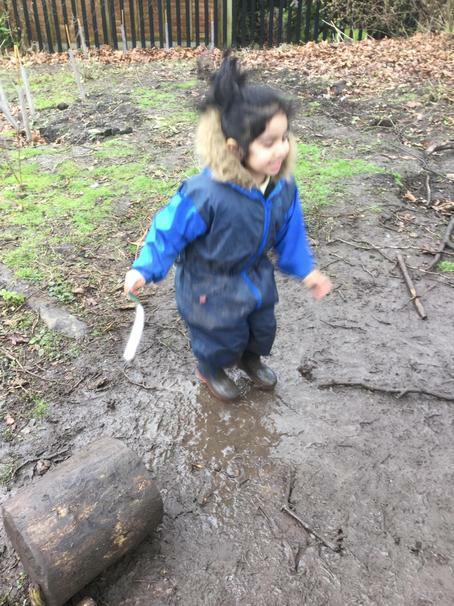 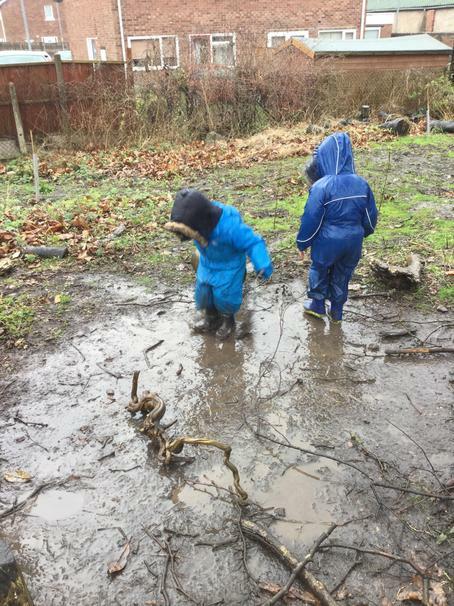 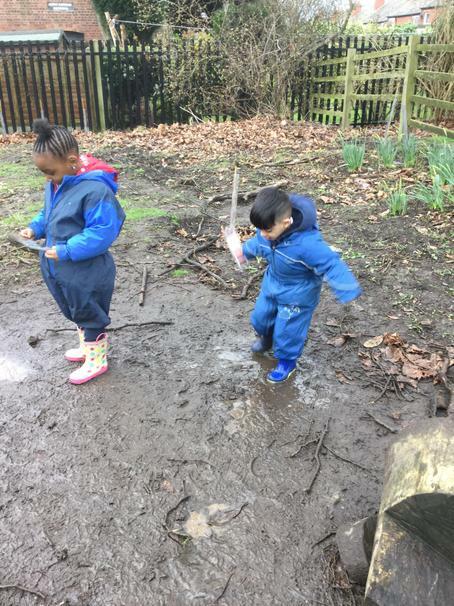 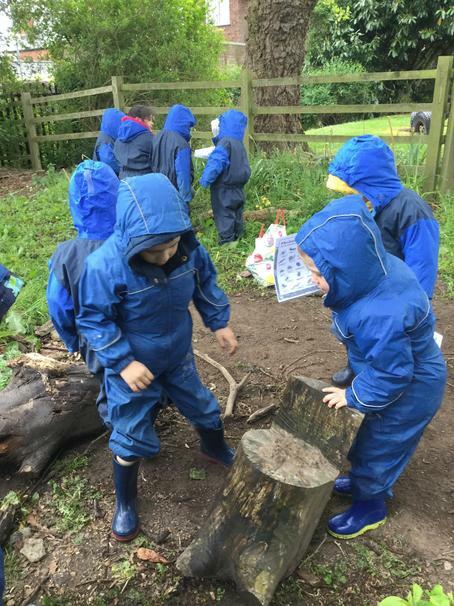 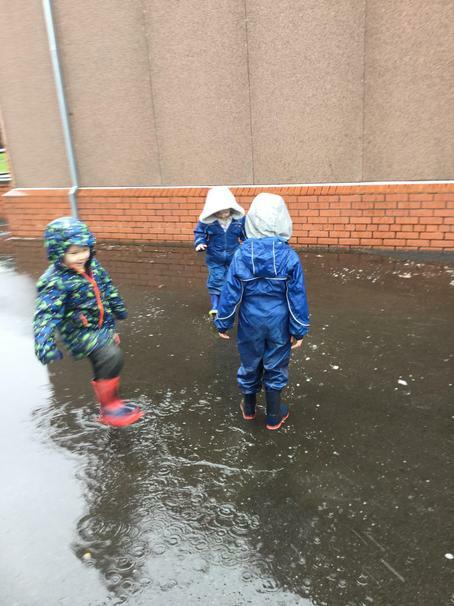 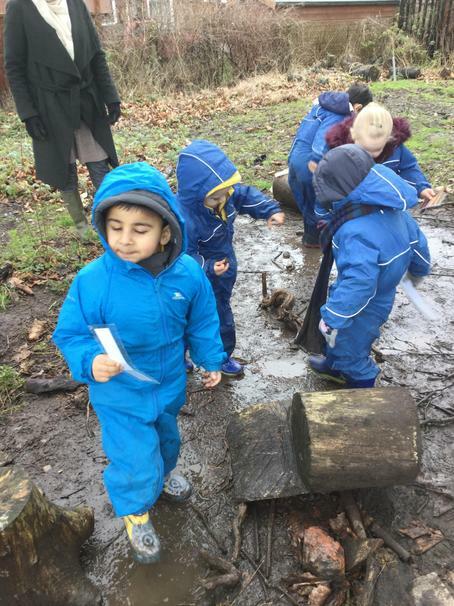 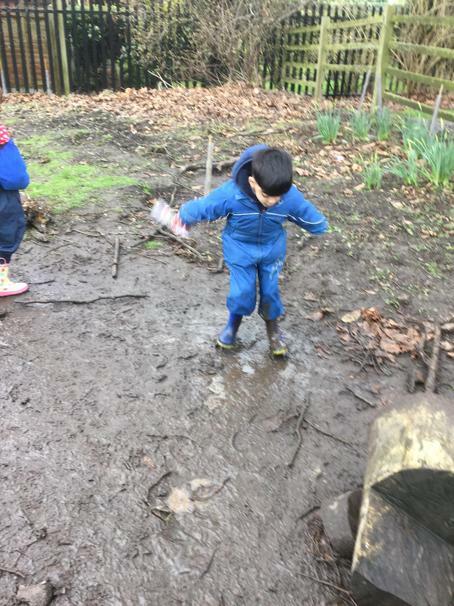 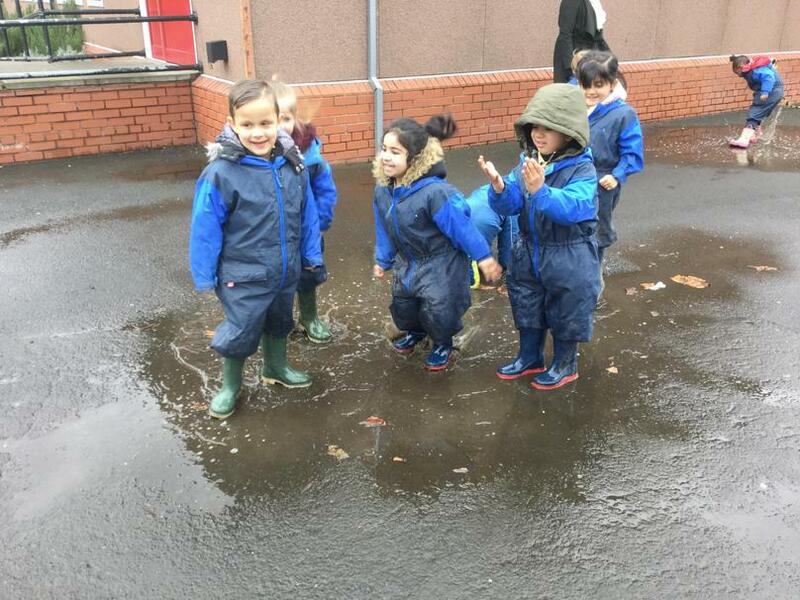 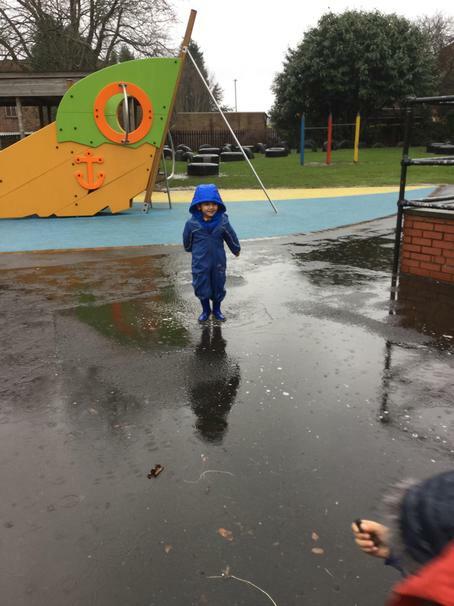 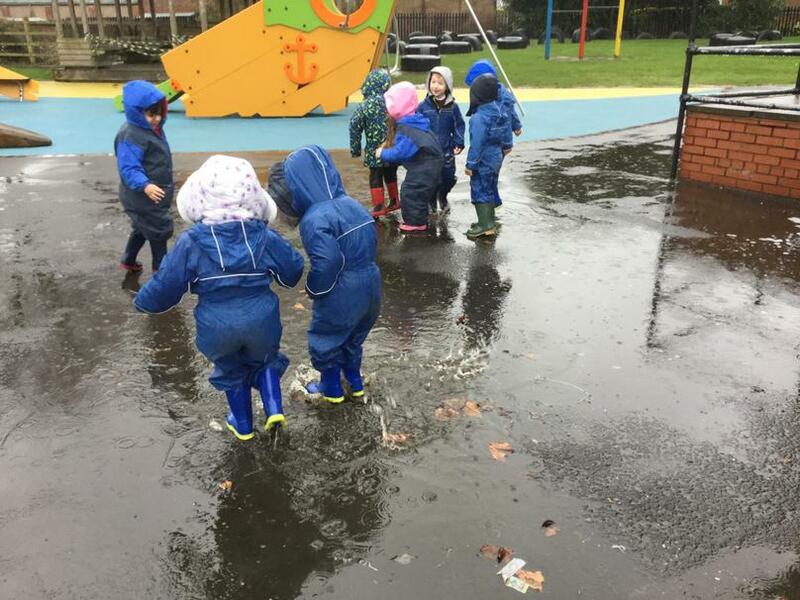 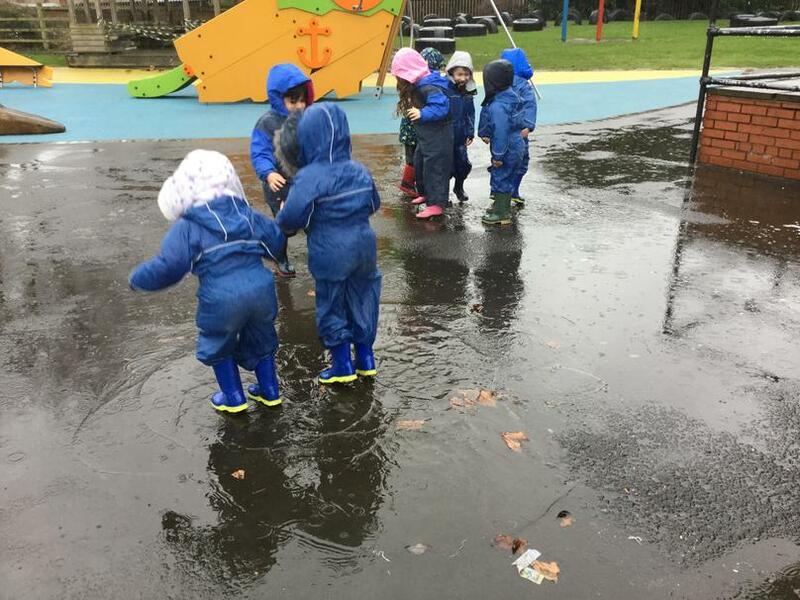 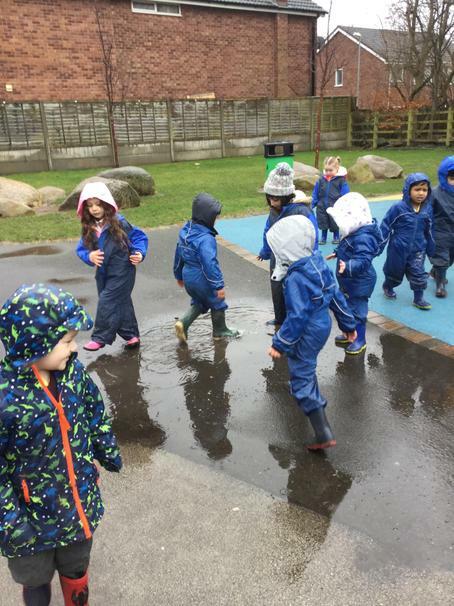 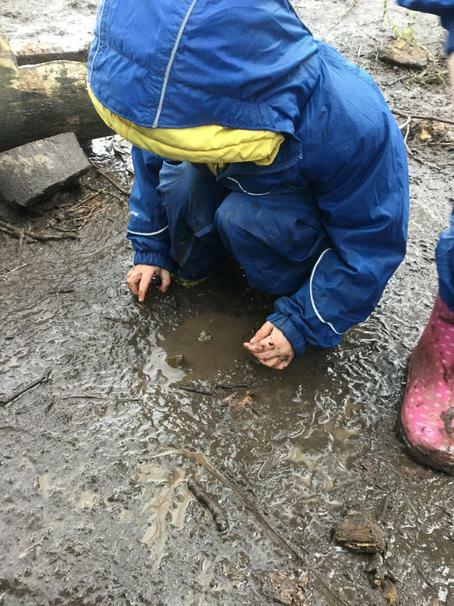 We explored the forest looking for different colours and we had lots of fun splashing in the puddles and playing in the mud! 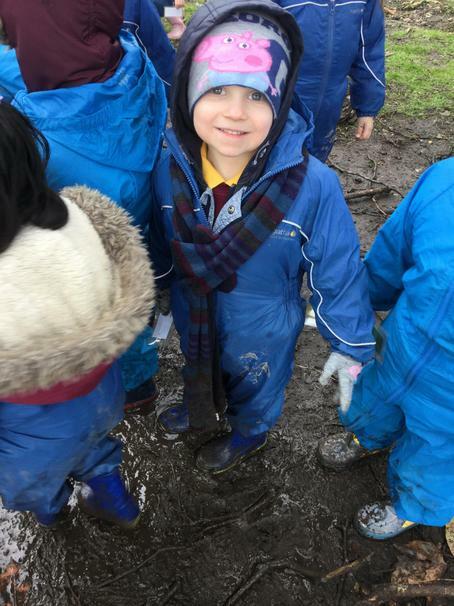 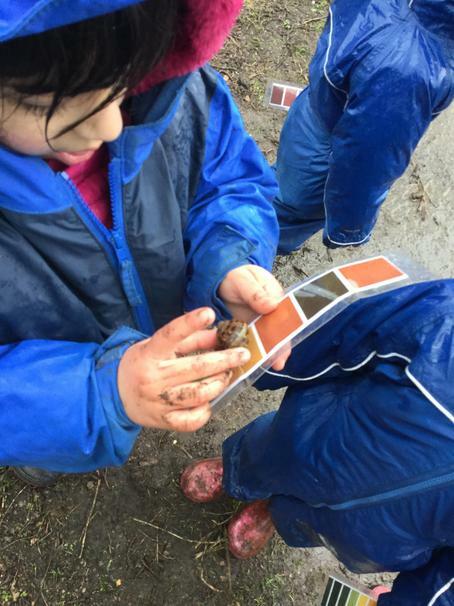 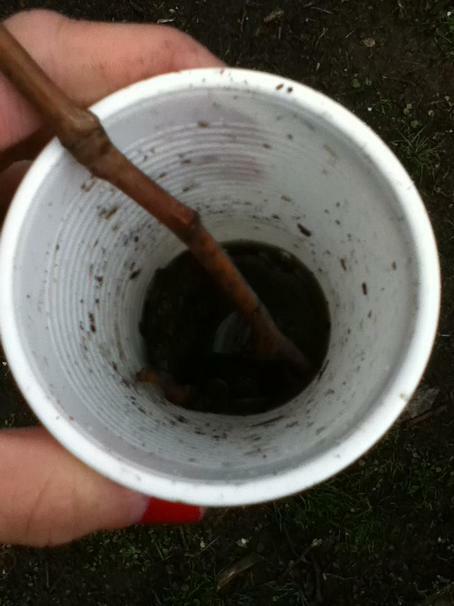 We used words like 'squelch', 'oooze', 'sticky' and 'gooey' to describe the how the mud sounded and felt! 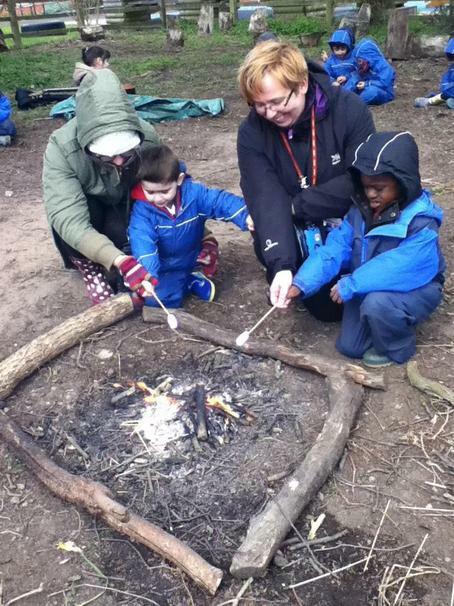 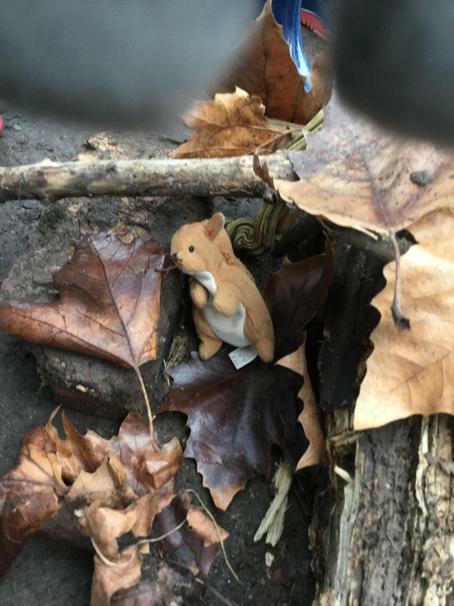 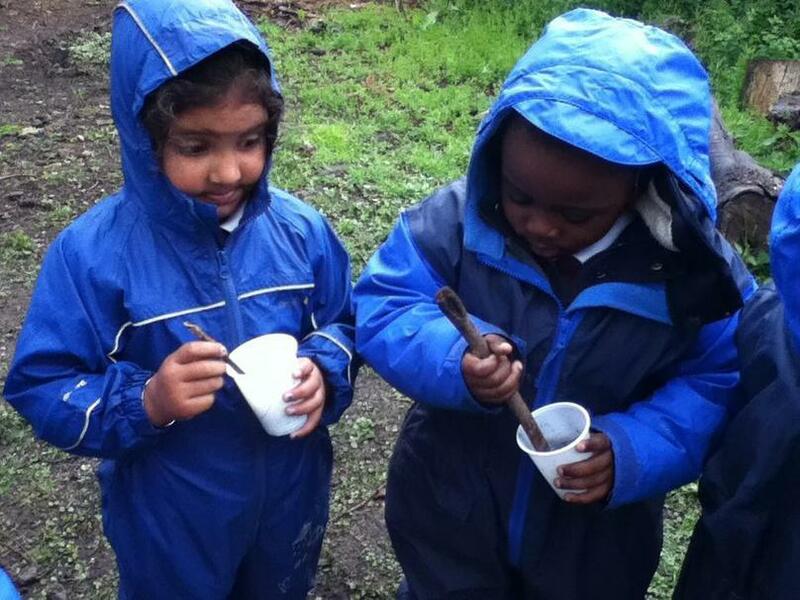 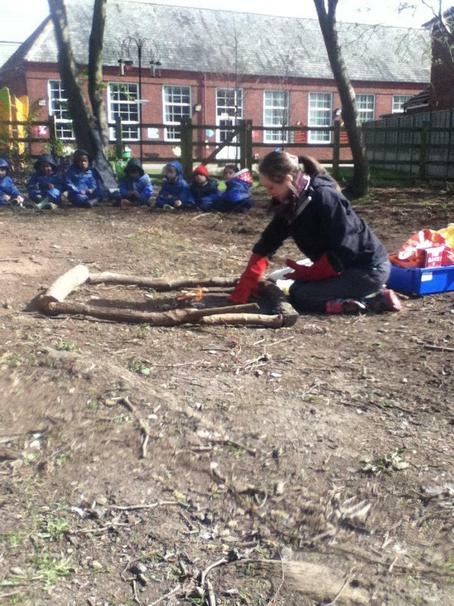 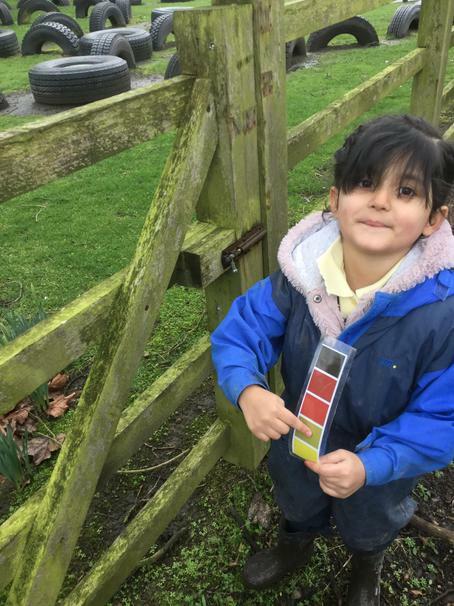 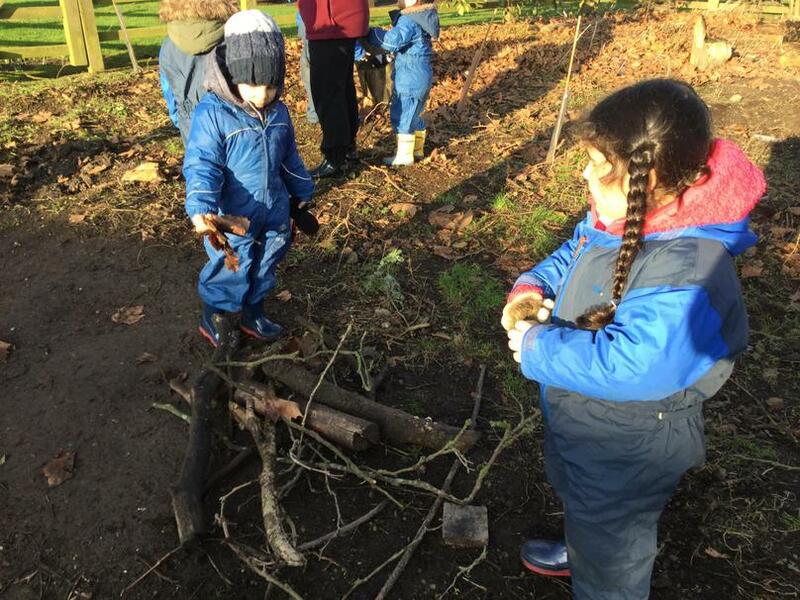 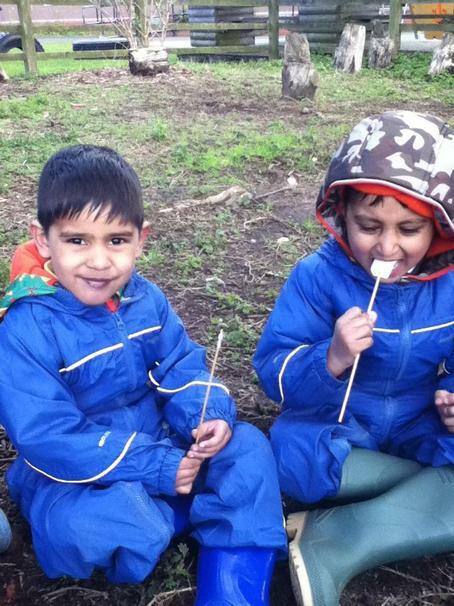 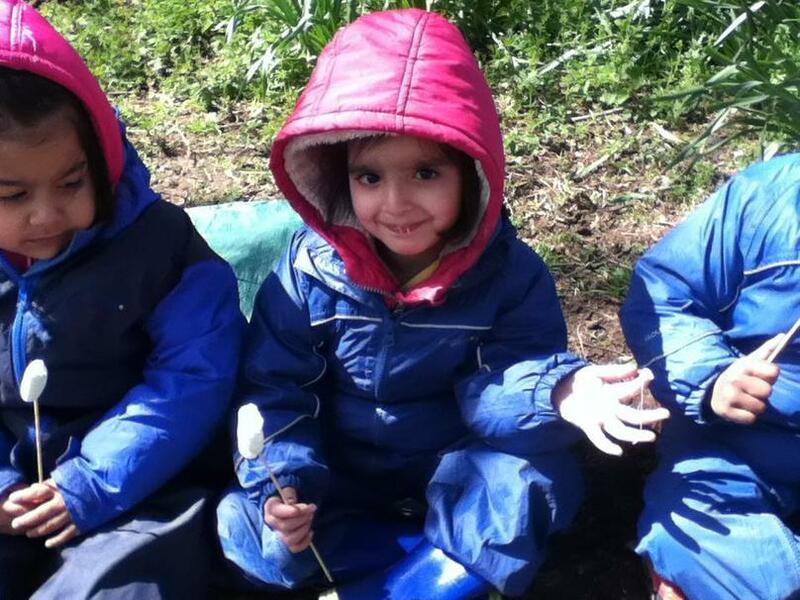 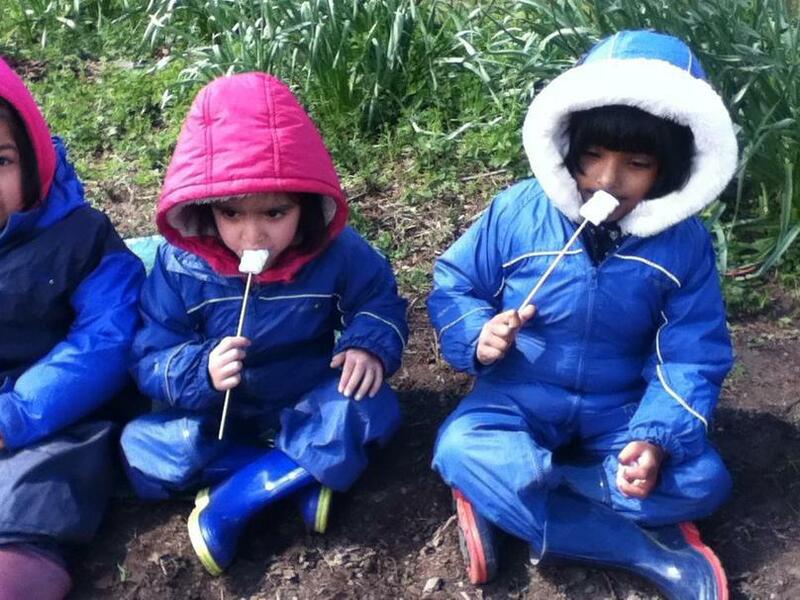 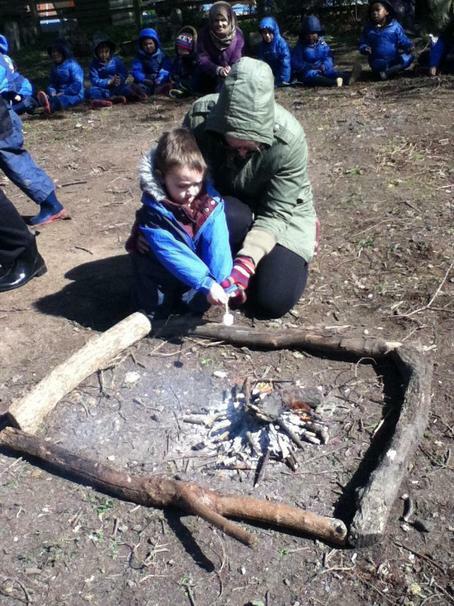 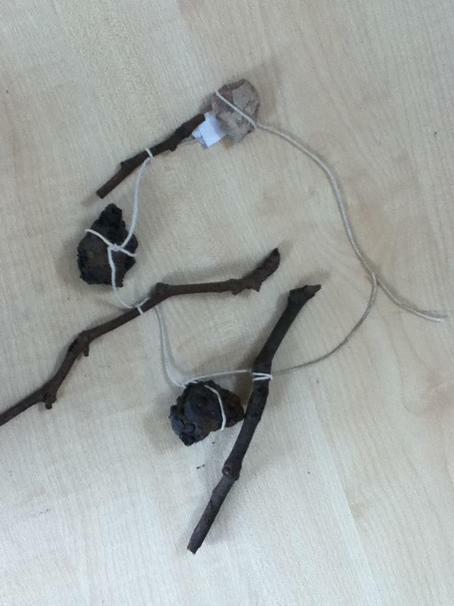 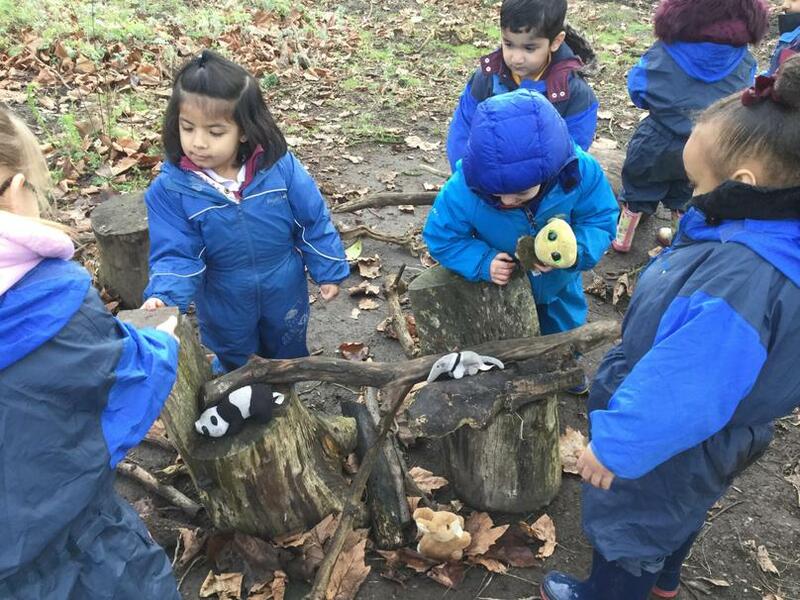 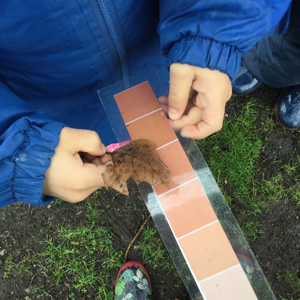 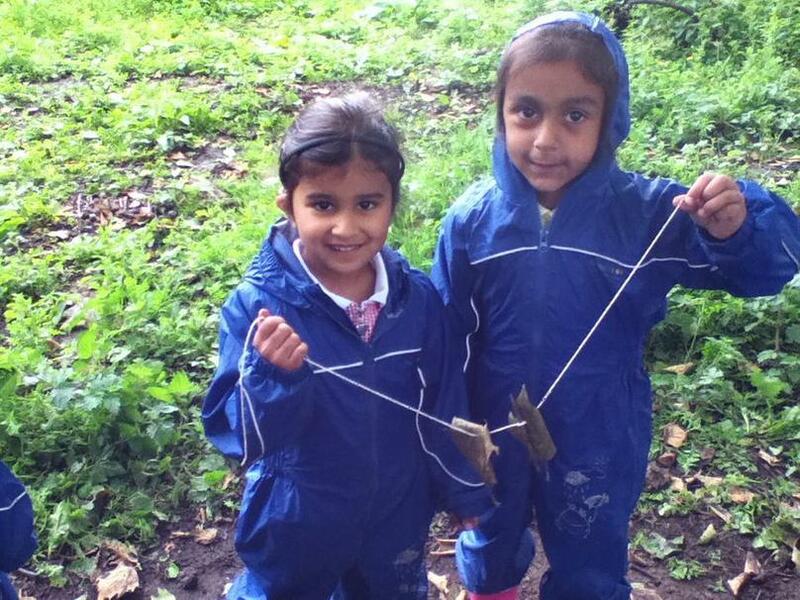 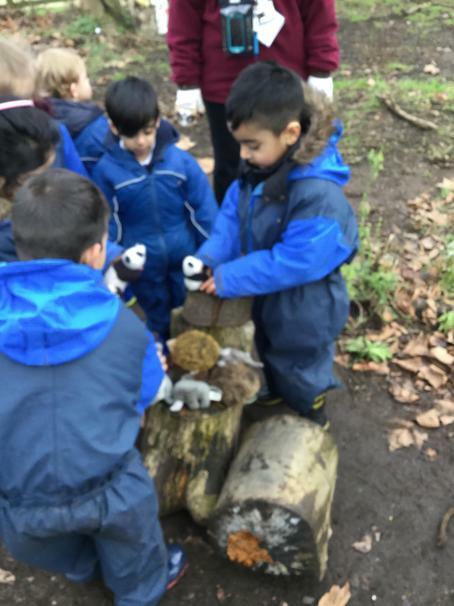 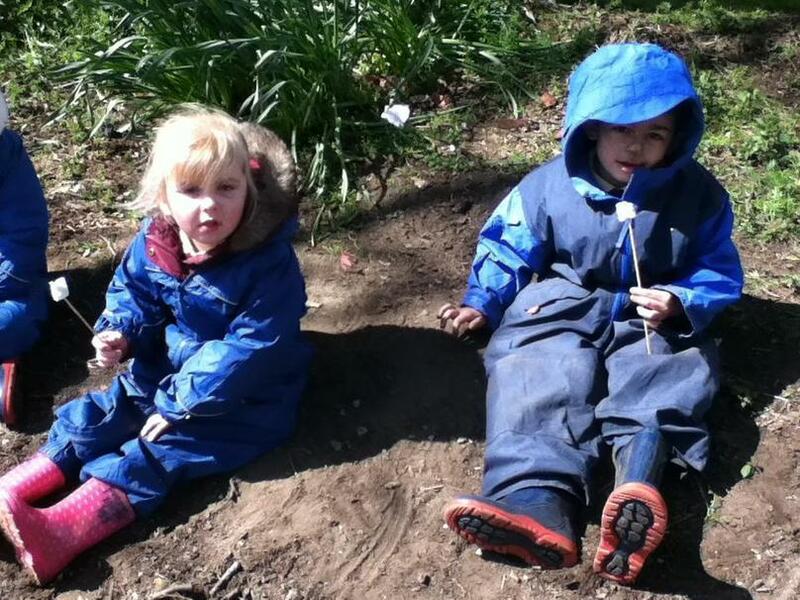 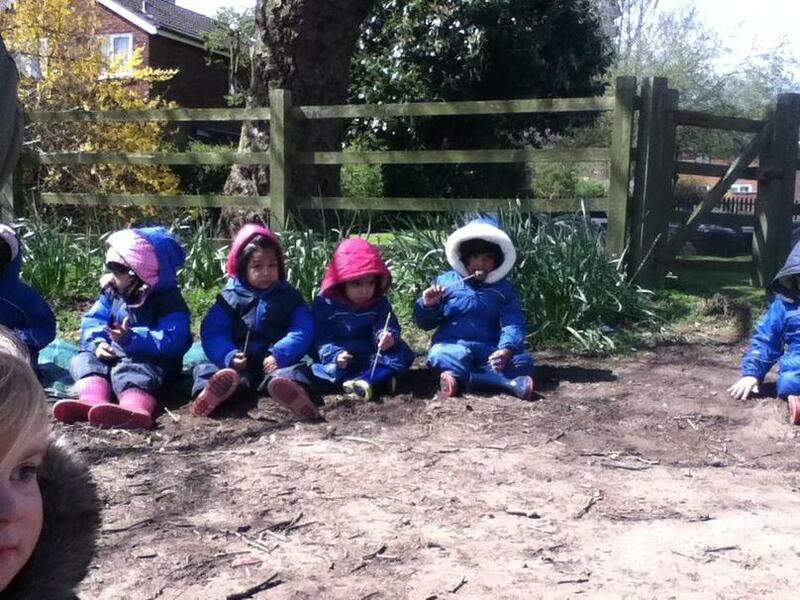 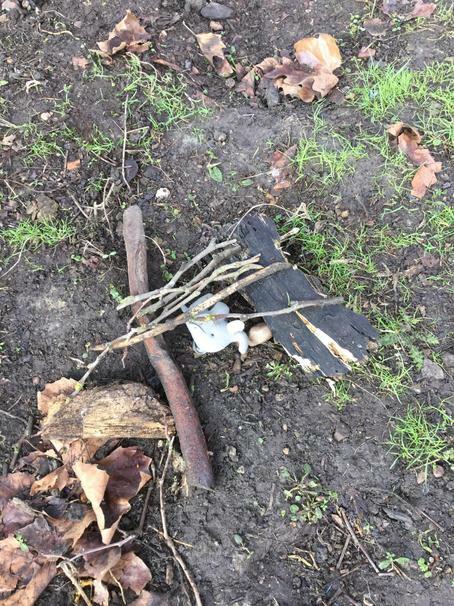 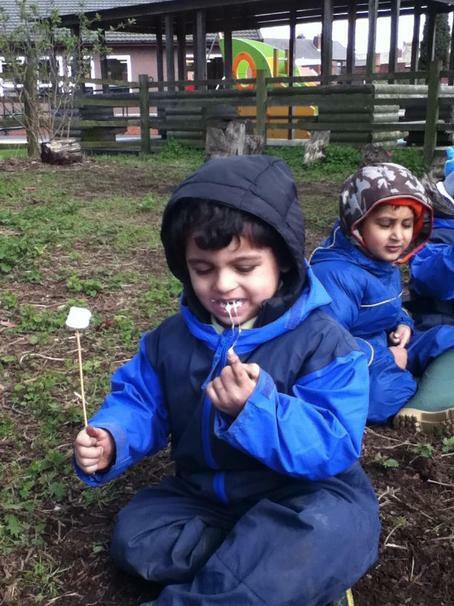 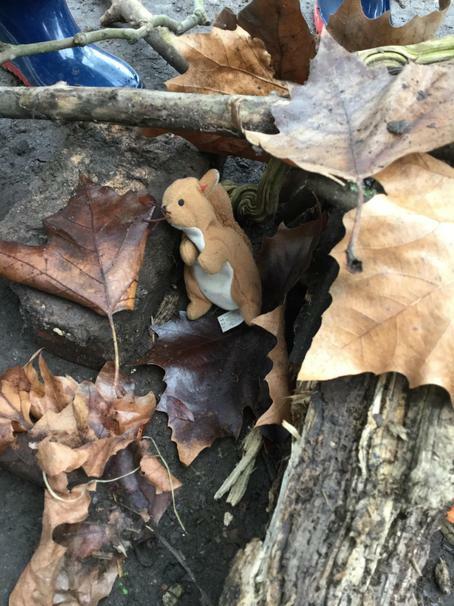 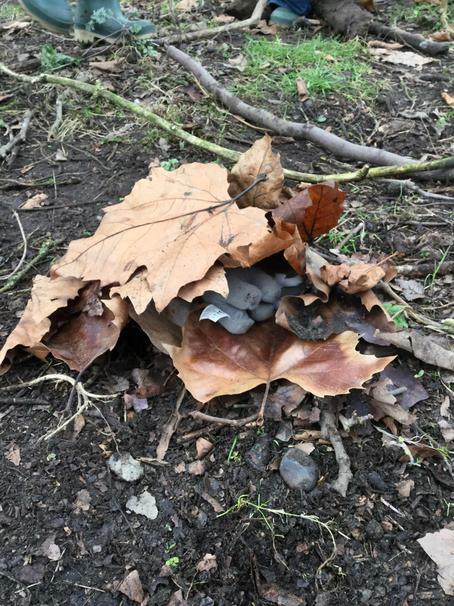 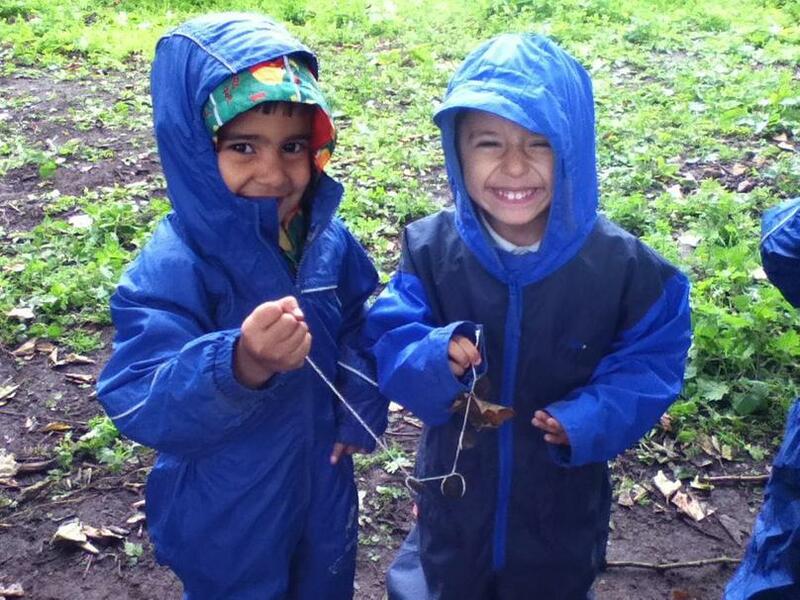 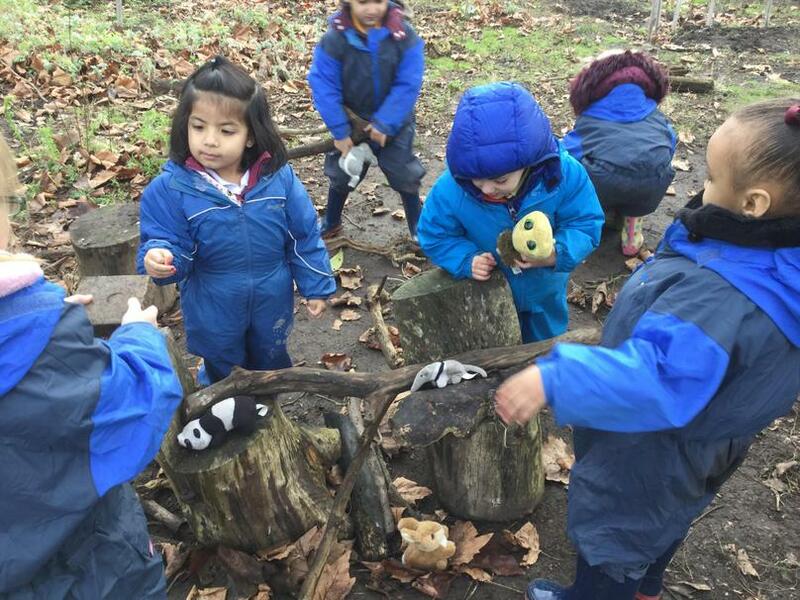 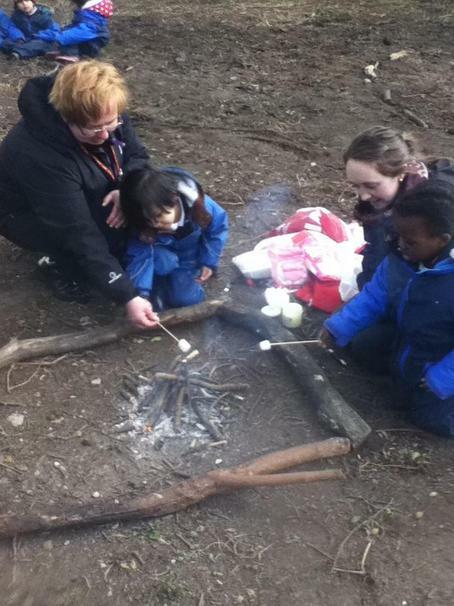 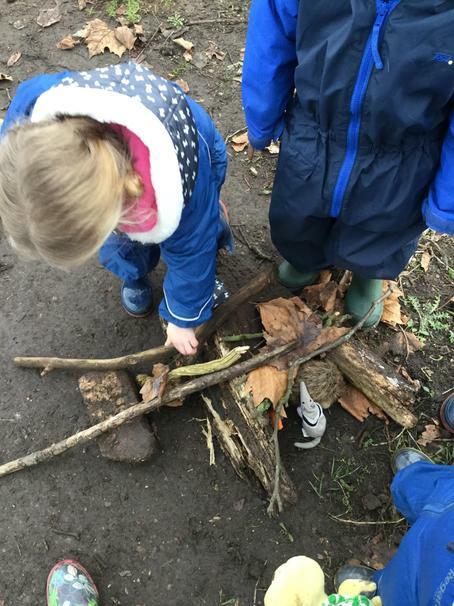 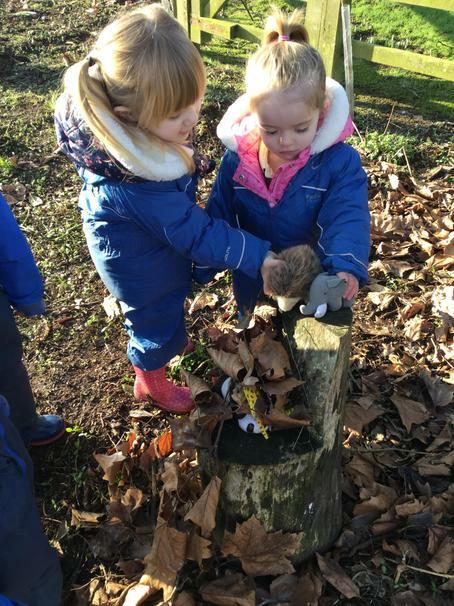 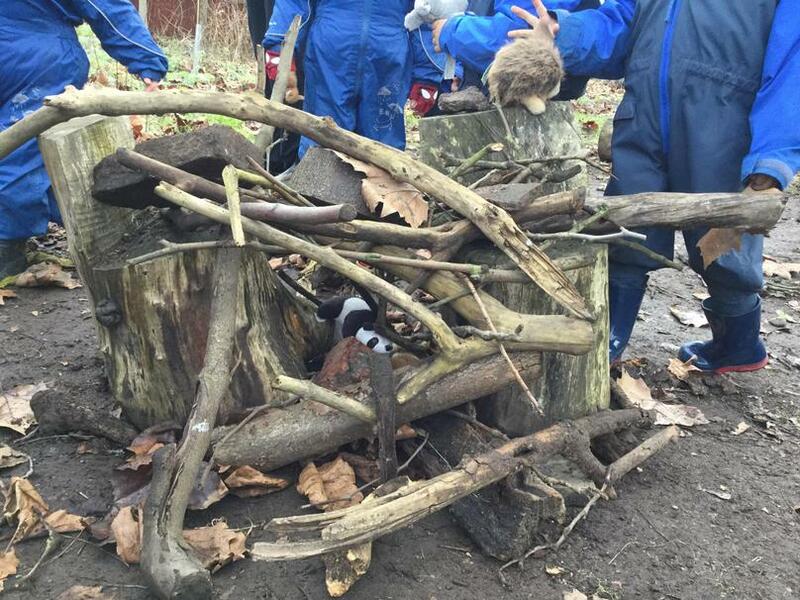 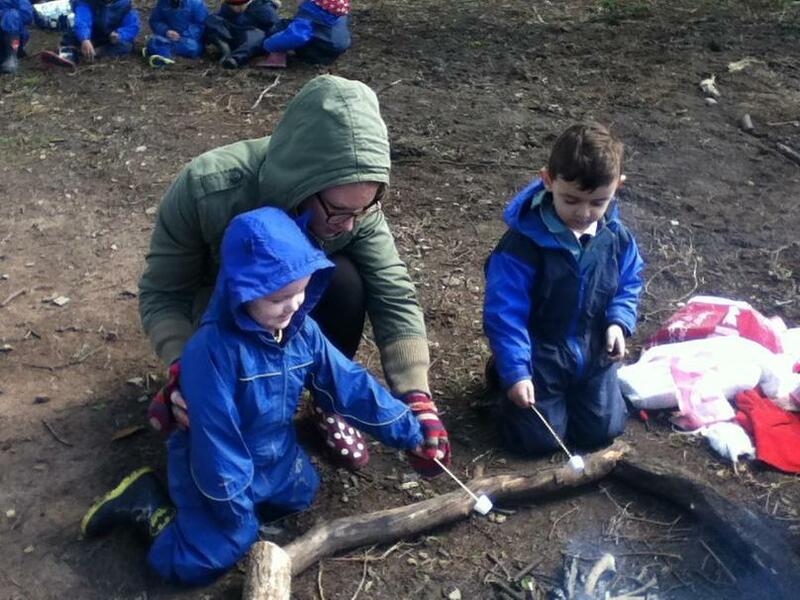 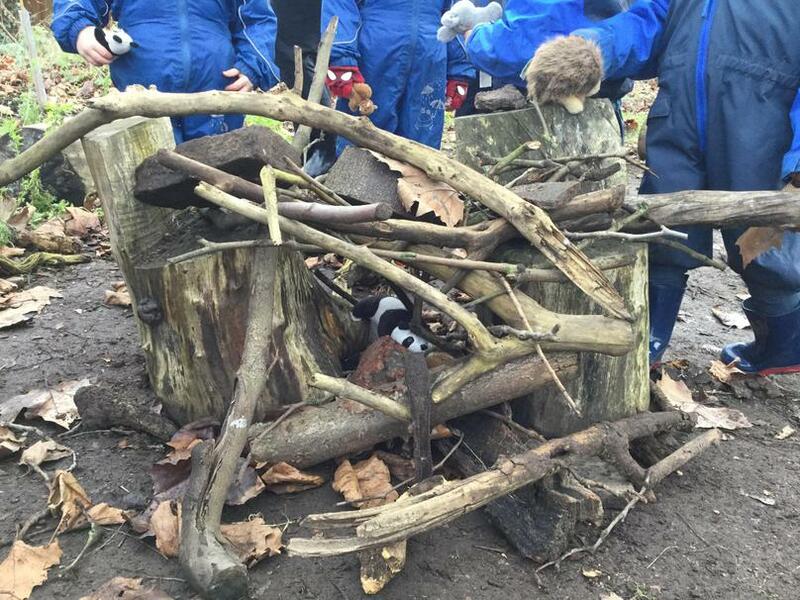 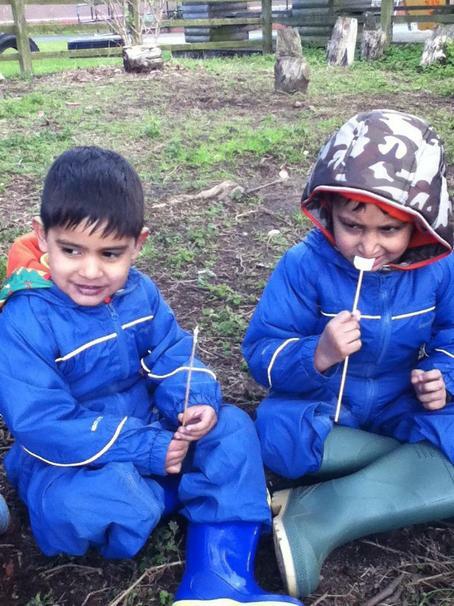 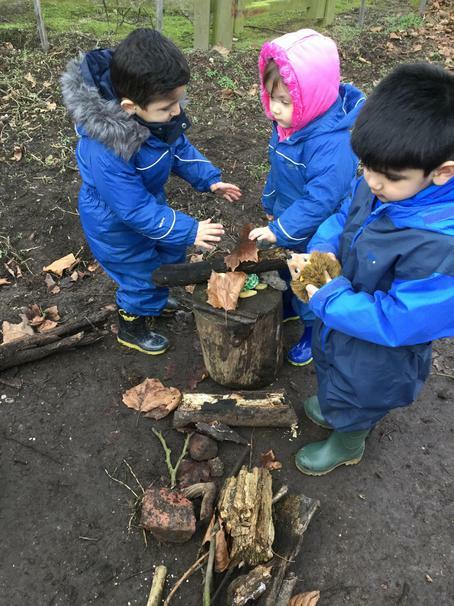 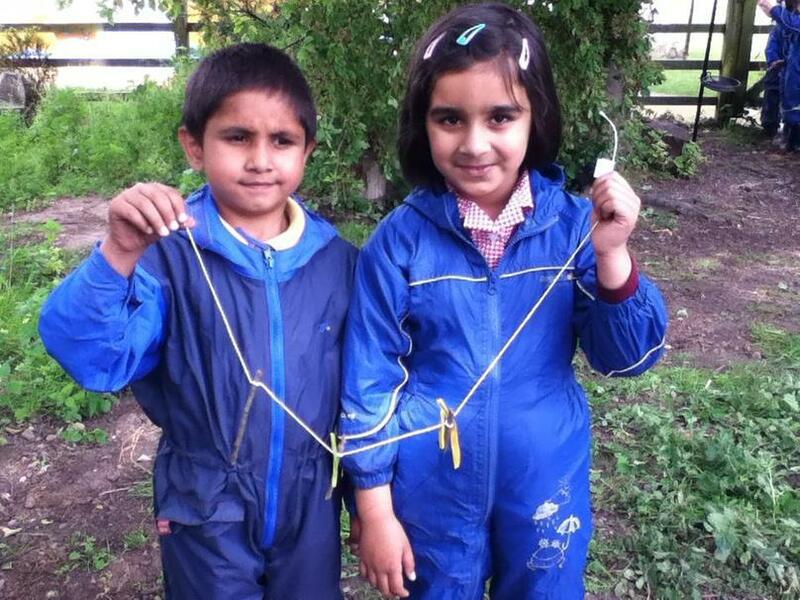 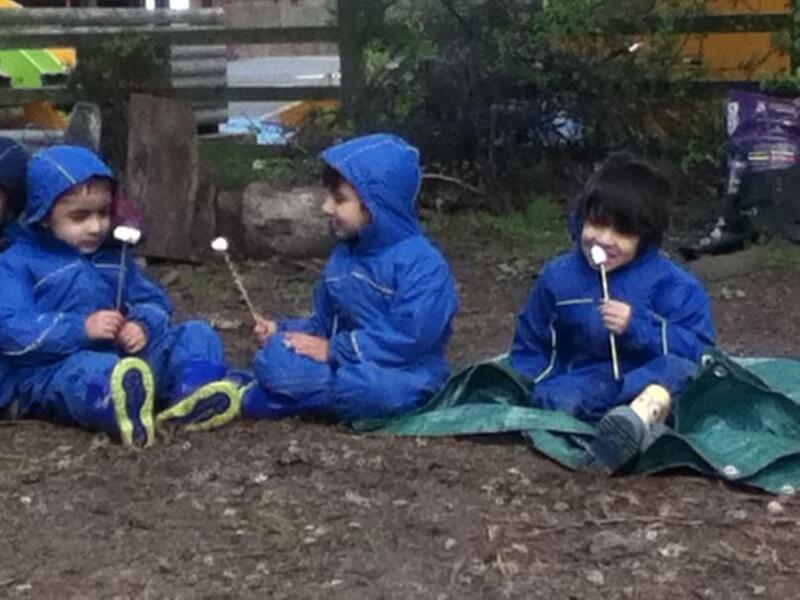 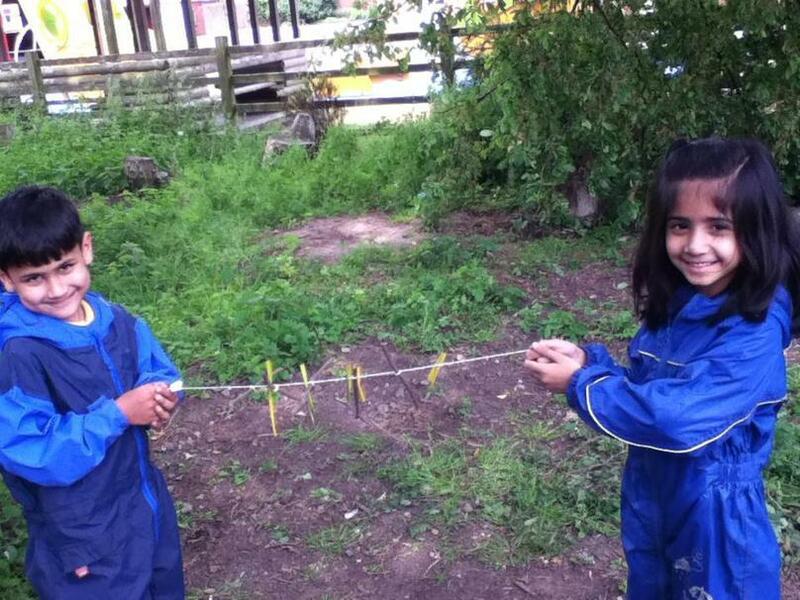 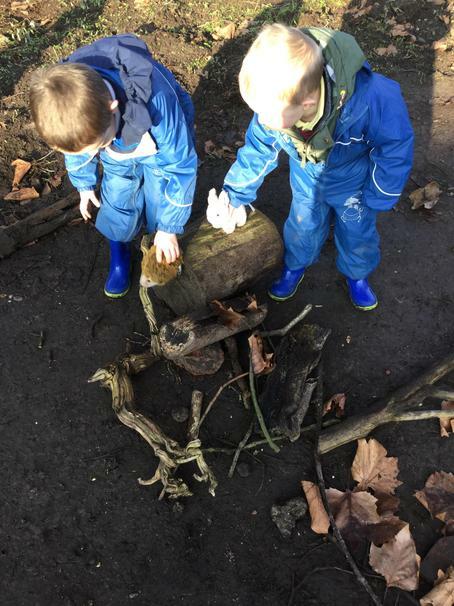 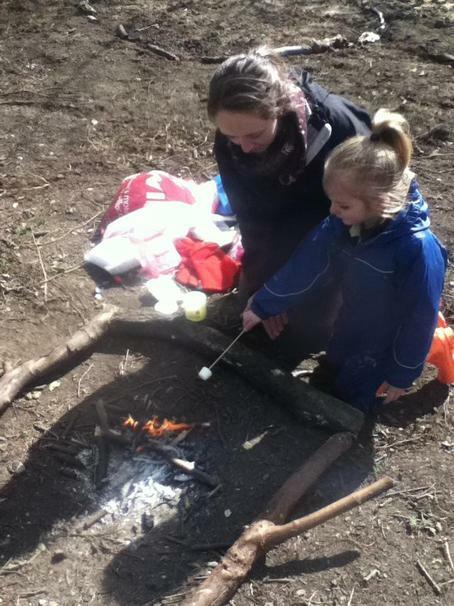 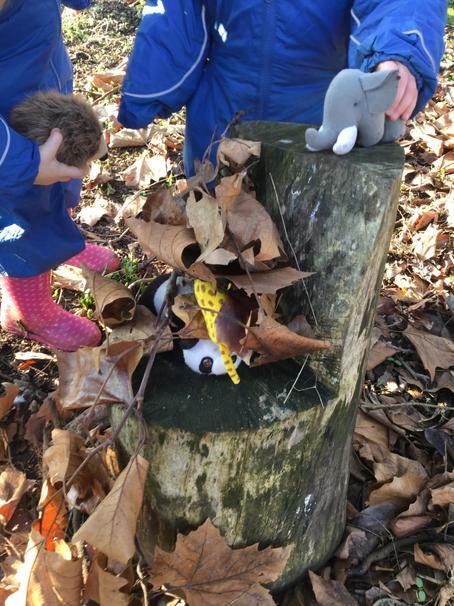 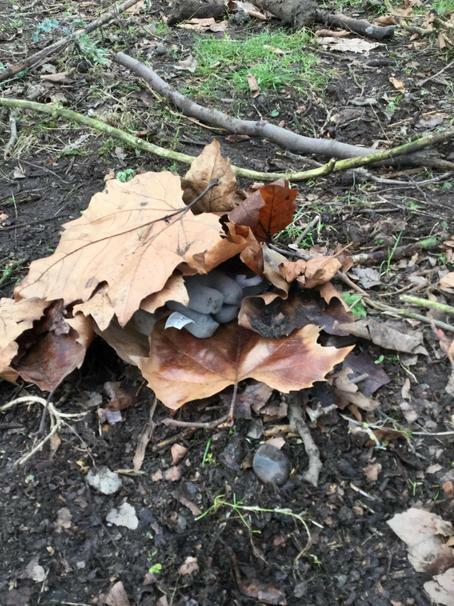 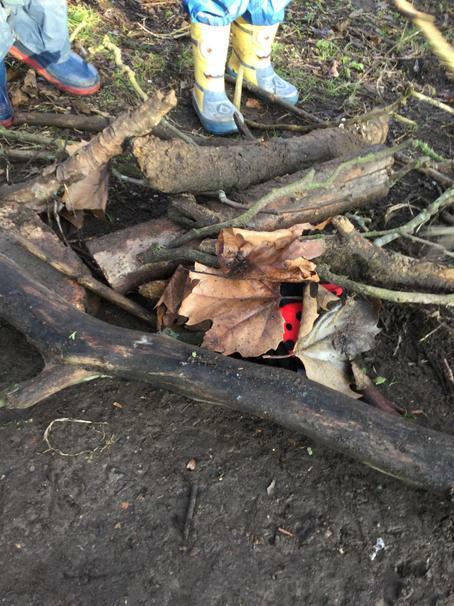 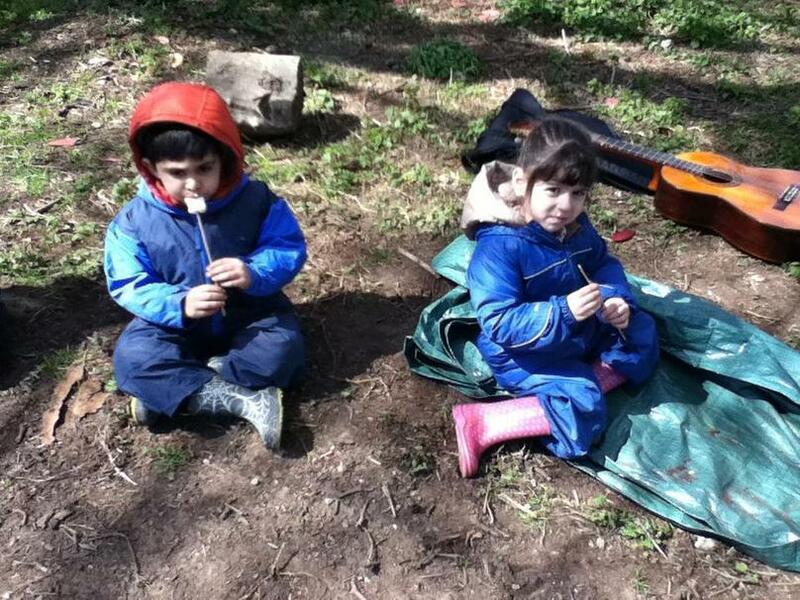 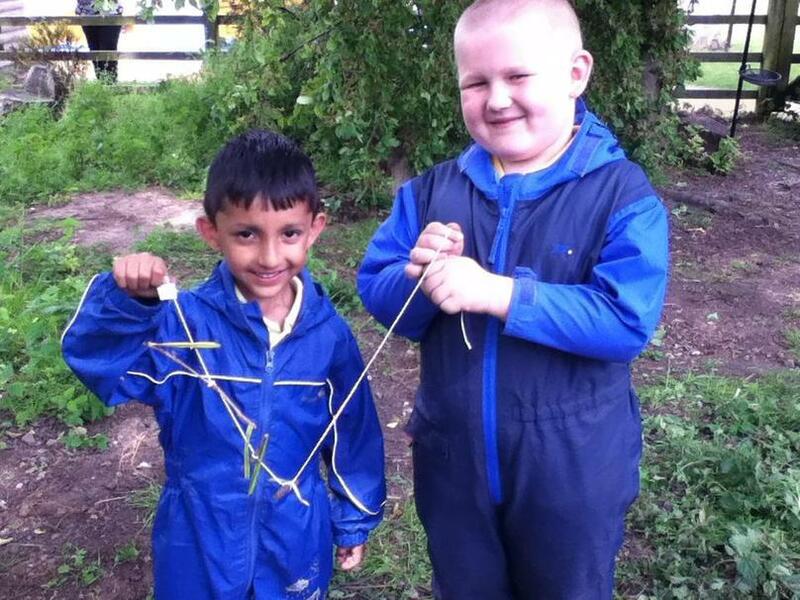 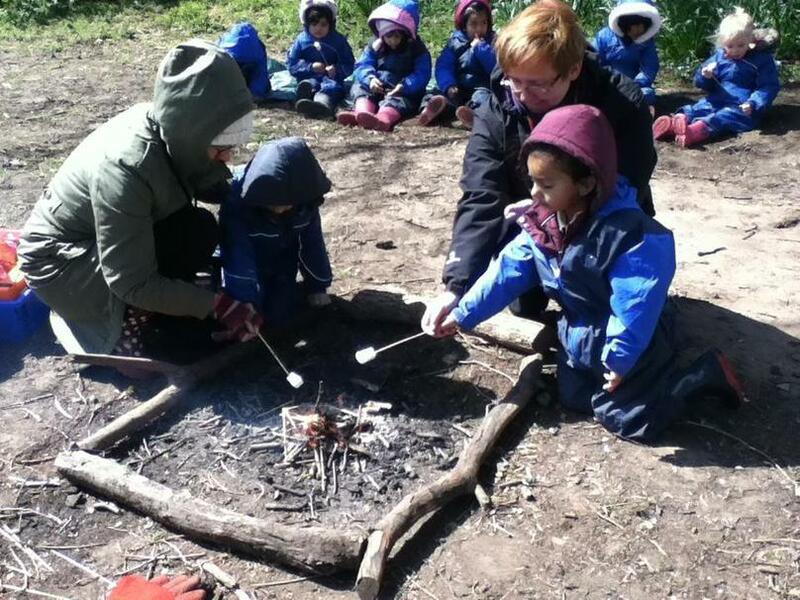 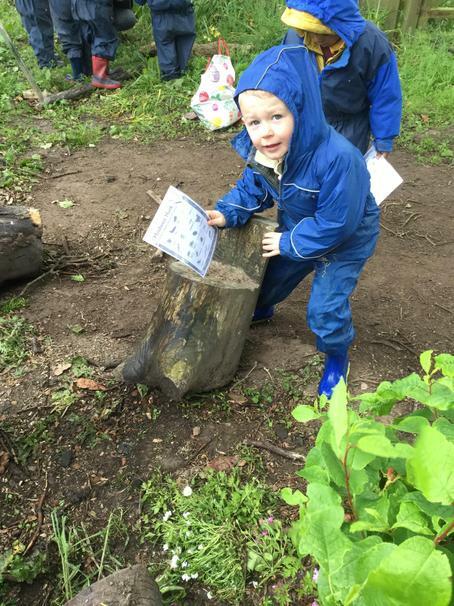 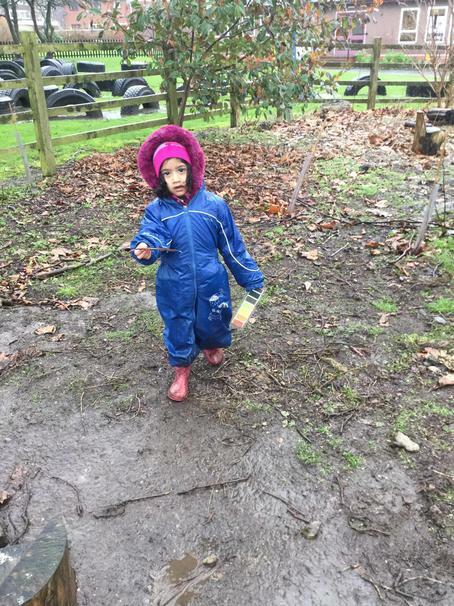 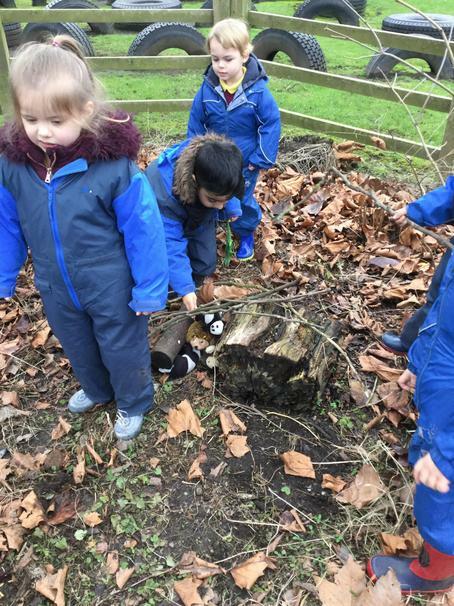 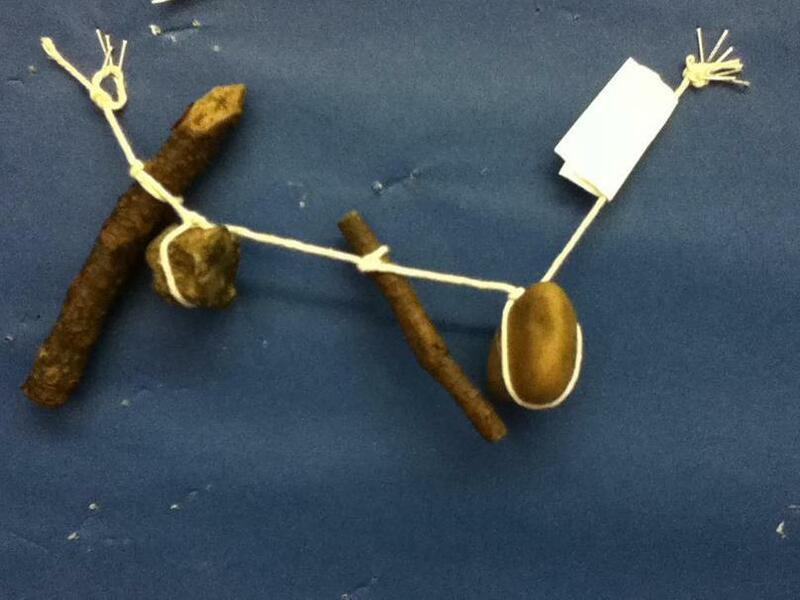 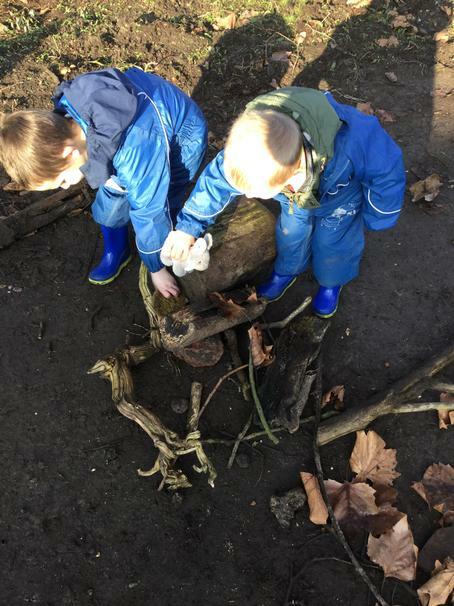 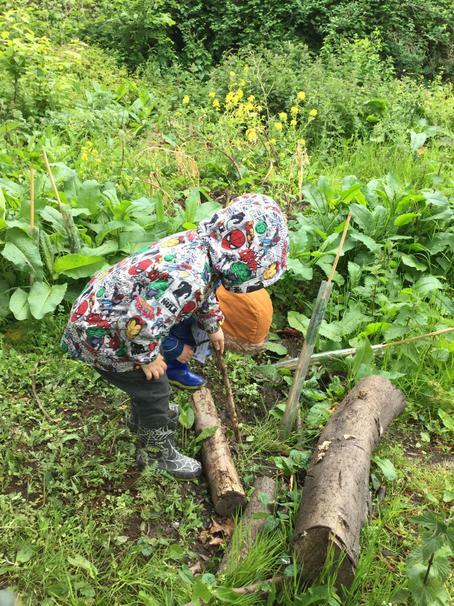 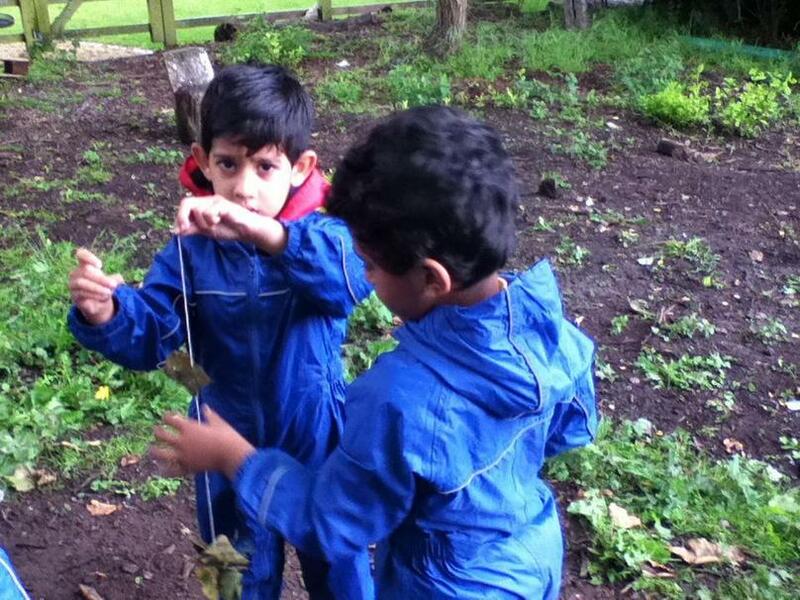 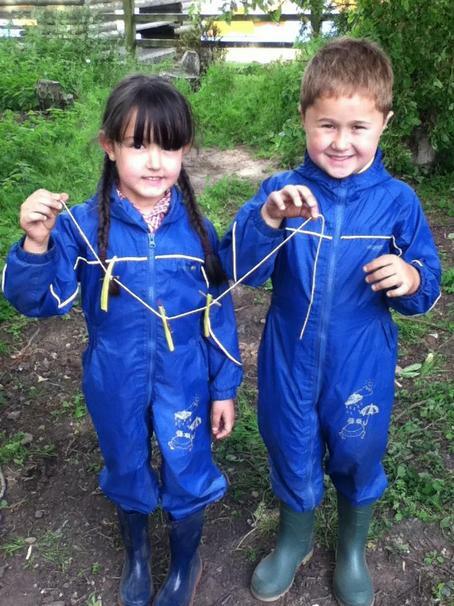 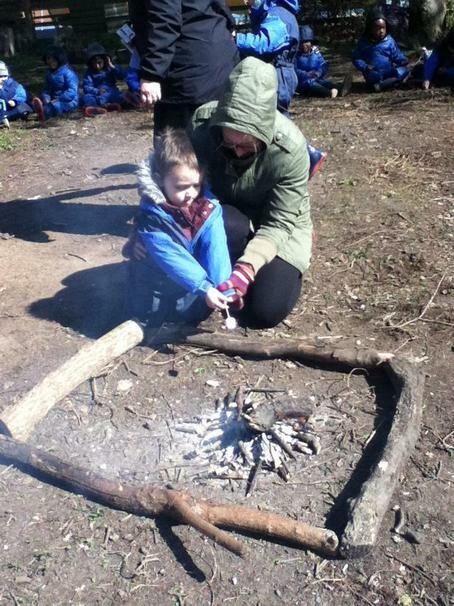 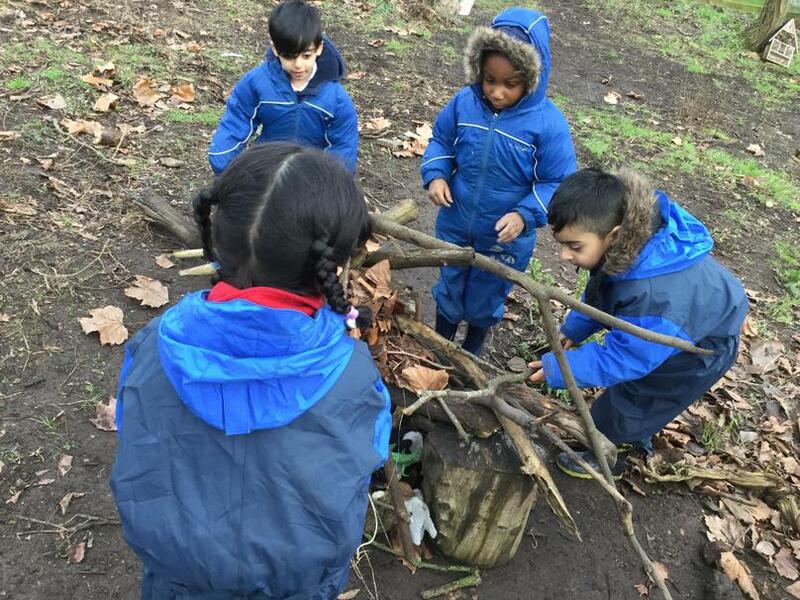 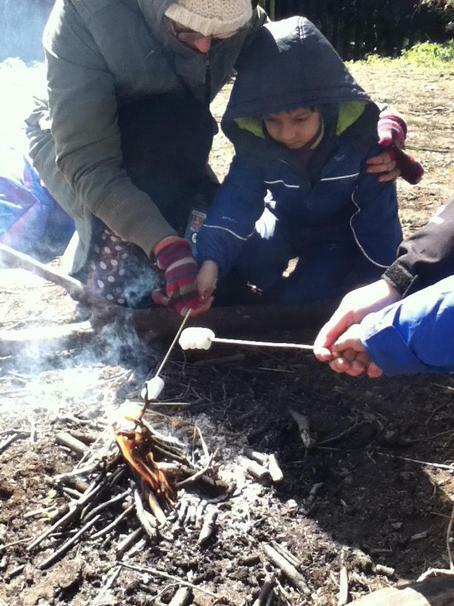 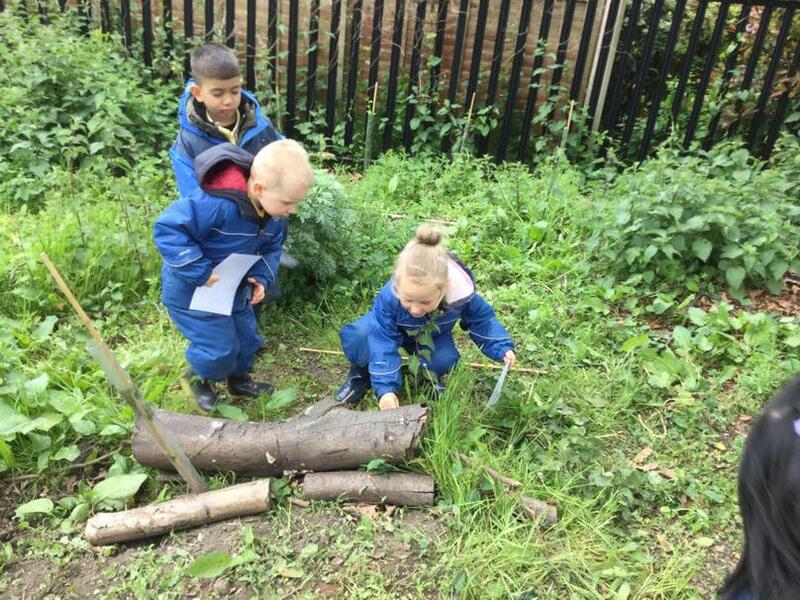 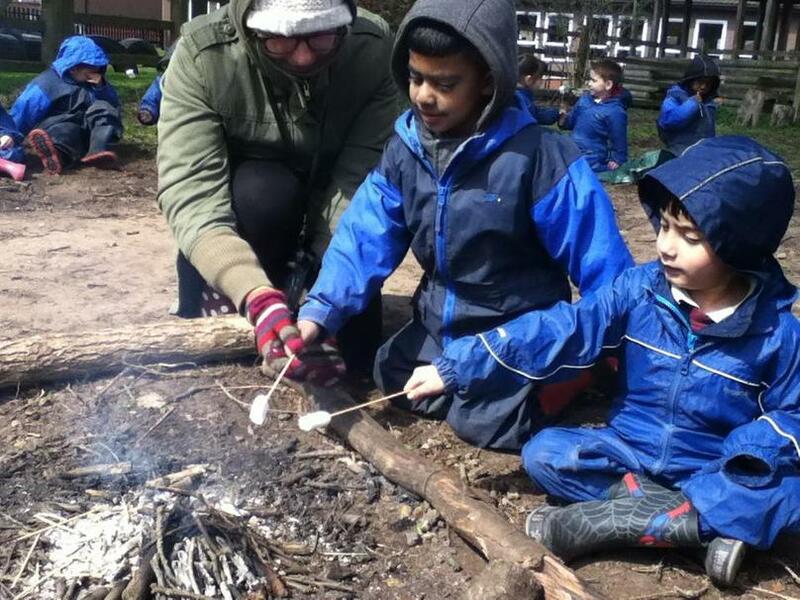 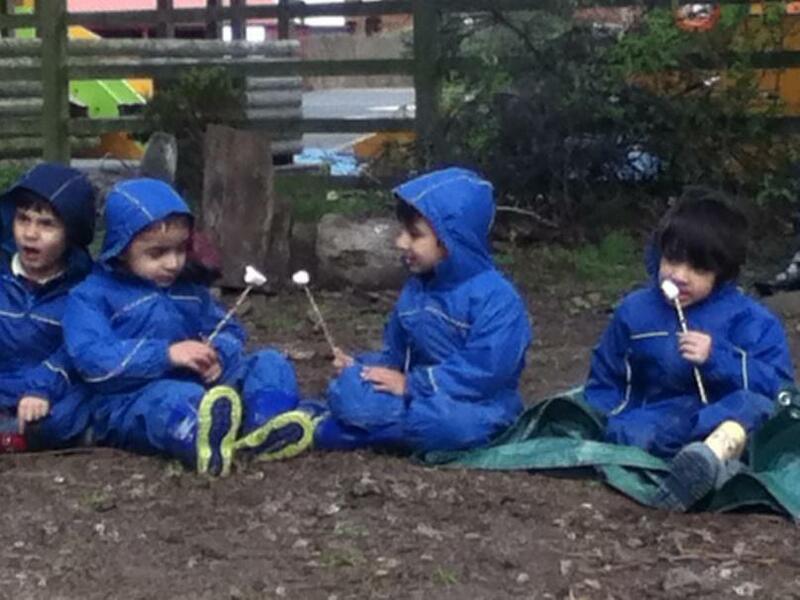 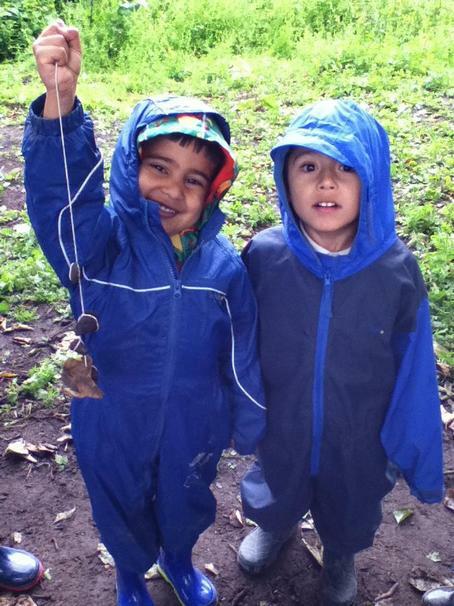 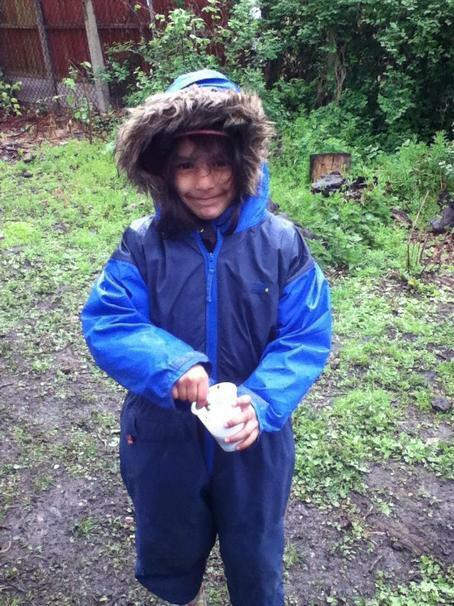 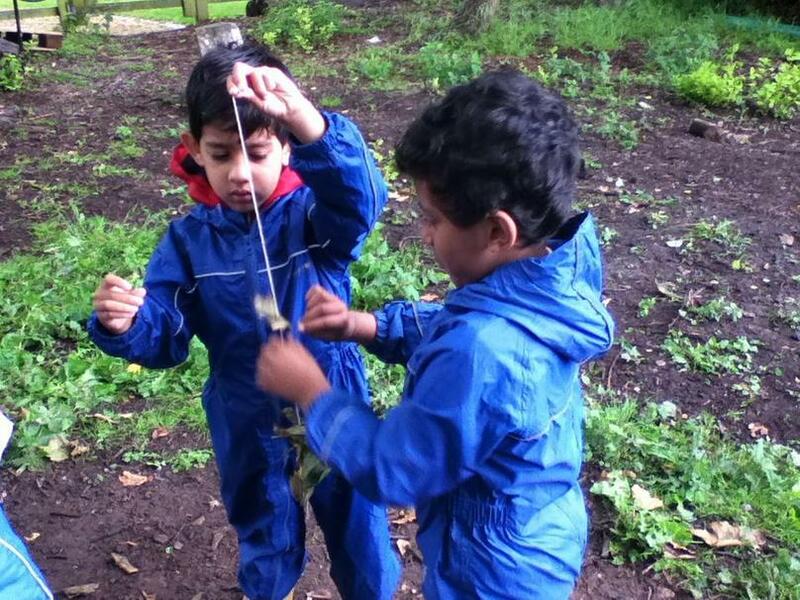 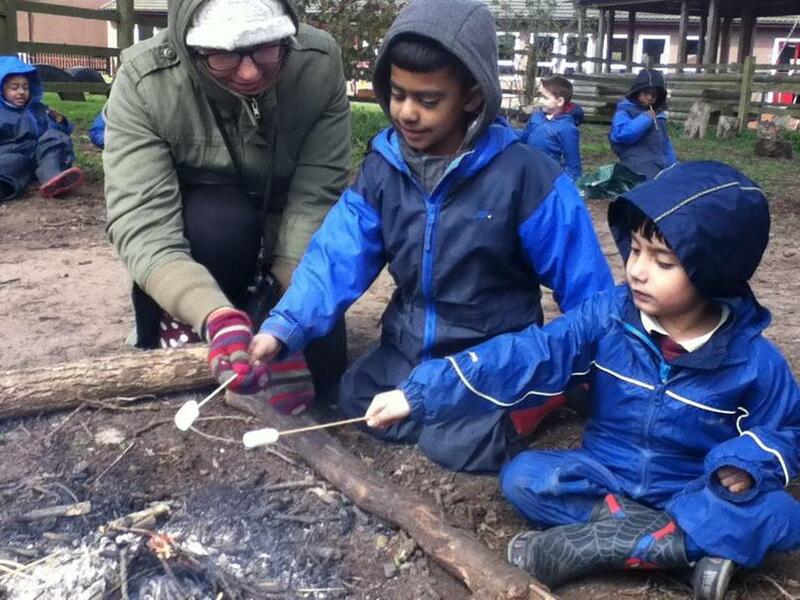 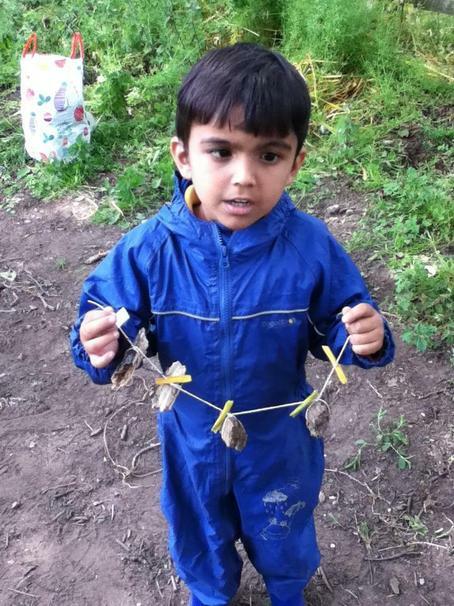 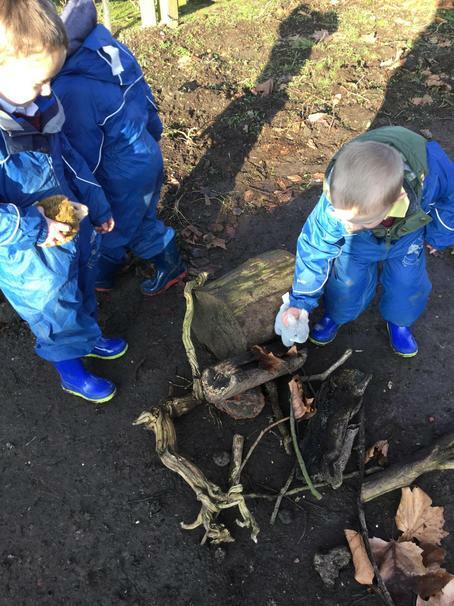 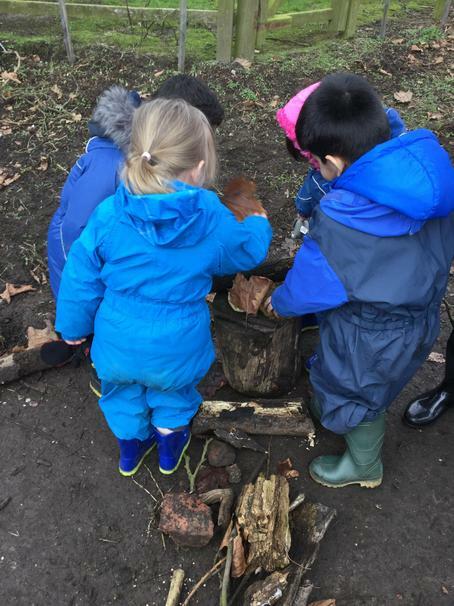 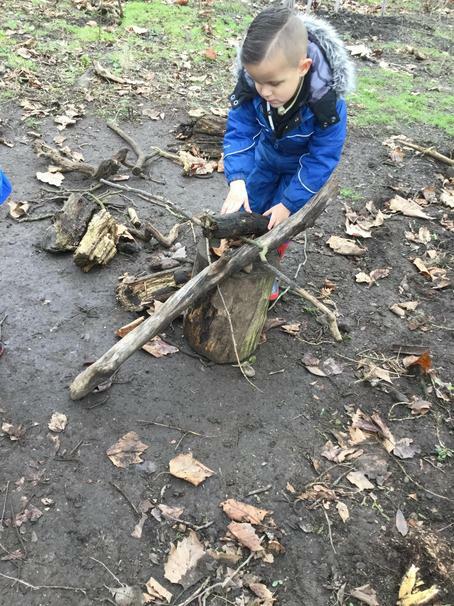 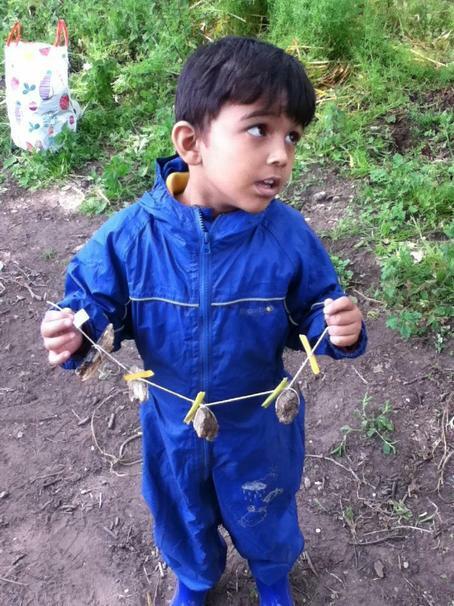 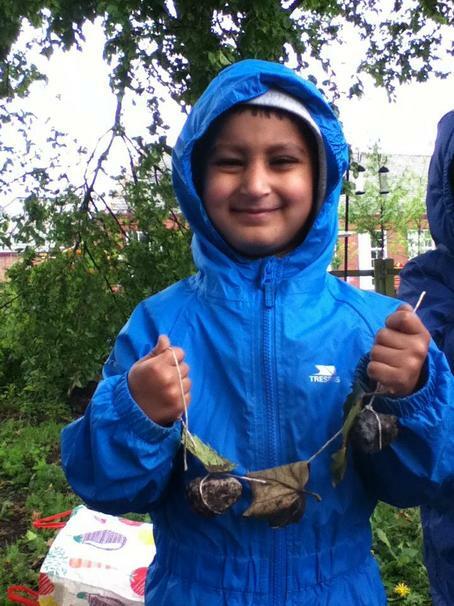 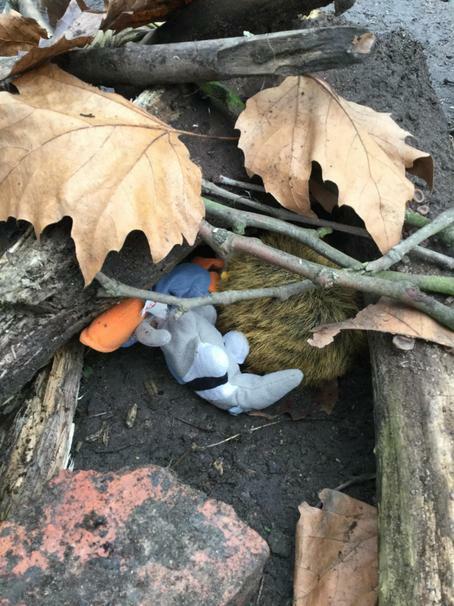 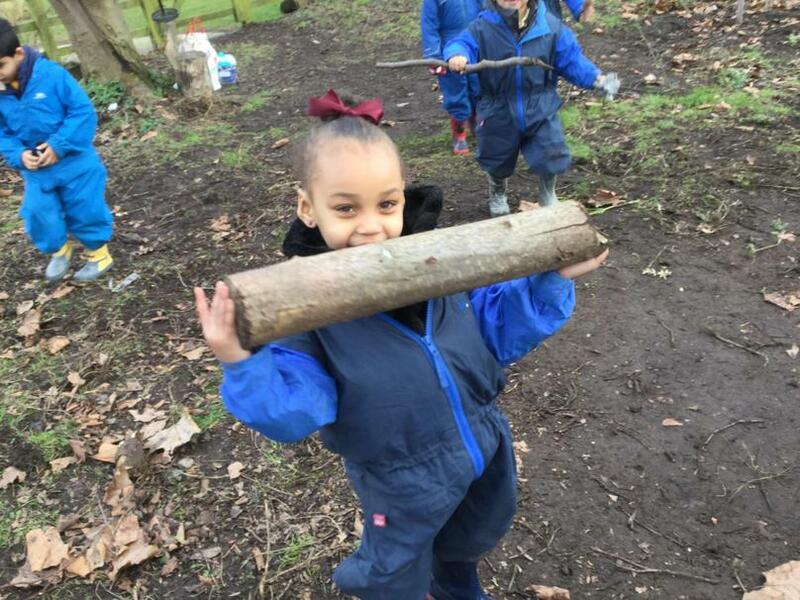 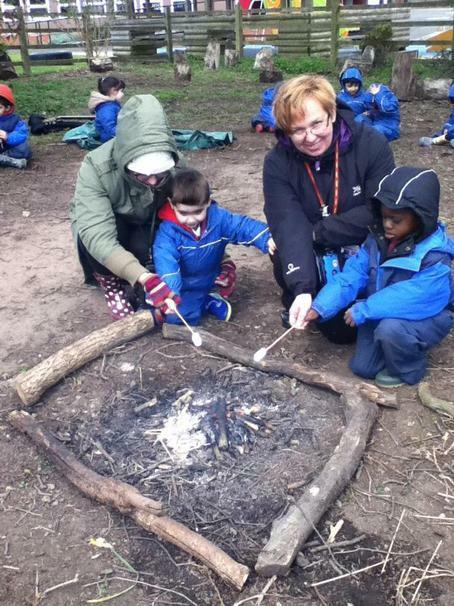 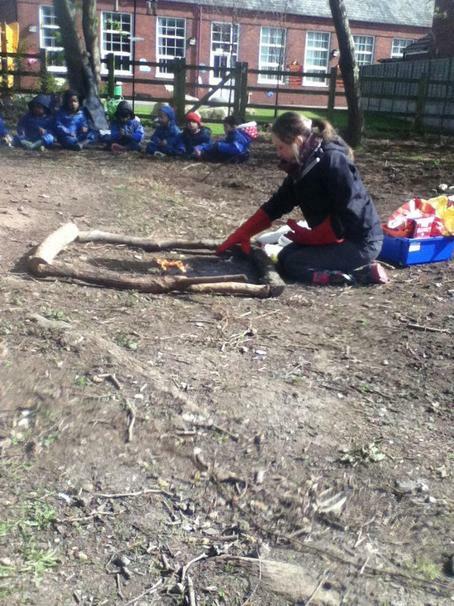 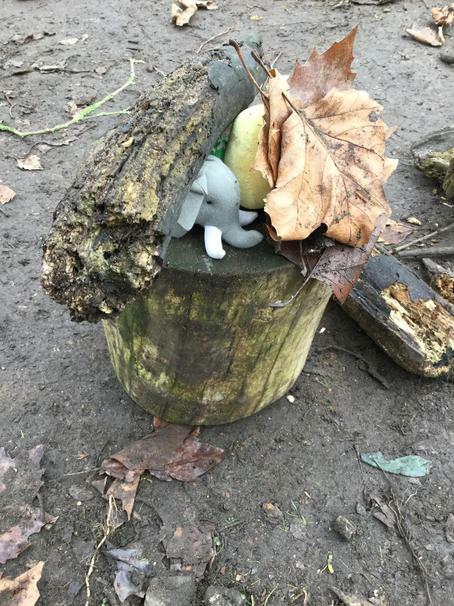 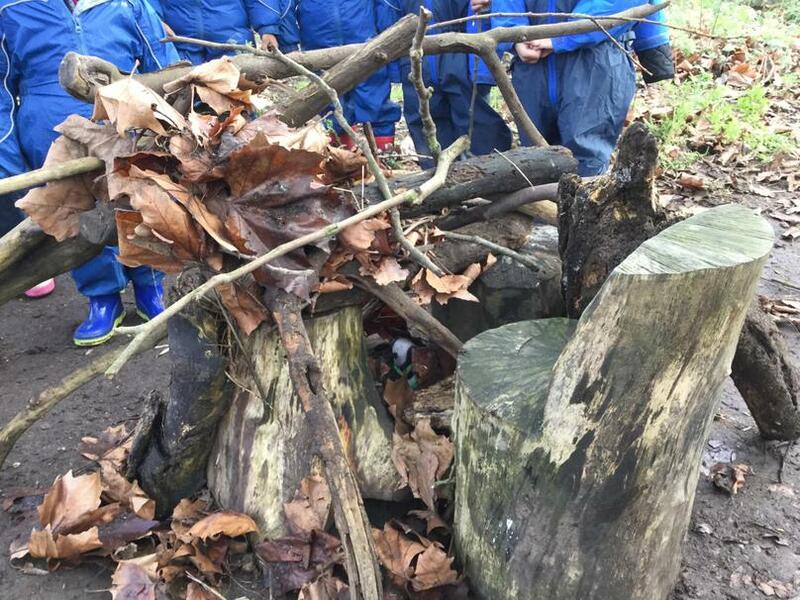 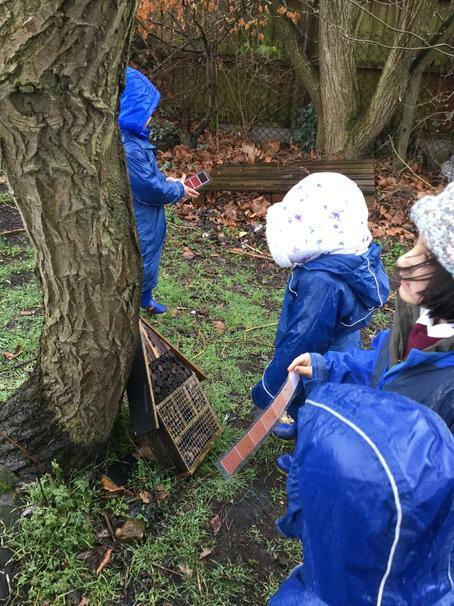 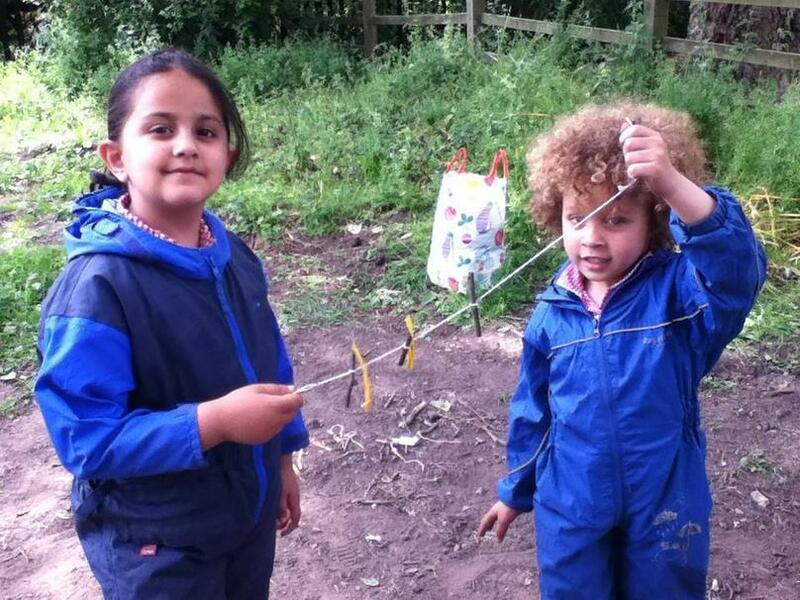 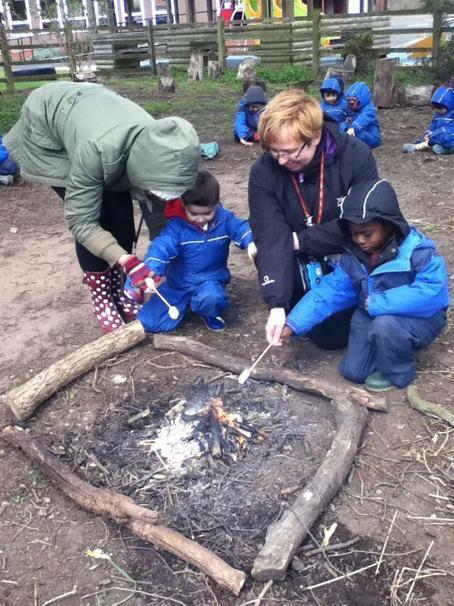 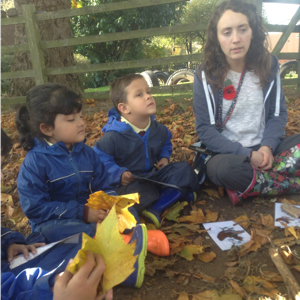 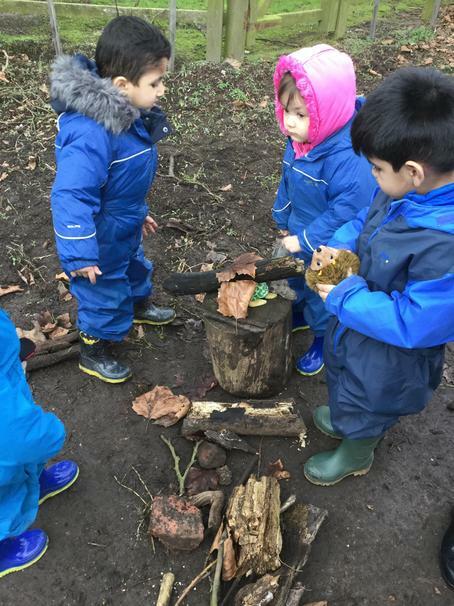 "We enjoyed making homes for Baby Bear's animal friends at Forest School this week!" 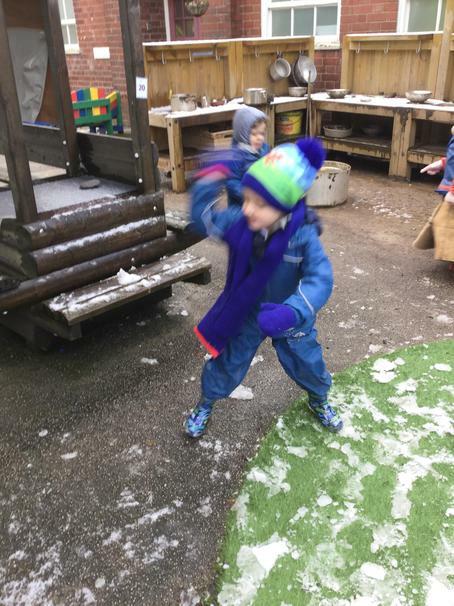 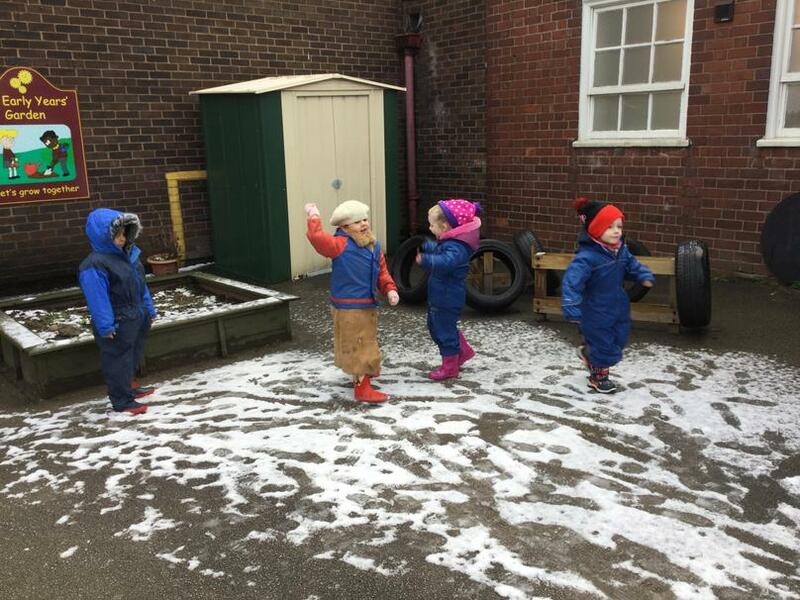 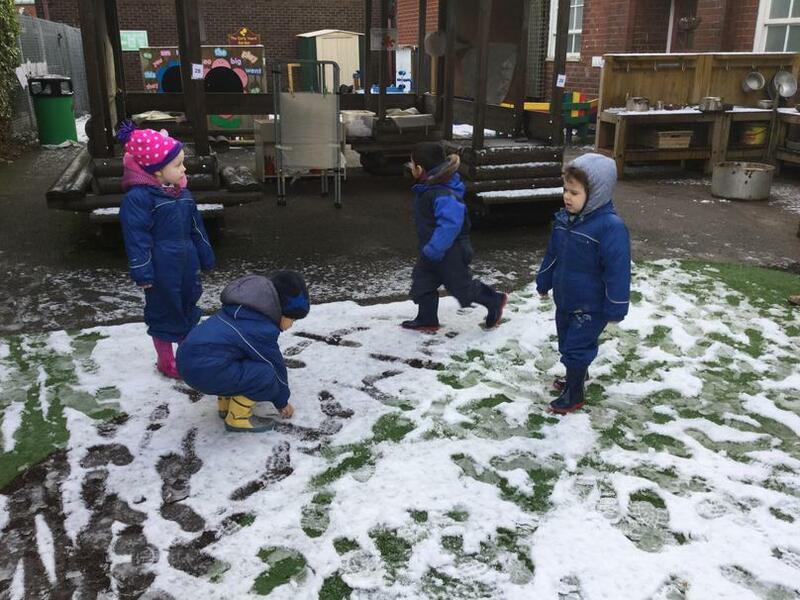 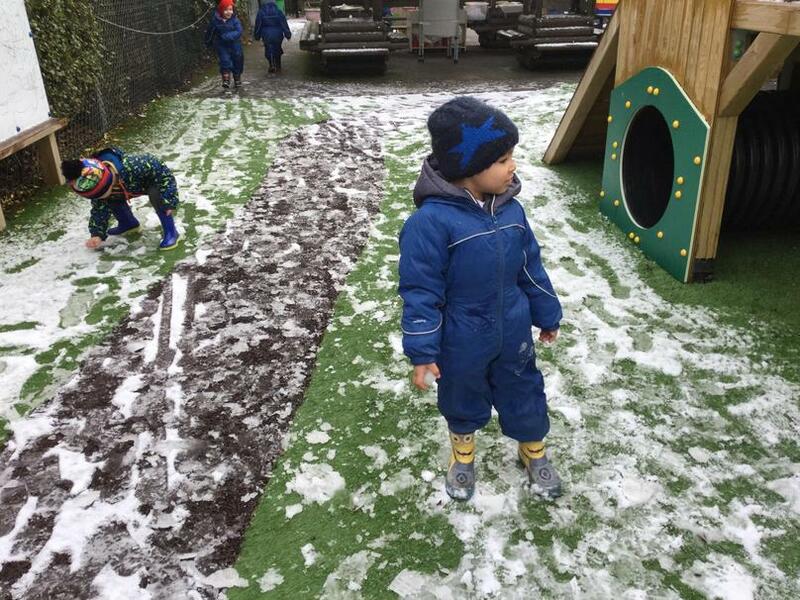 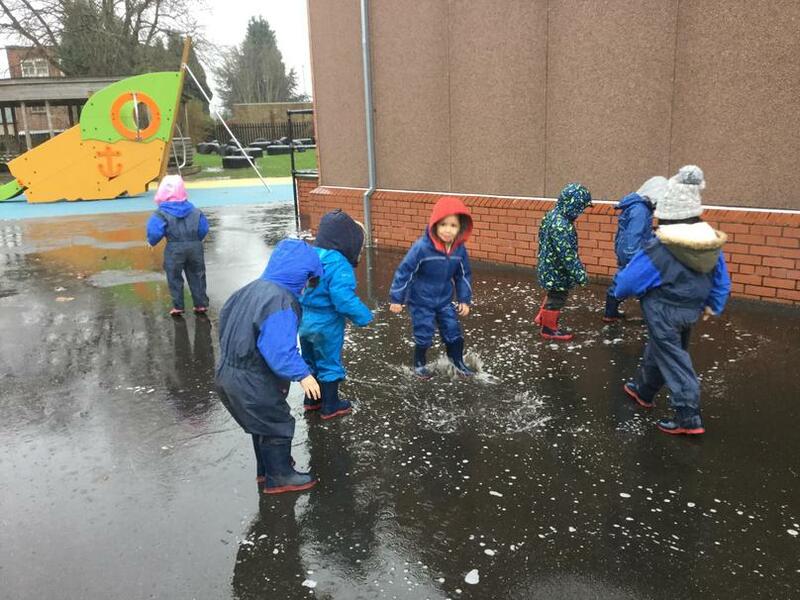 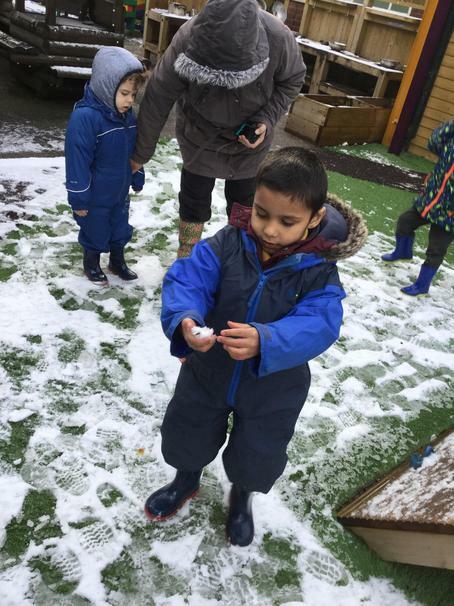 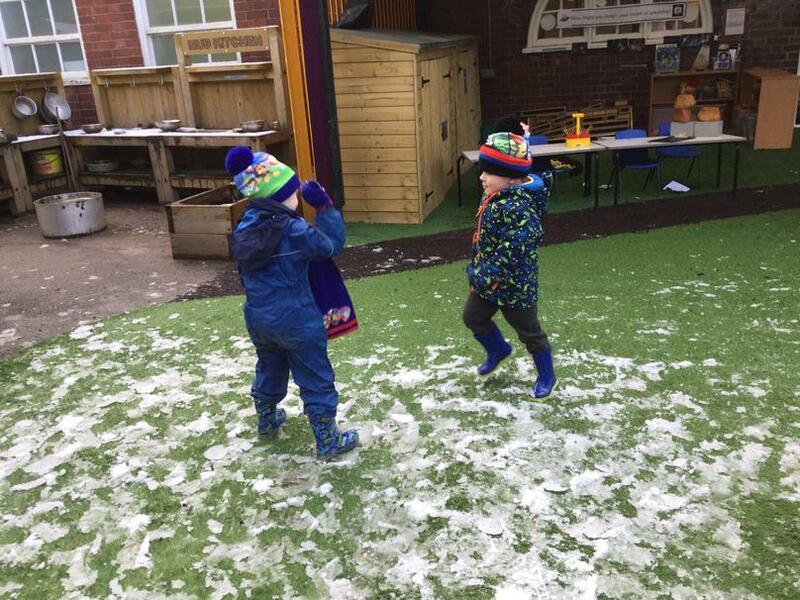 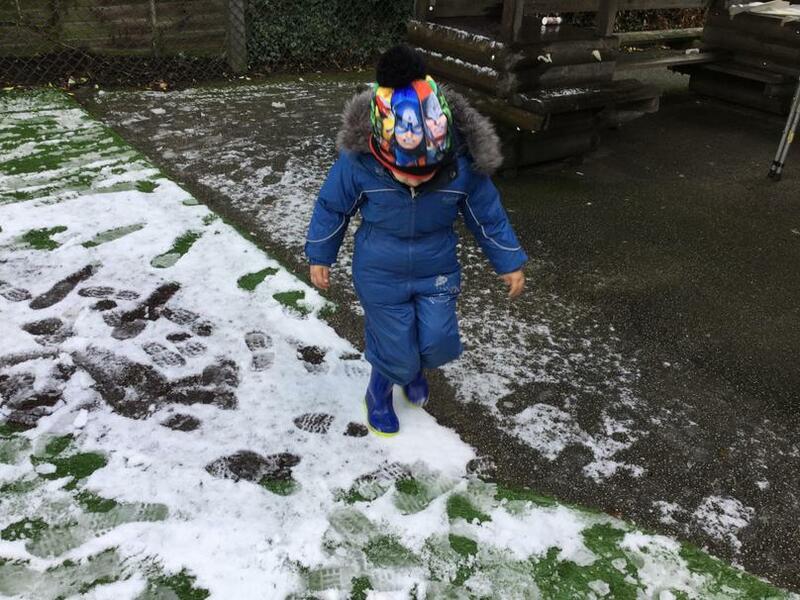 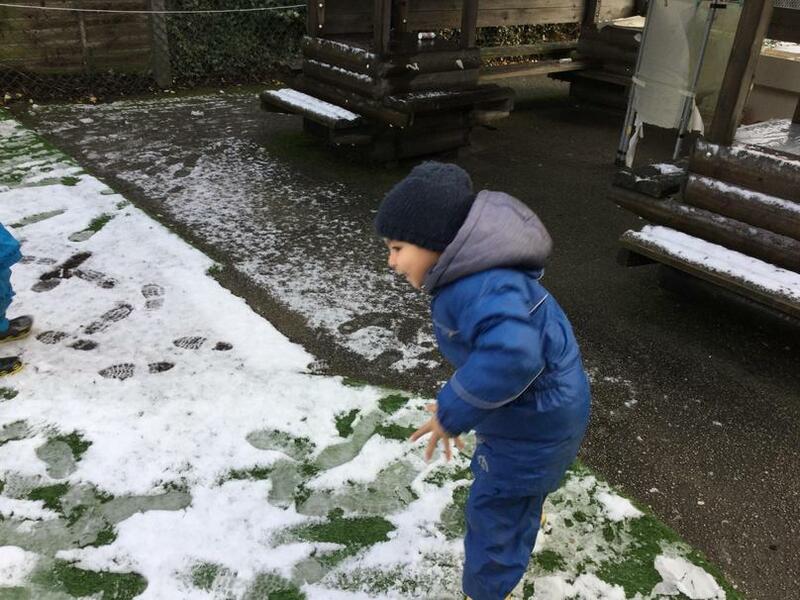 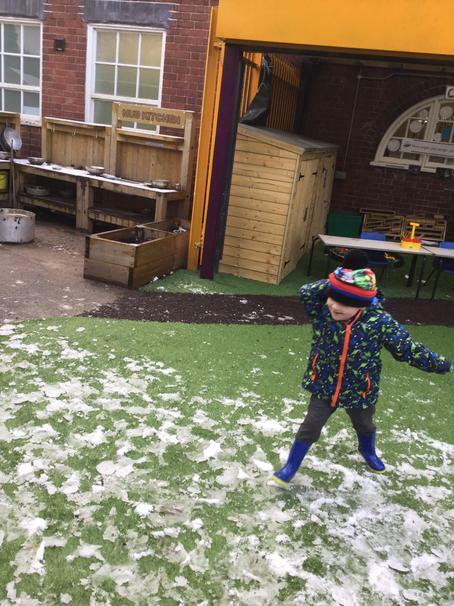 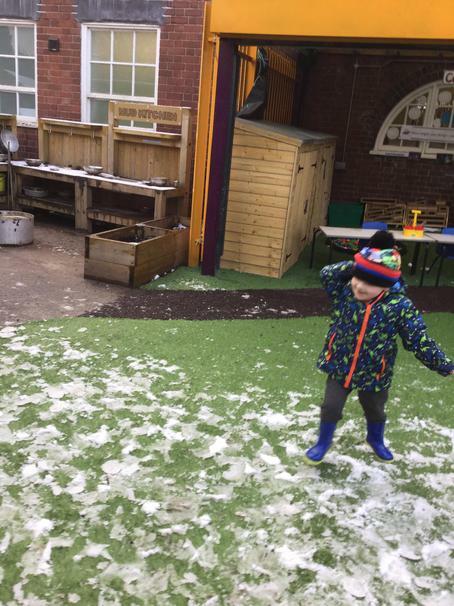 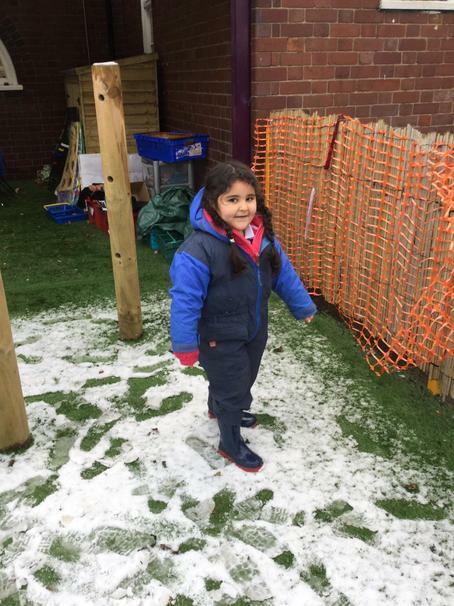 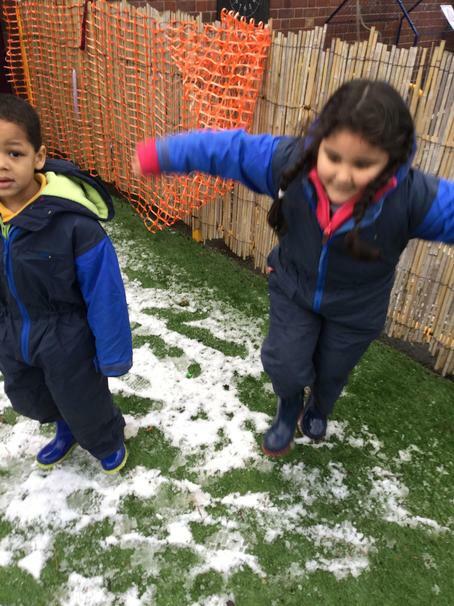 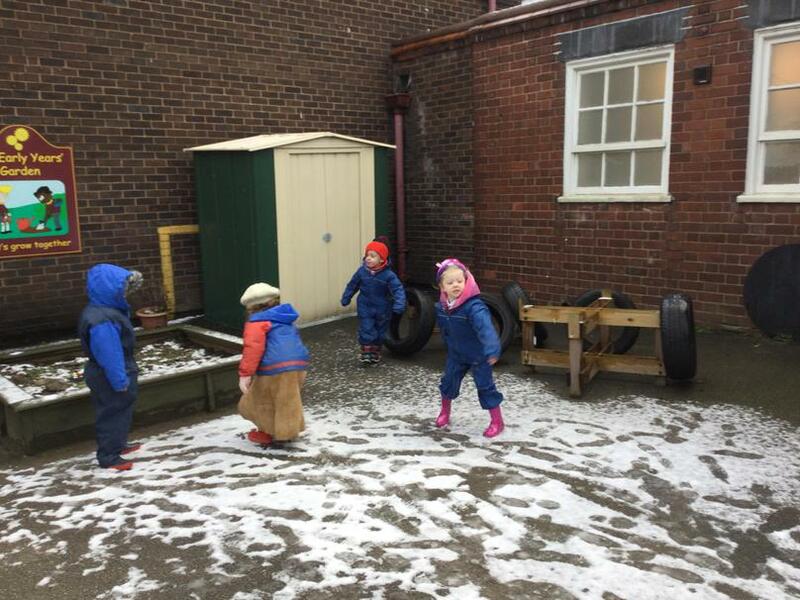 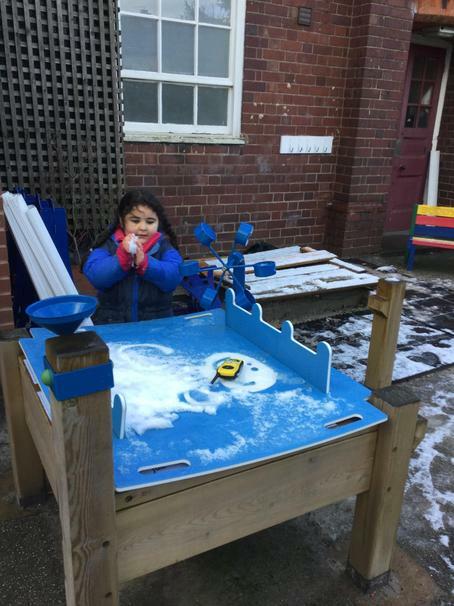 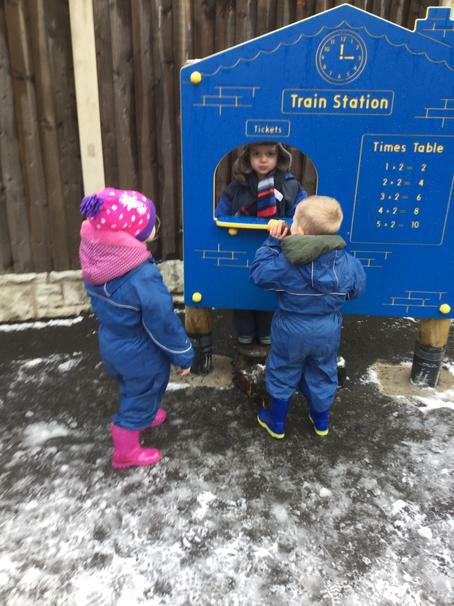 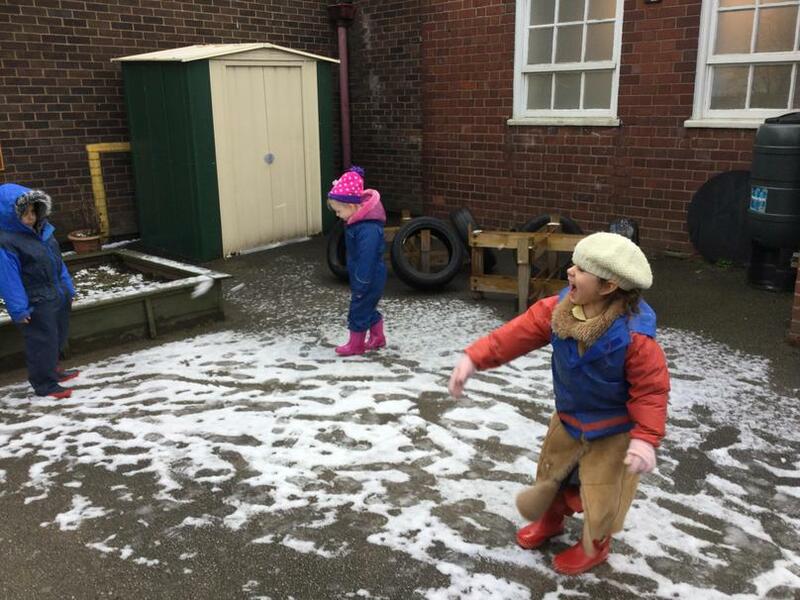 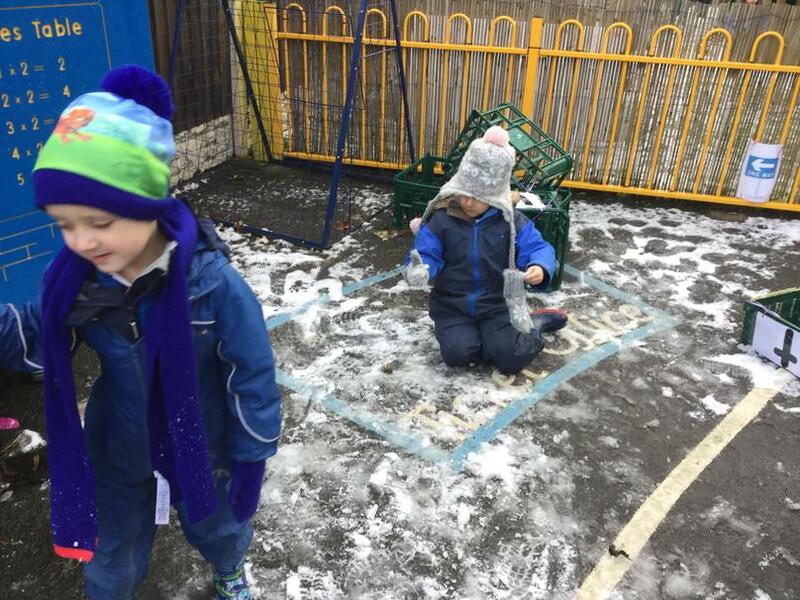 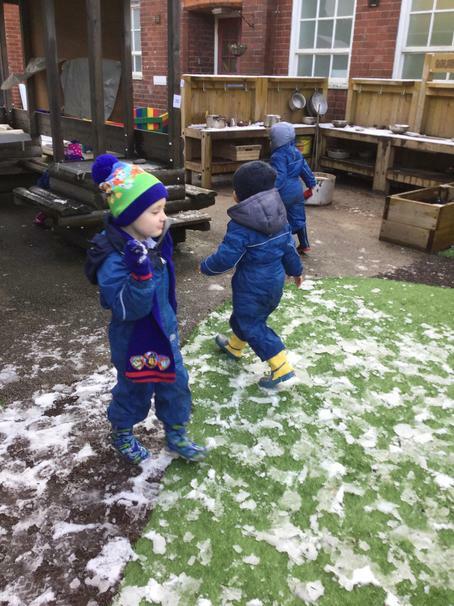 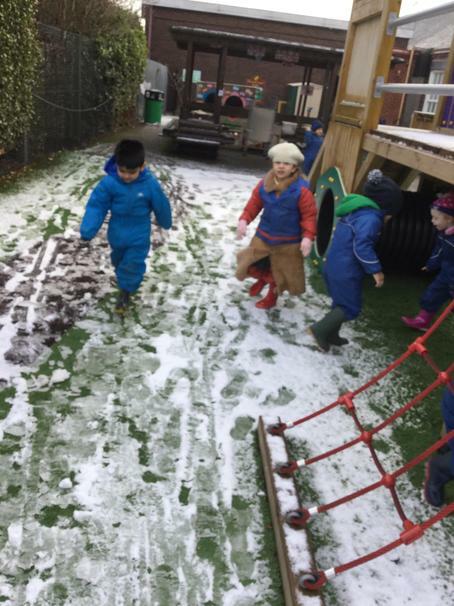 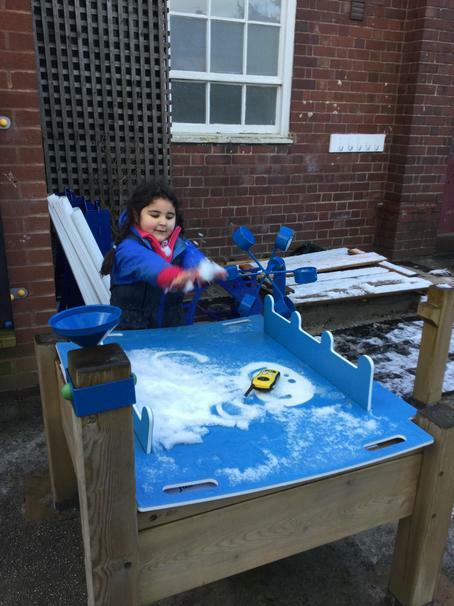 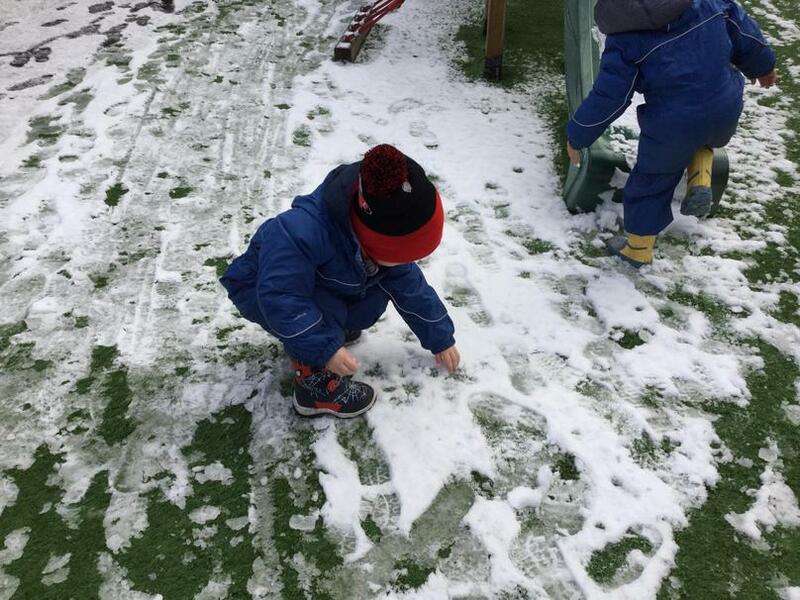 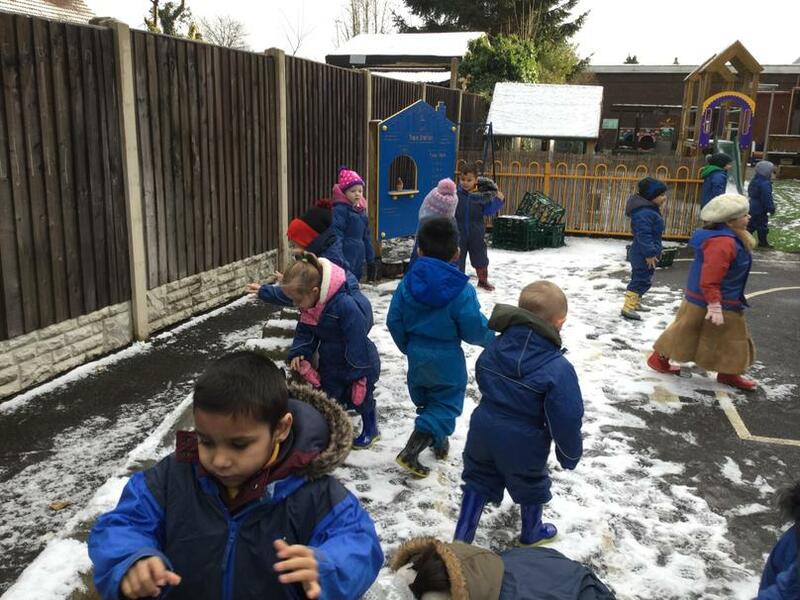 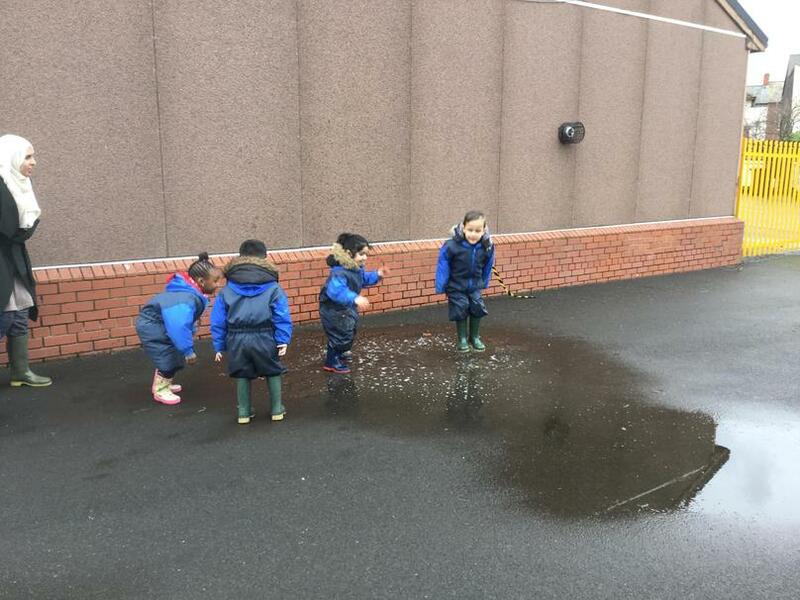 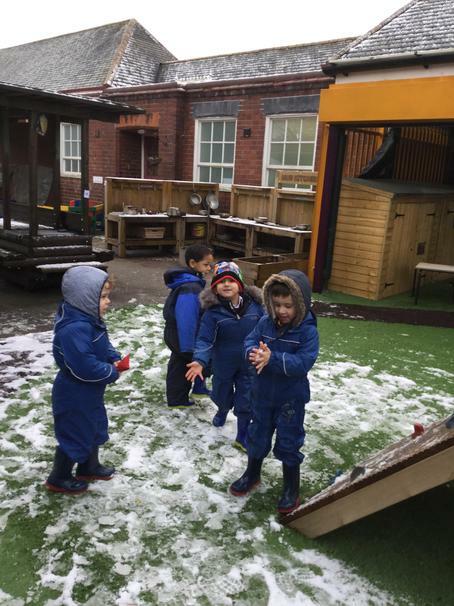 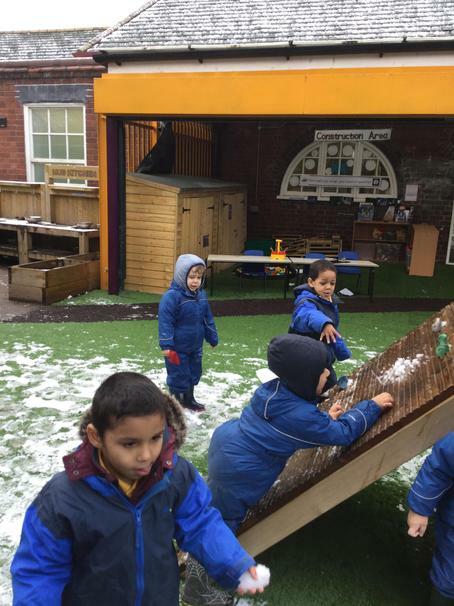 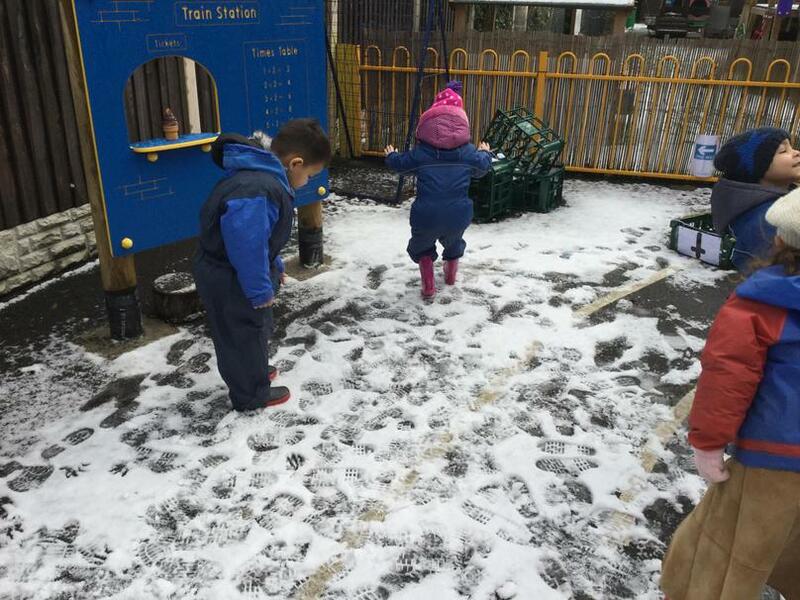 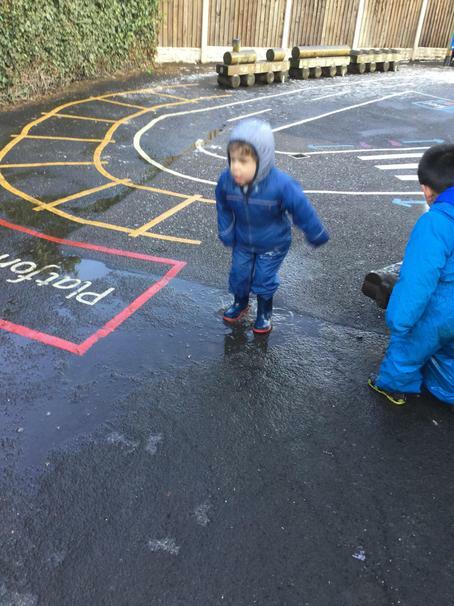 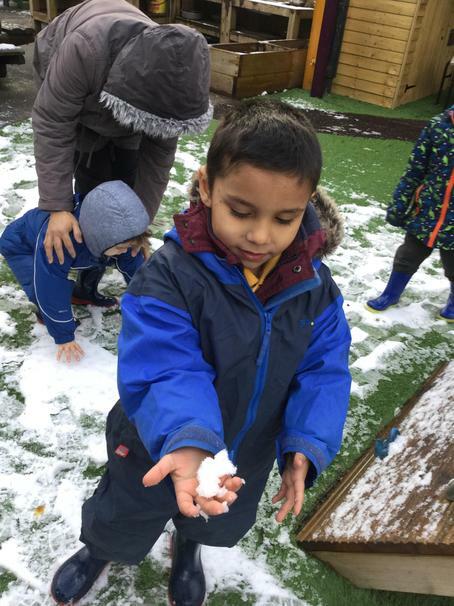 Morning Nursery had lots of fun playing in the snow......!! 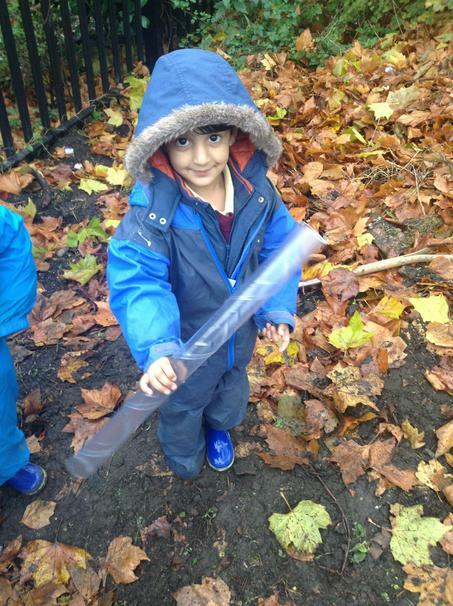 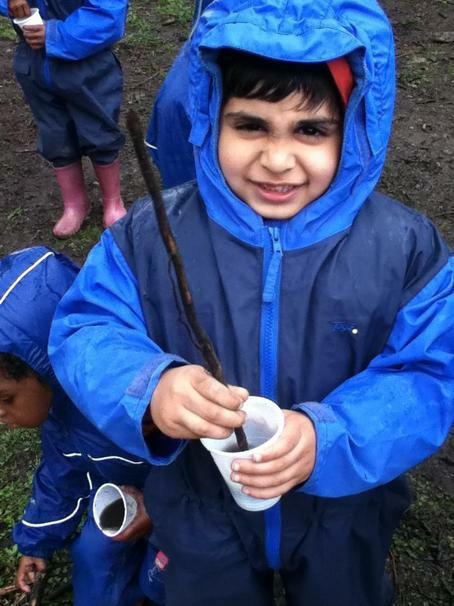 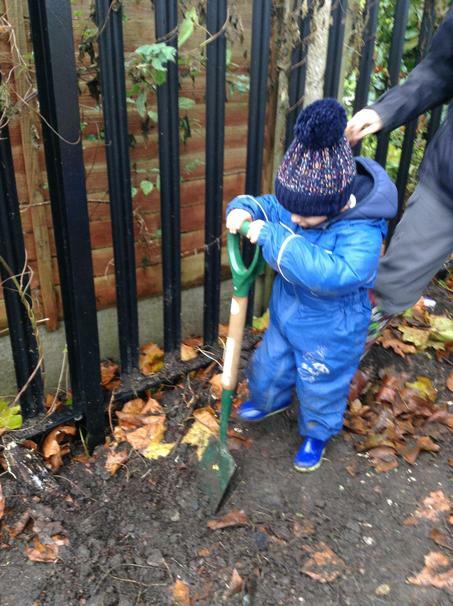 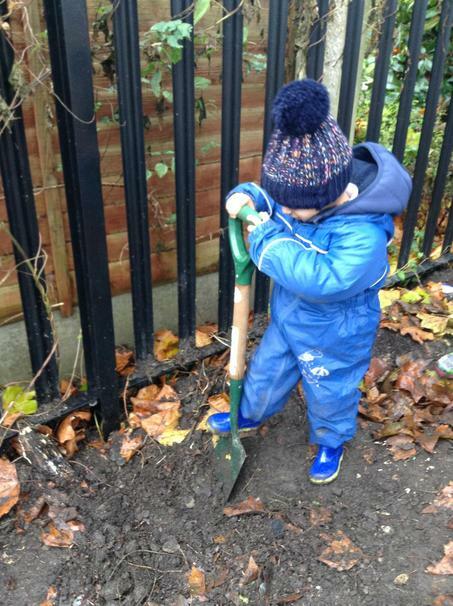 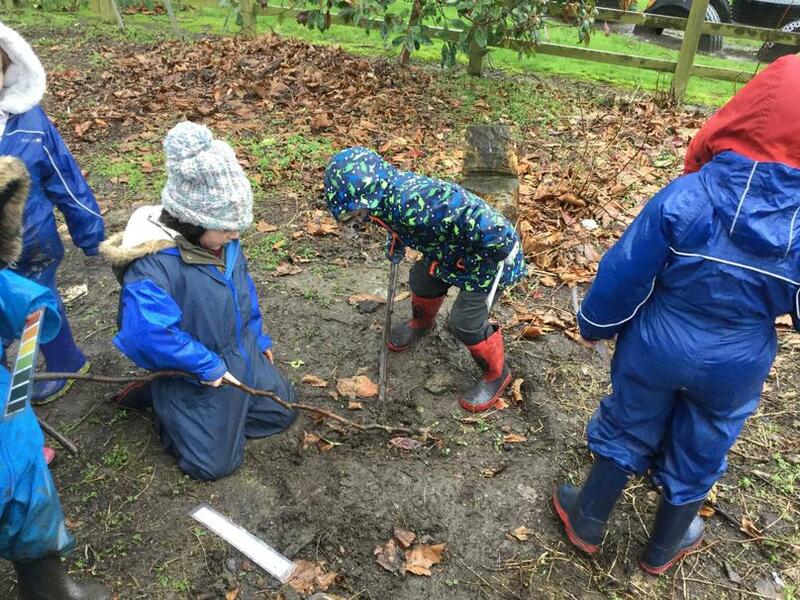 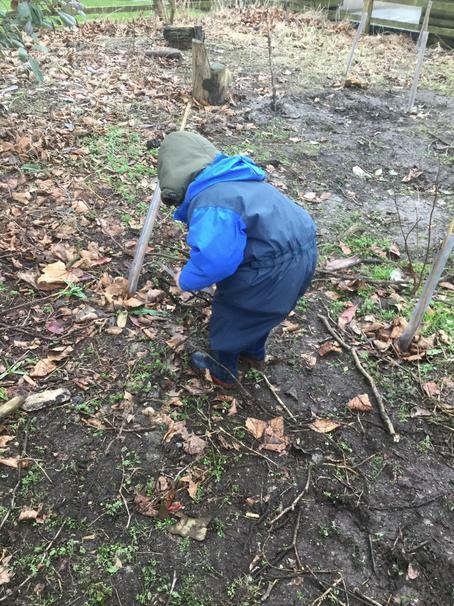 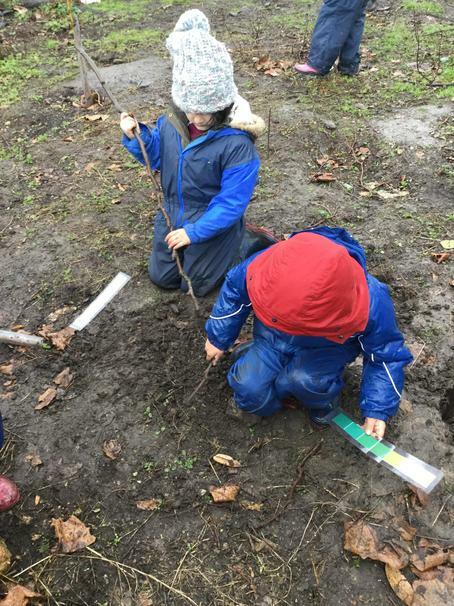 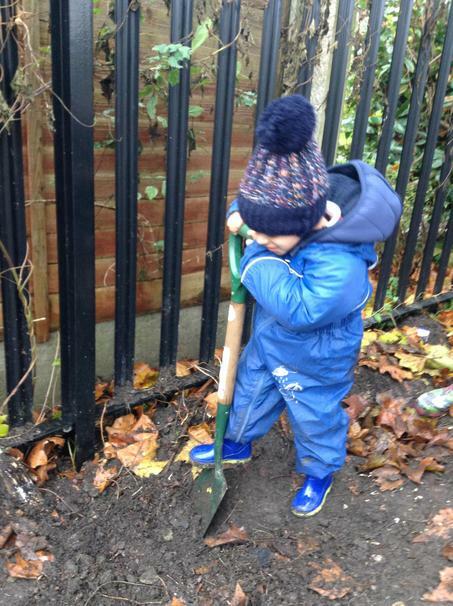 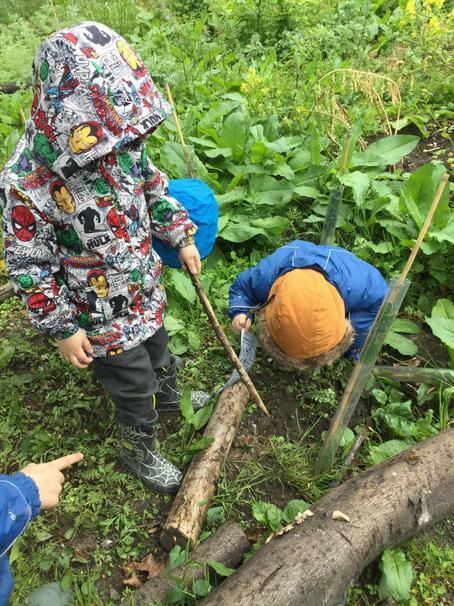 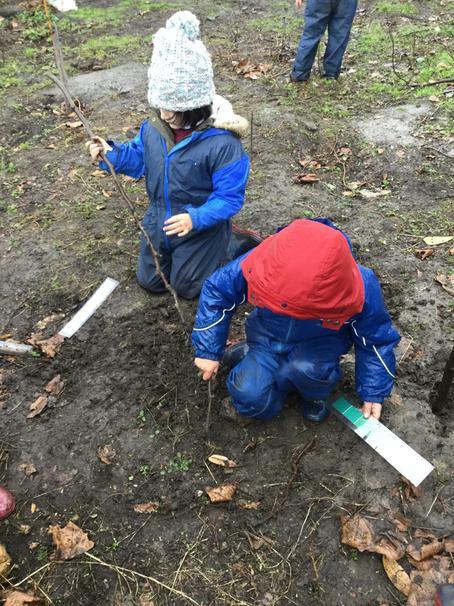 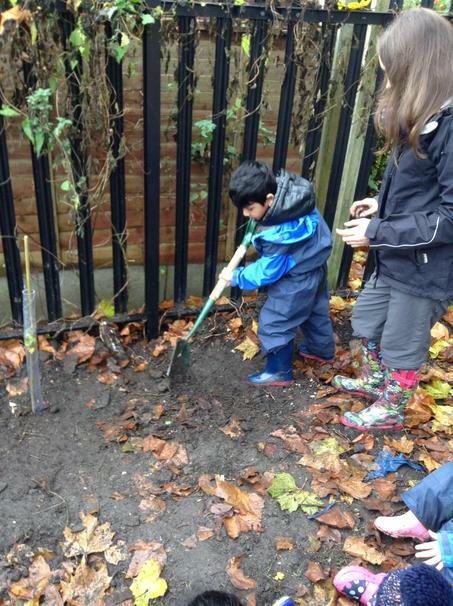 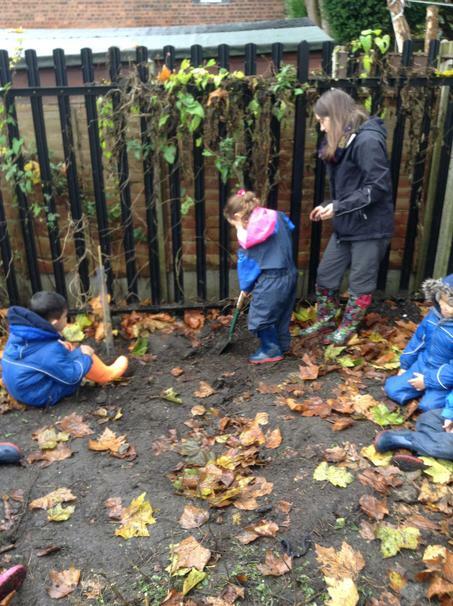 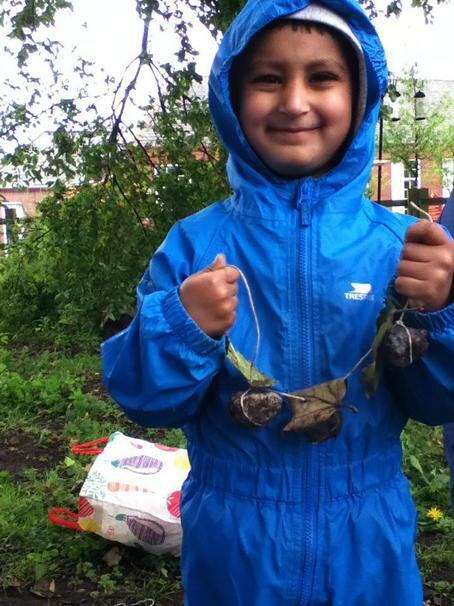 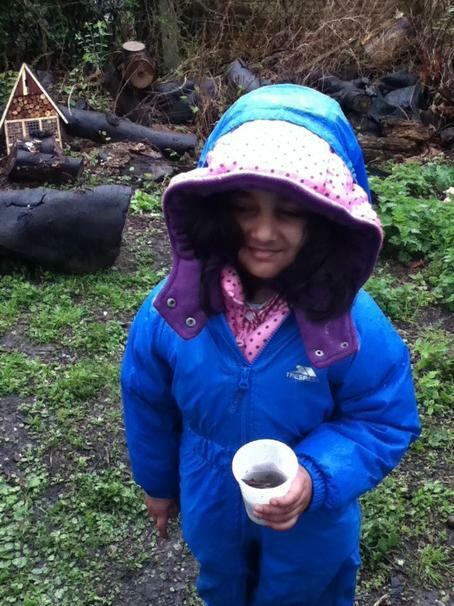 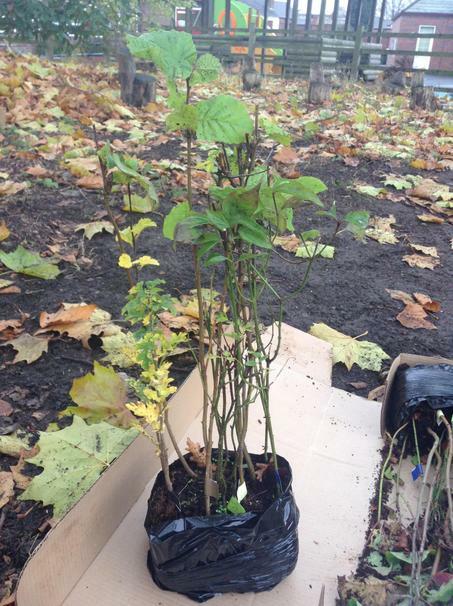 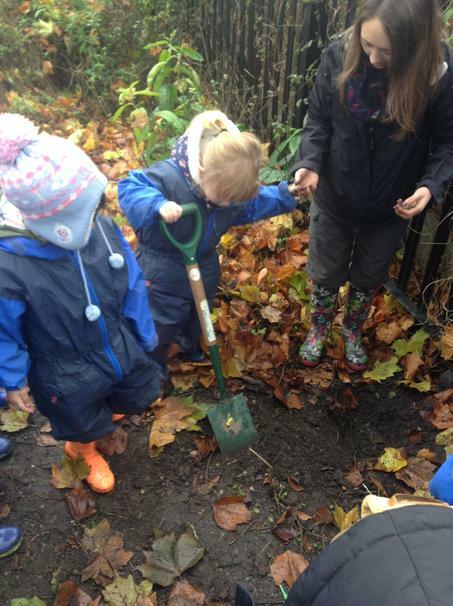 The children had lots of fun planting new trees at Forest School this week. 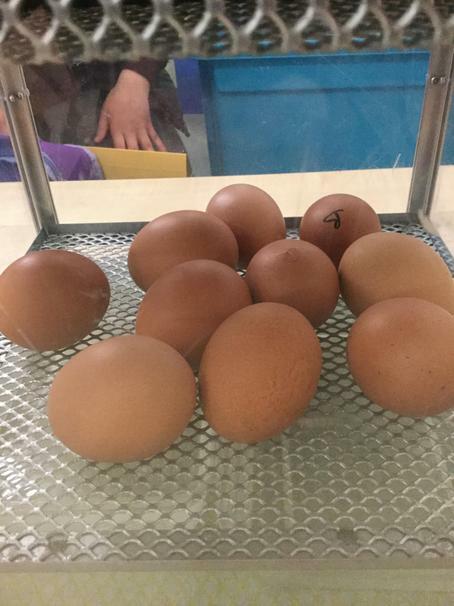 We look forward to watching them grow! 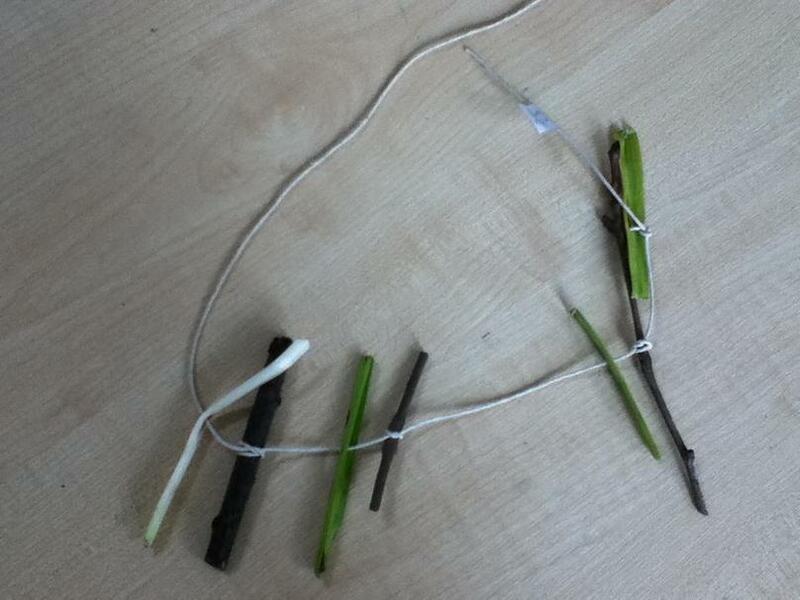 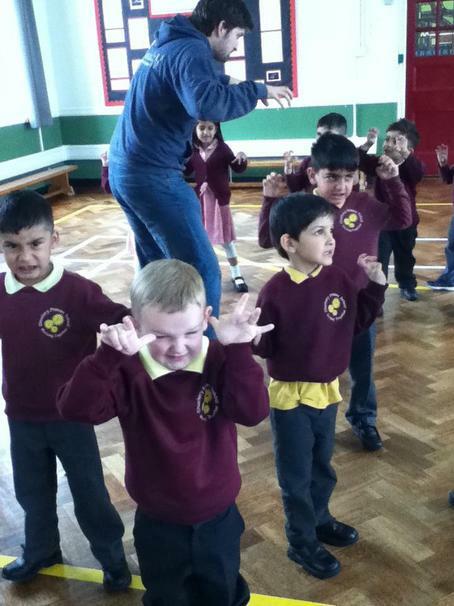 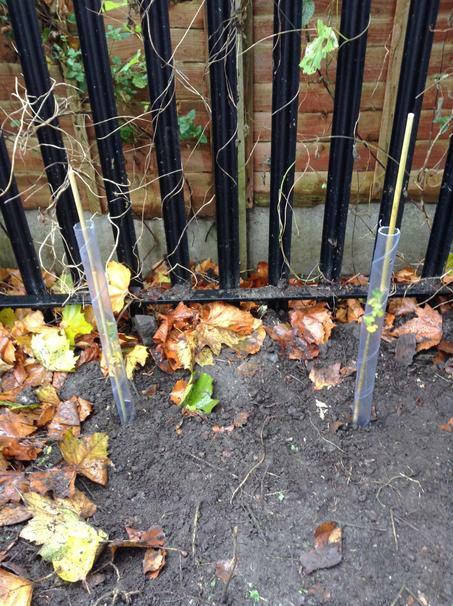 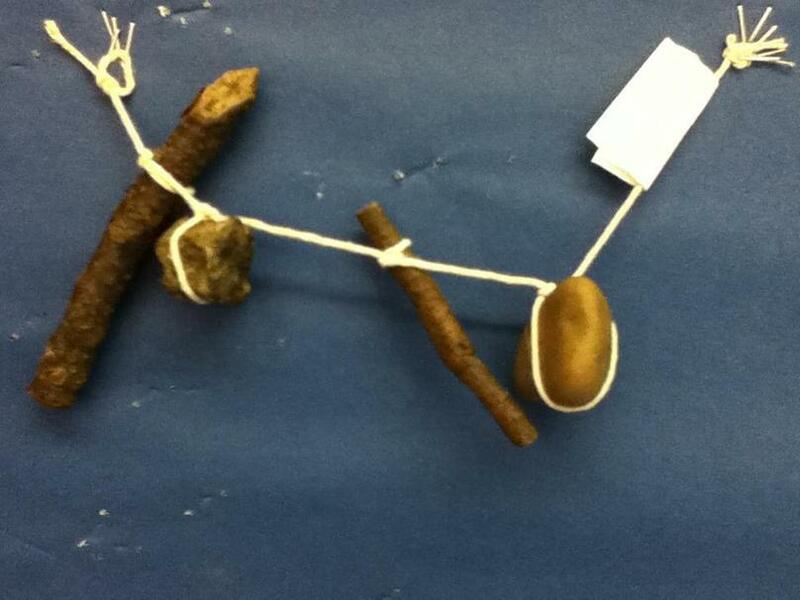 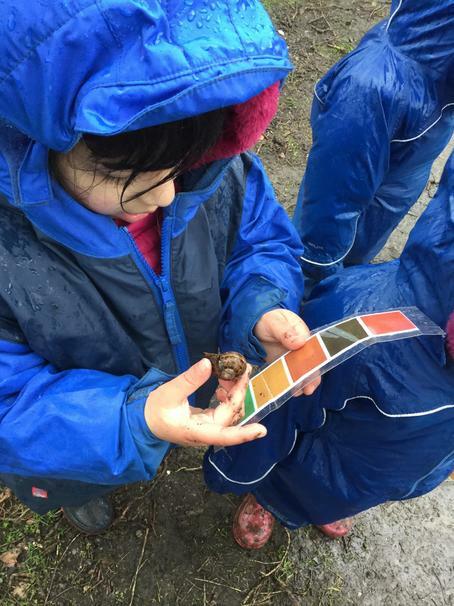 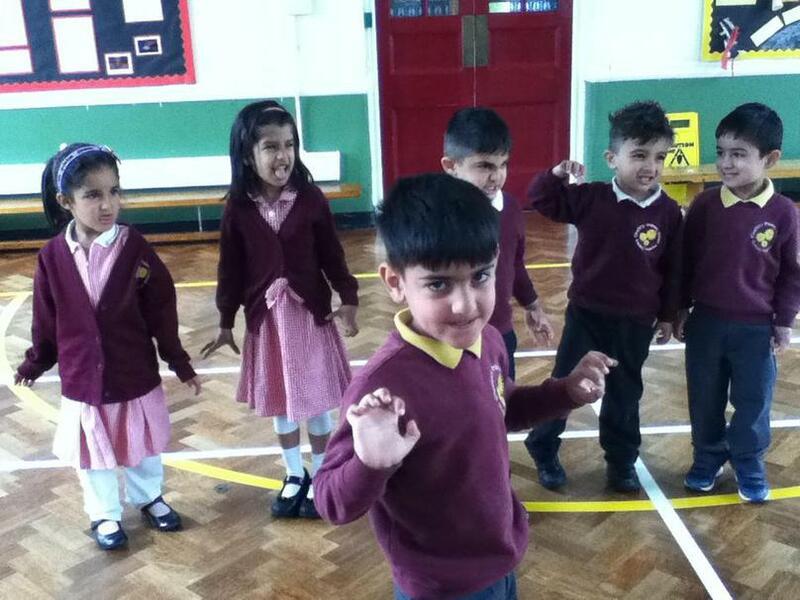 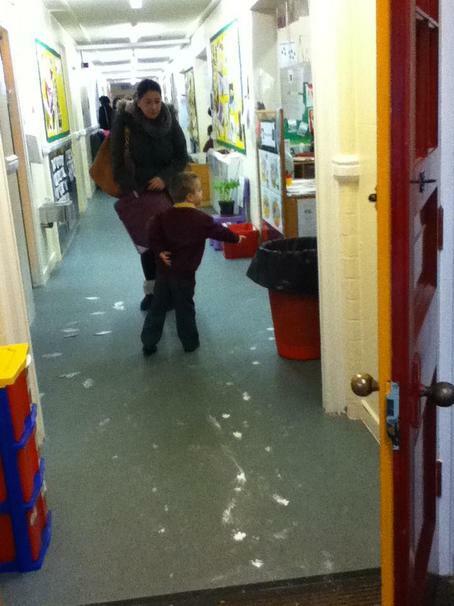 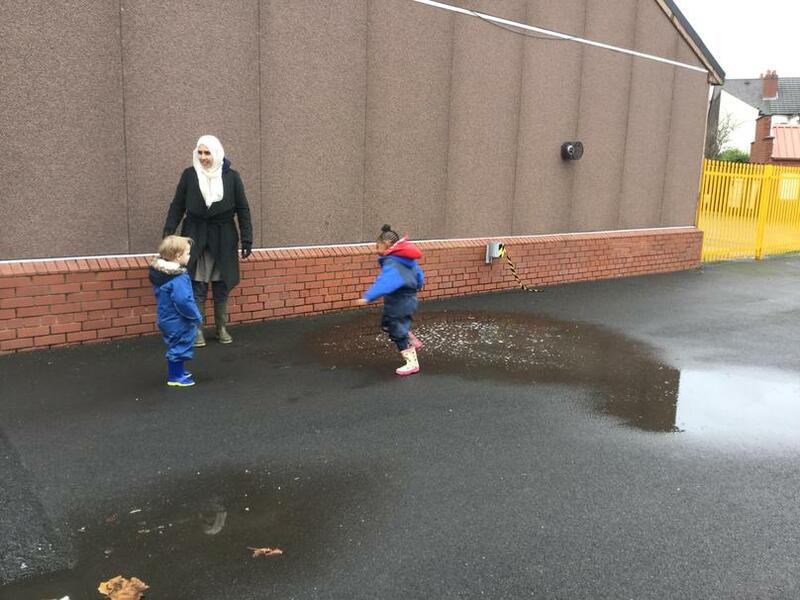 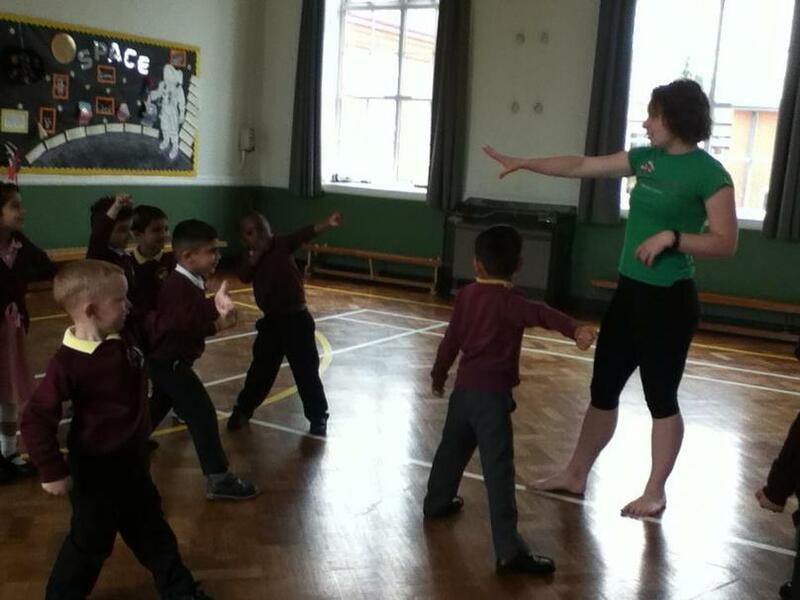 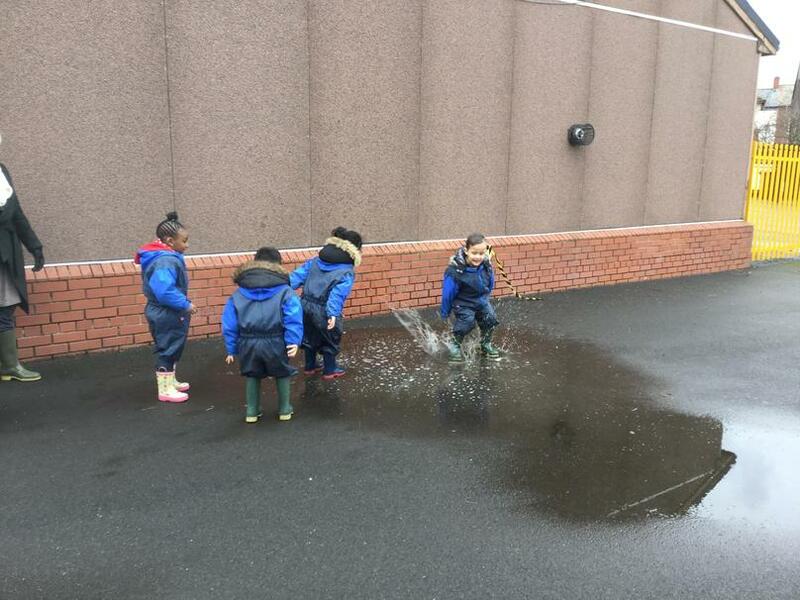 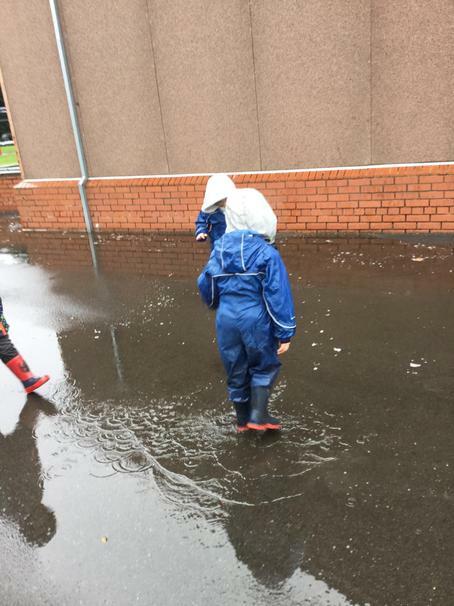 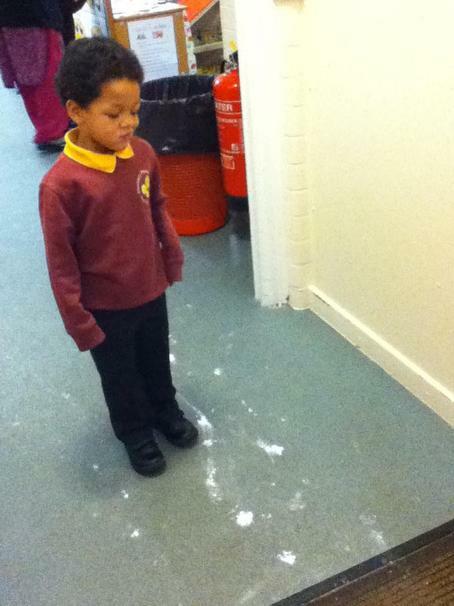 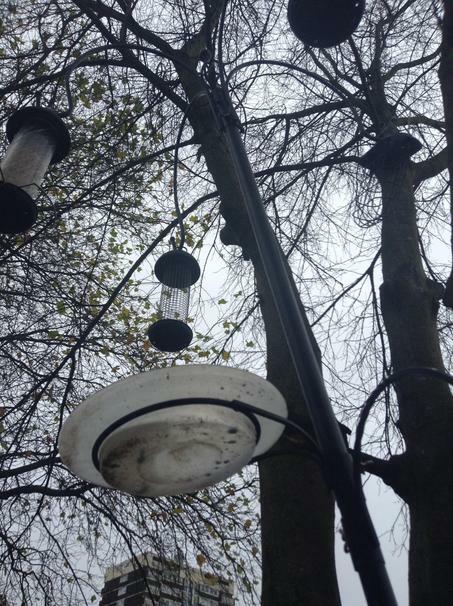 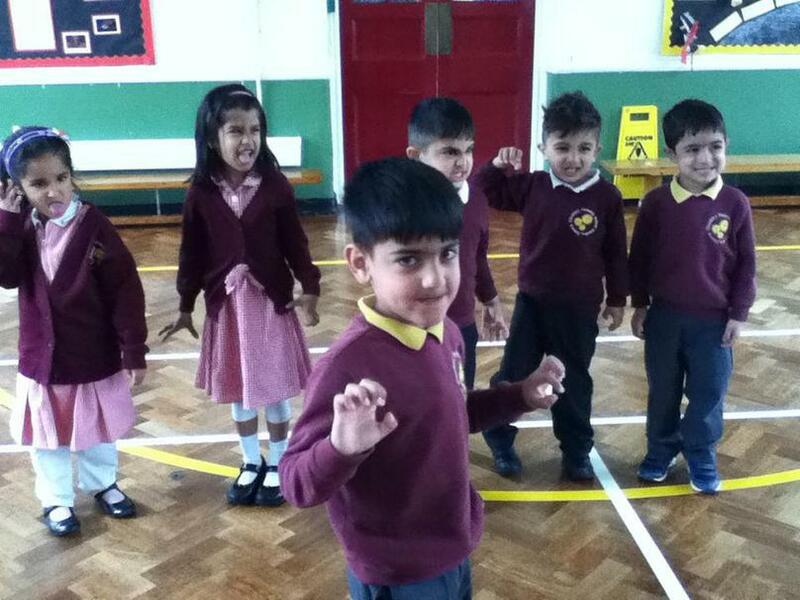 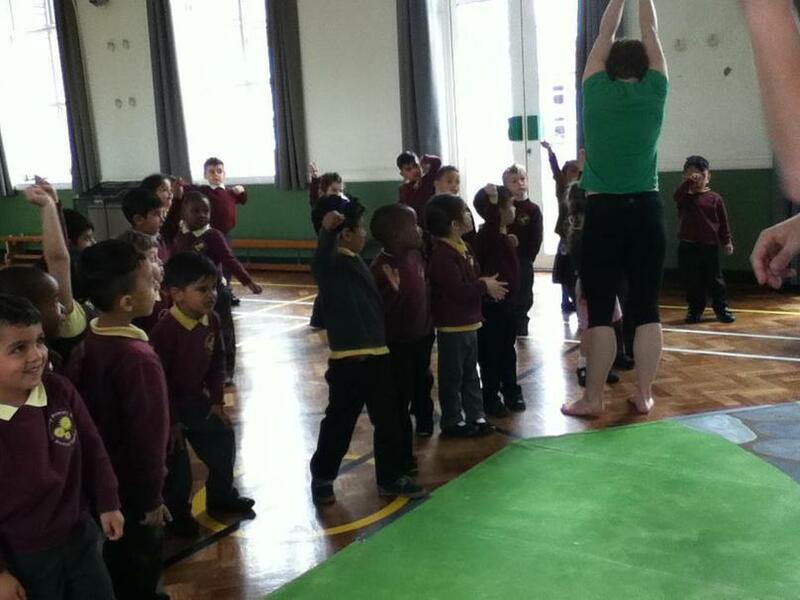 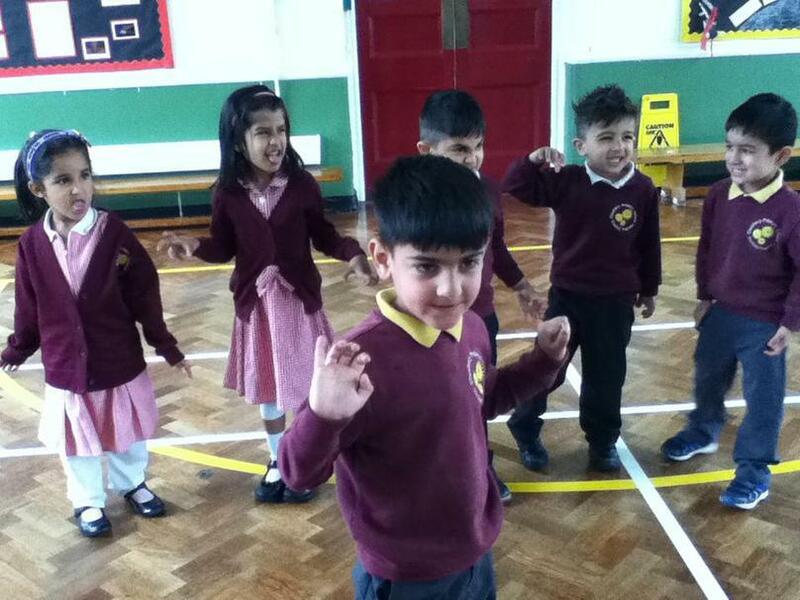 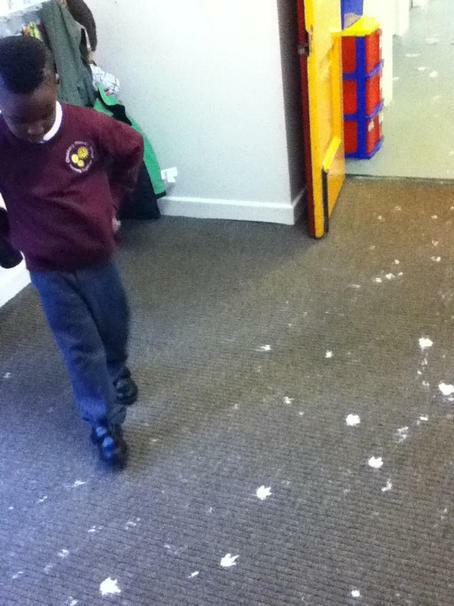 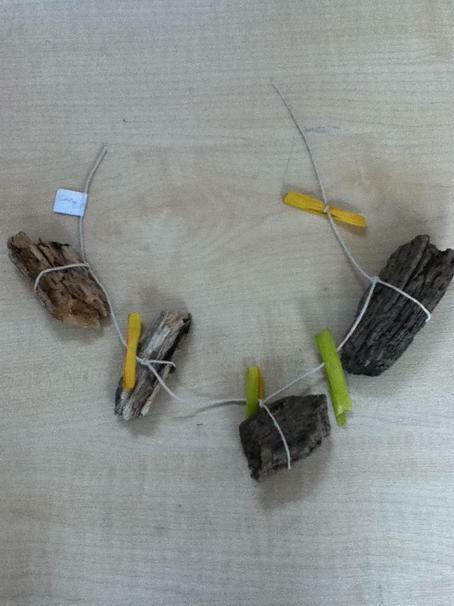 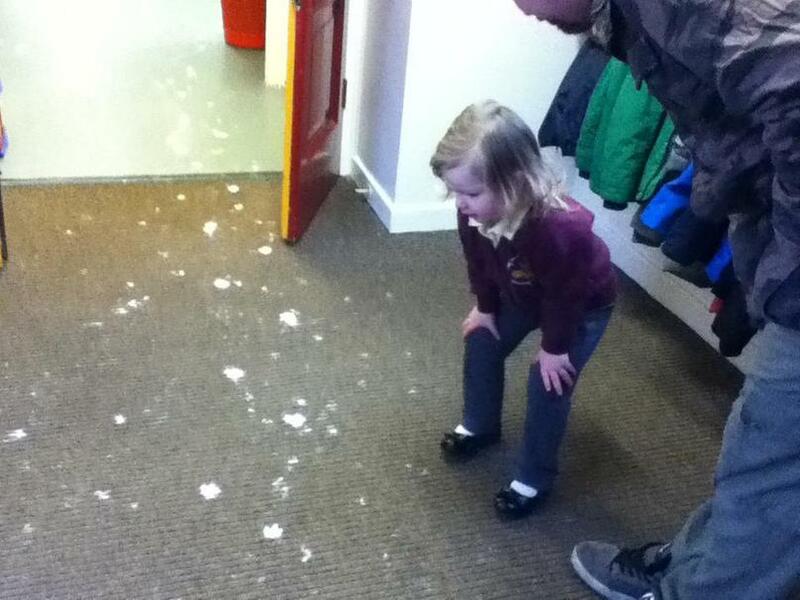 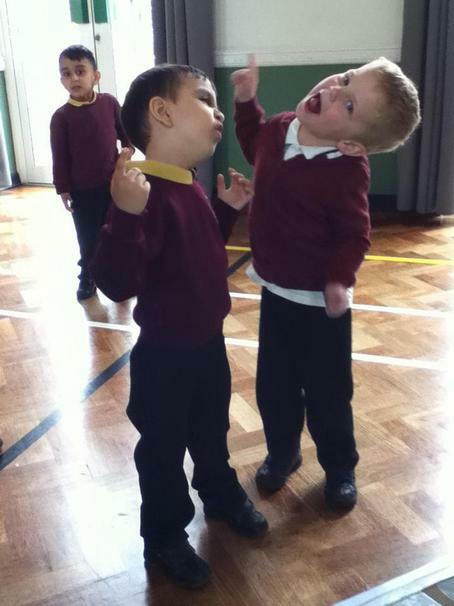 "The children had a surprise when they arrived at Nursery yesterday! 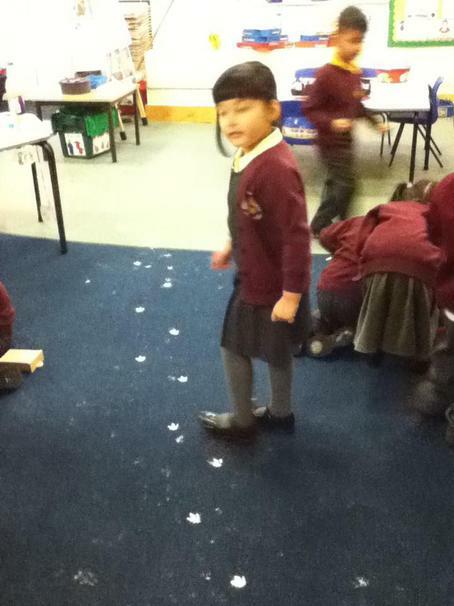 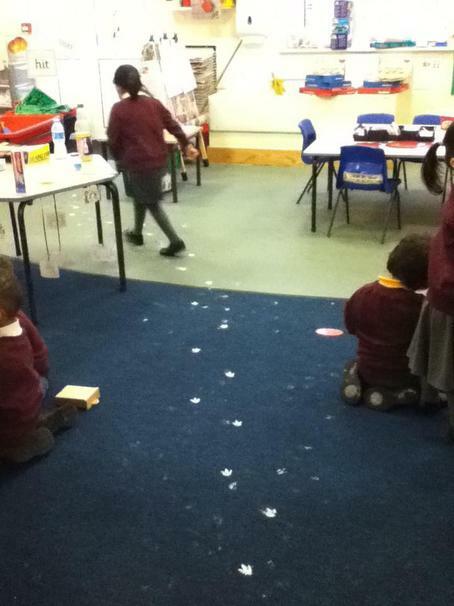 Someone was in our classroom last night and left a long trail of footprints! 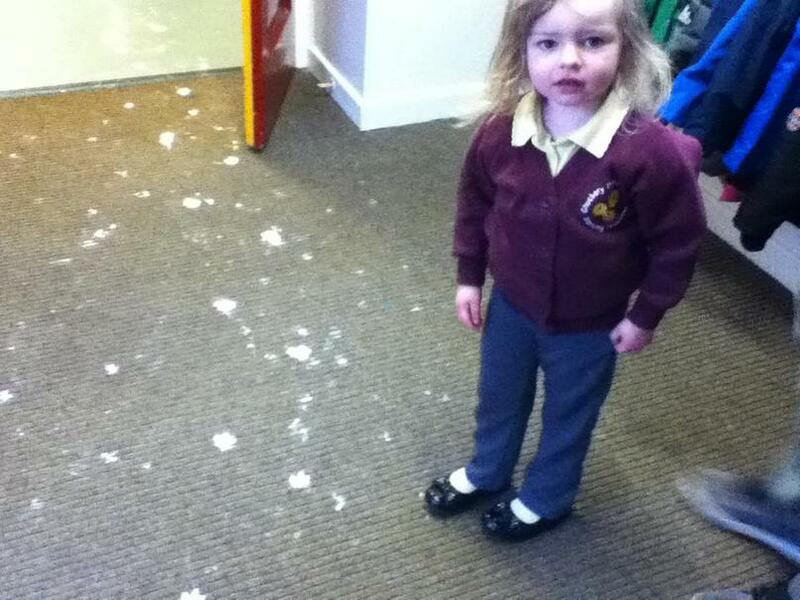 I wonder who it might have been?" 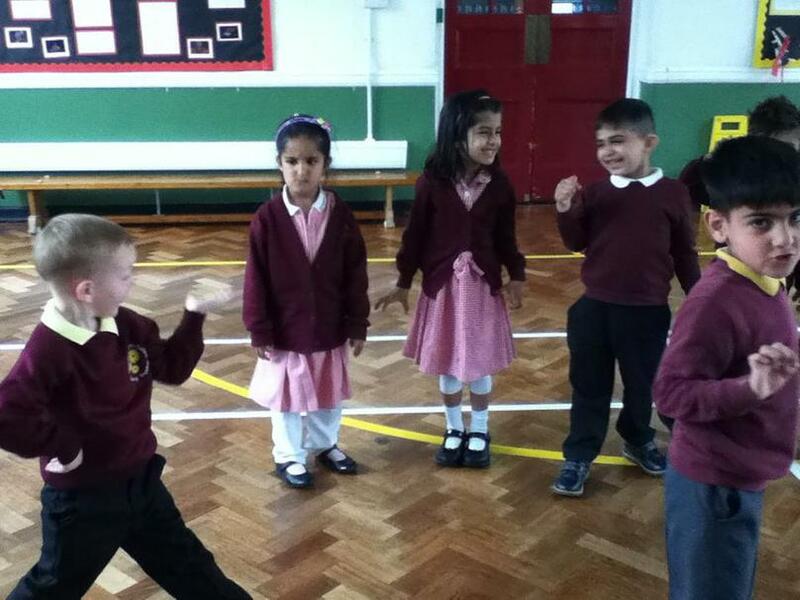 Goldilocks and the 3 bears visit Chuckery.